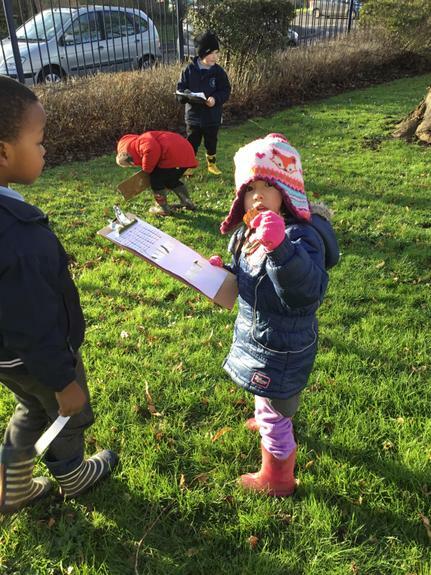 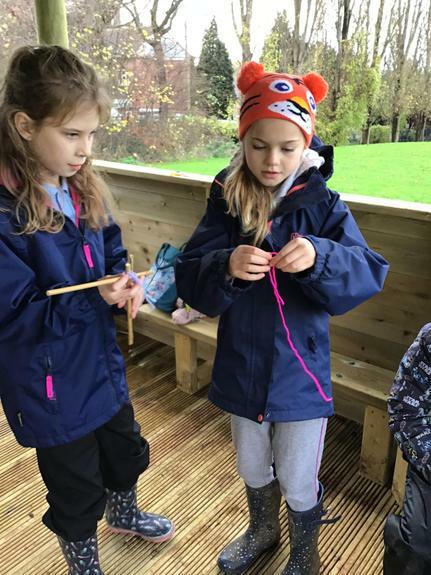 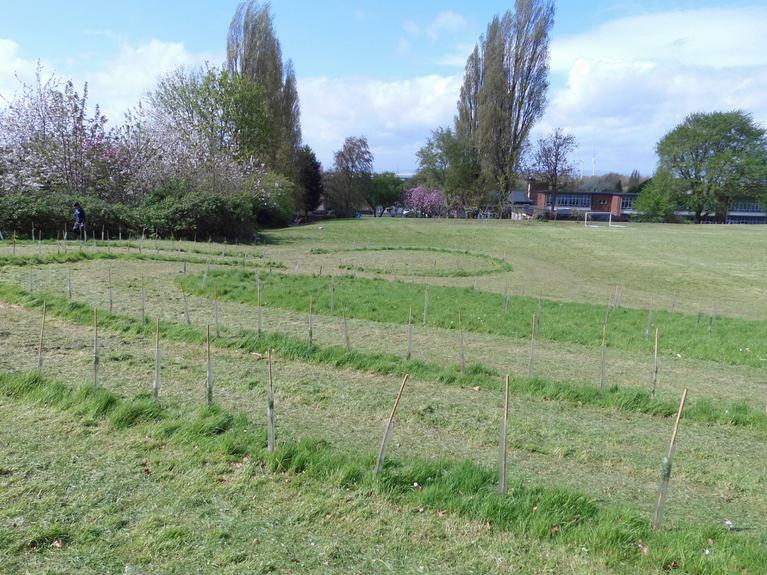 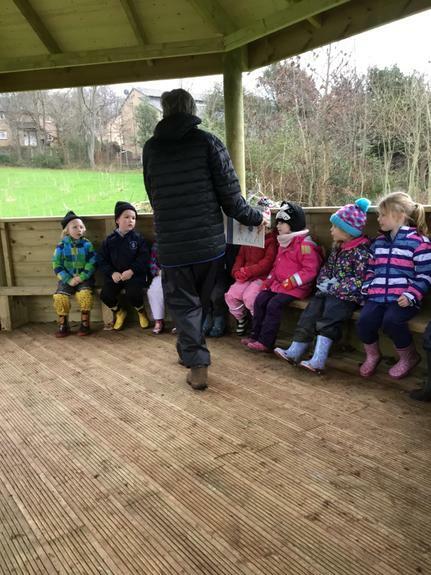 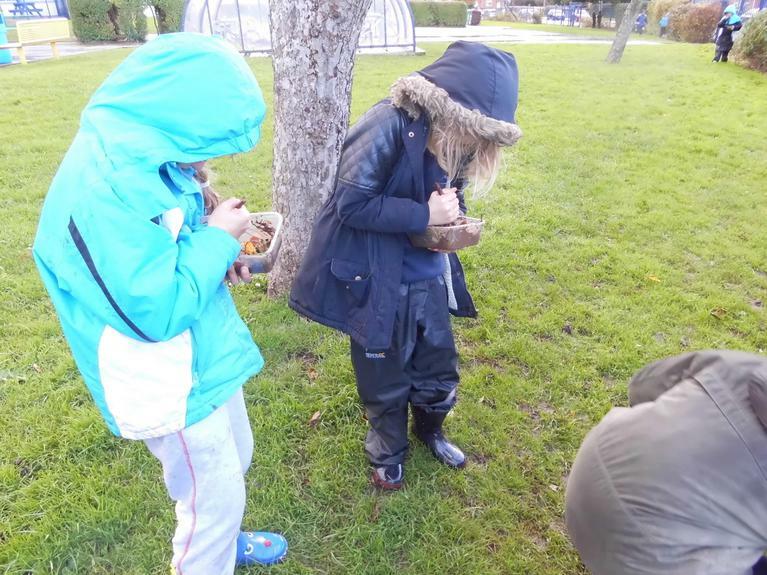 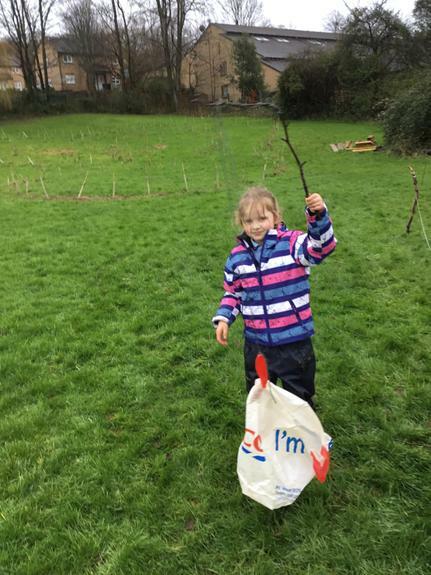 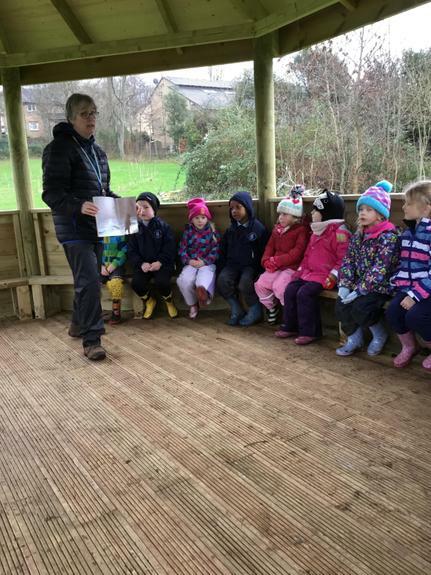 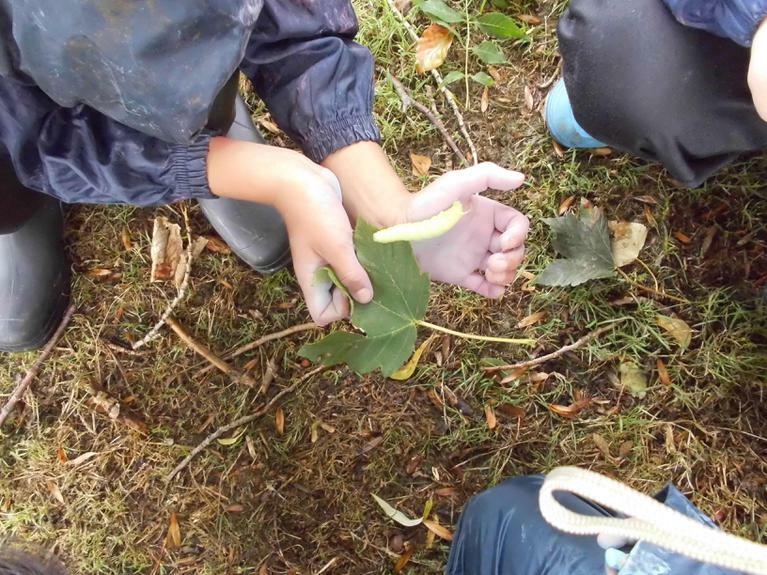 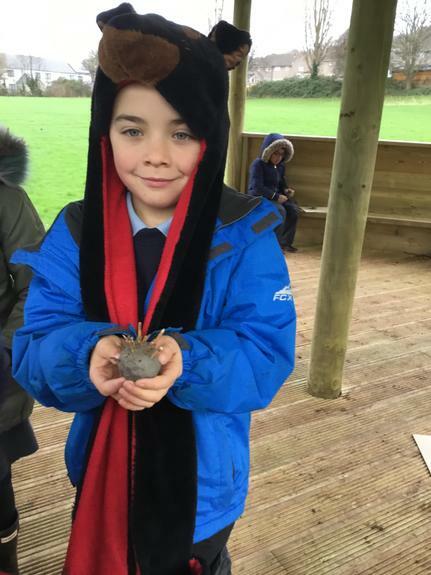 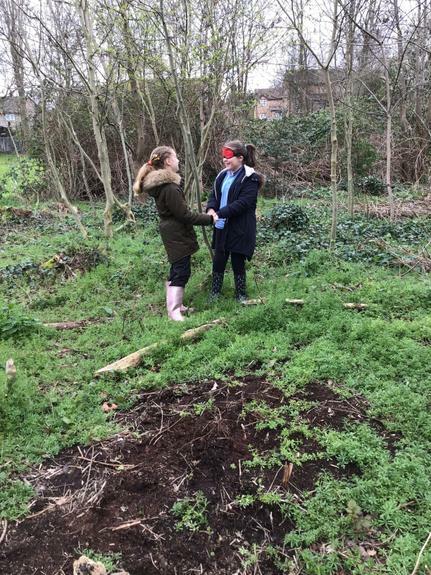 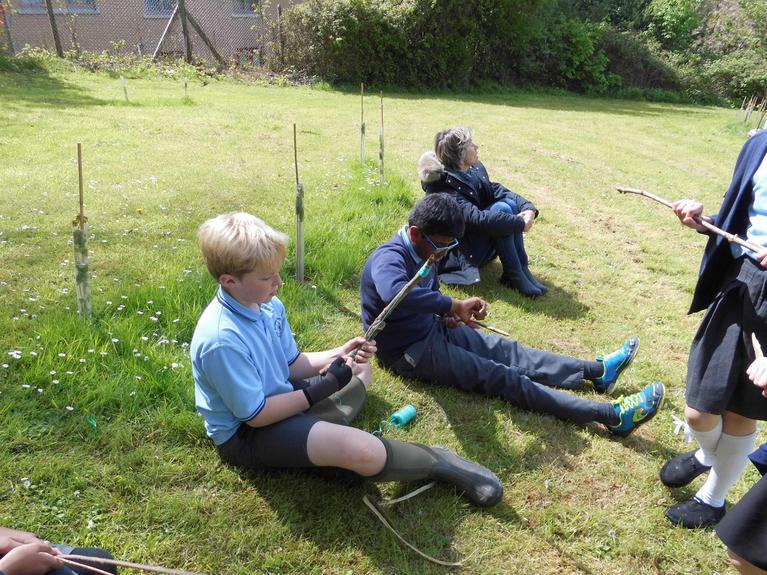 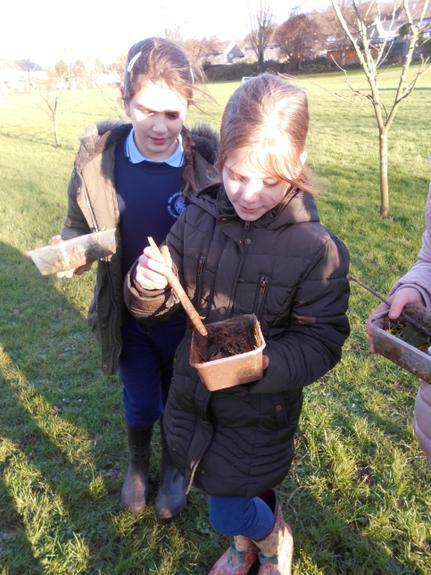 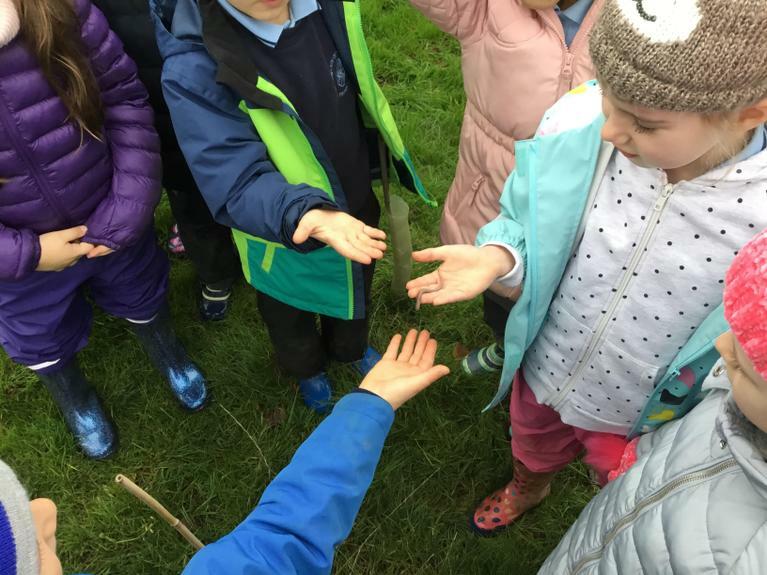 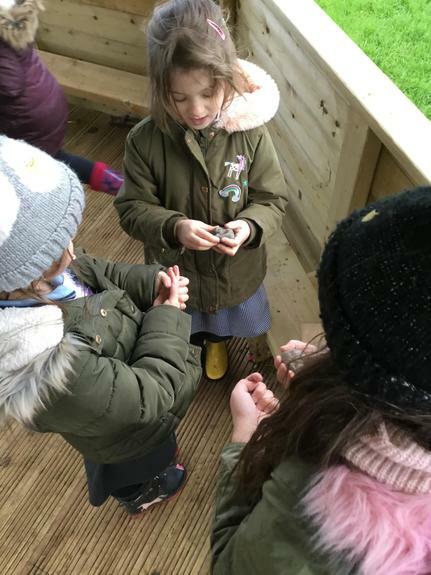 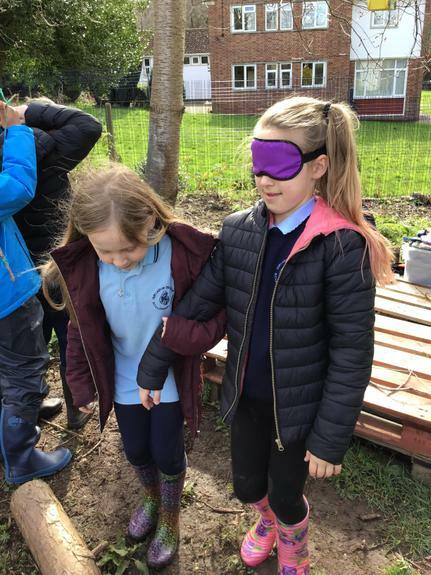 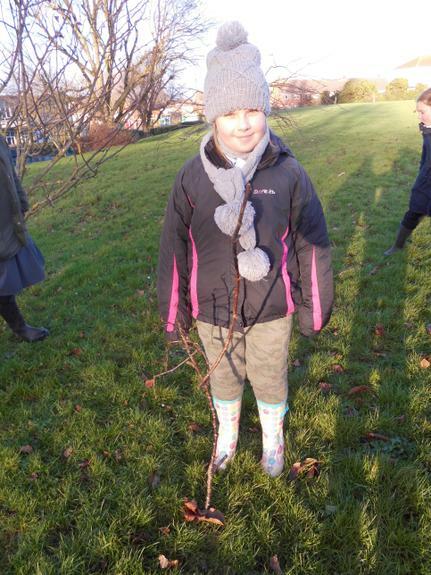 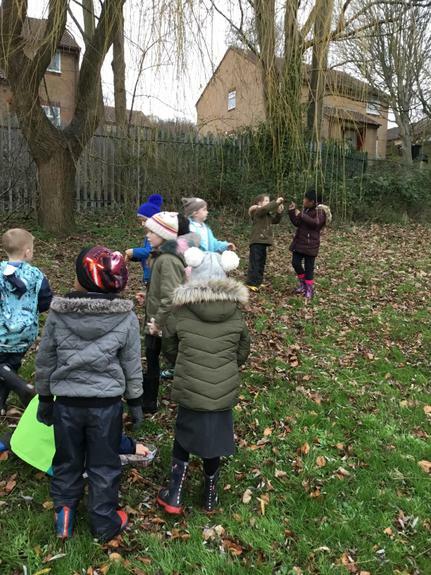 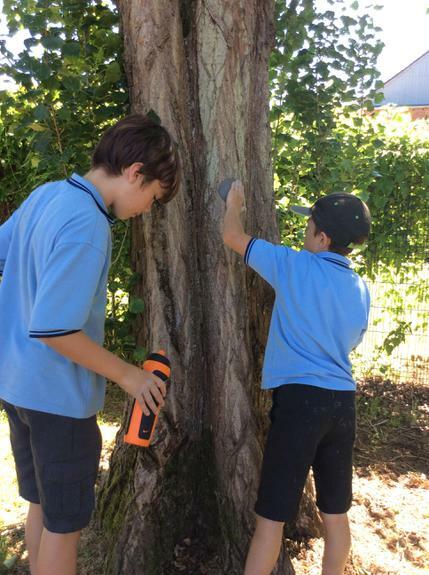 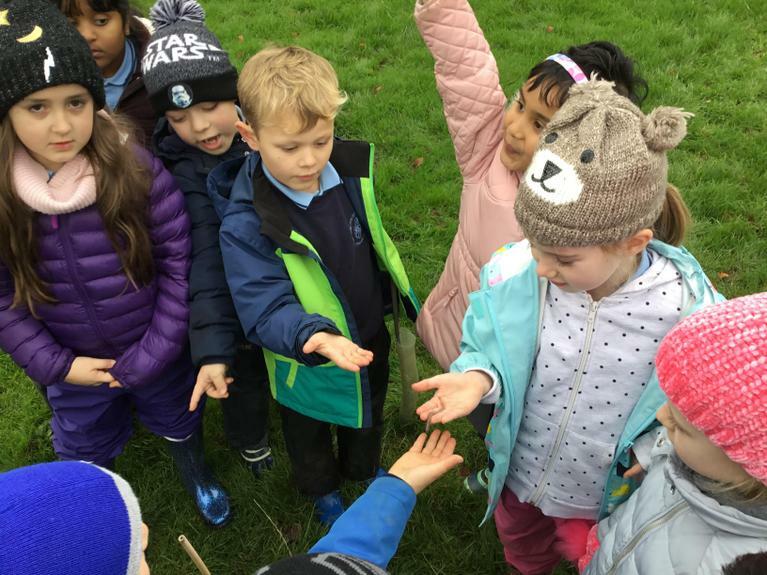 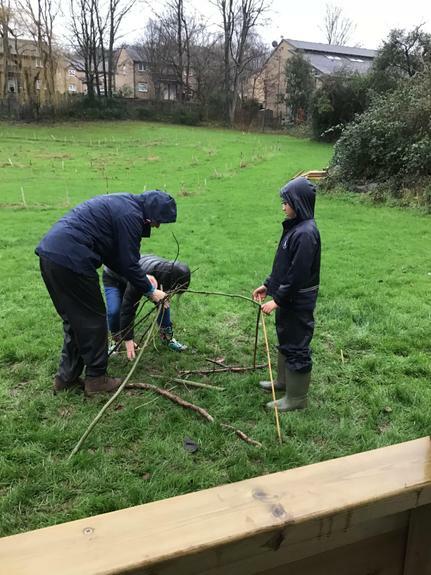 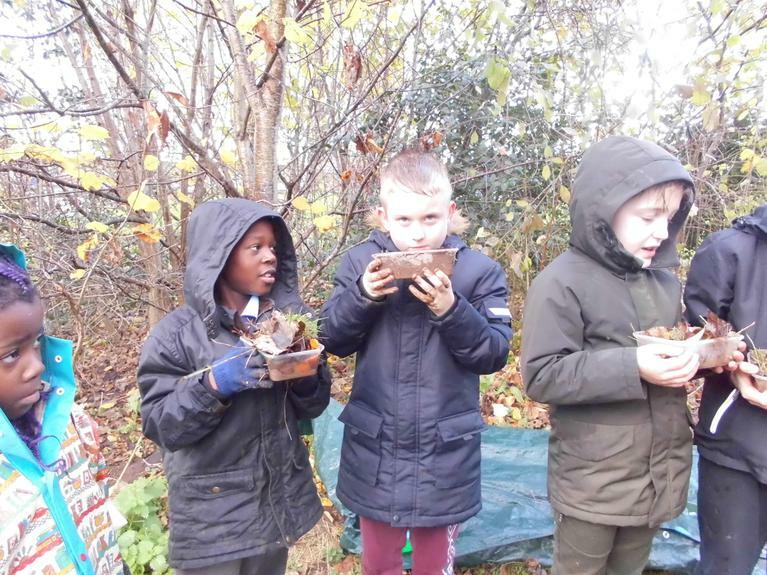 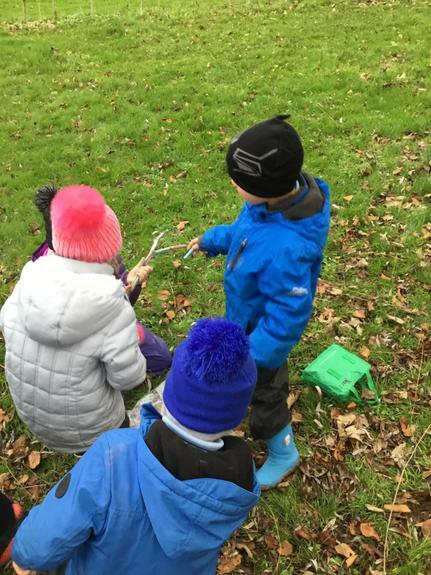 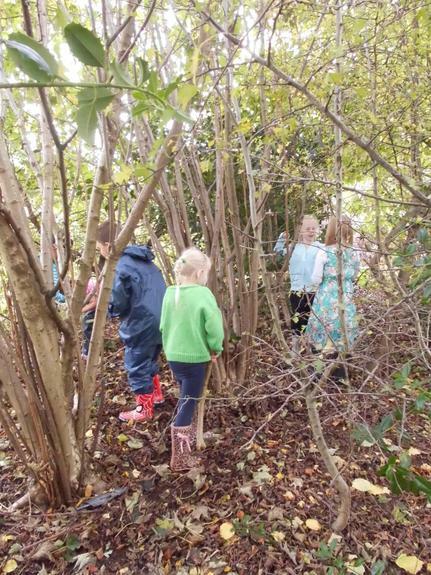 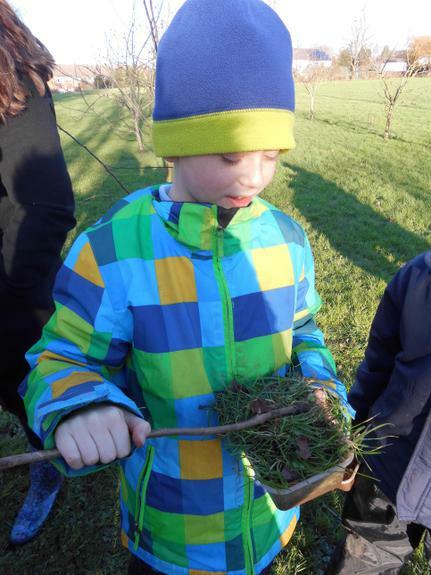 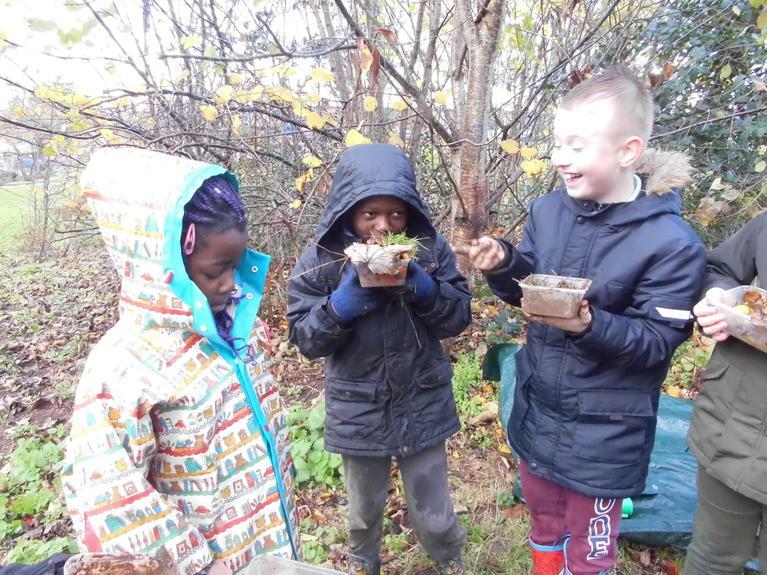 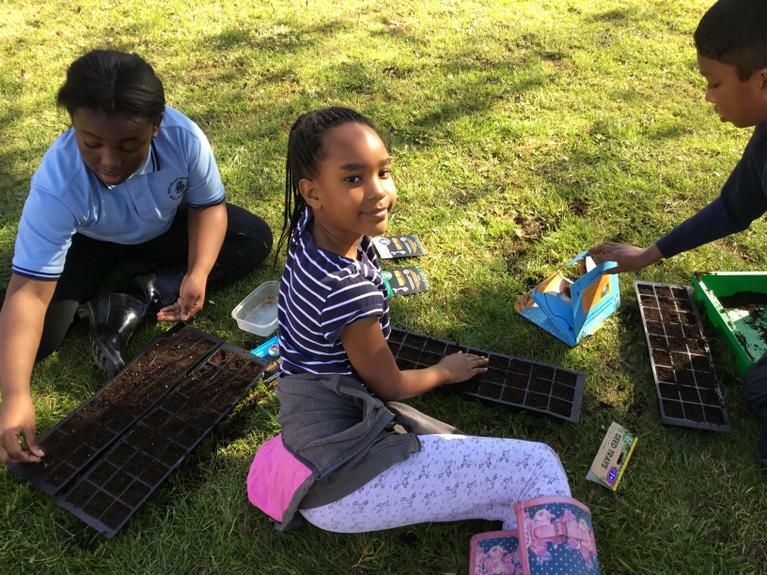 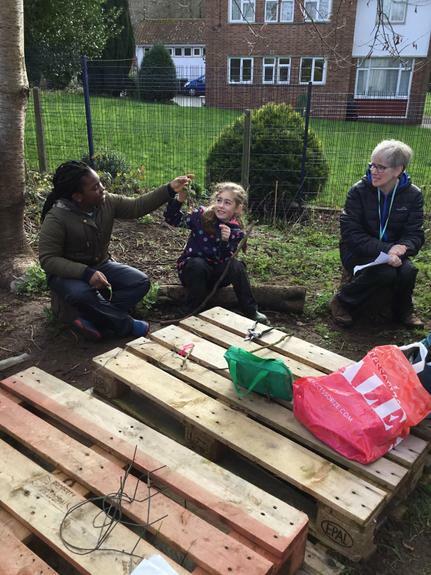 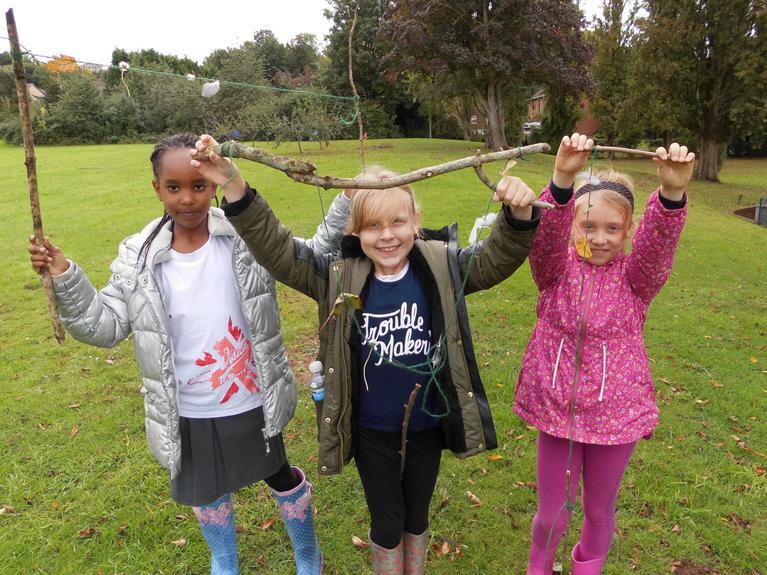 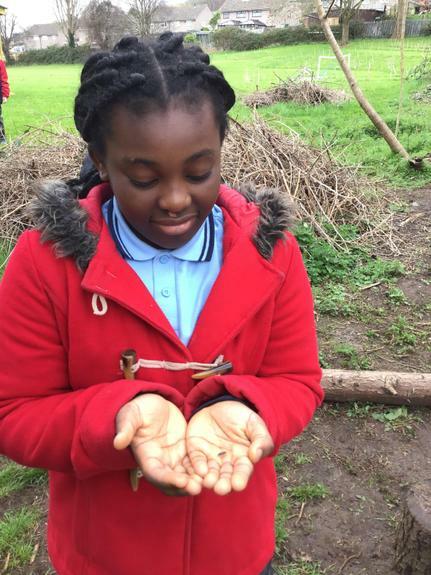 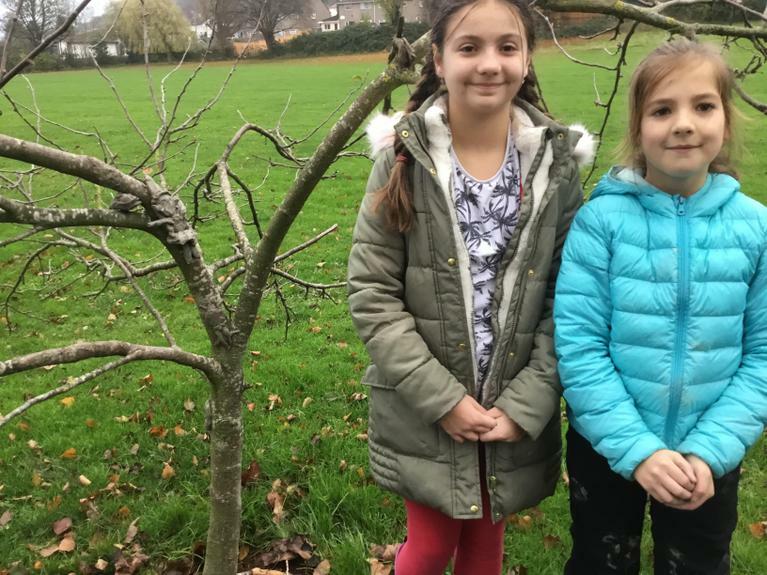 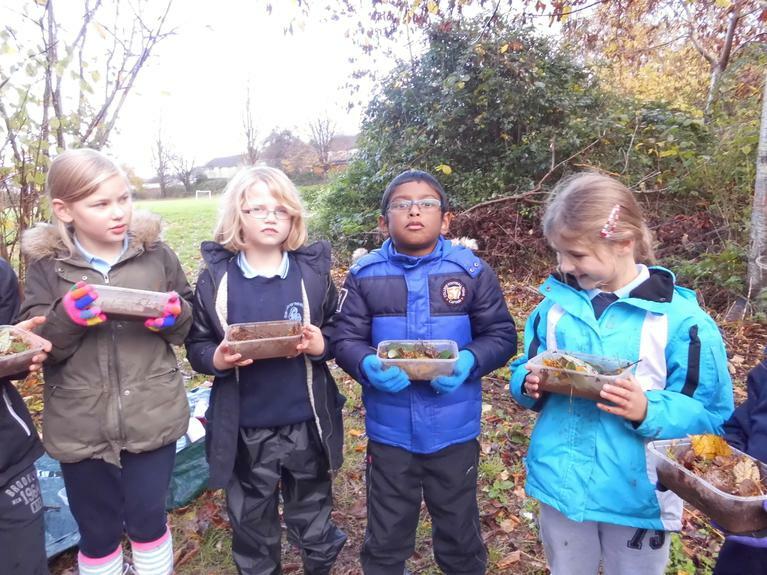 In September 2017 we introduced Forest Schools to our school. 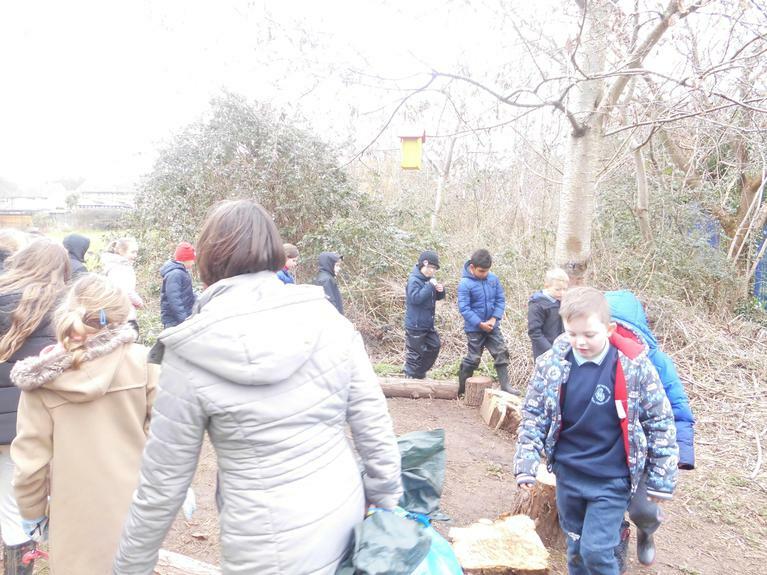 We have three members of staff who have been trained to lead this: Mrs Bridge, Mrs Shaw and Mrs Stone. 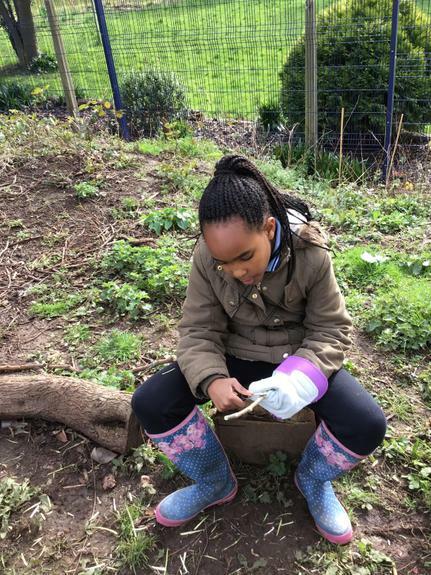 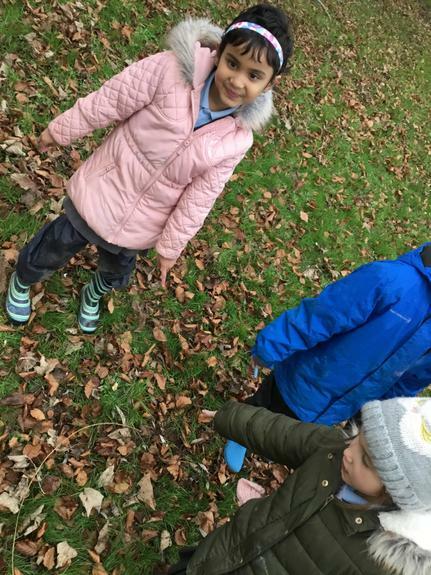 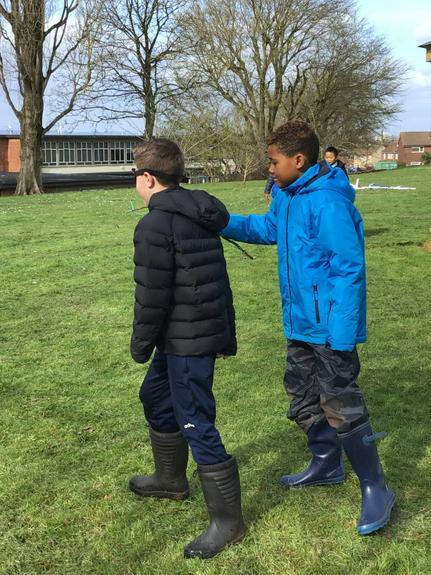 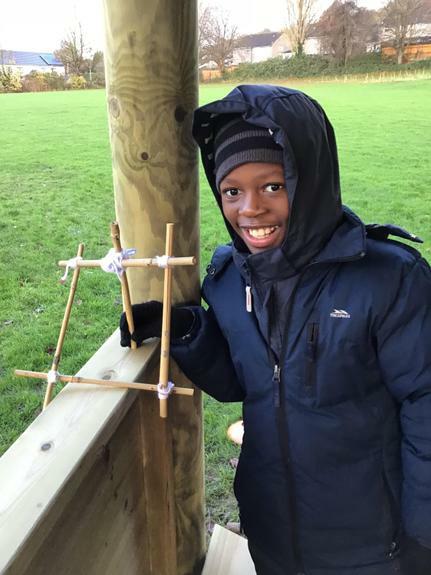 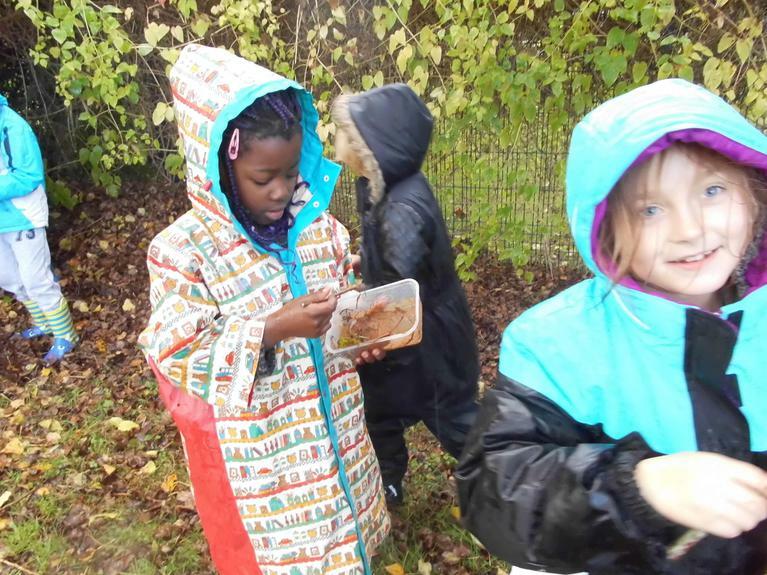 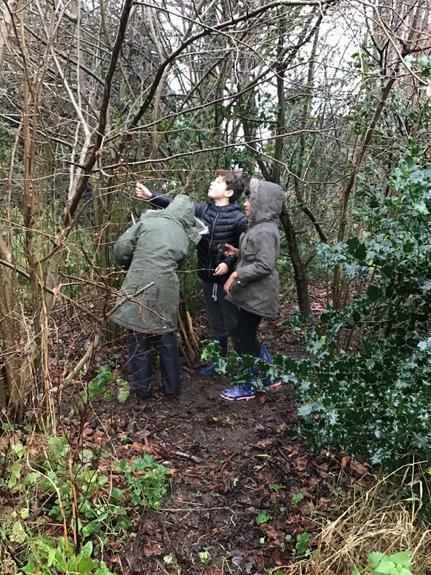 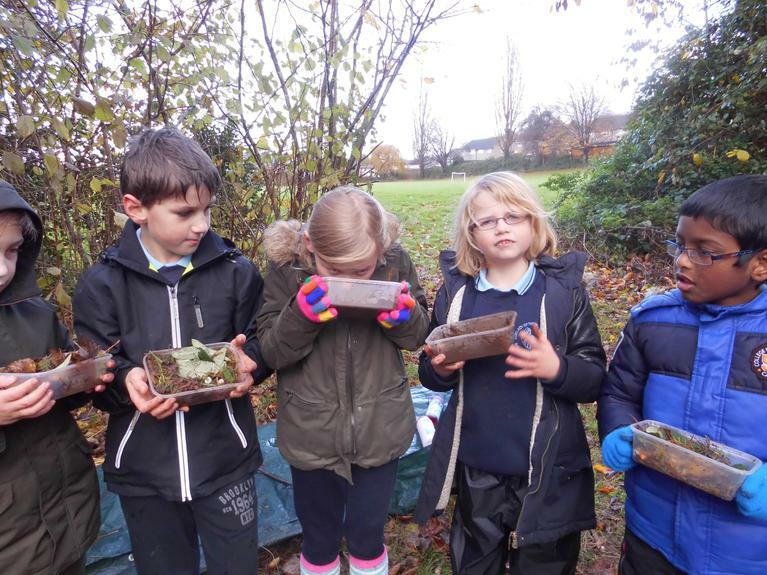 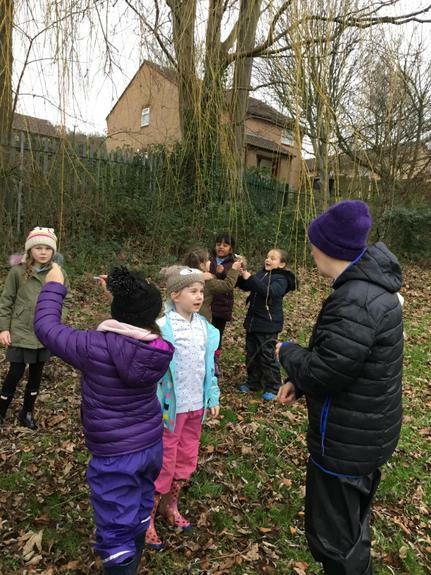 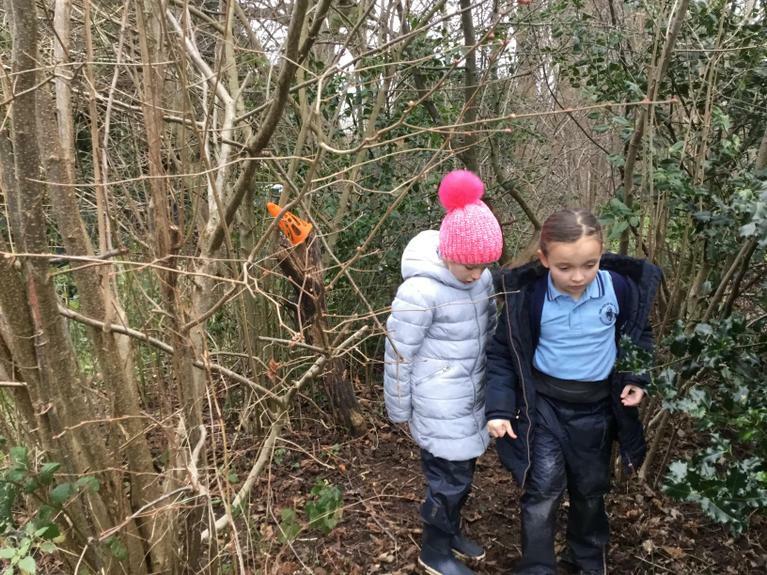 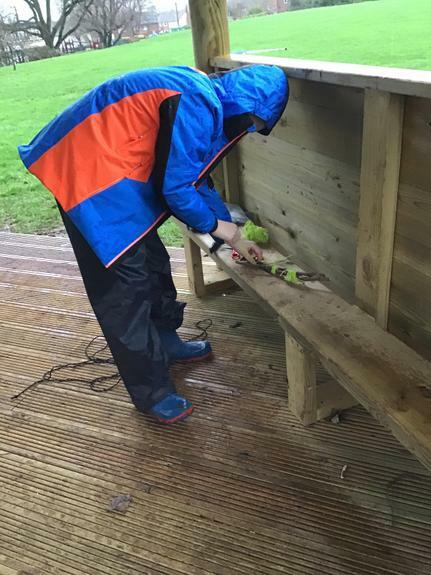 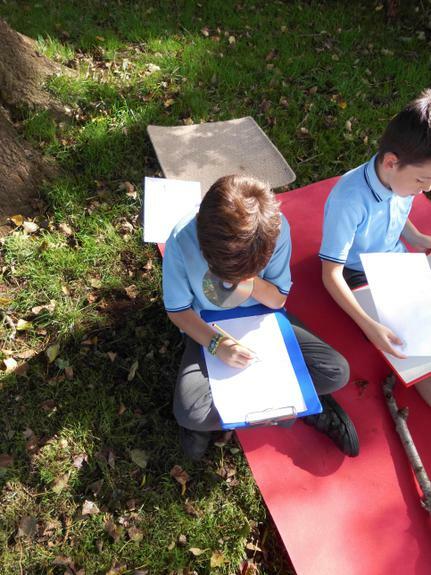 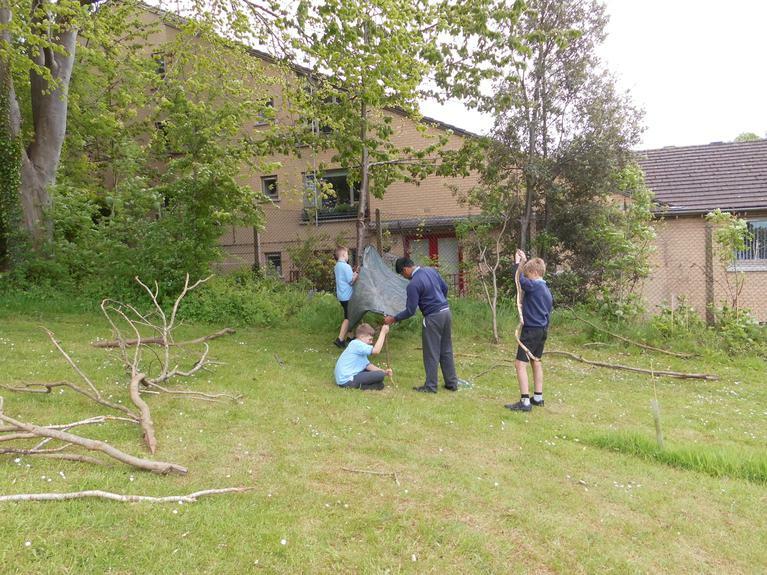 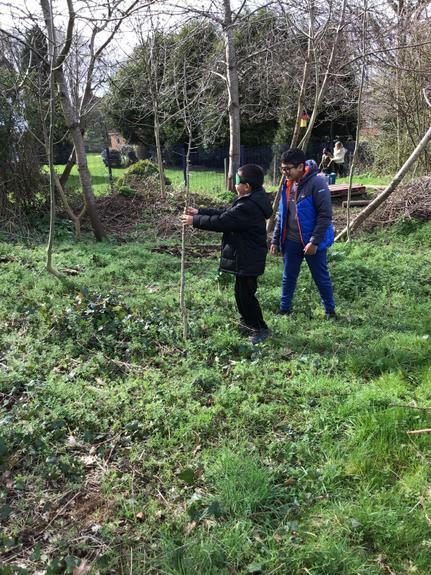 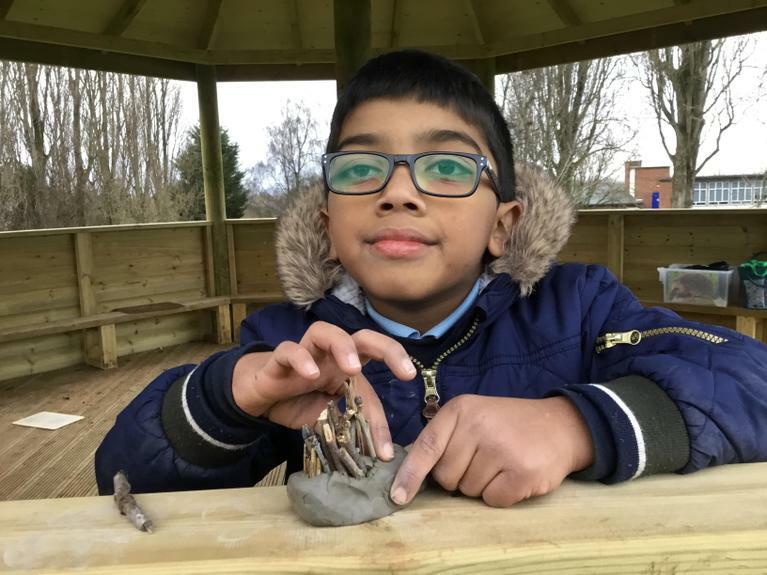 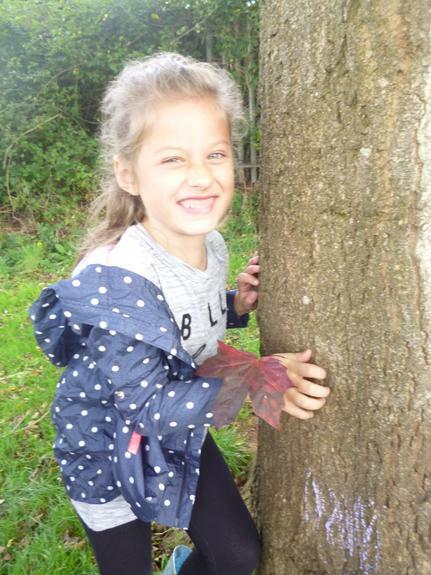 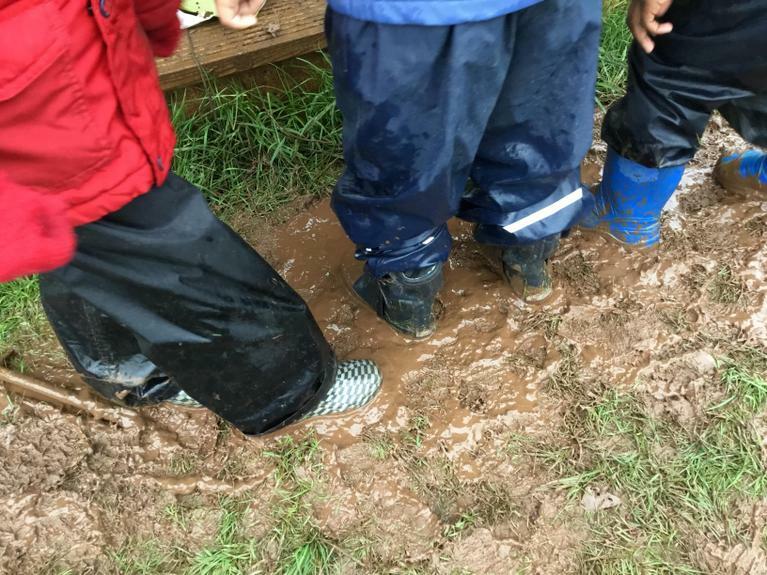 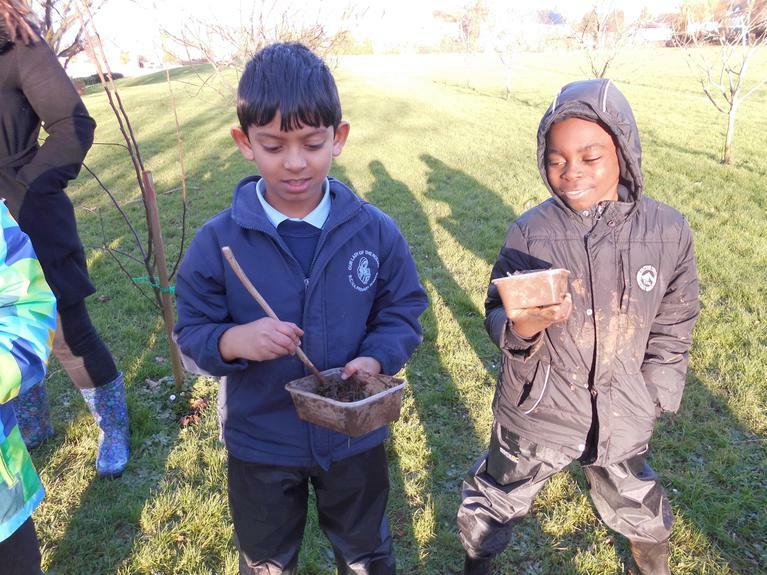 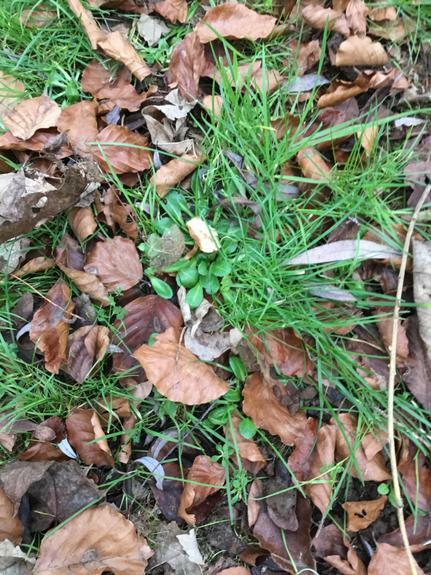 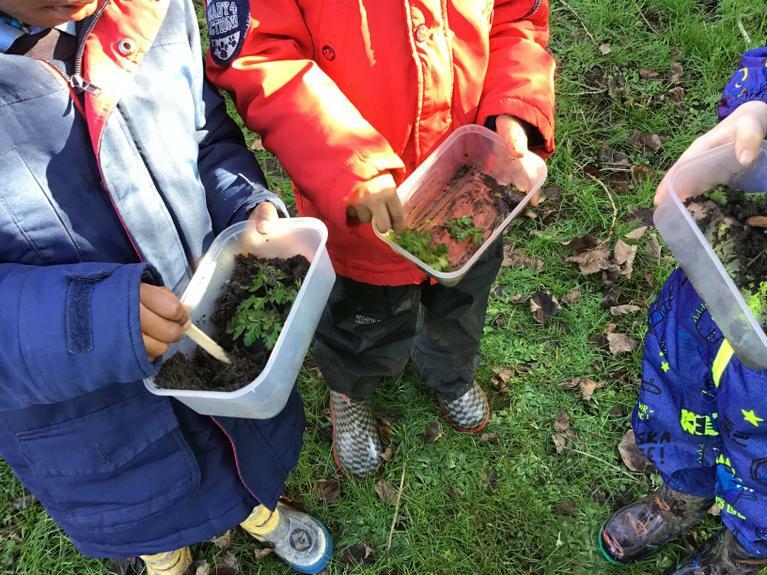 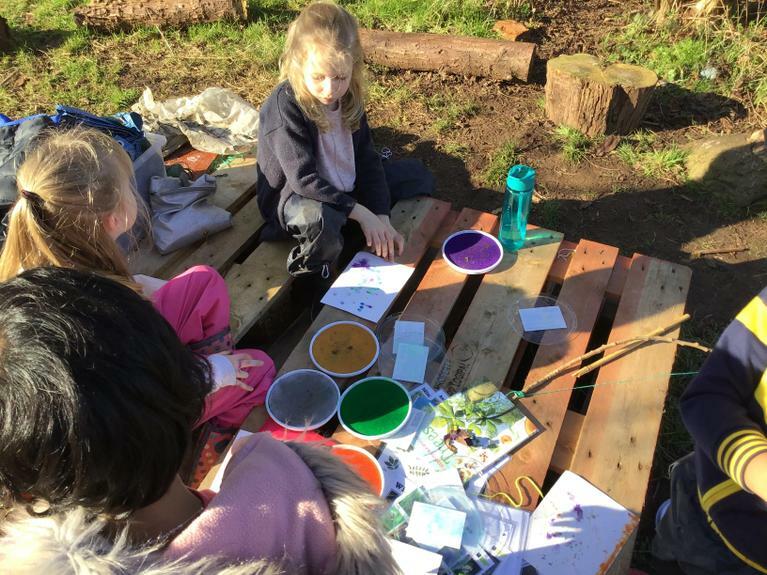 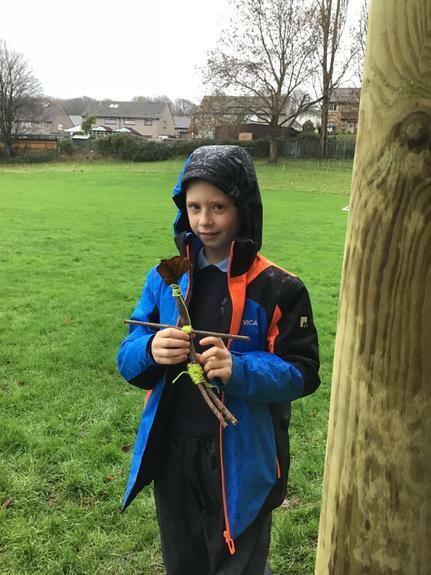 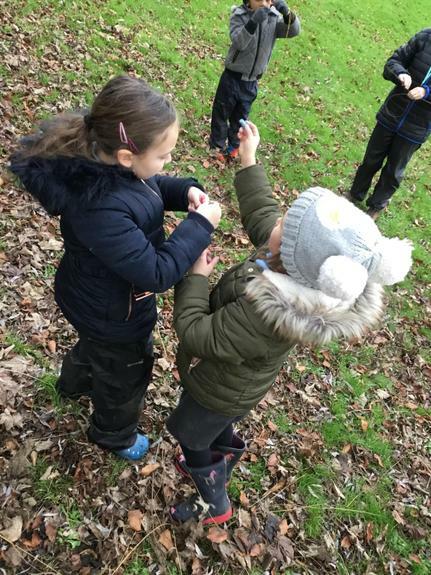 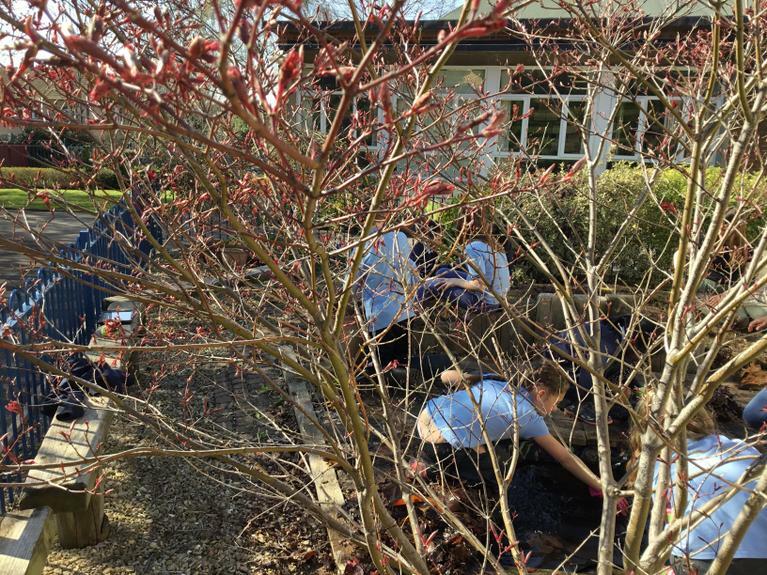 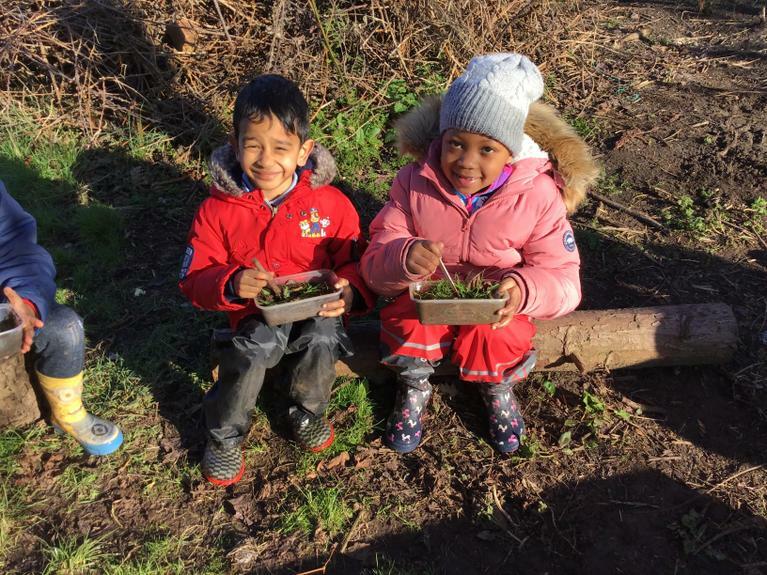 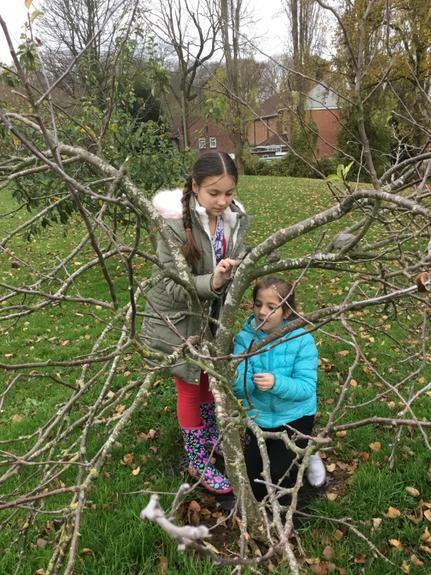 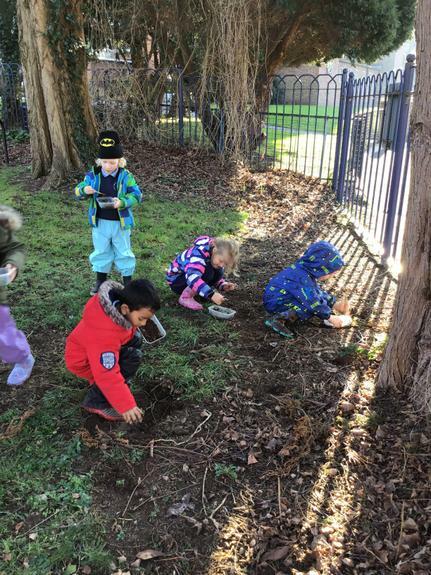 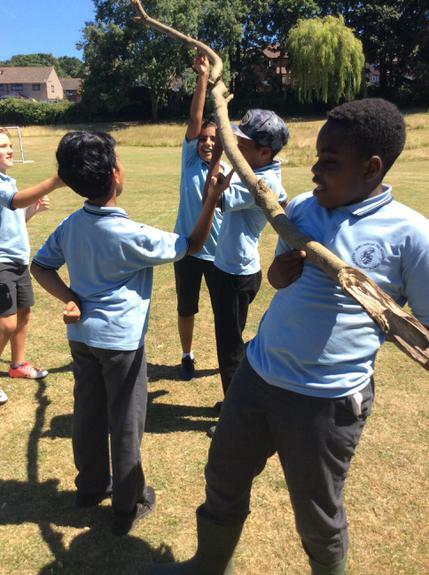 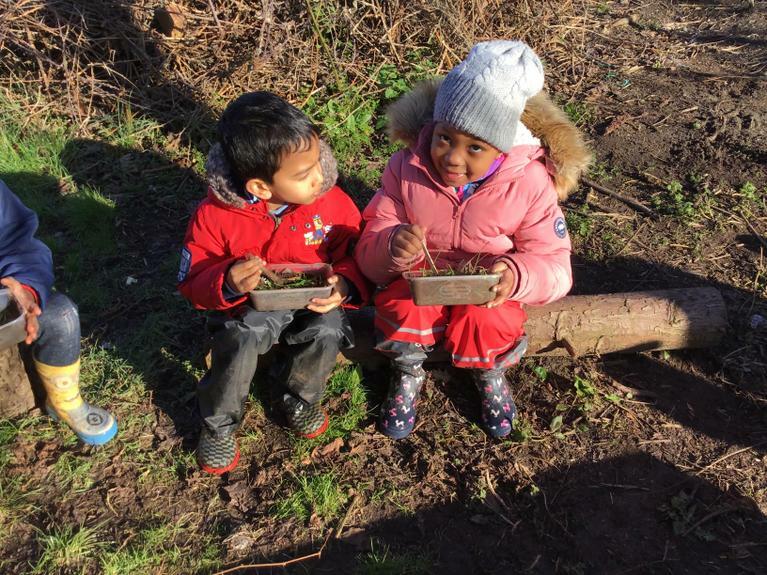 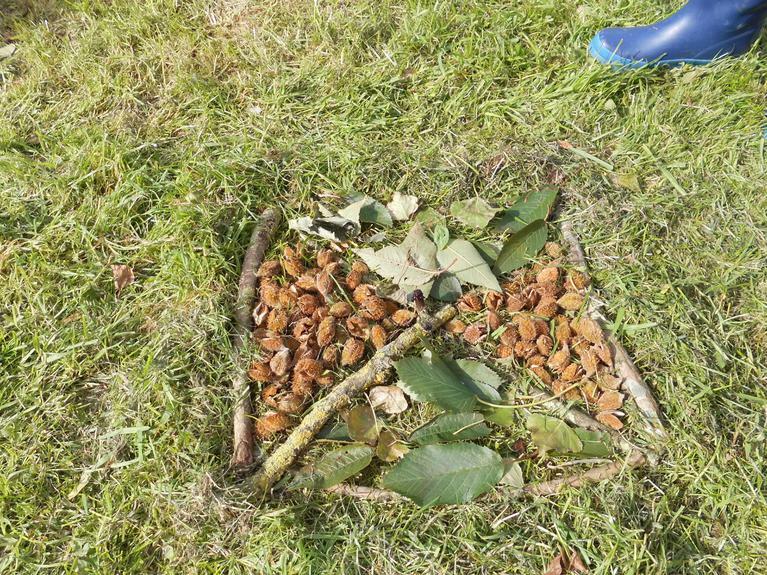 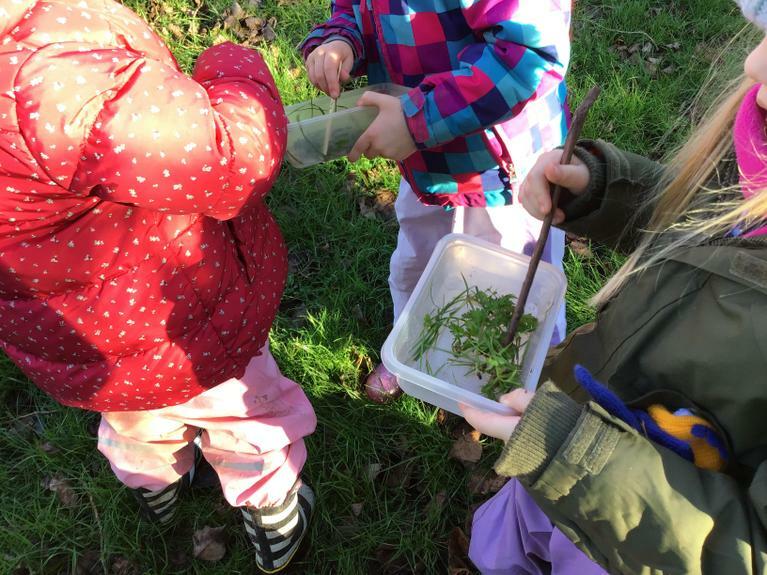 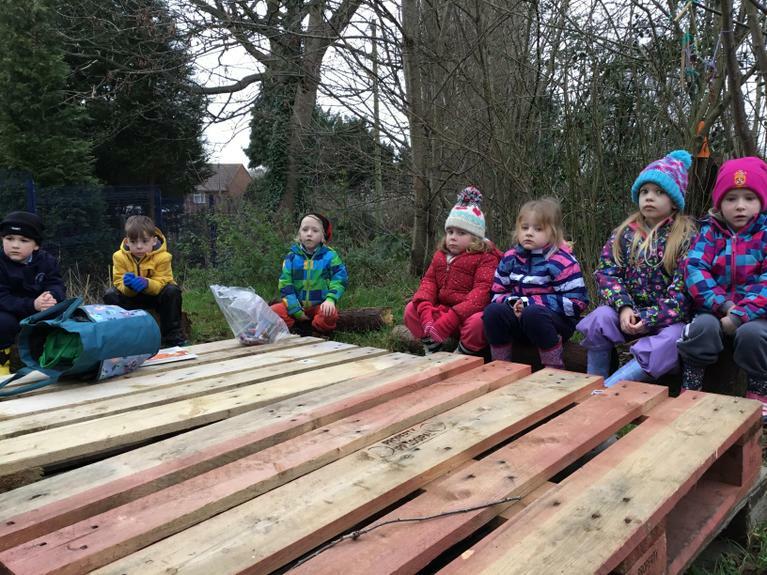 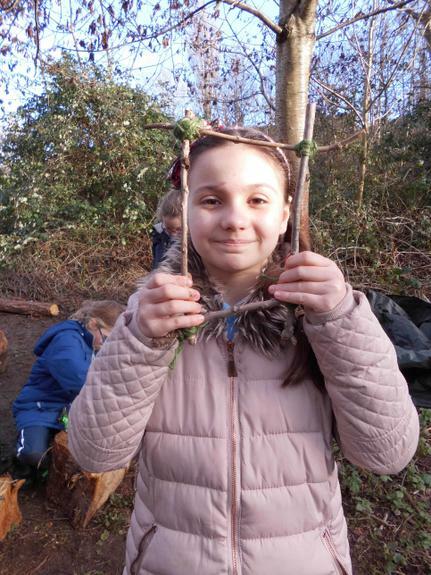 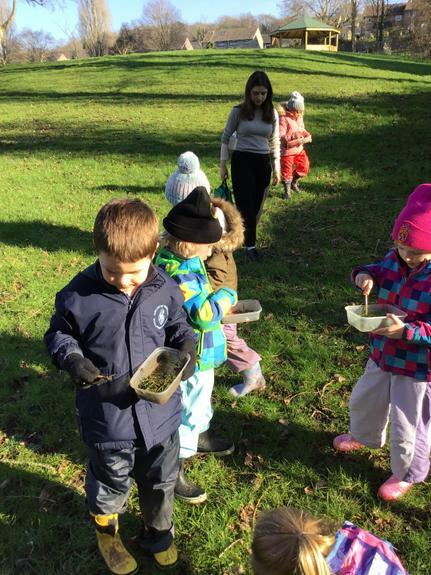 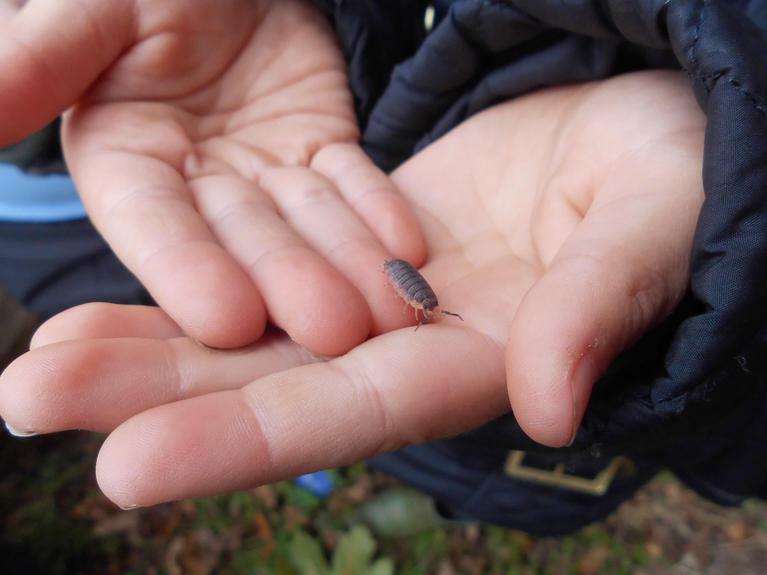 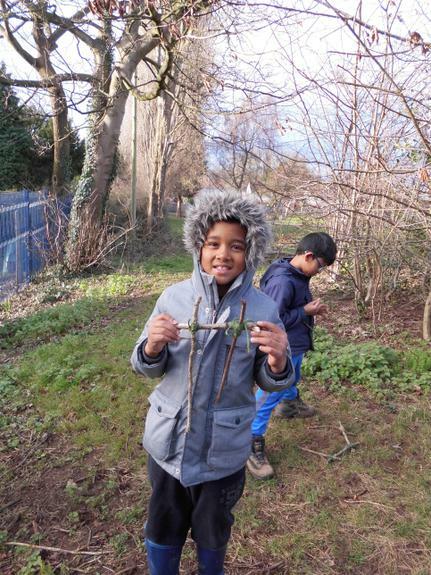 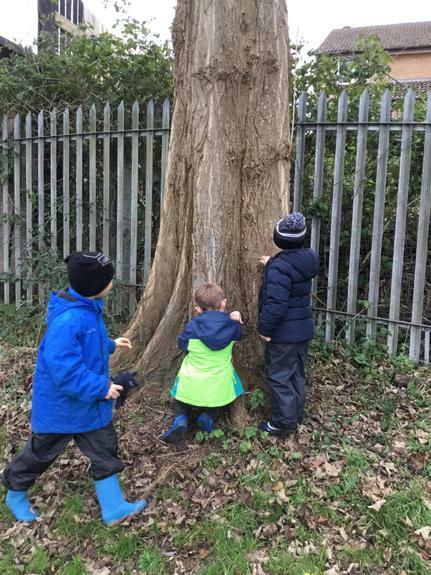 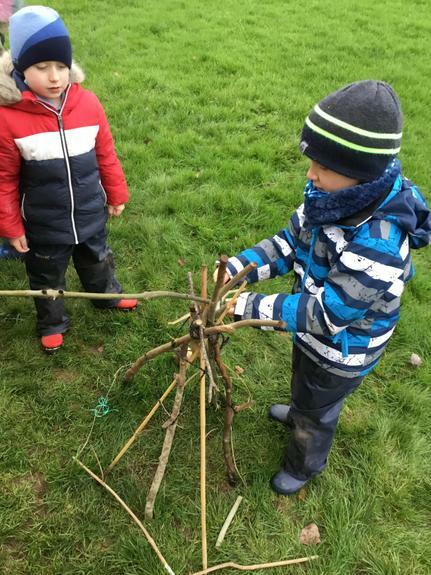 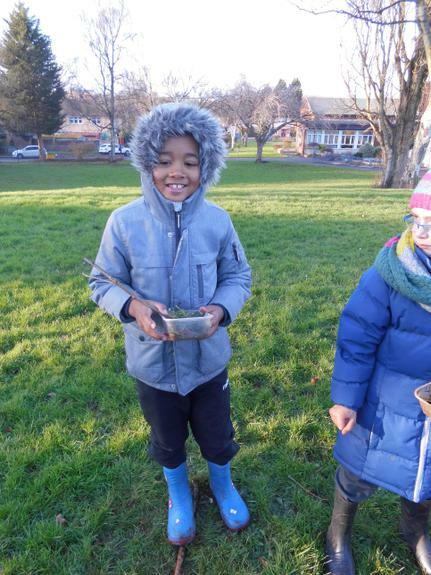 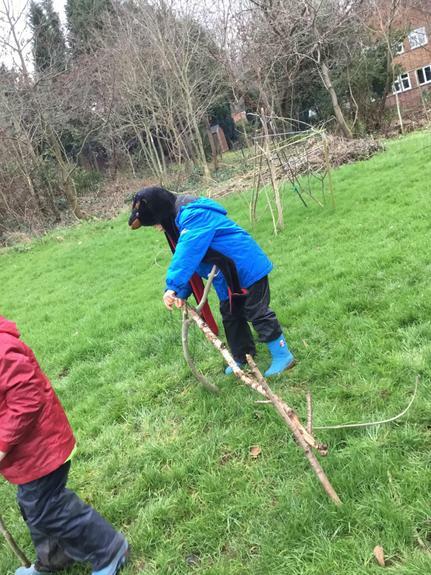 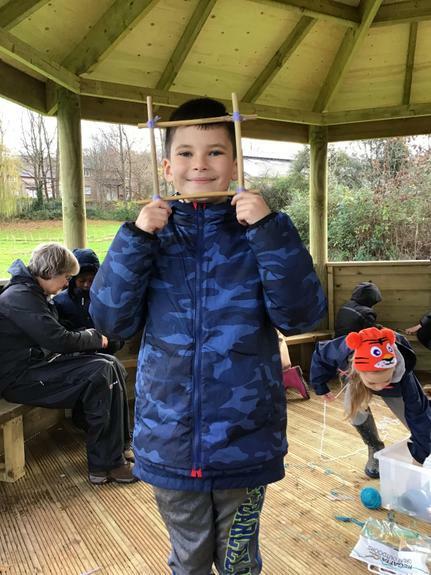 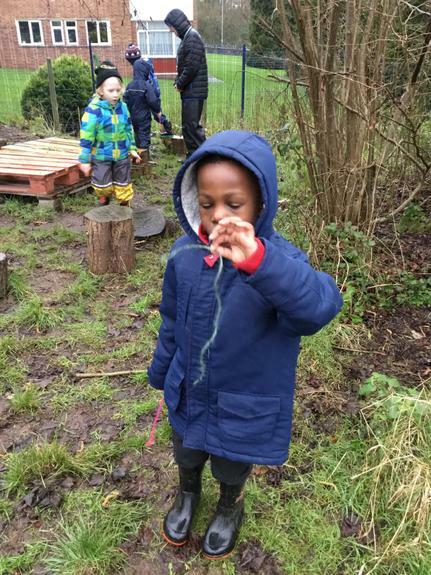 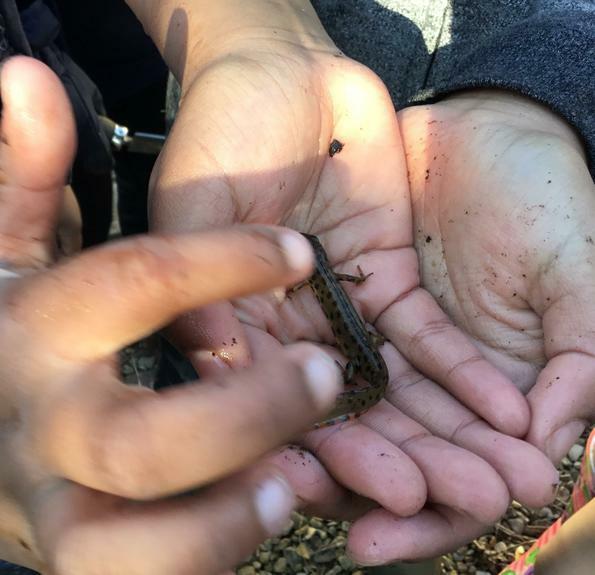 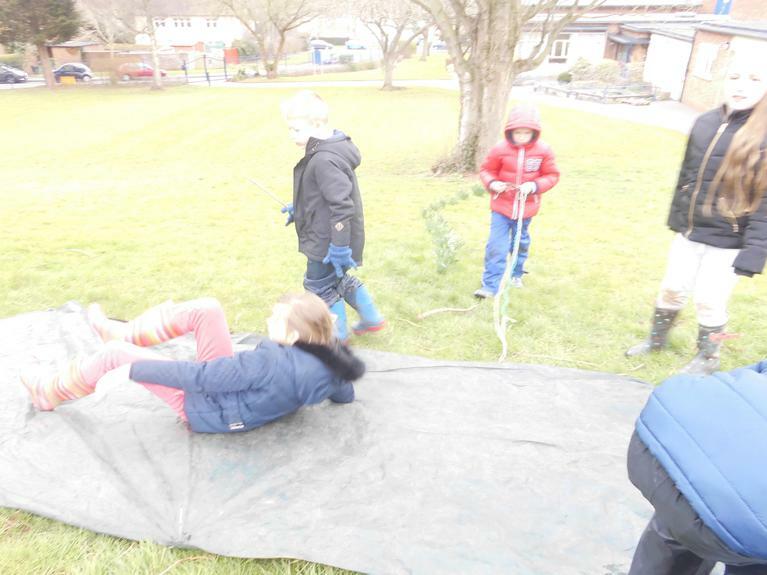 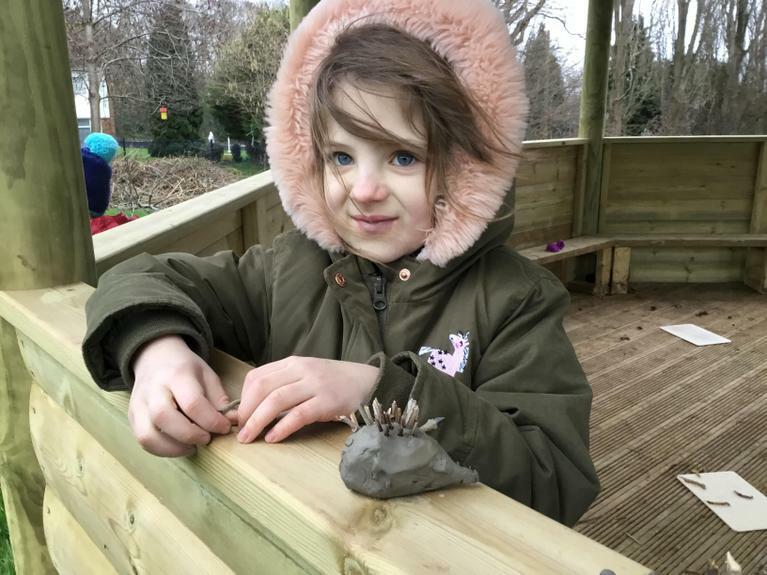 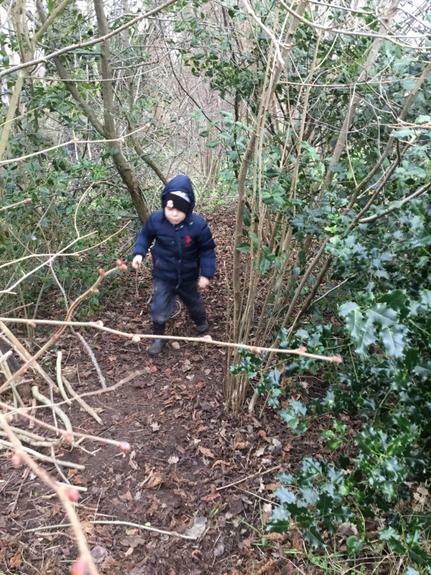 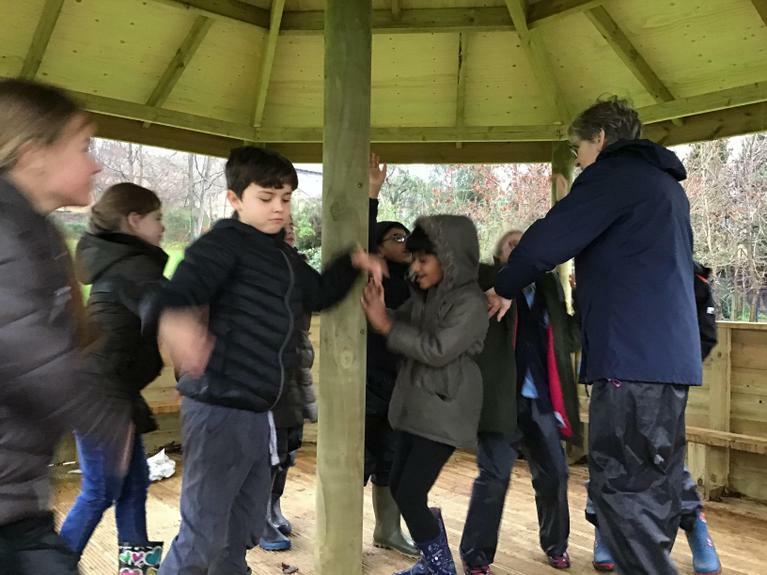 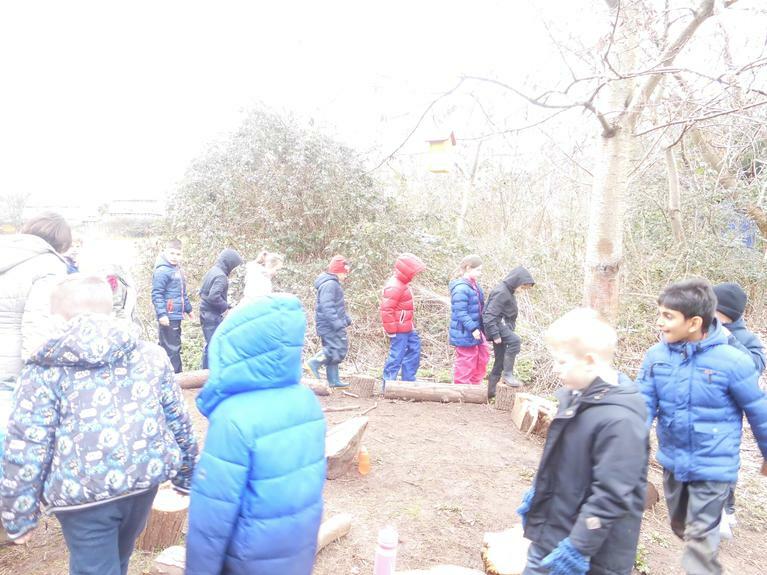 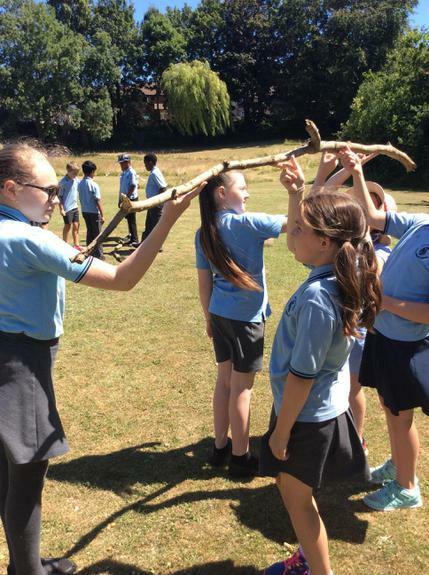 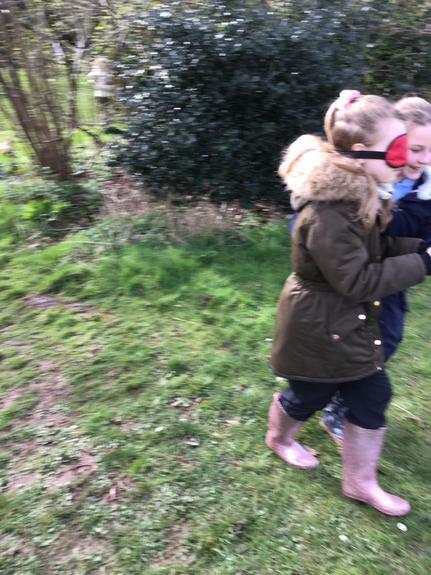 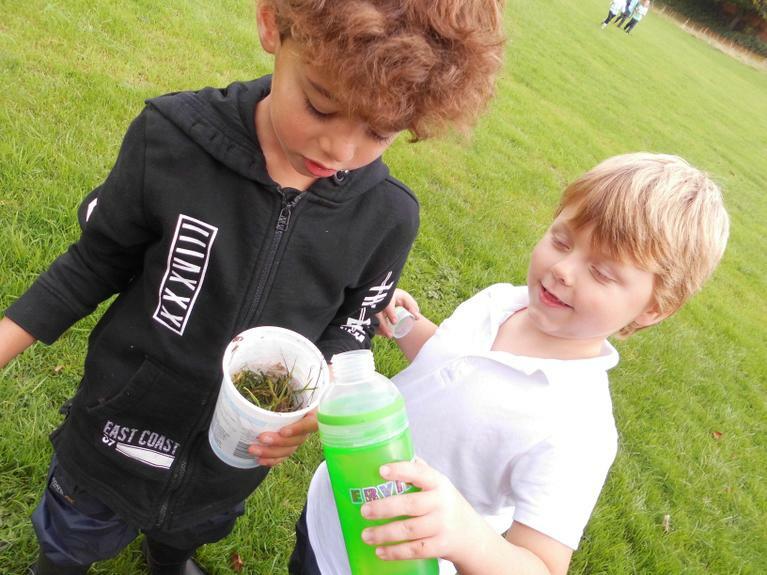 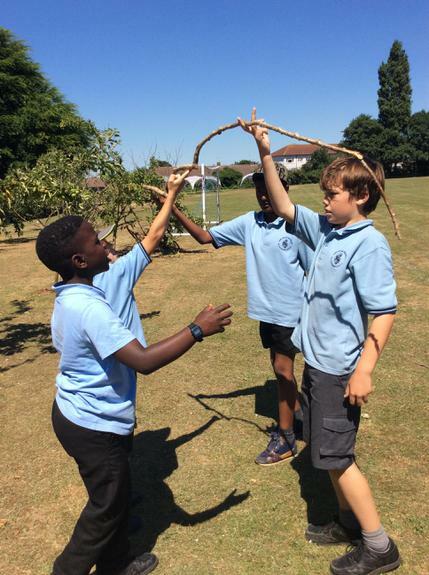 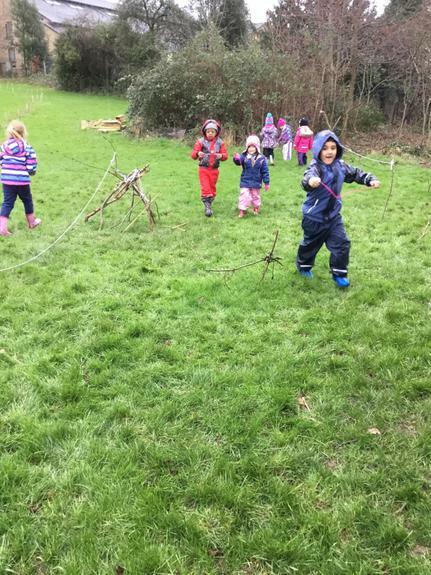 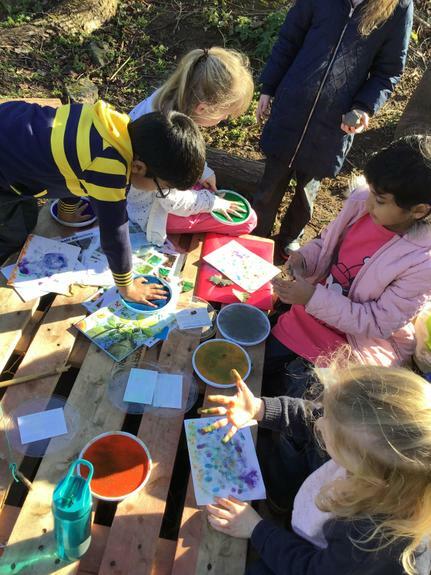 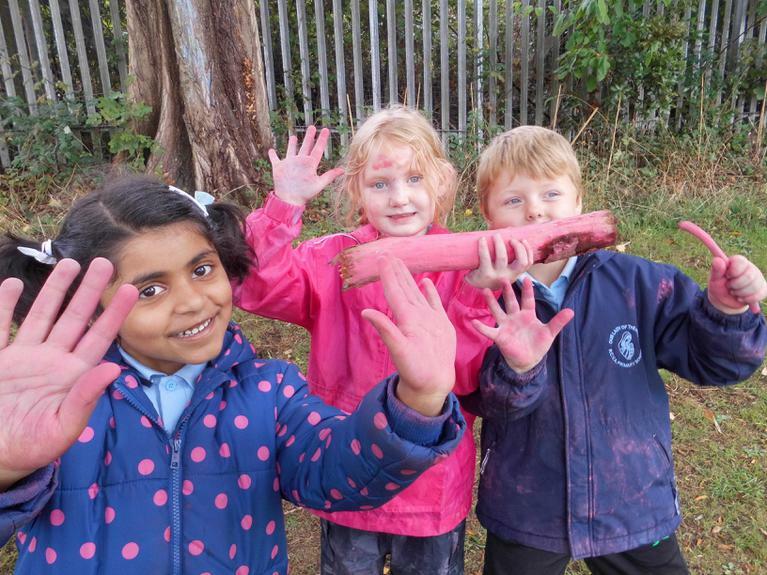 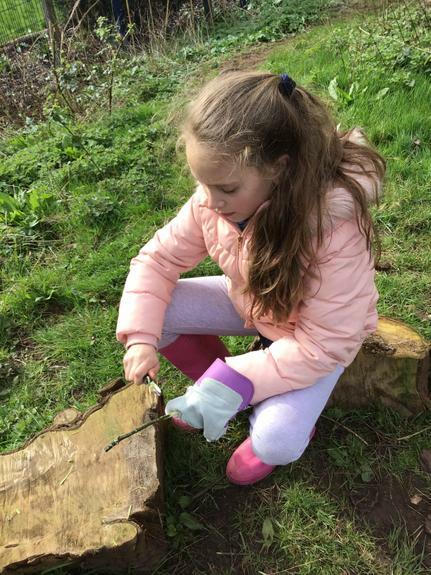 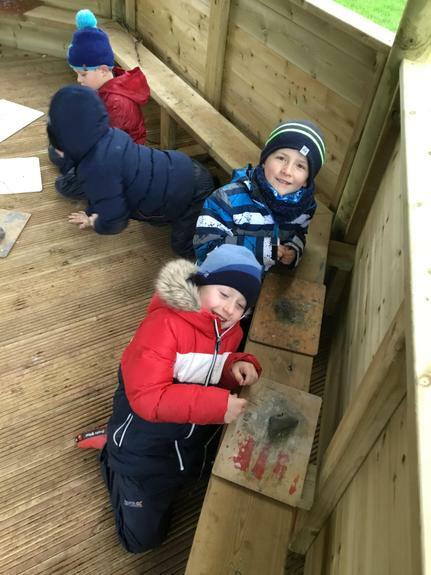 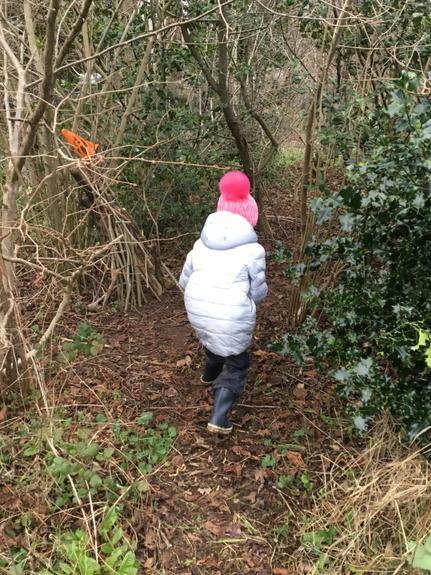 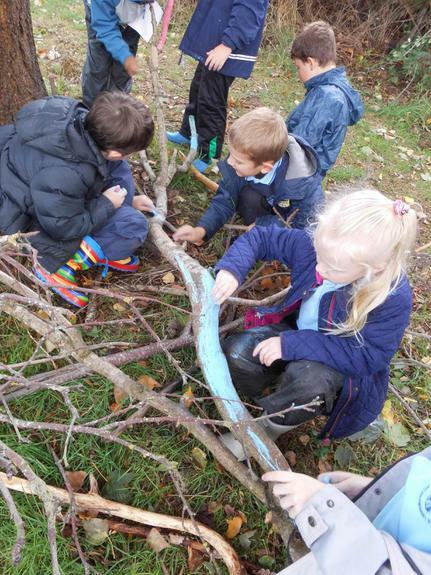 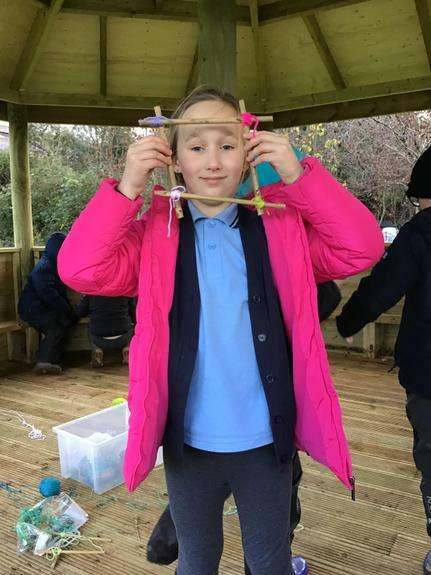 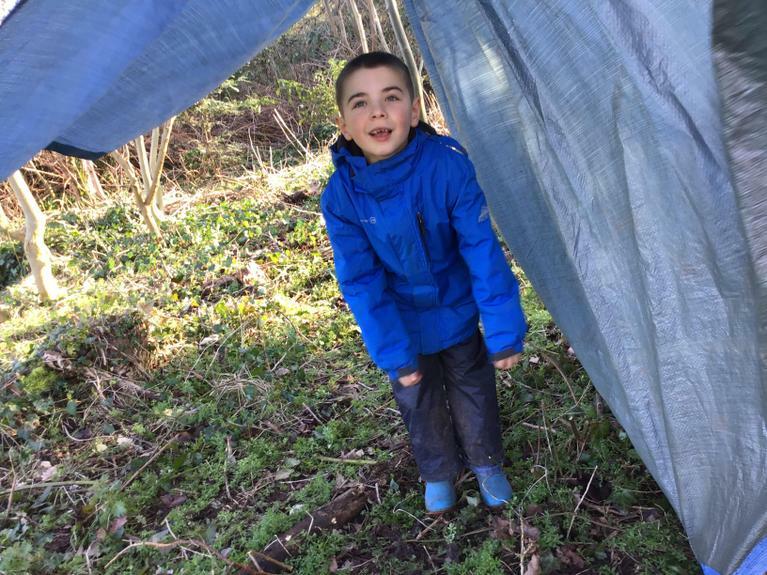 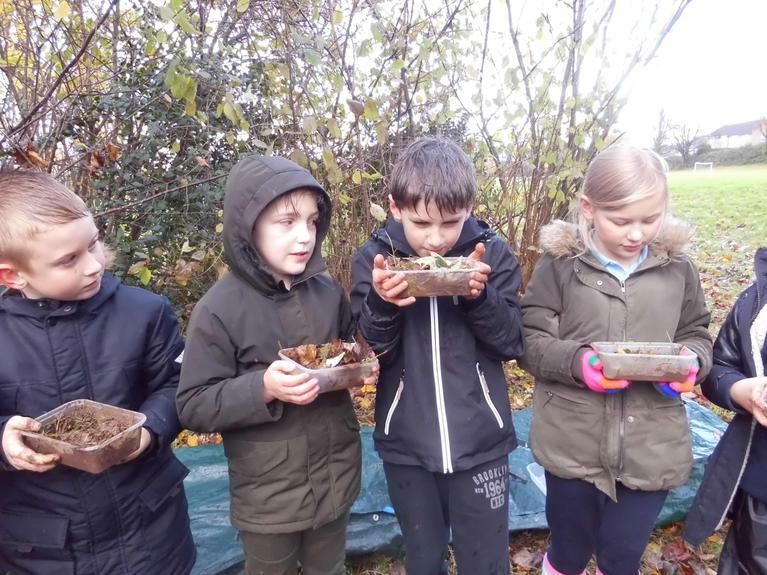 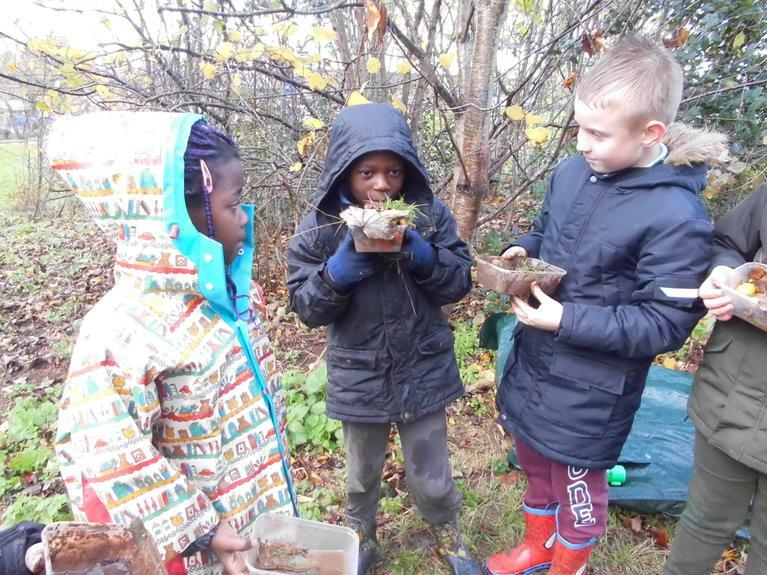 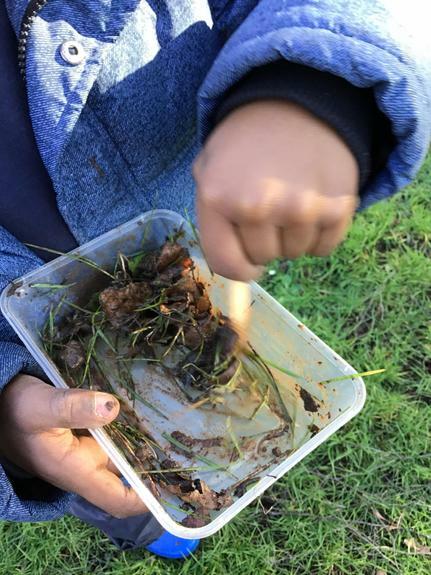 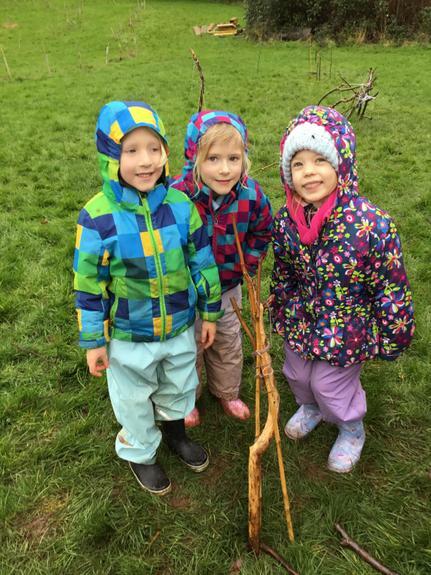 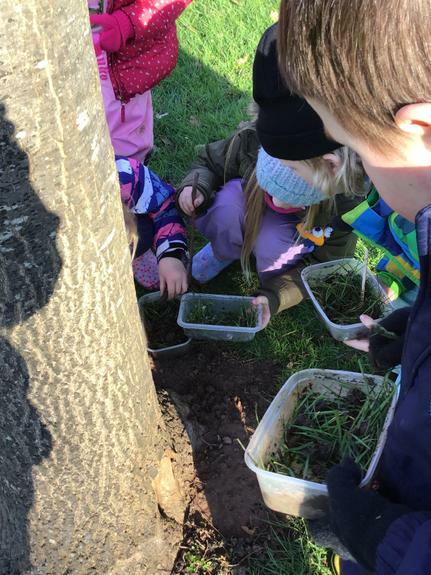 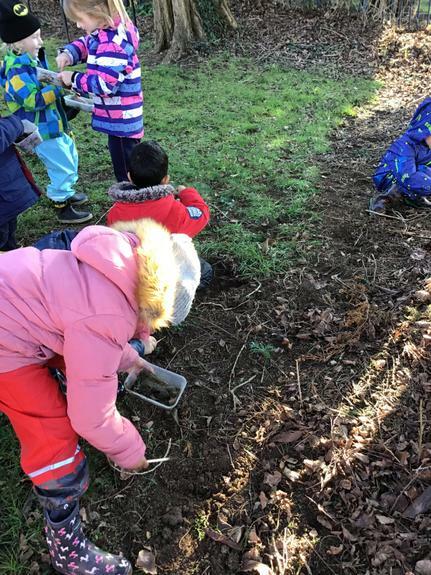 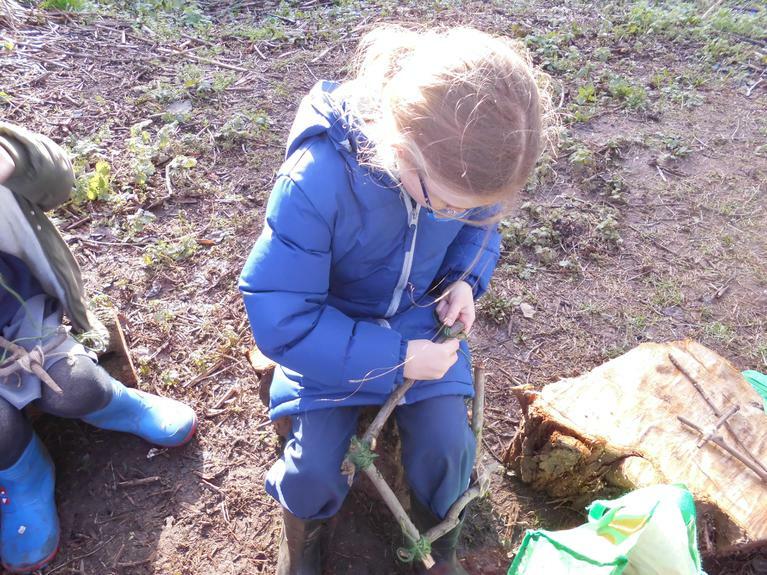 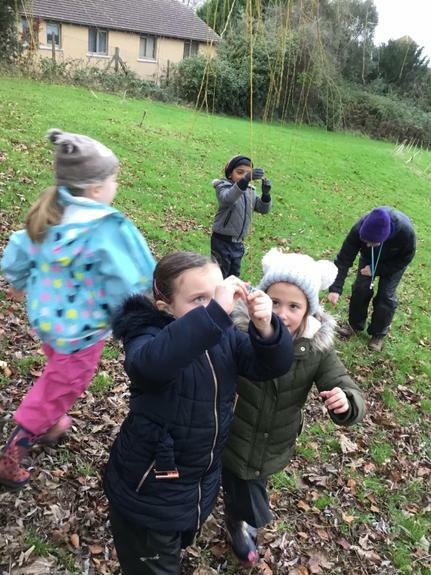 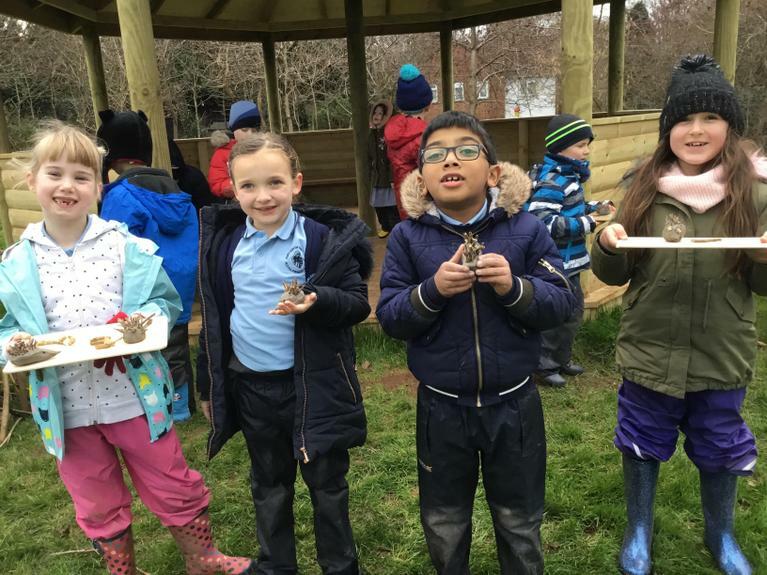 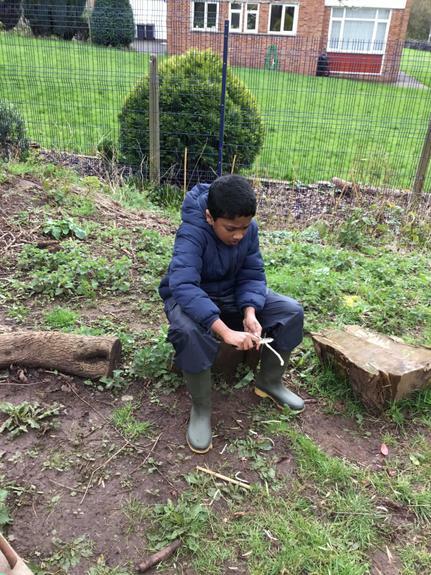 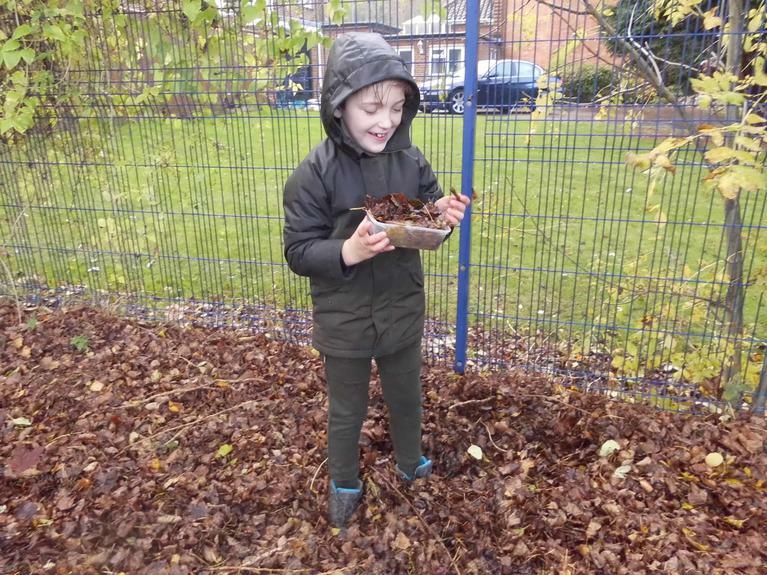 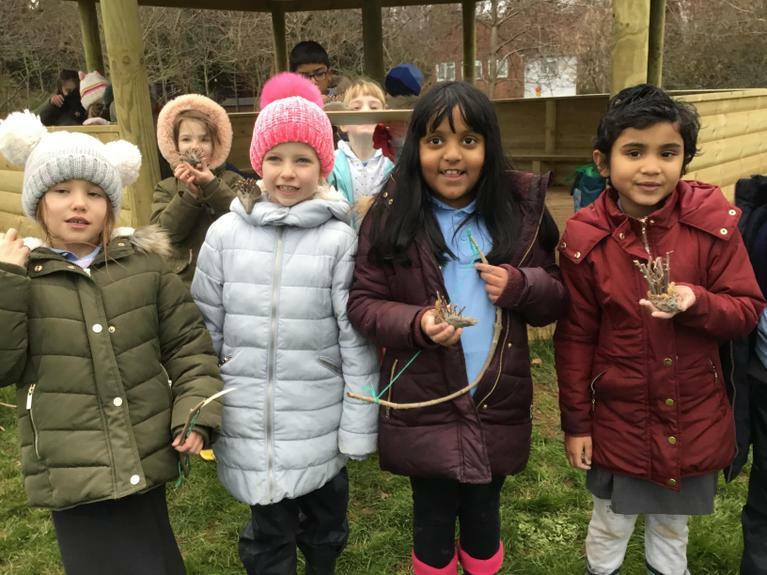 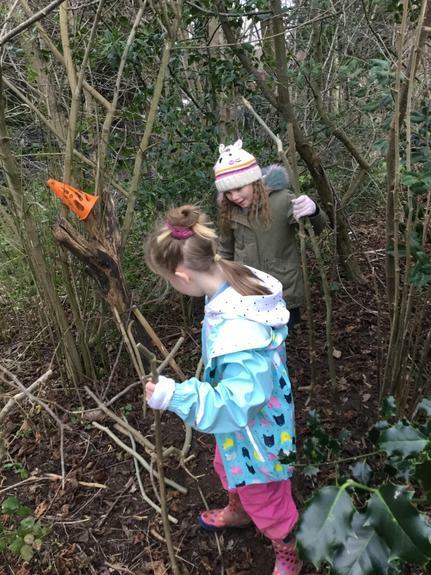 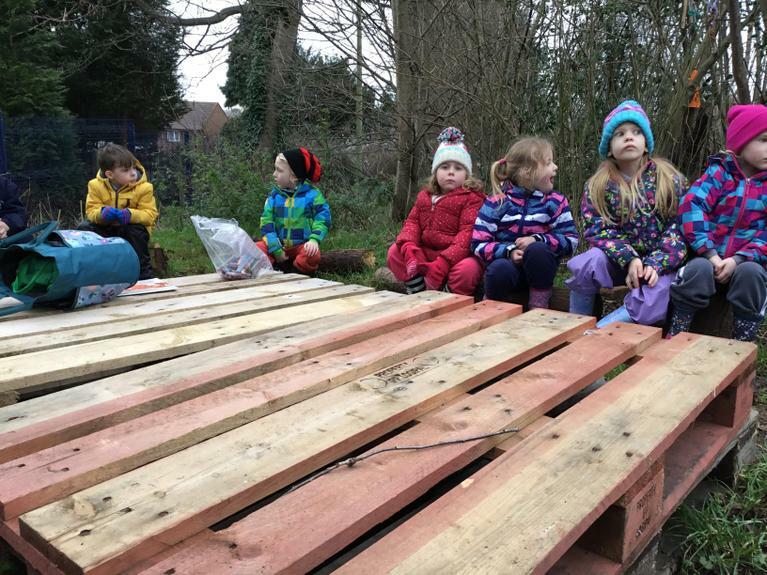 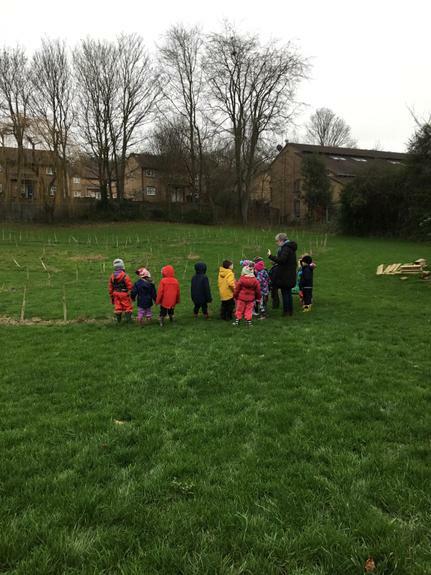 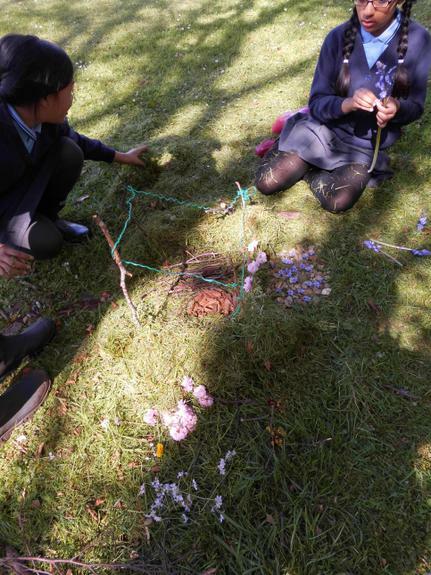 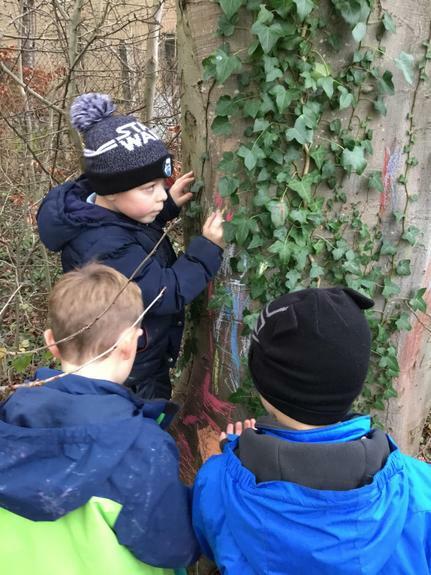 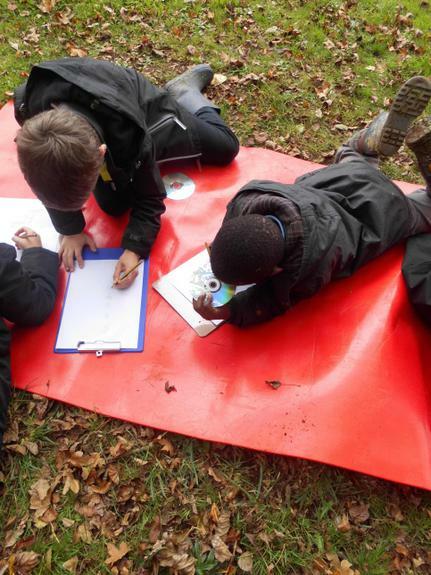 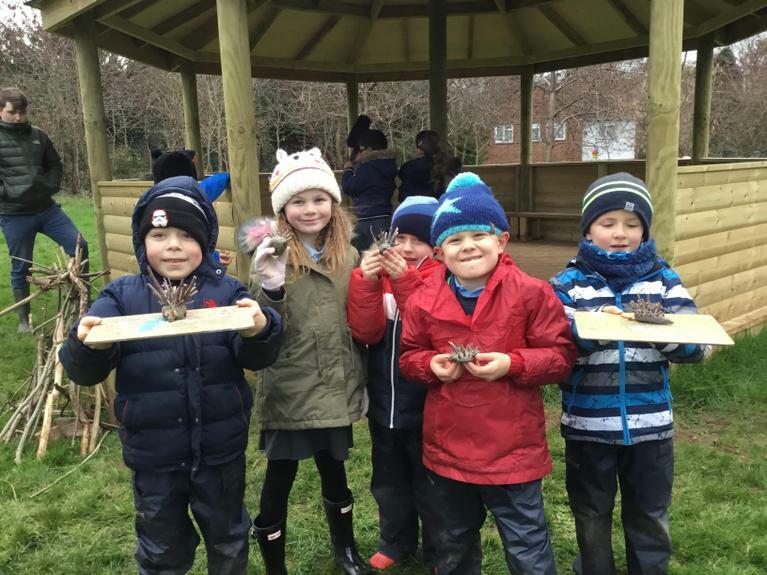 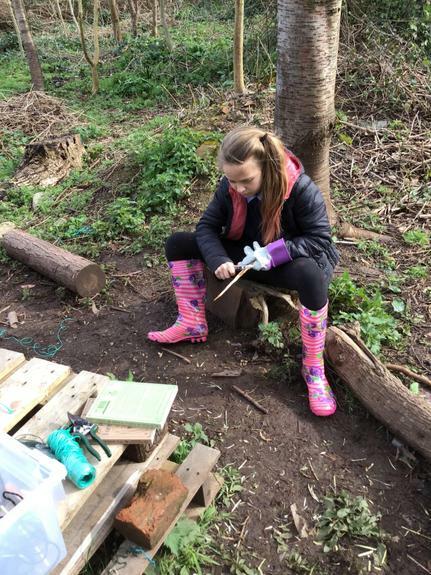 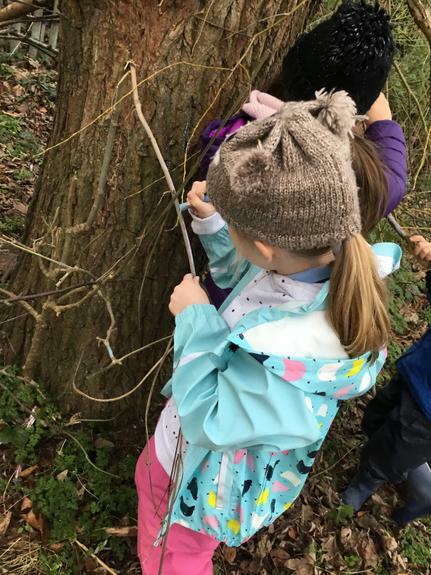 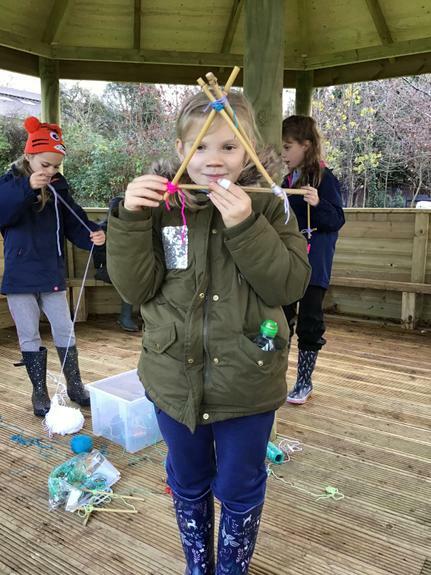 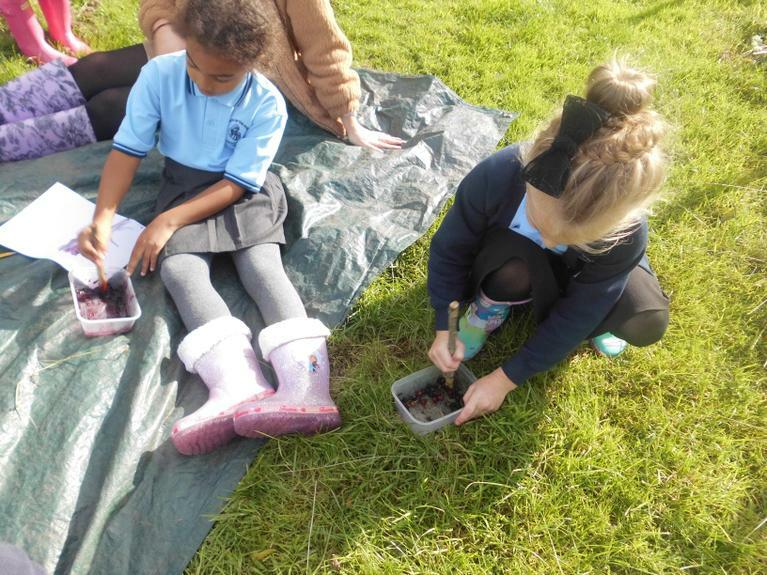 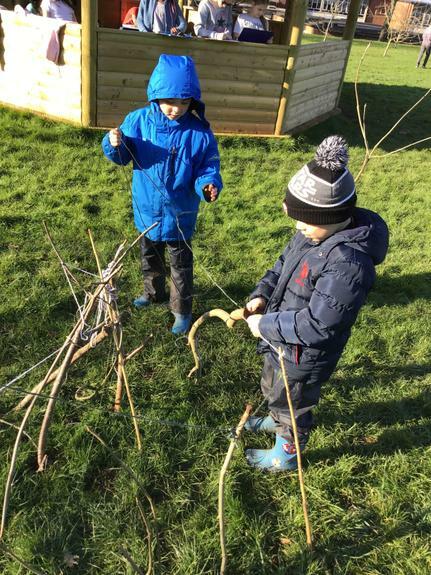 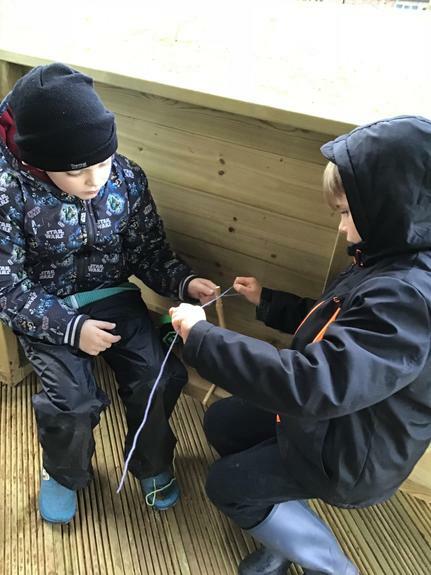 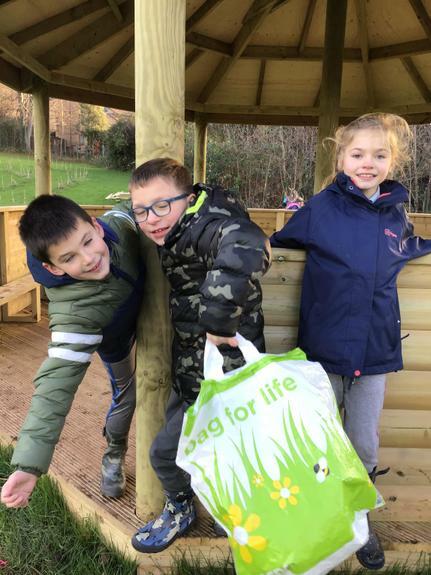 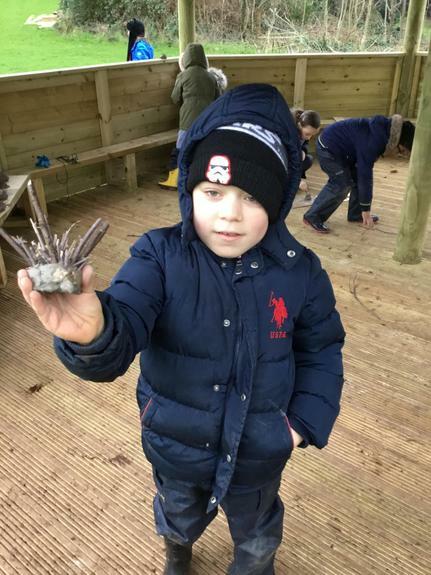 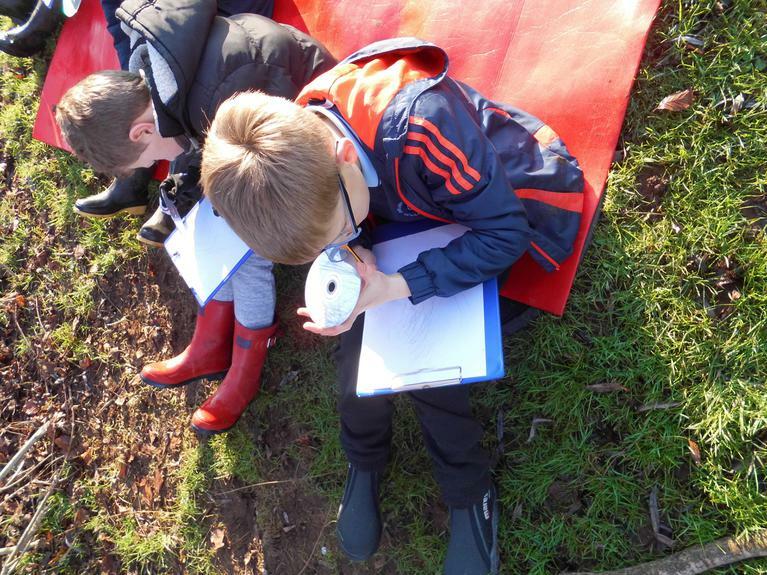 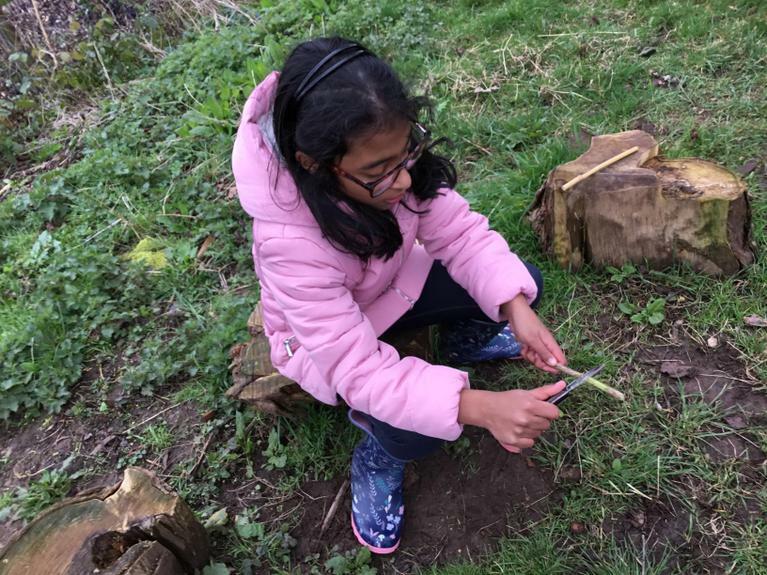 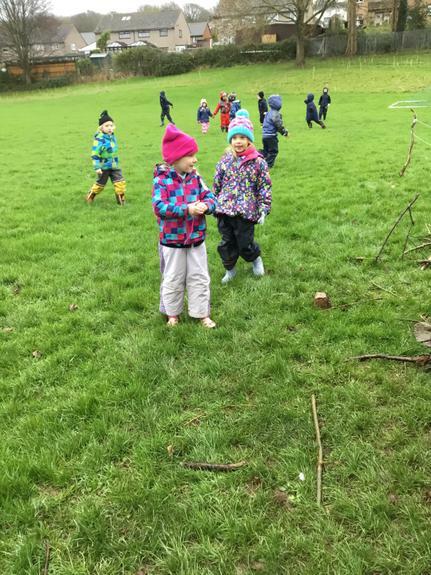 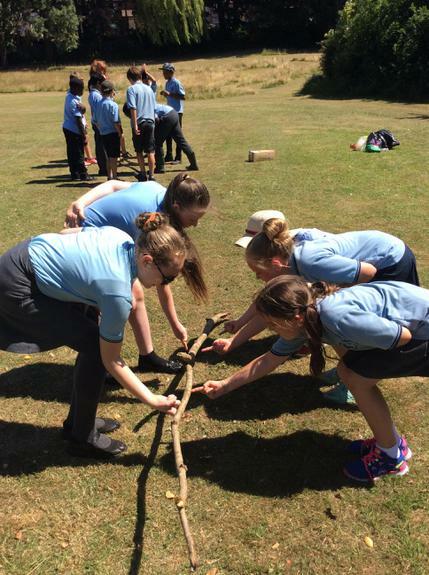 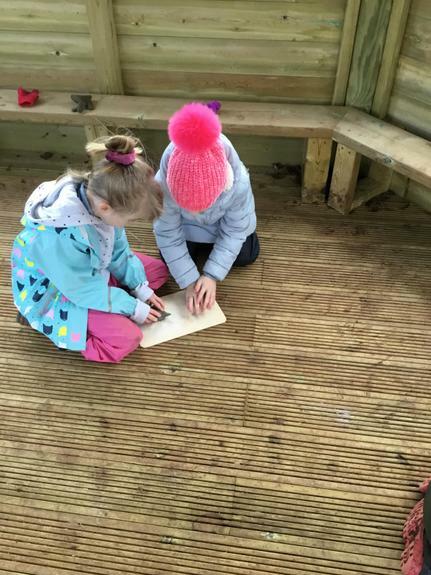 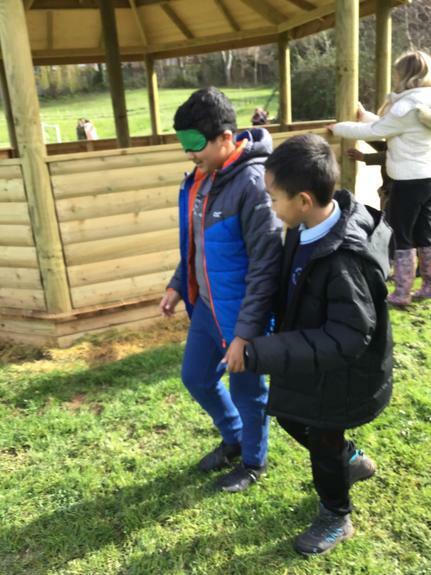 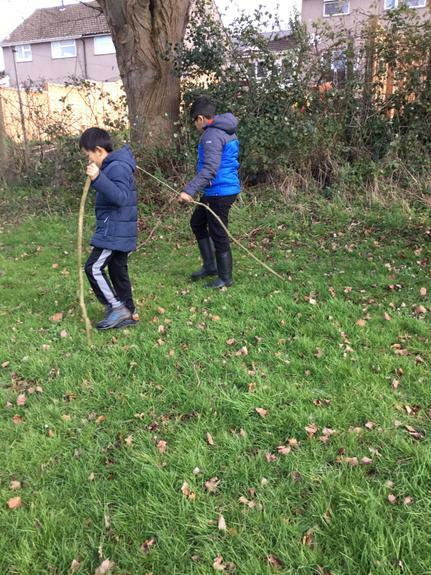 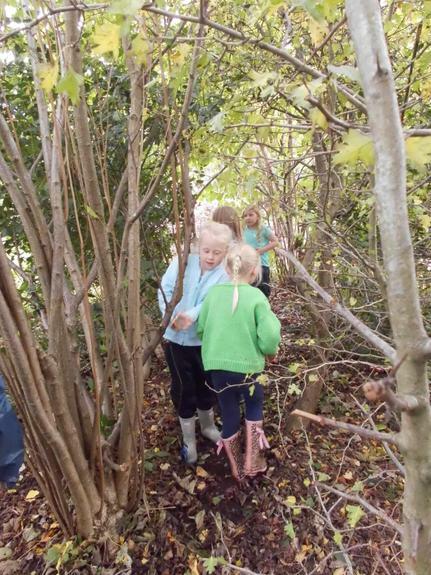 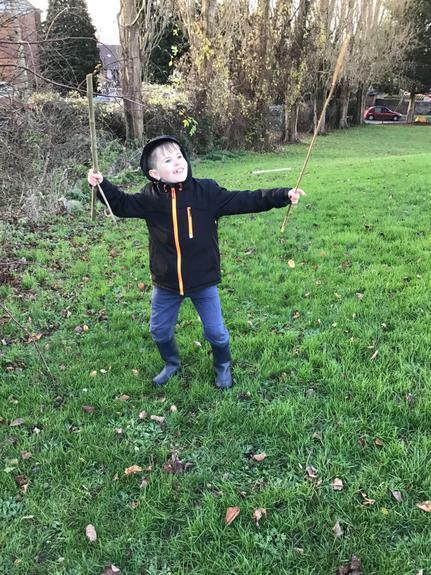 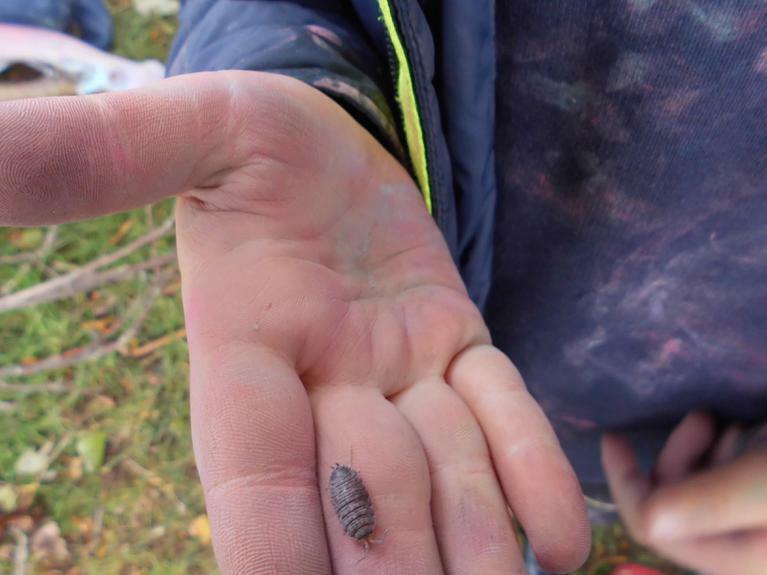 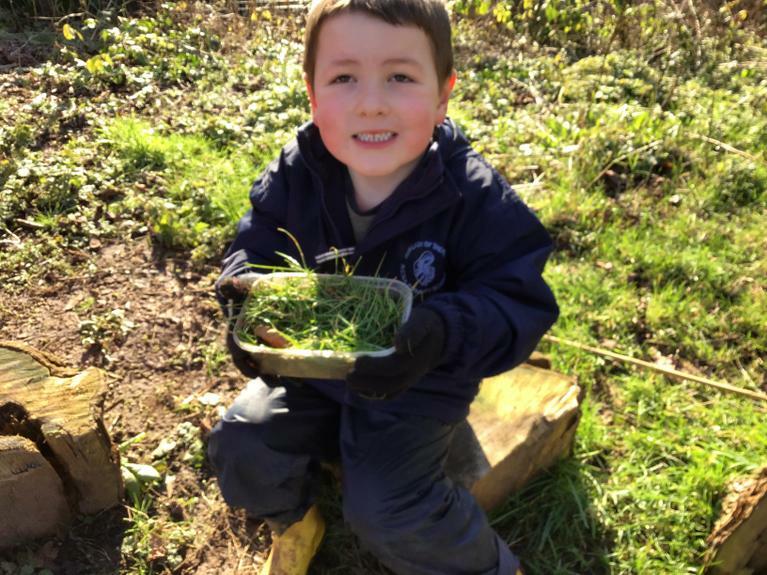 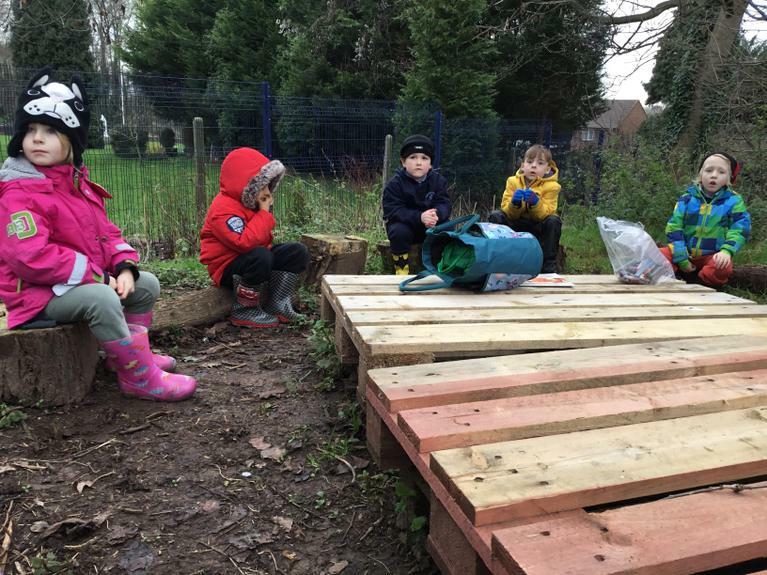 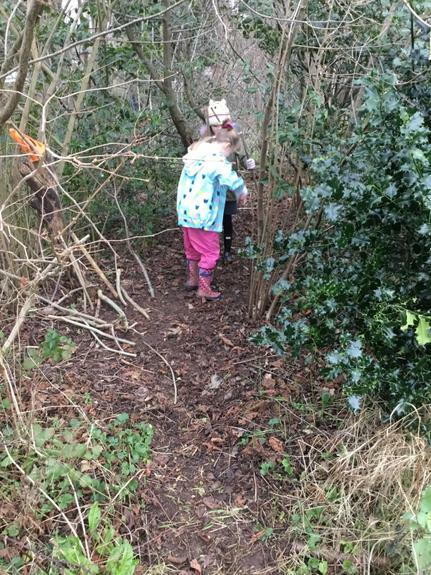 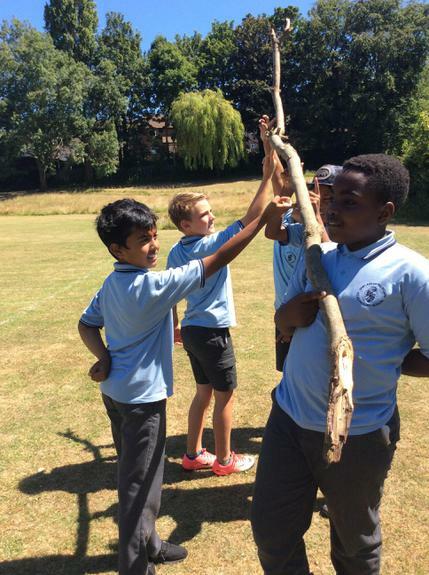 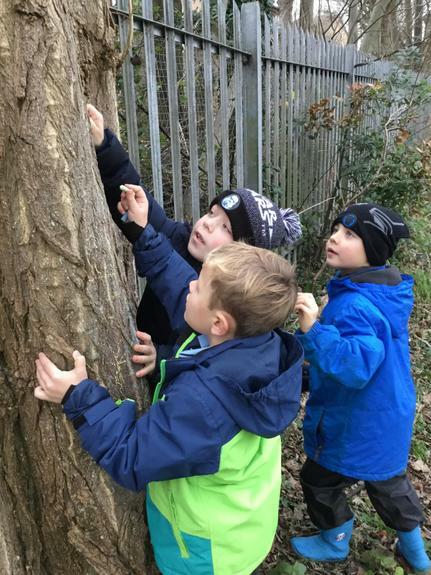 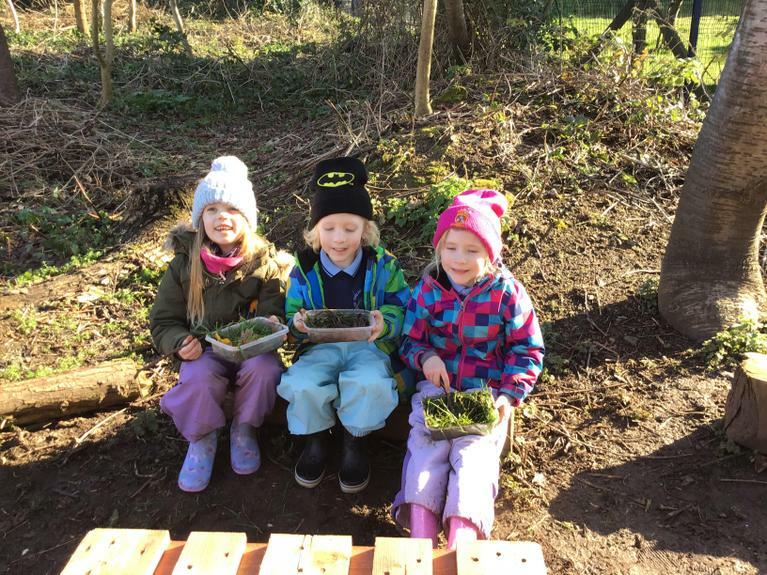 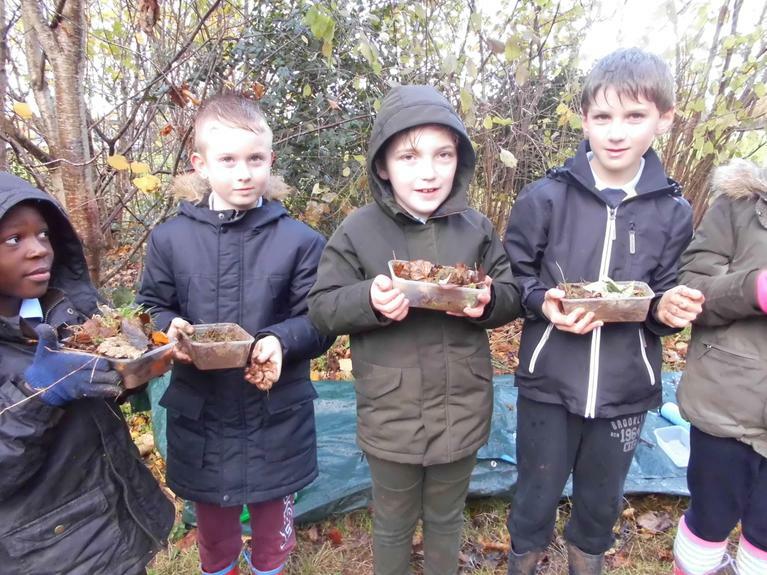 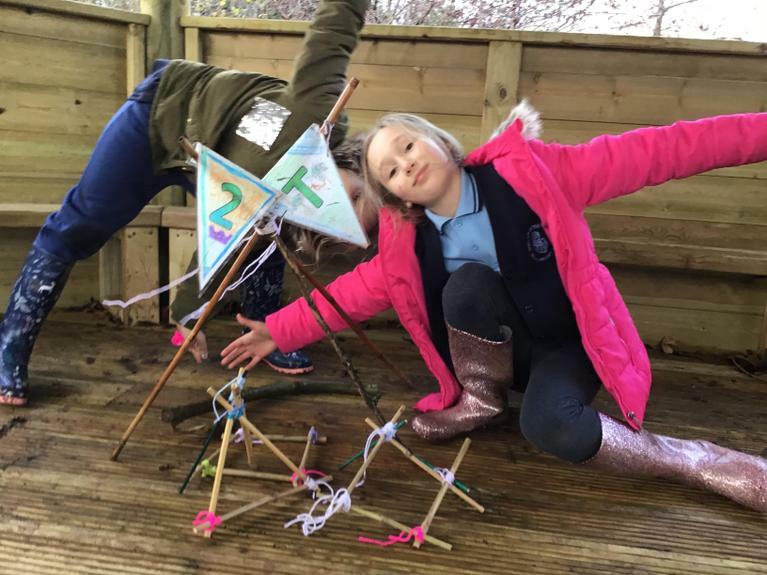 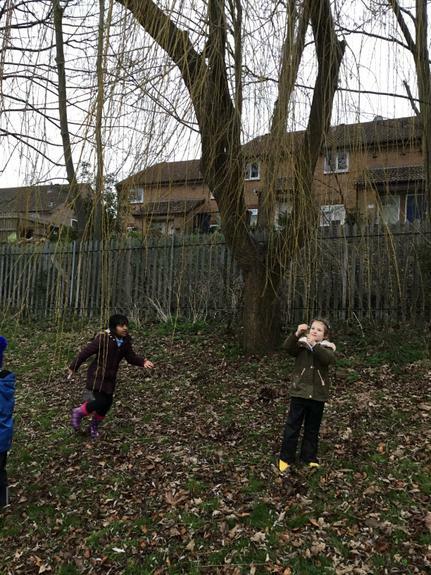 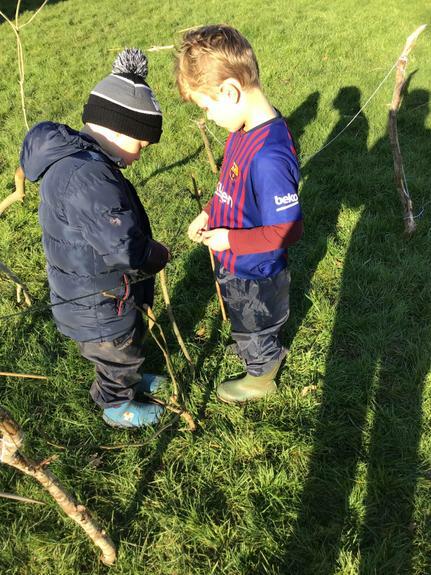 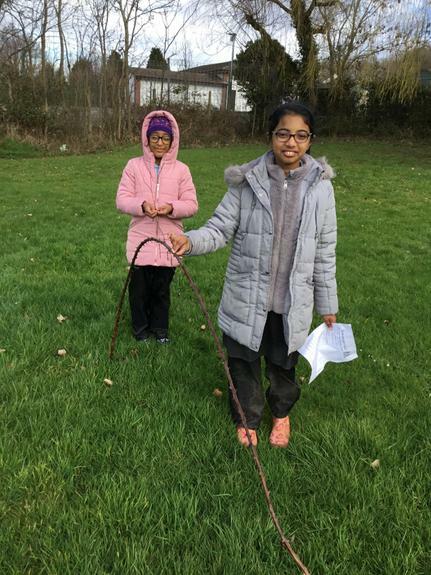 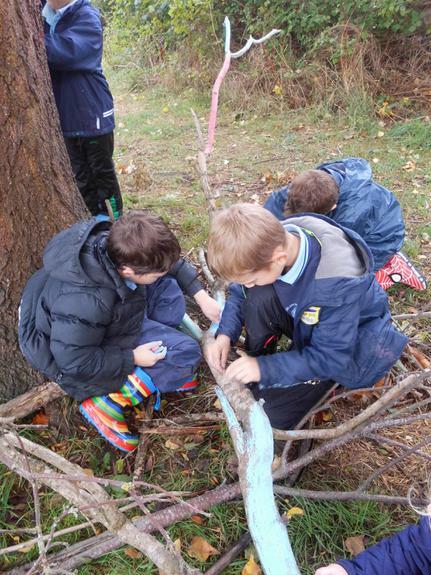 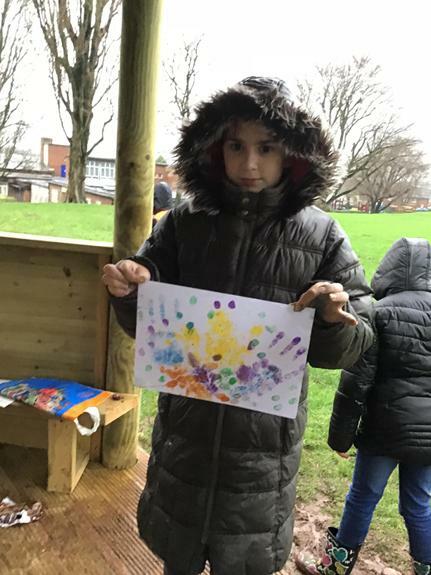 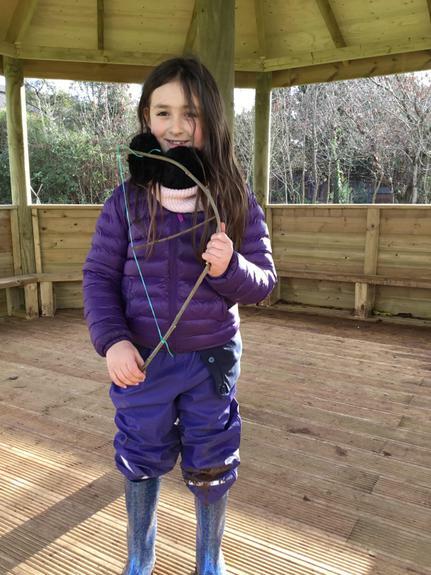 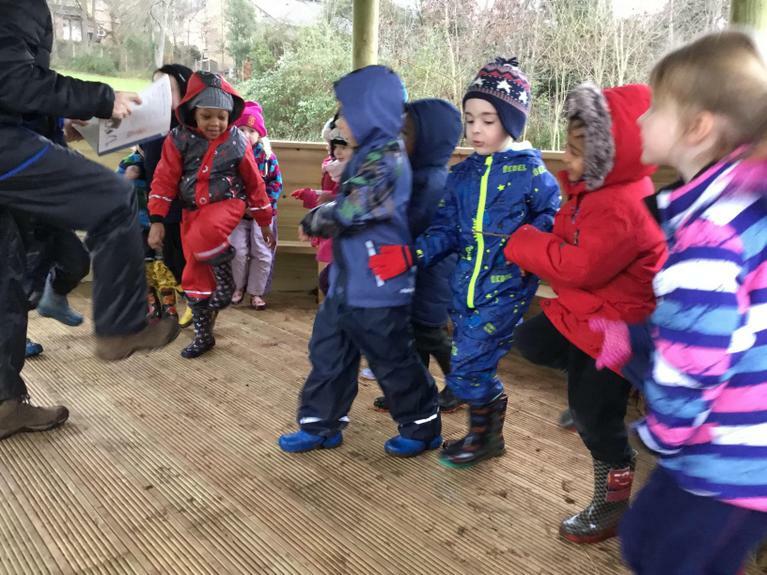 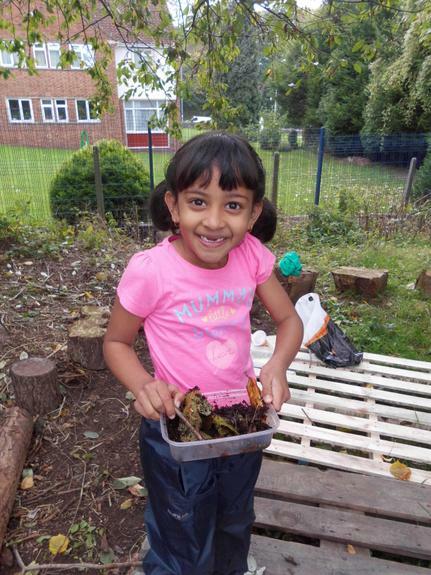 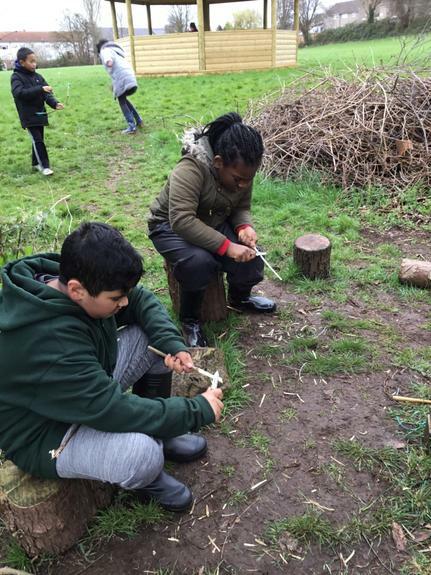 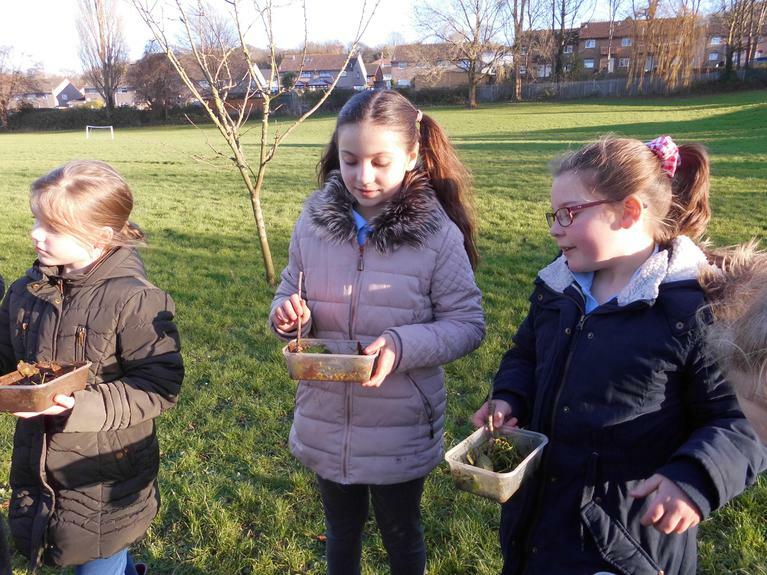 We have incorporated this into our PE curriculum 'outdoor and adventurous play' so that every child in the school will experience six weeks of forest school during the academic year. 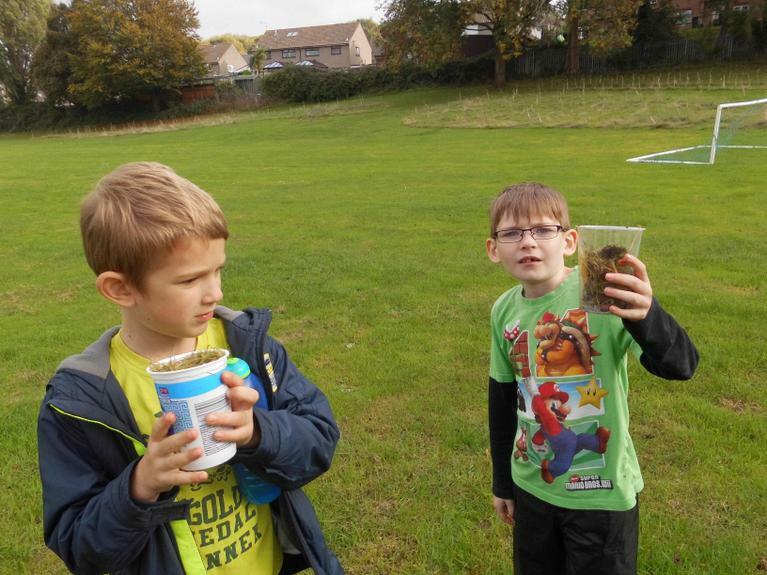 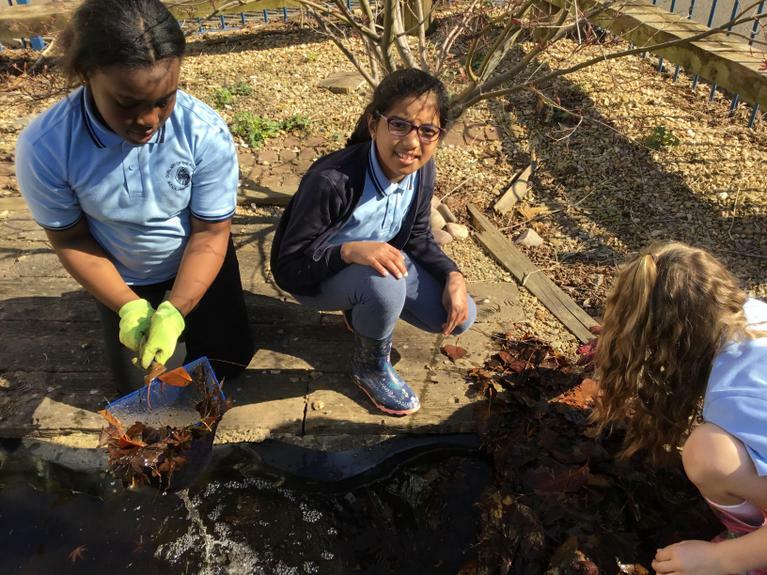 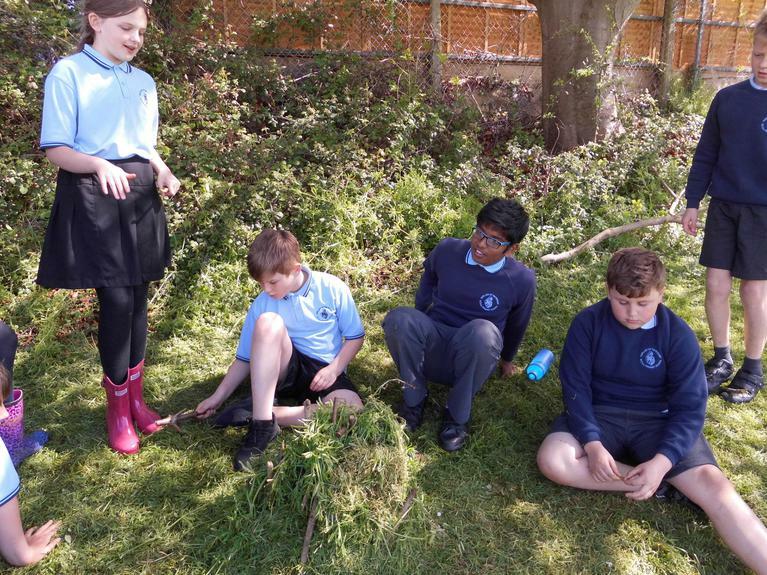 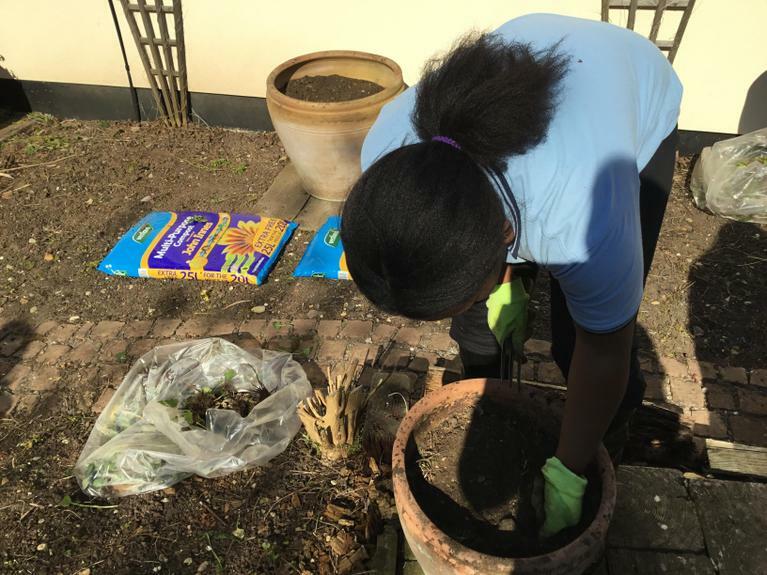 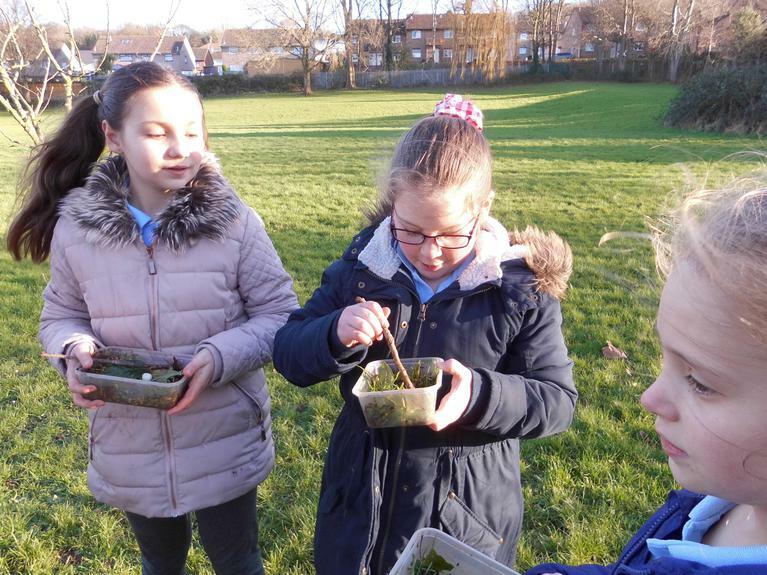 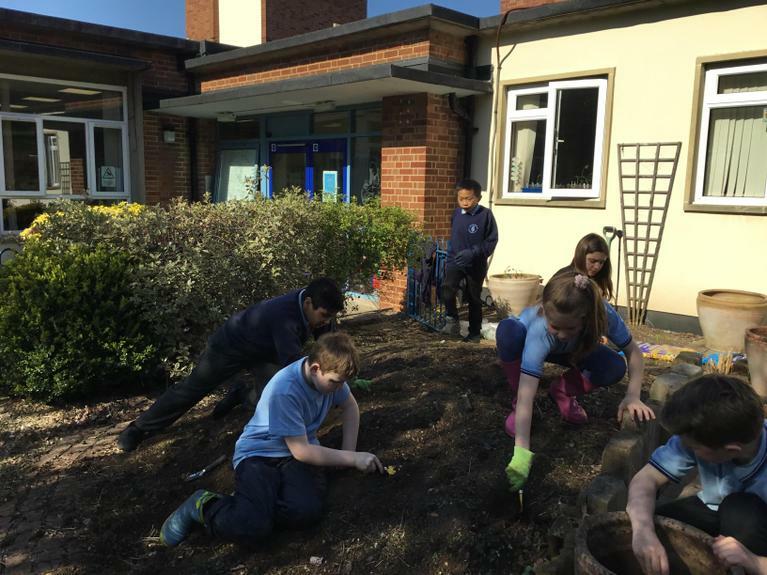 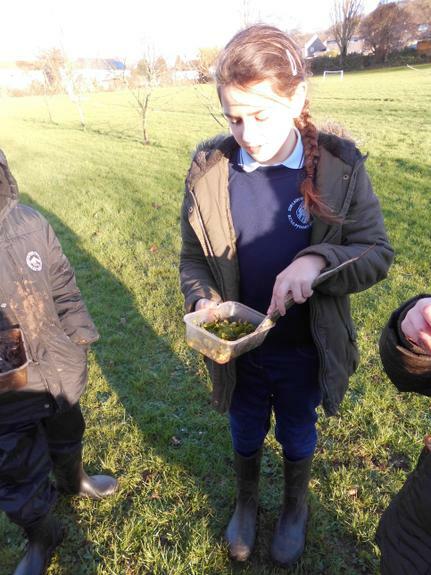 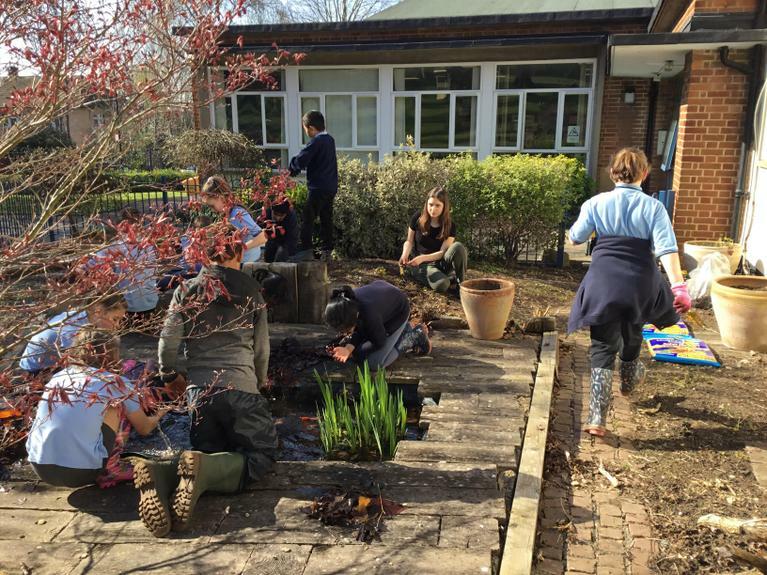 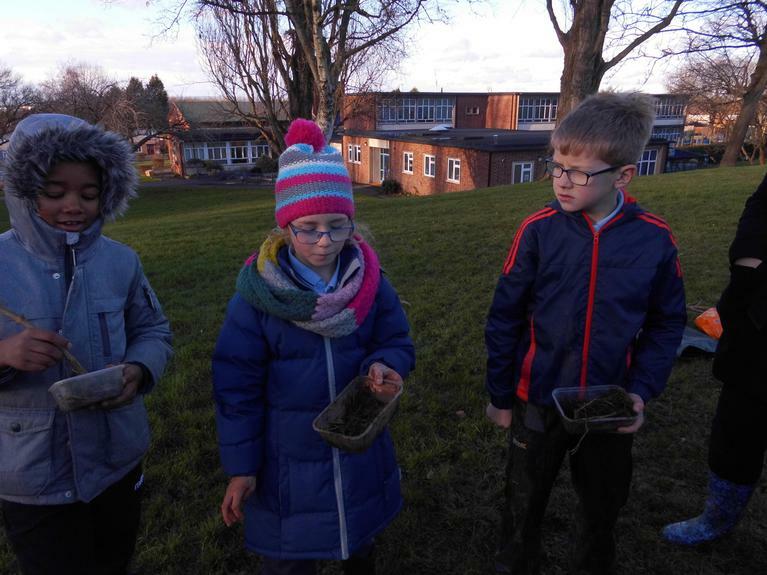 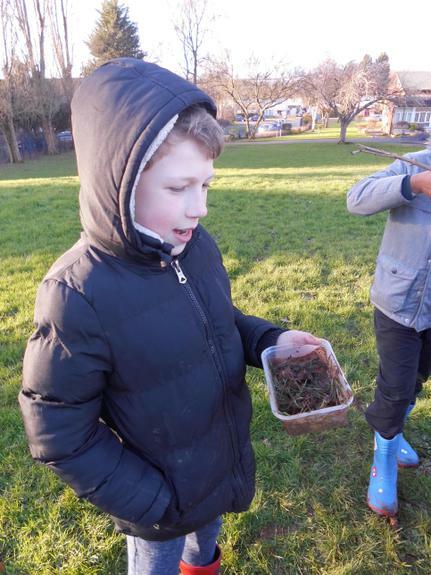 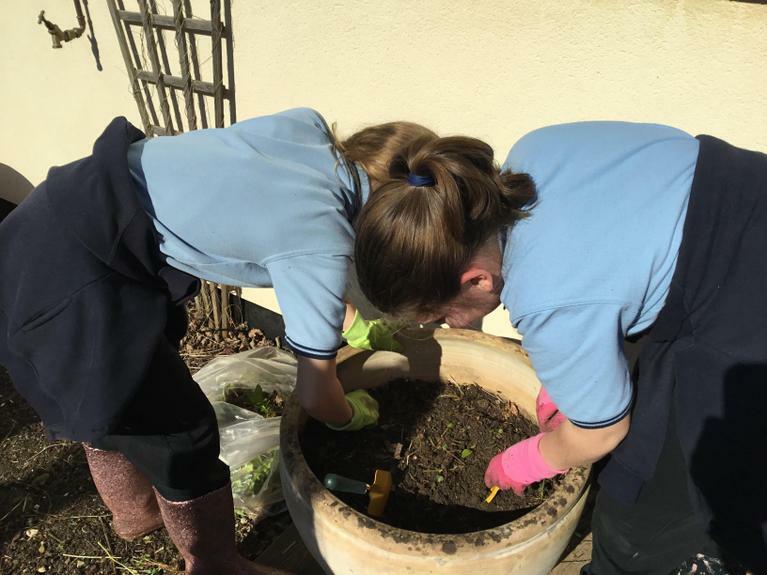 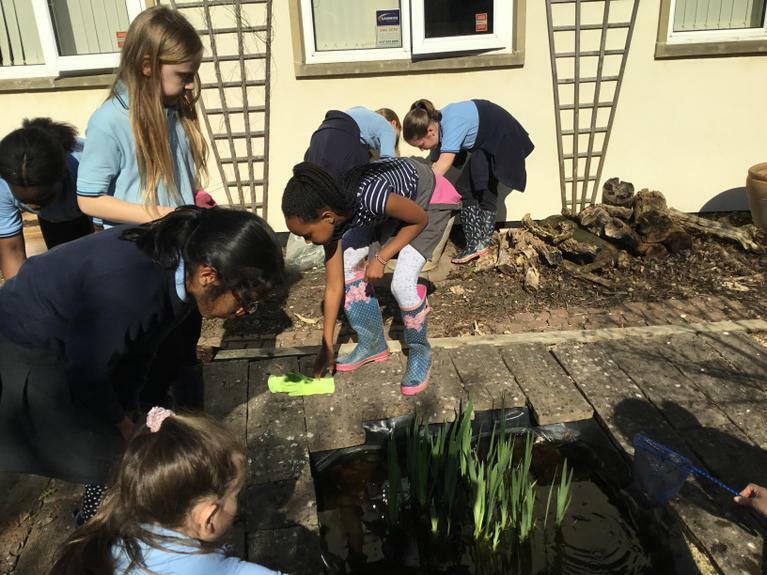 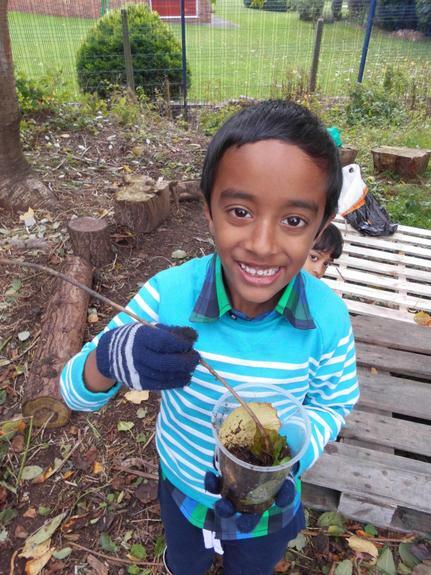 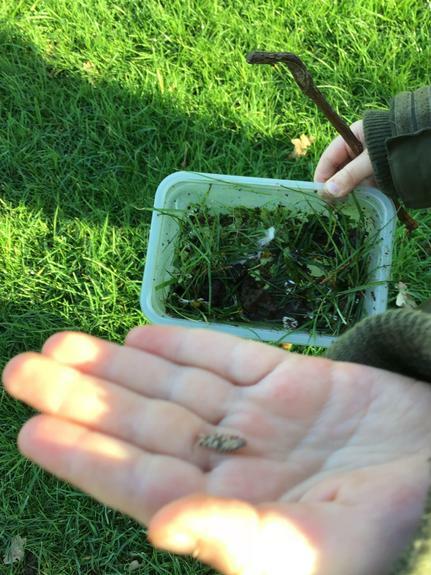 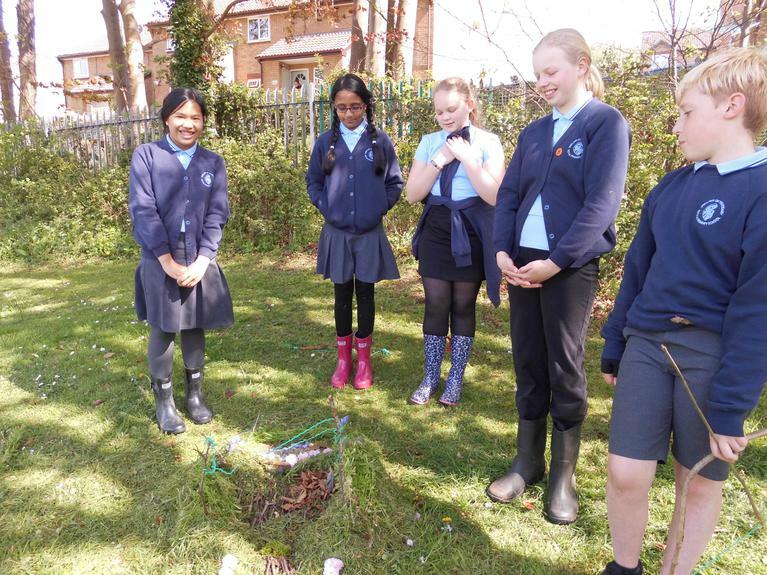 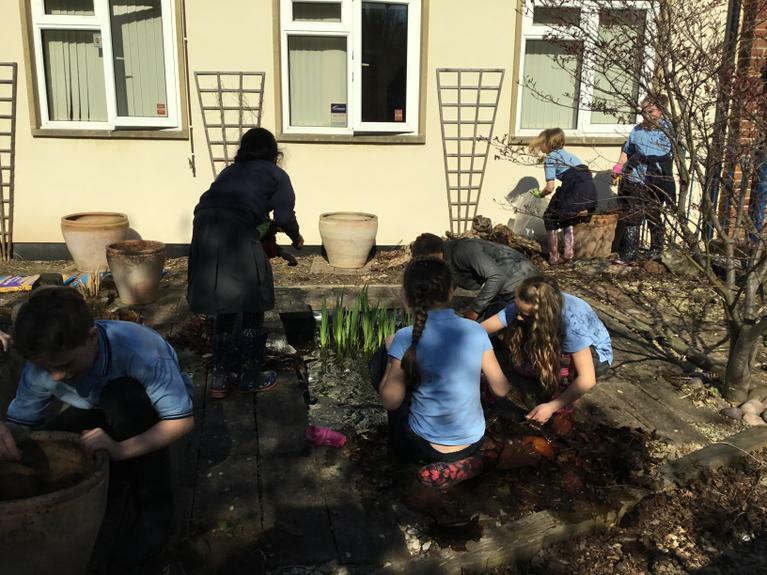 Y5 sort out the pond They found tadpoles and a newt. 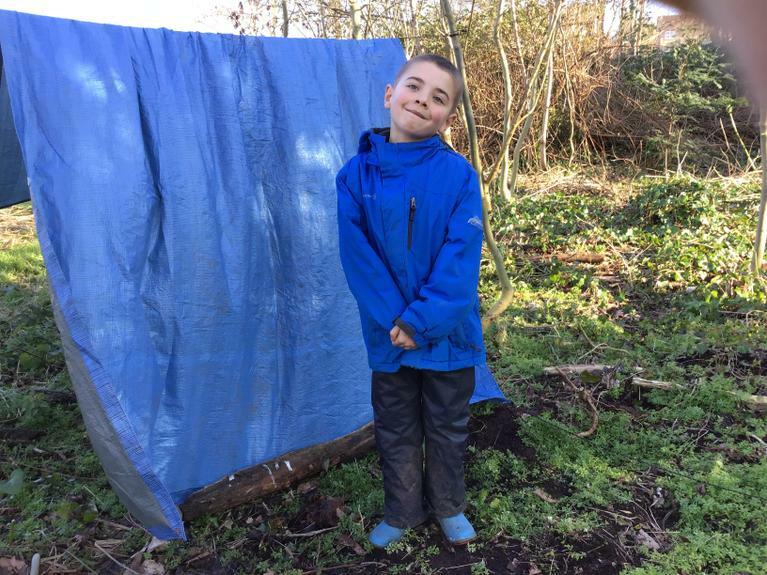 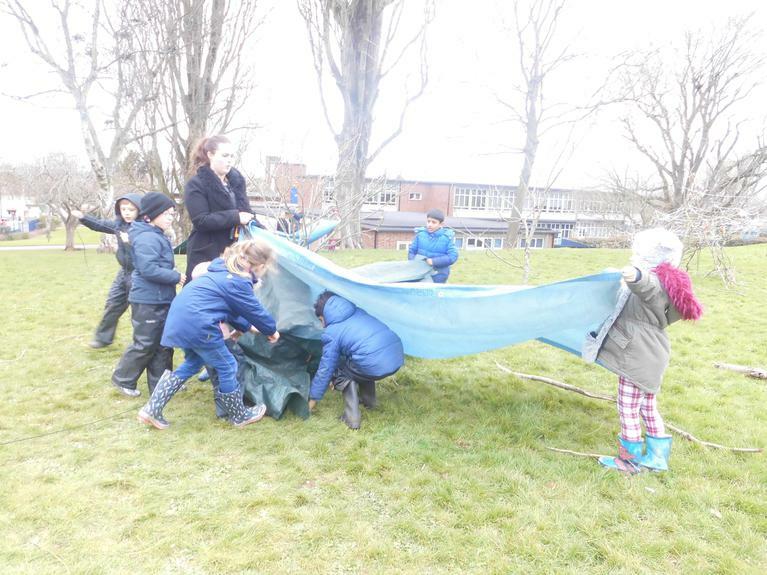 Y5 build dens and whittle. 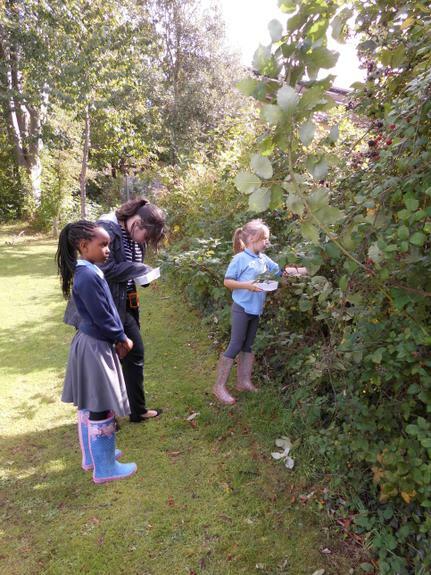 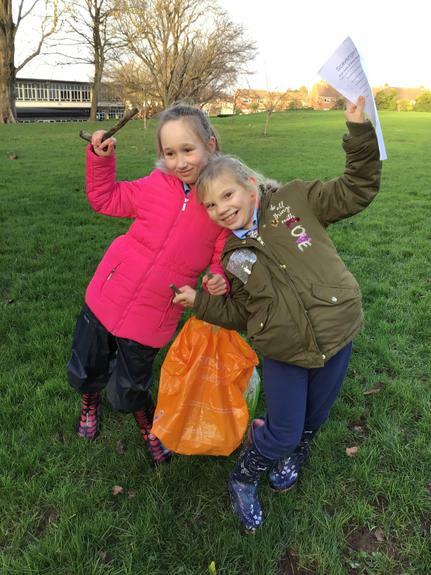 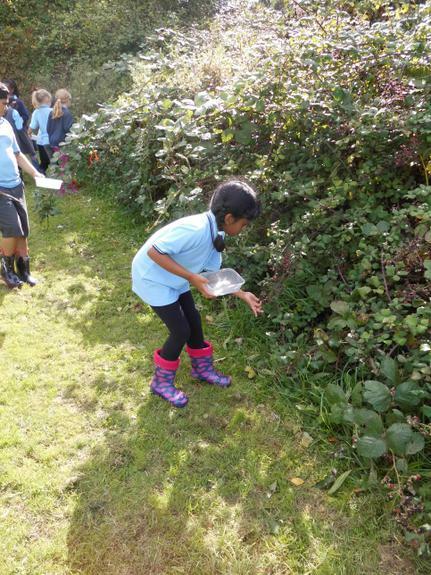 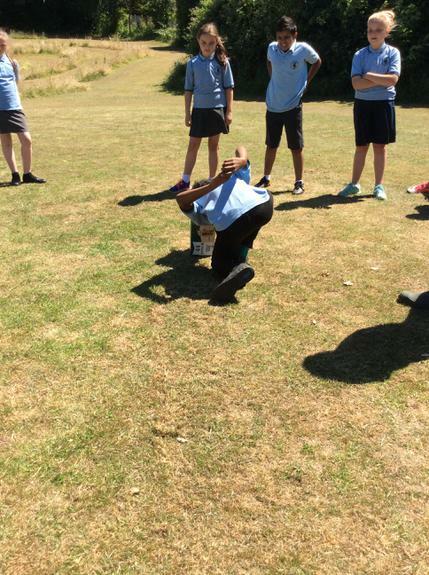 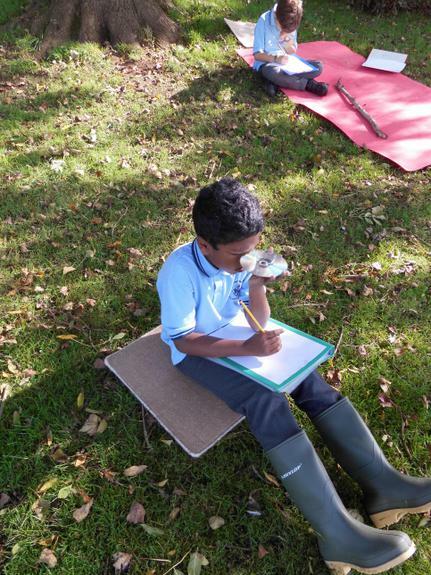 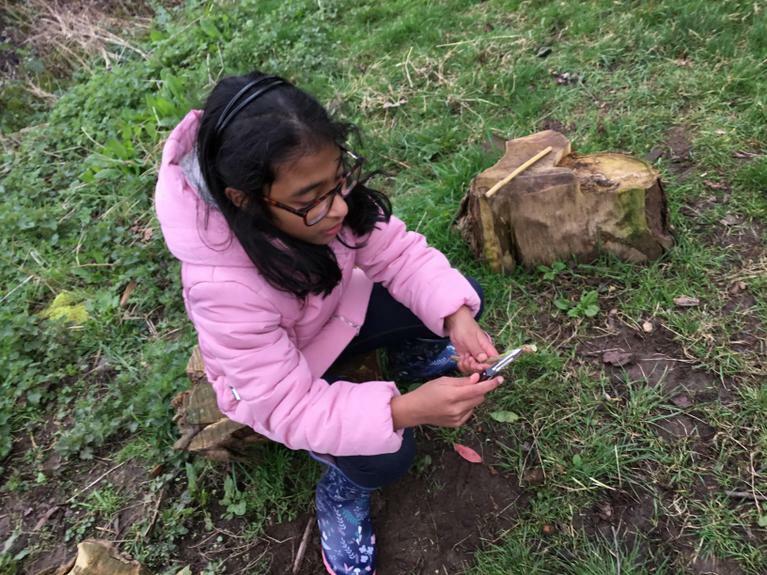 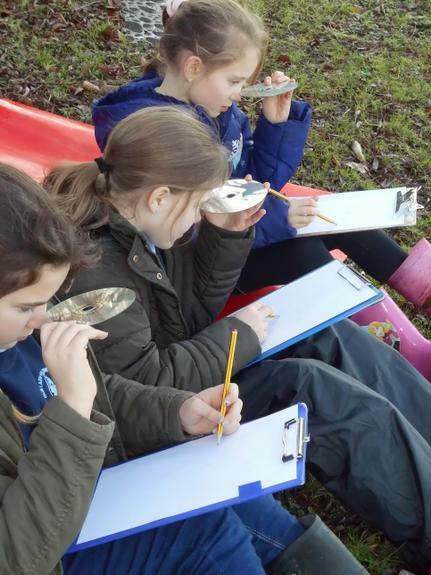 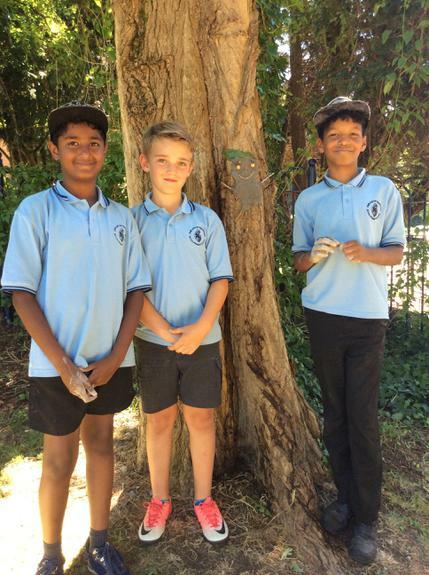 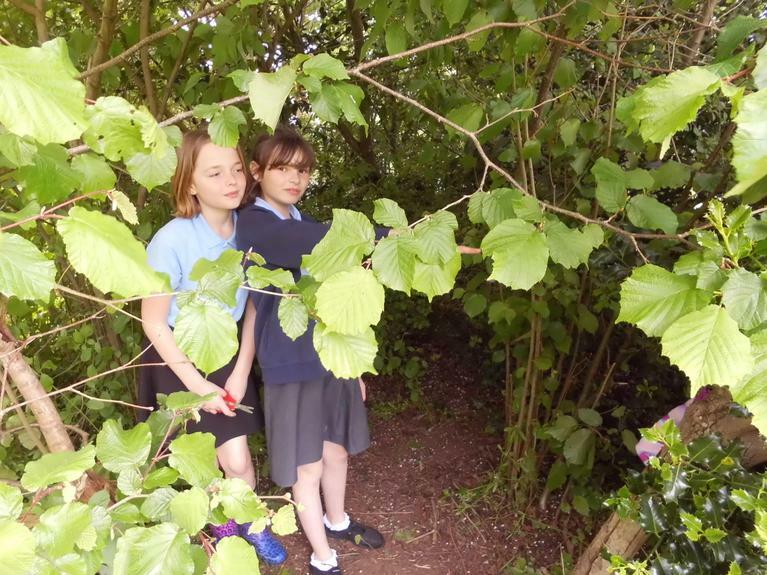 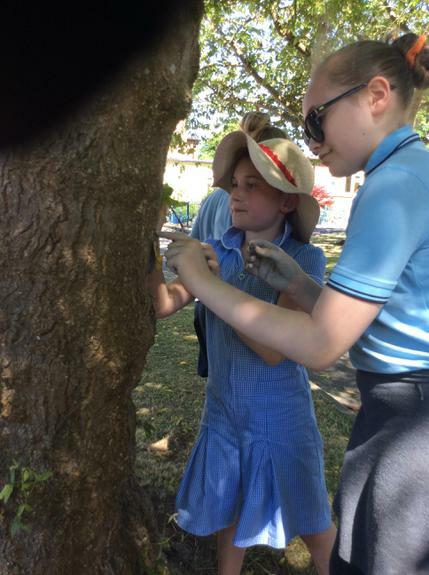 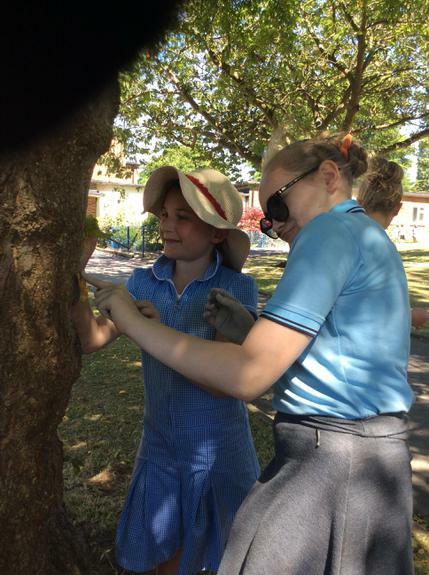 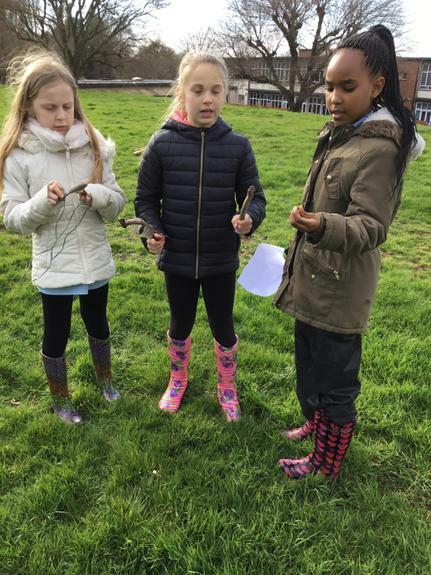 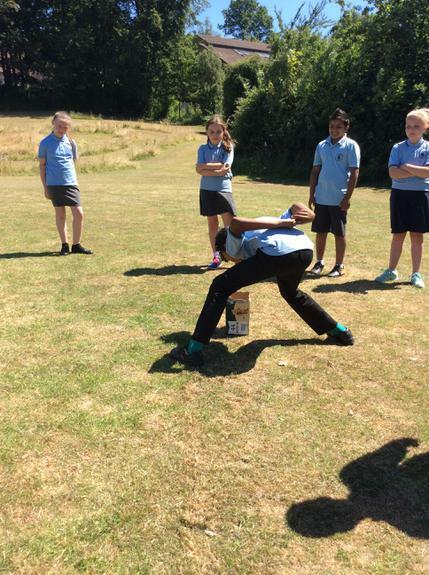 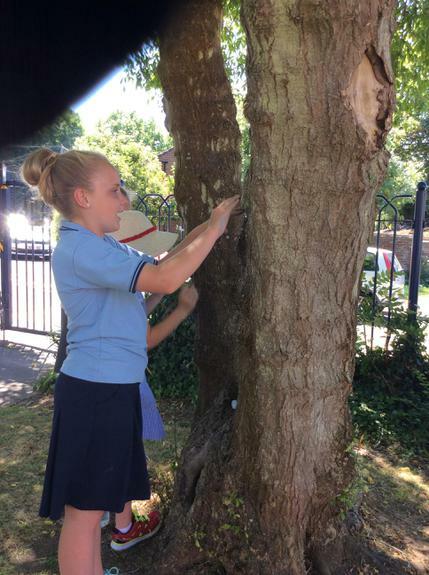 Y5 go on a scavenger hunt and learn to whittle. 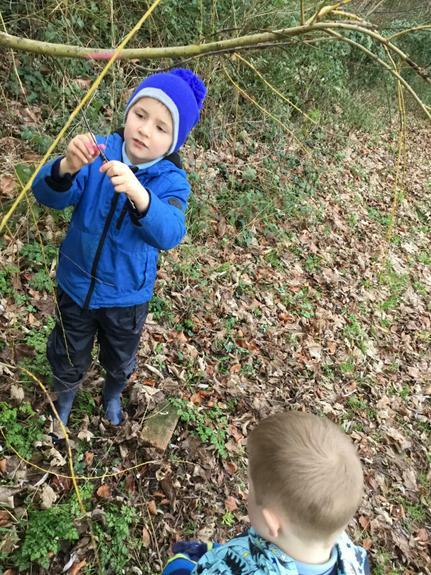 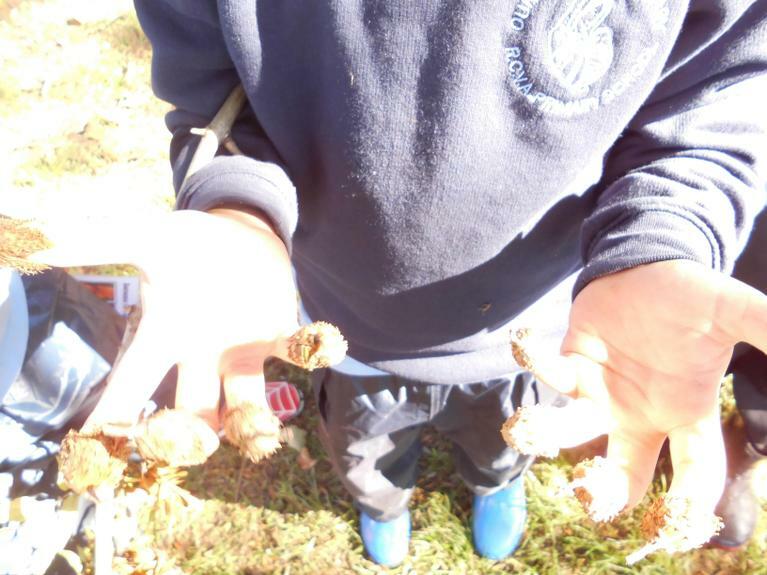 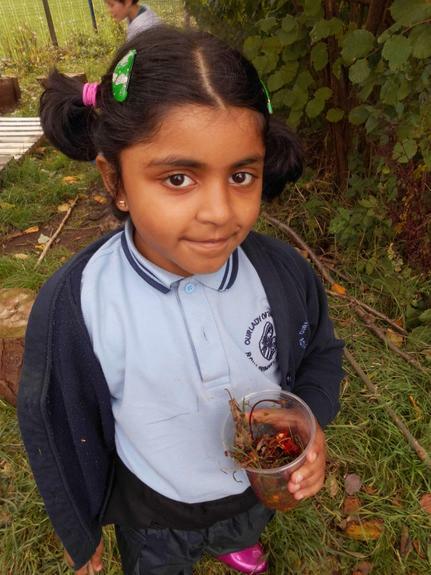 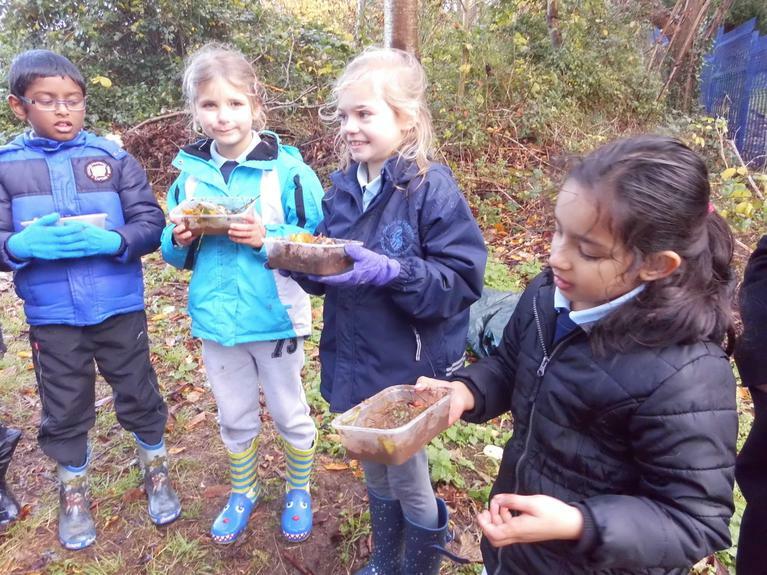 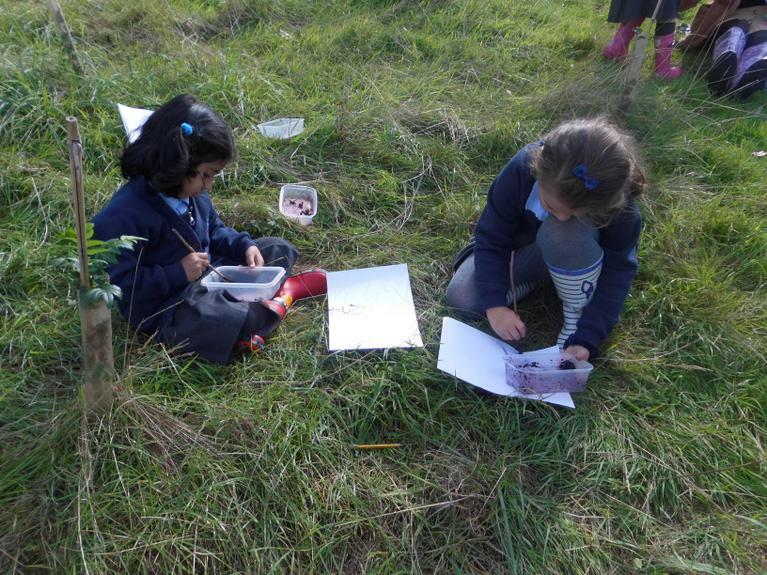 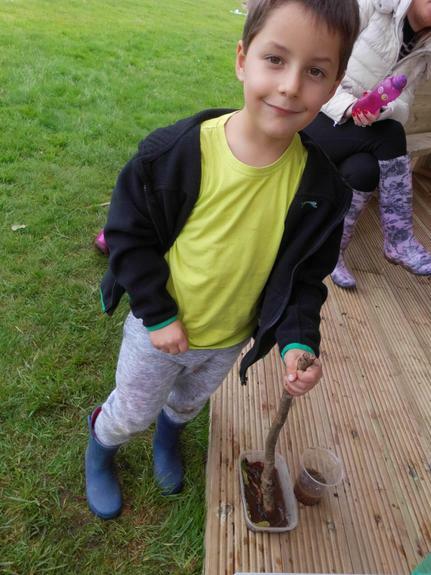 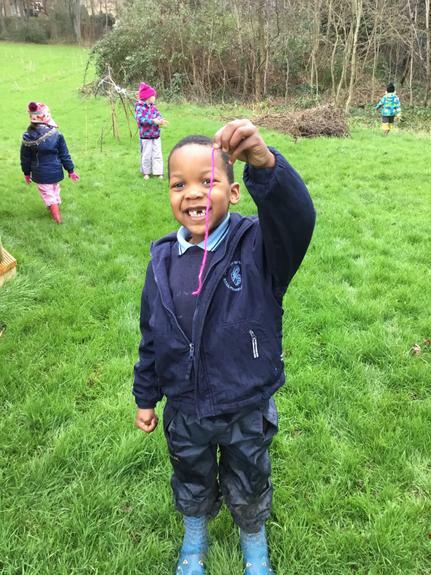 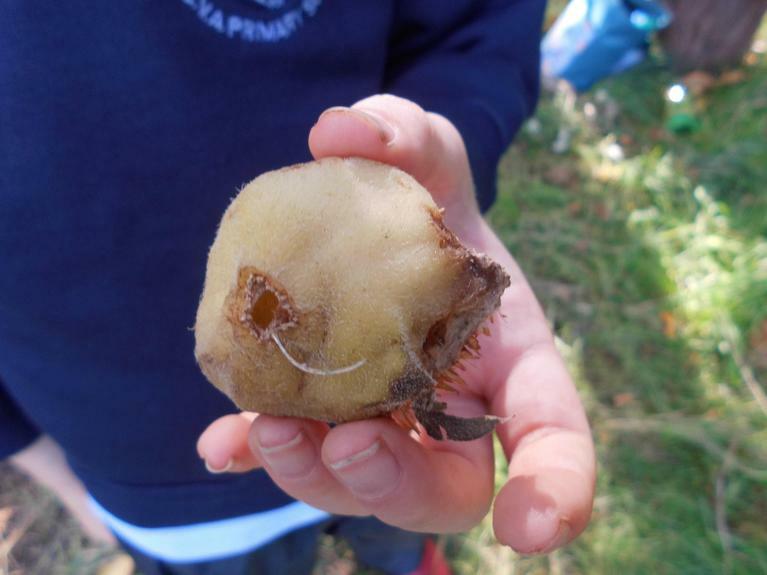 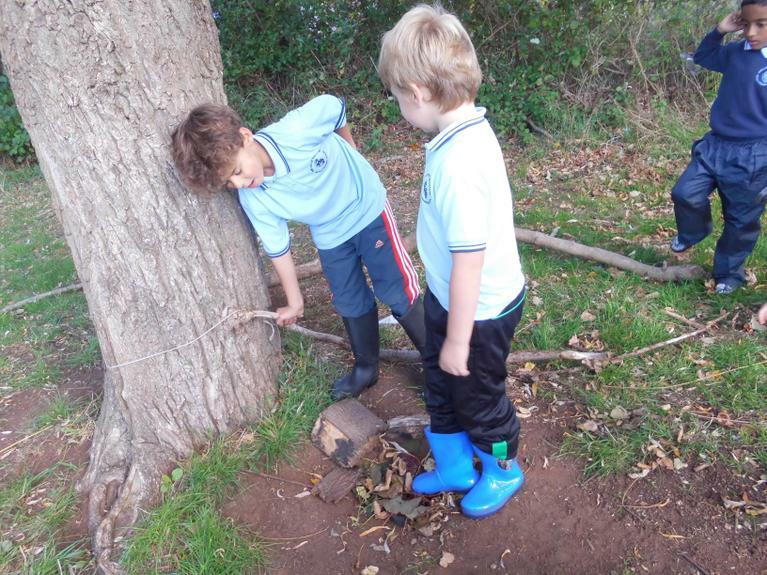 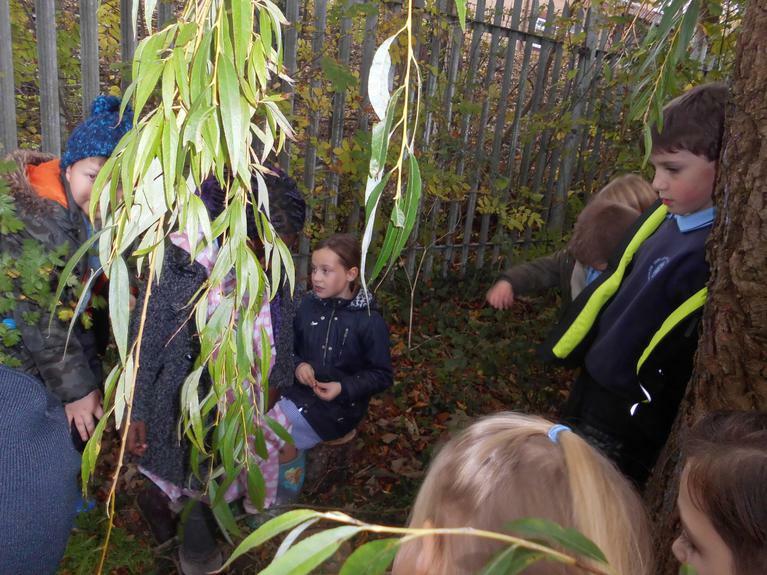 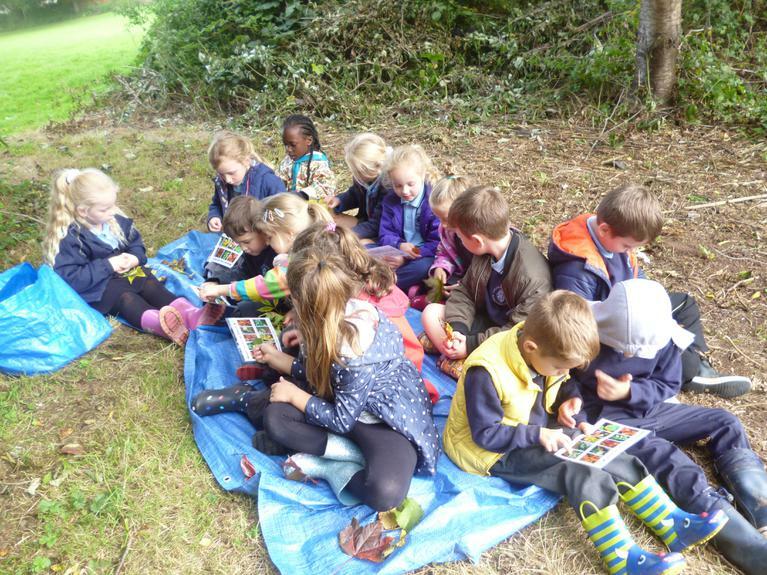 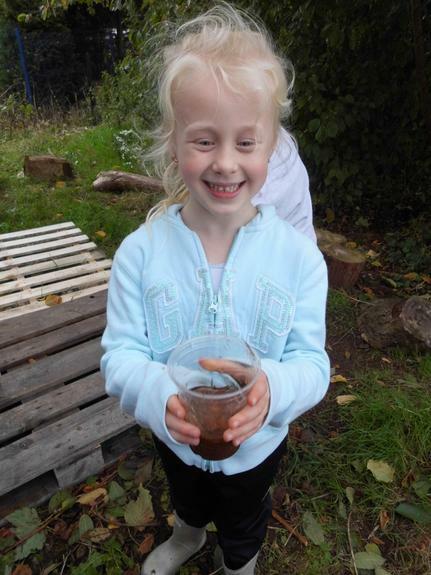 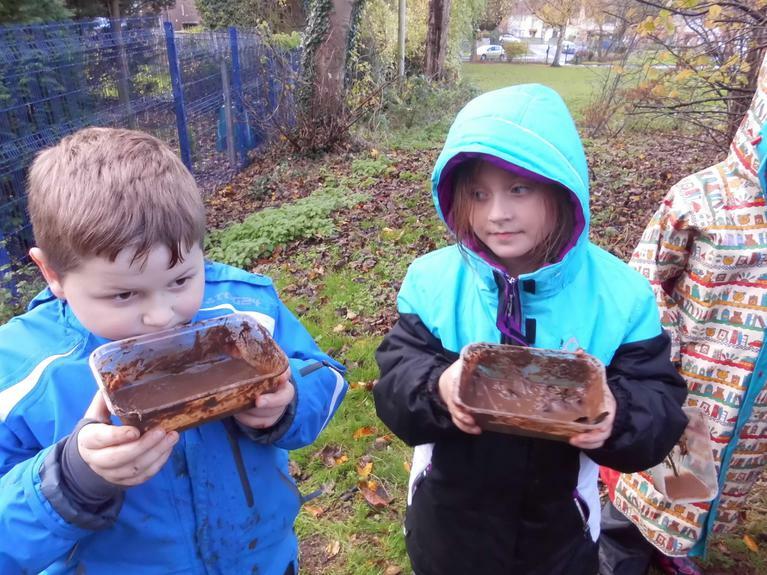 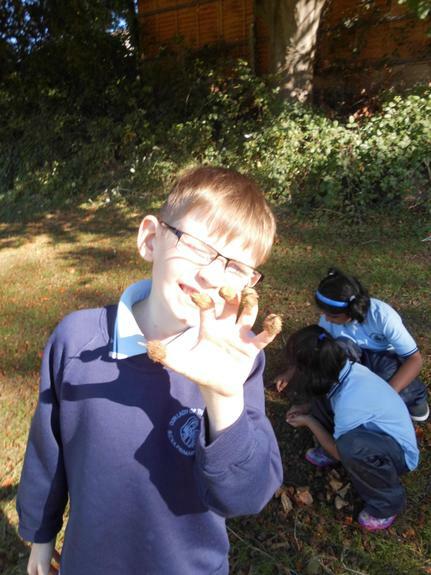 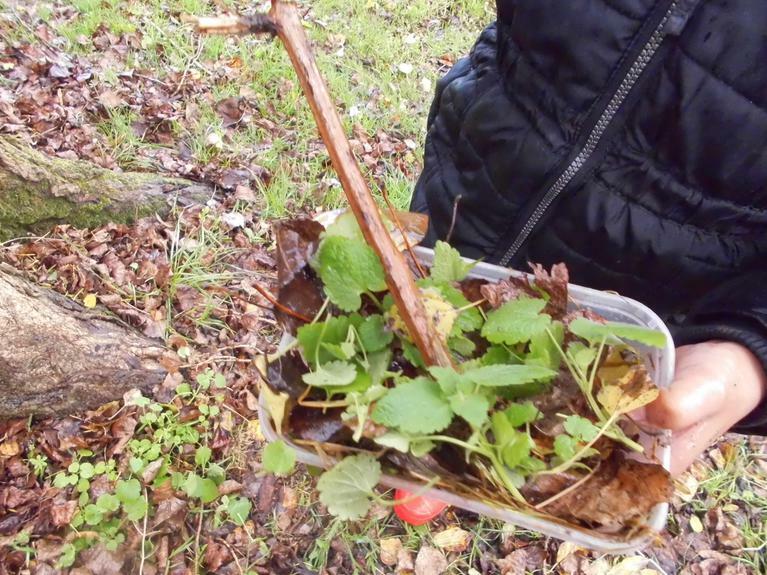 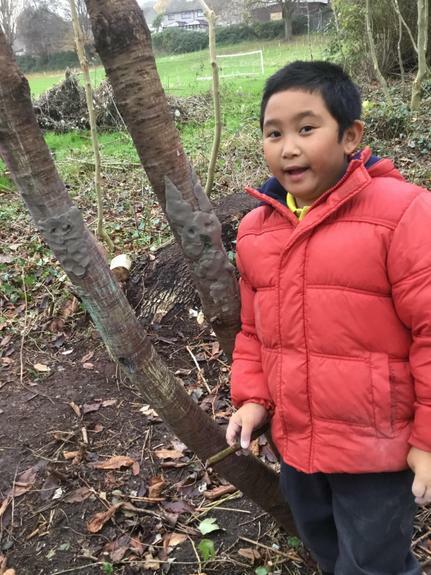 Y2 explore all sorts of Forest School Activities. 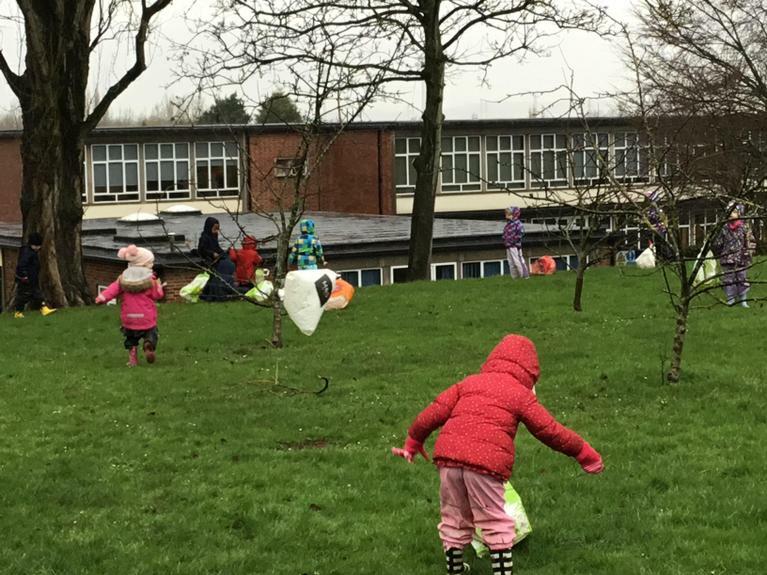 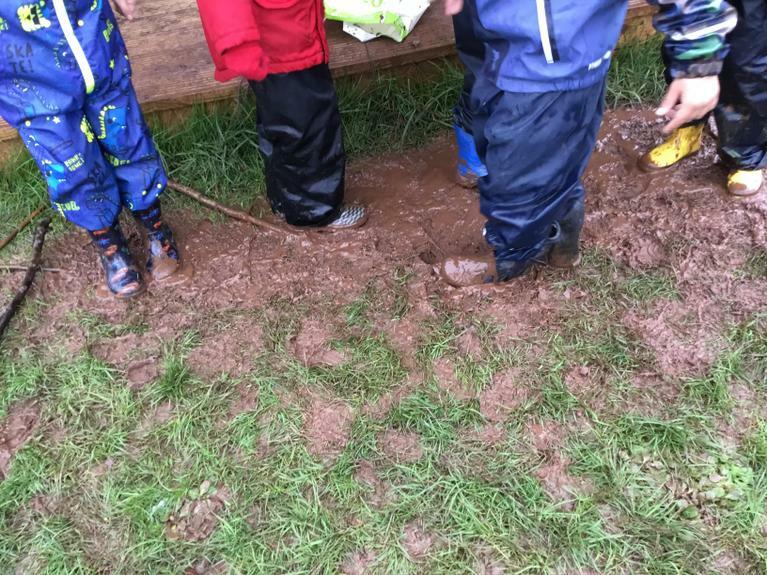 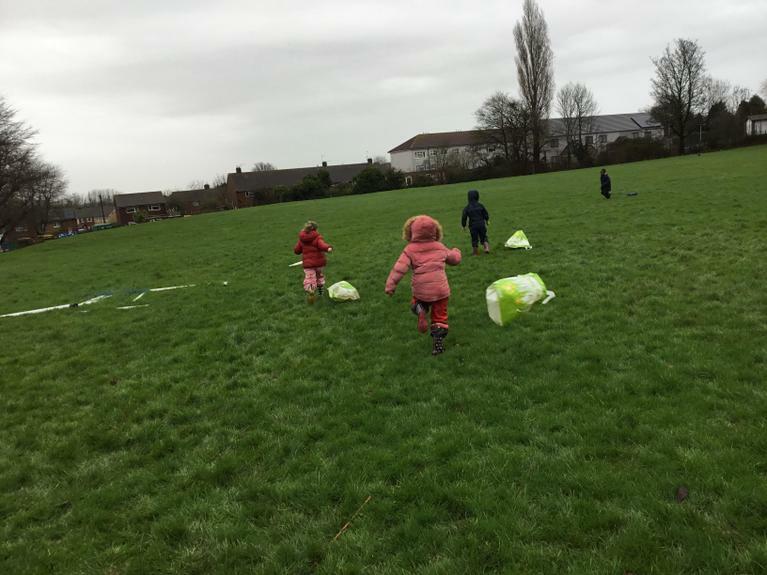 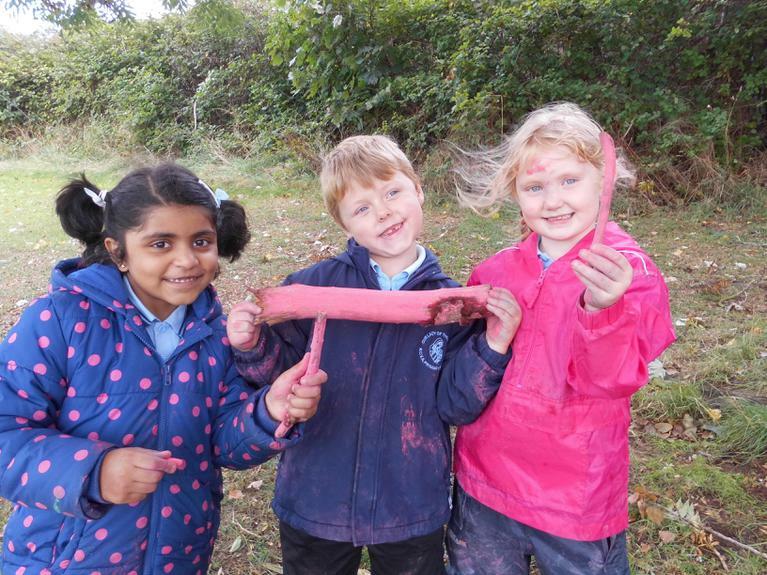 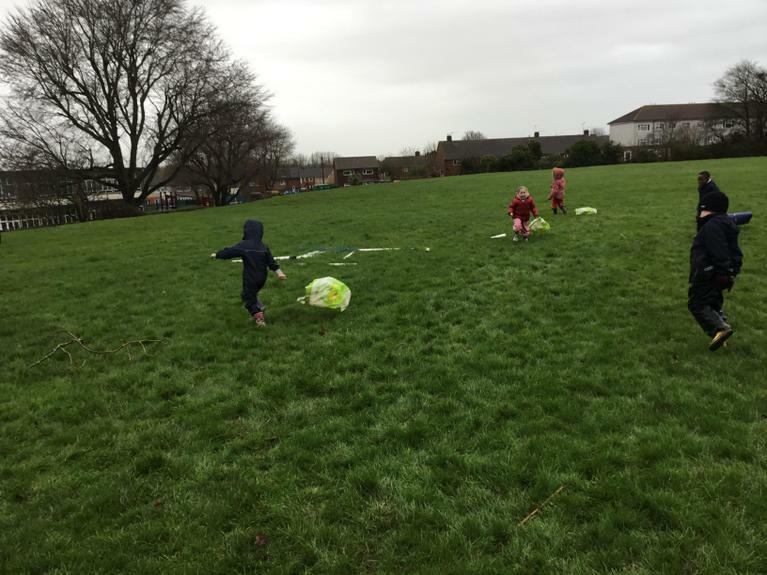 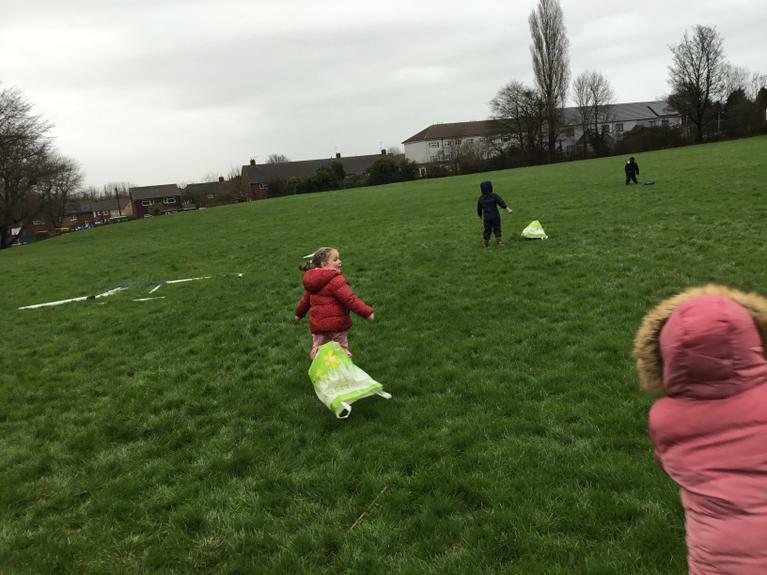 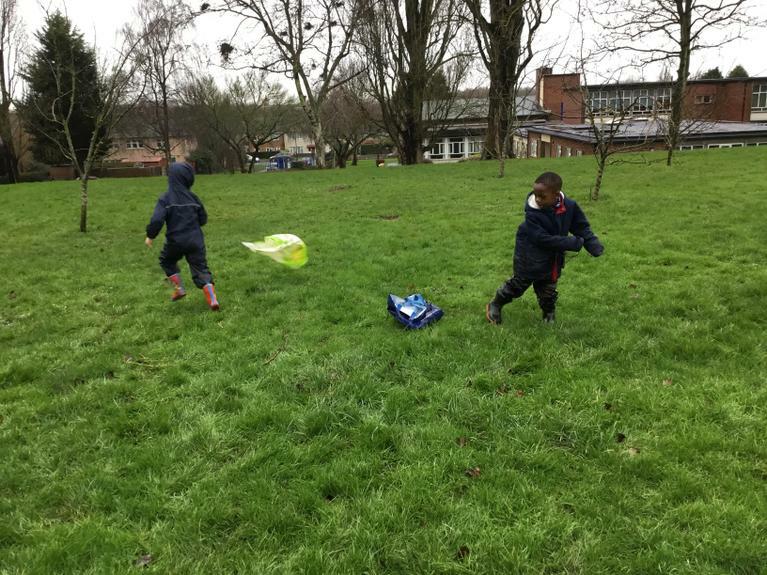 Reception make bag kites and enjoy the mud! 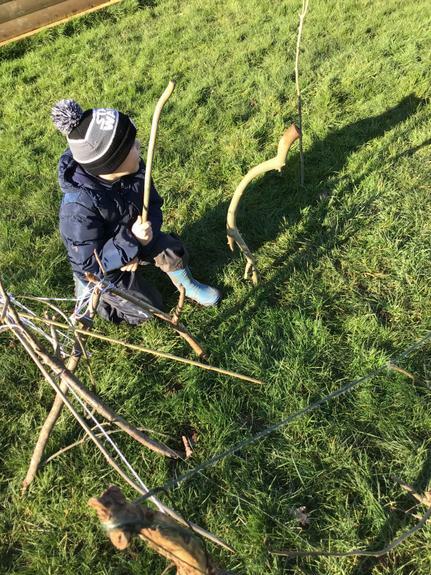 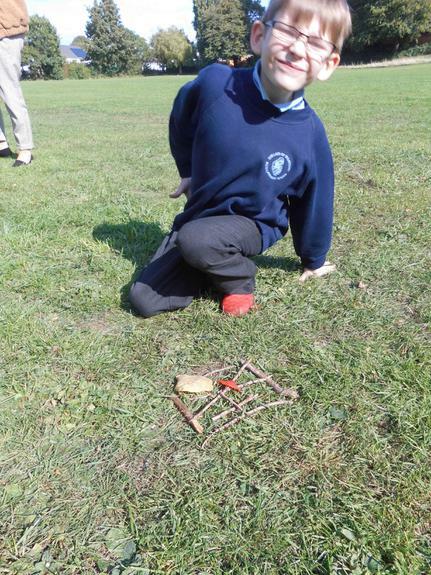 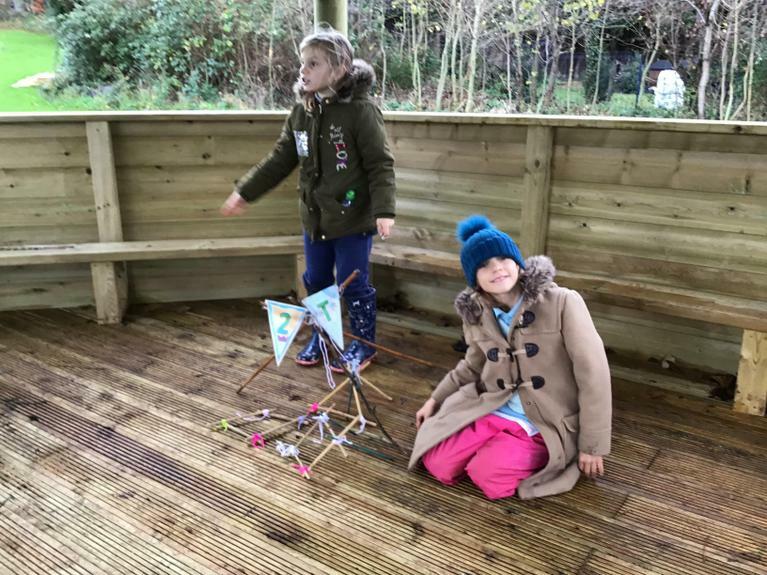 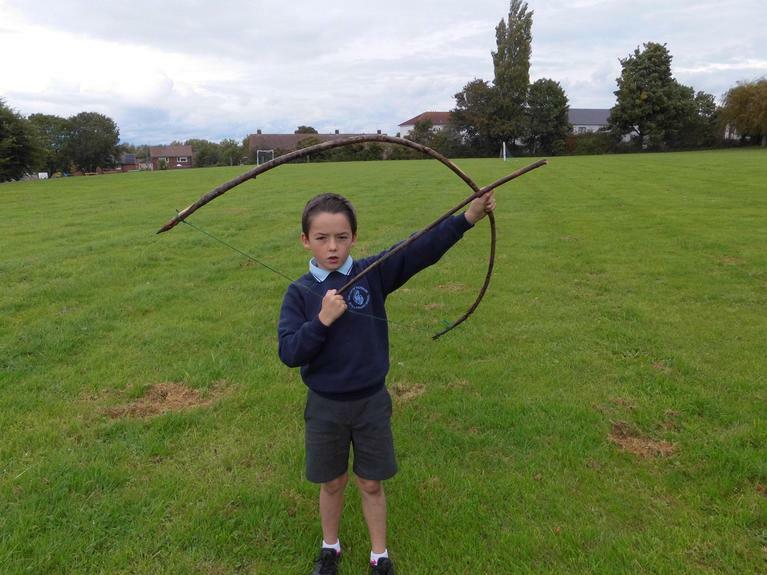 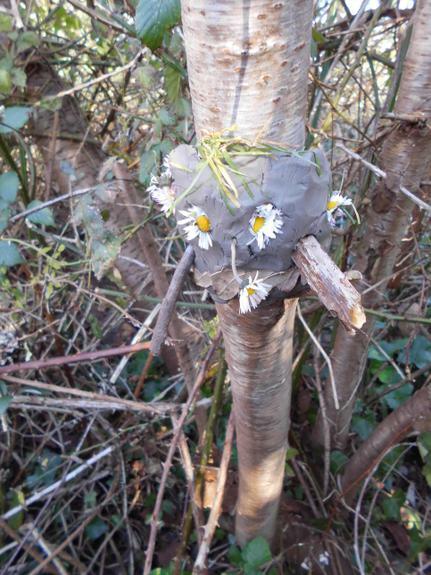 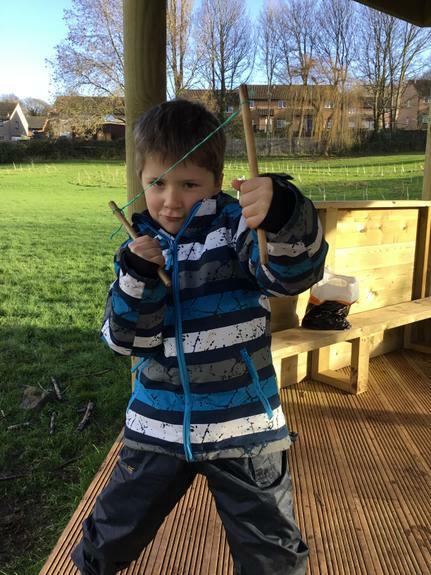 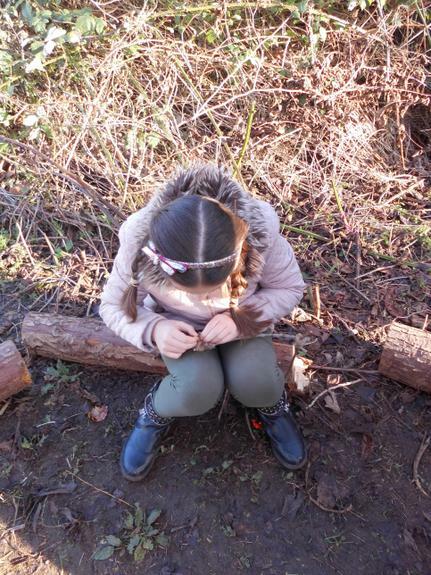 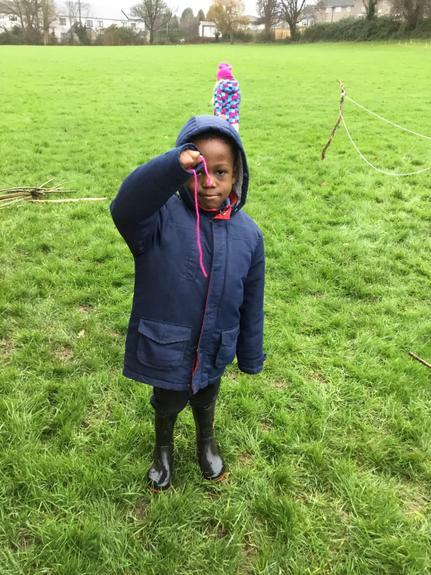 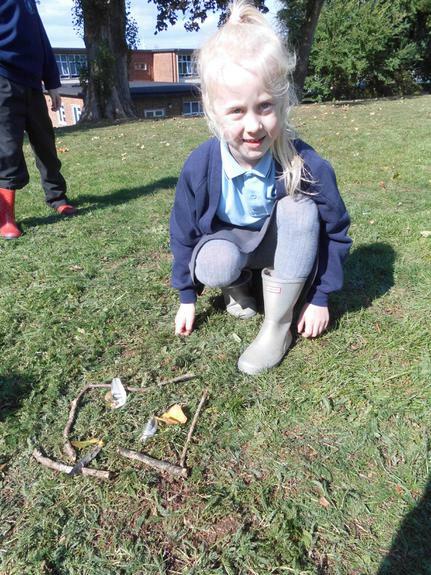 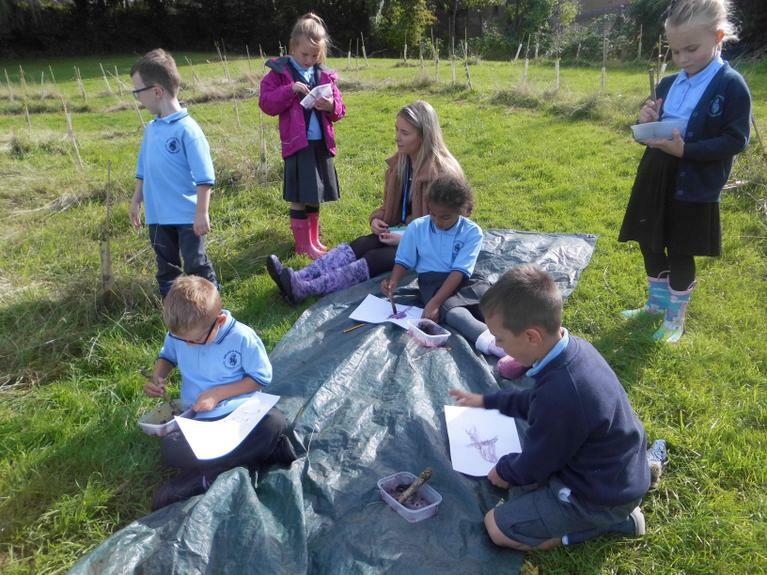 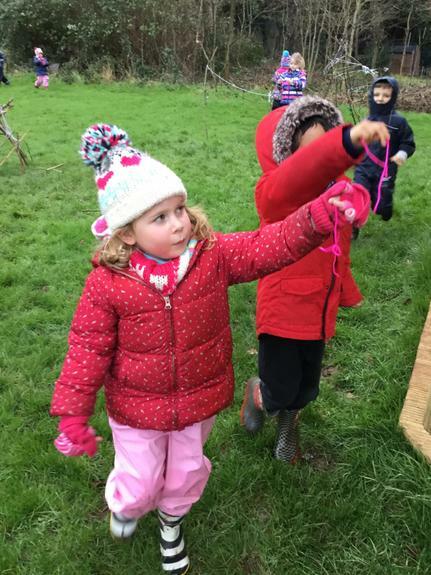 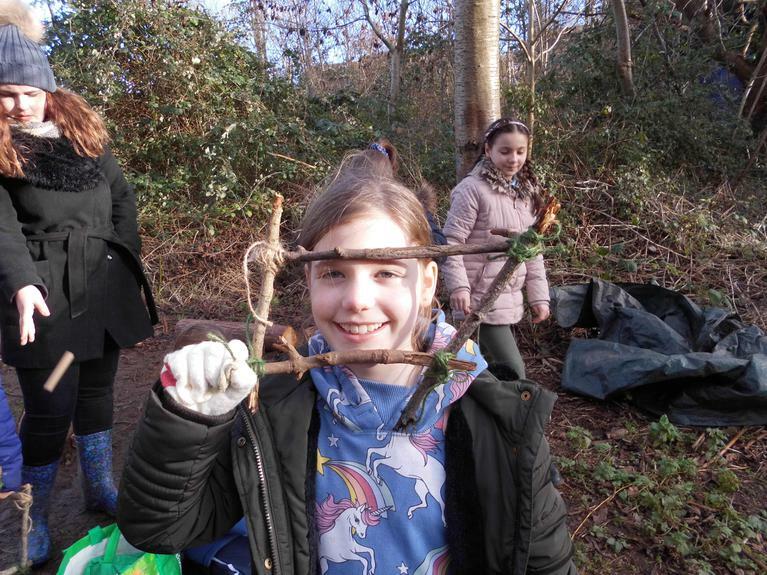 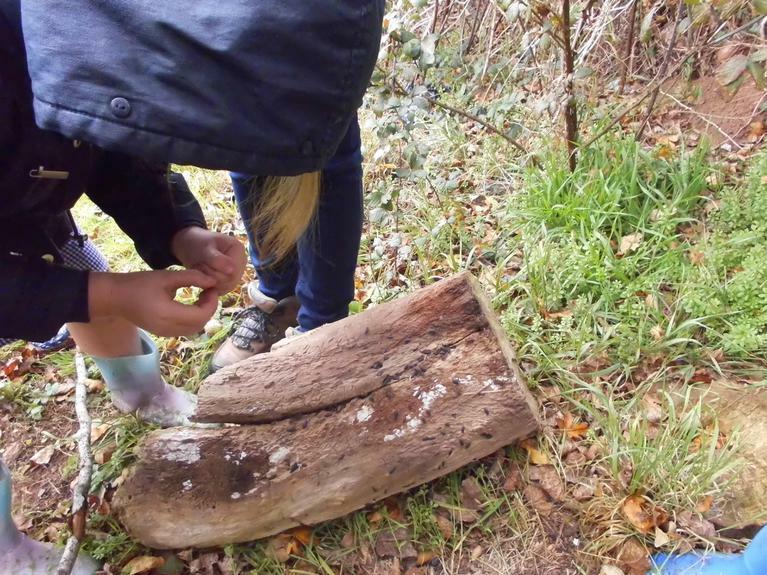 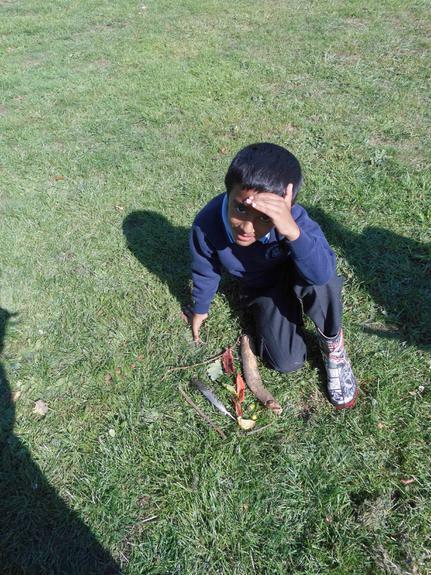 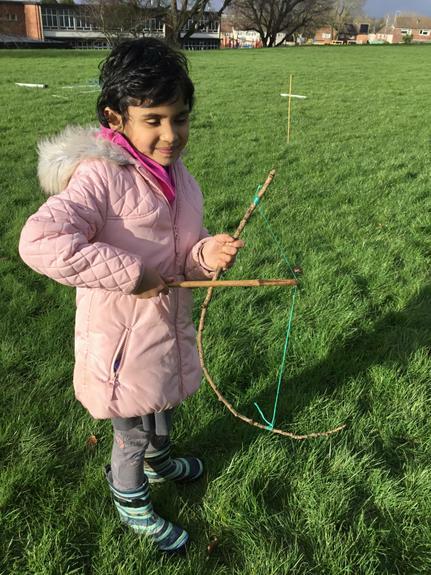 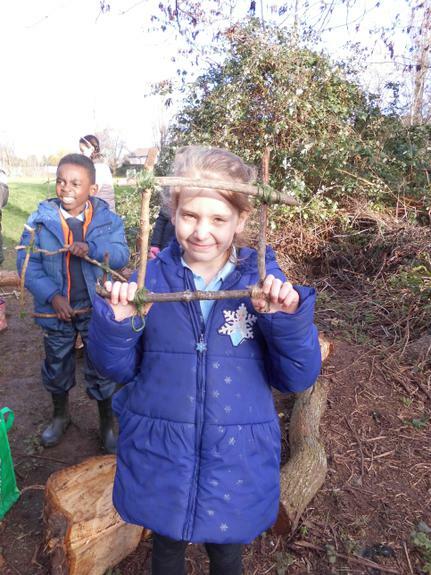 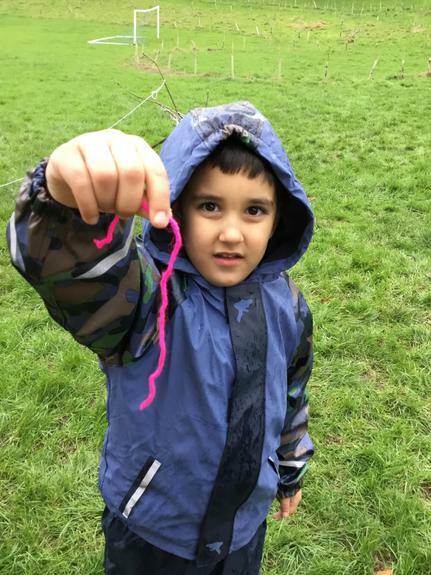 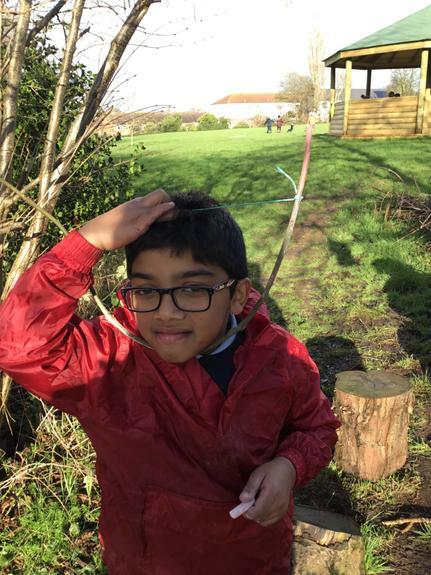 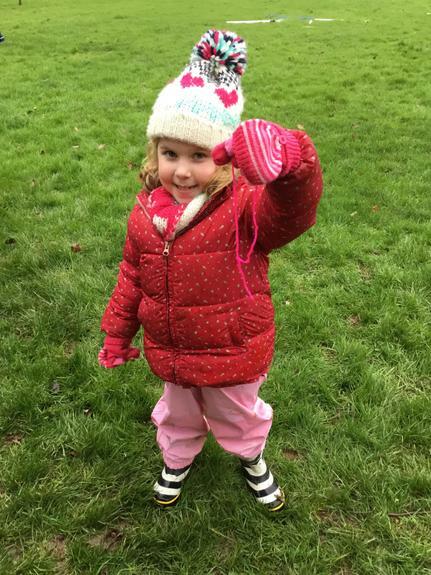 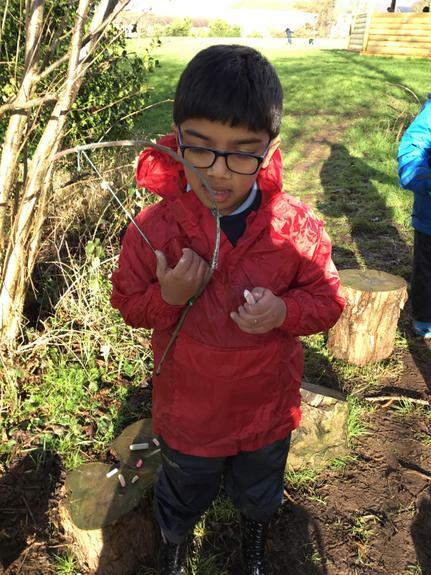 Y2 make bows an arrows and explore the wildlife . 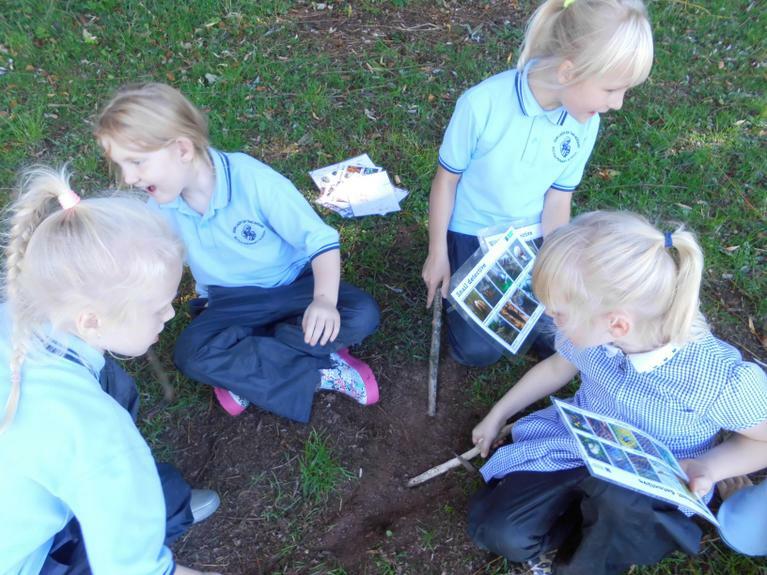 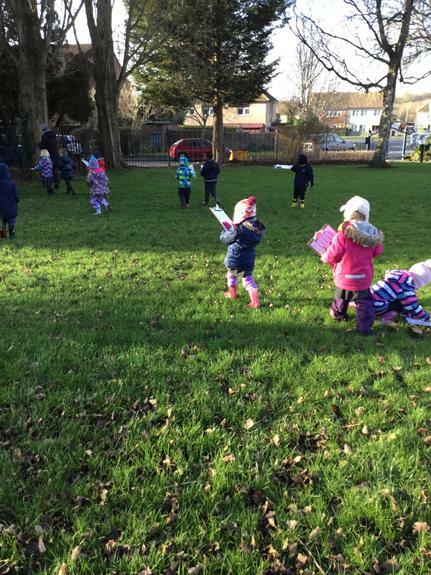 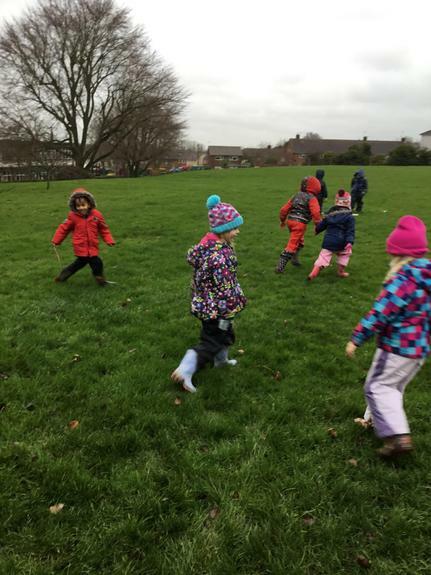 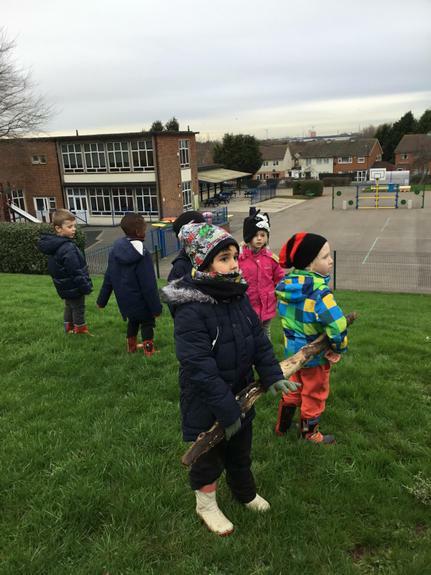 Reception go on a bear hunt and then on a worm hunt! 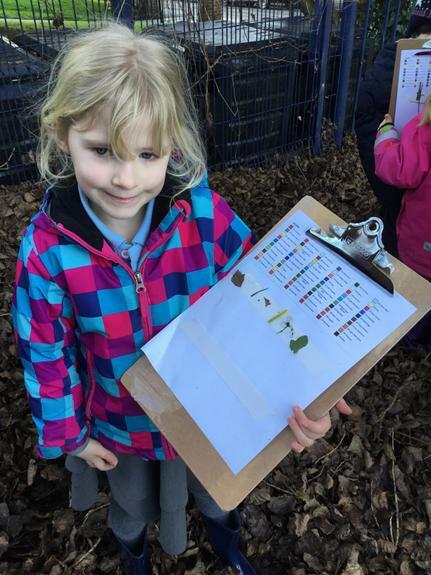 Reception go on a colour hunt. 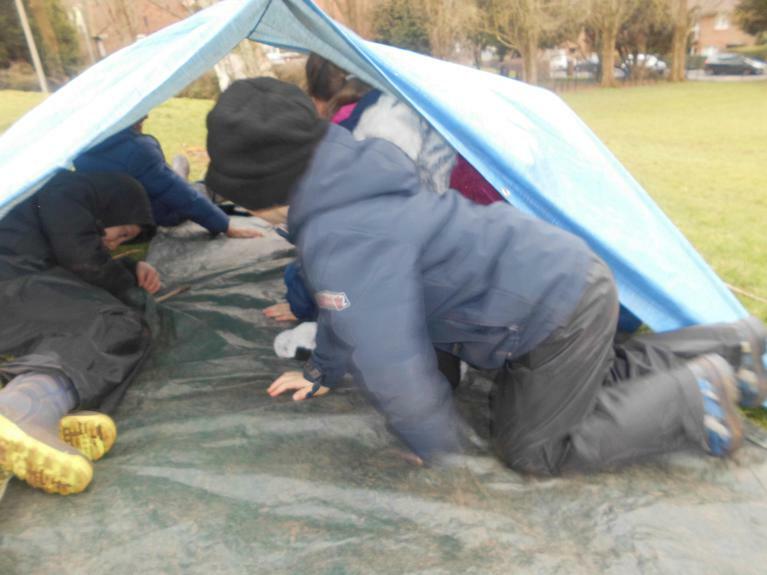 Y5 showed great resilience in the rain! 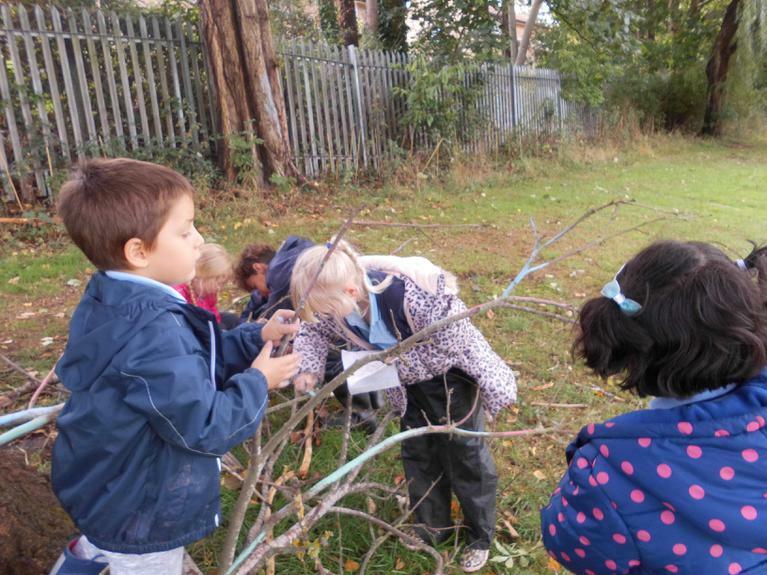 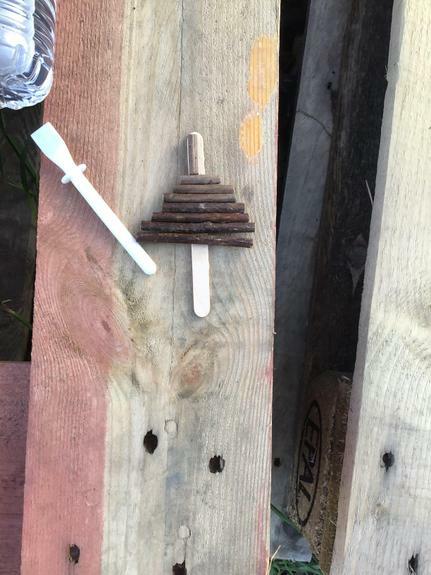 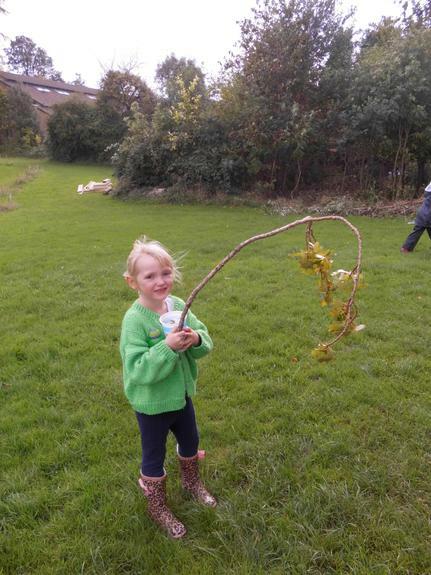 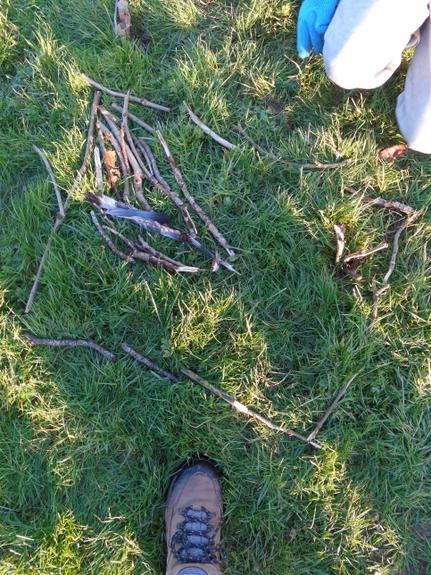 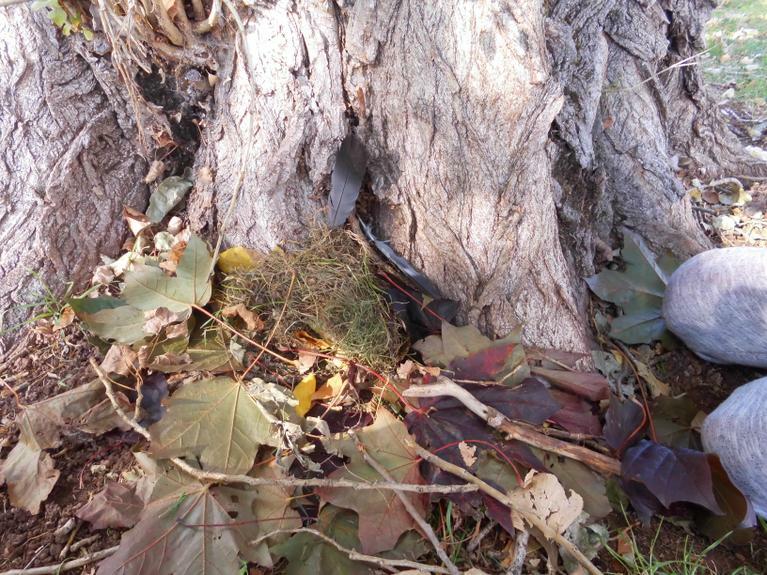 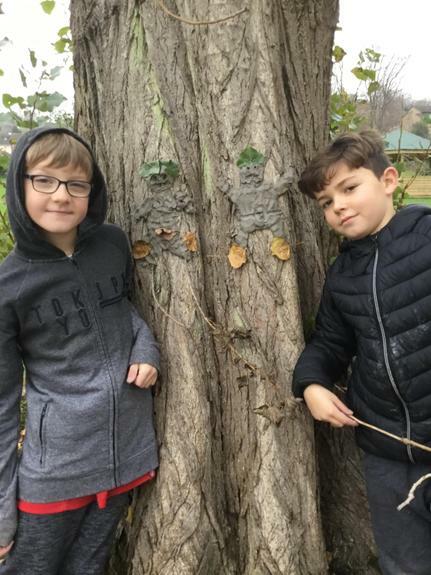 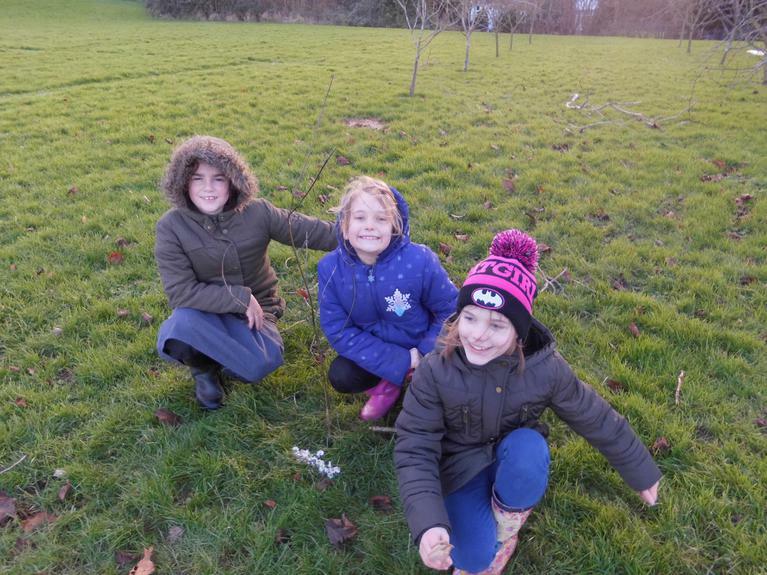 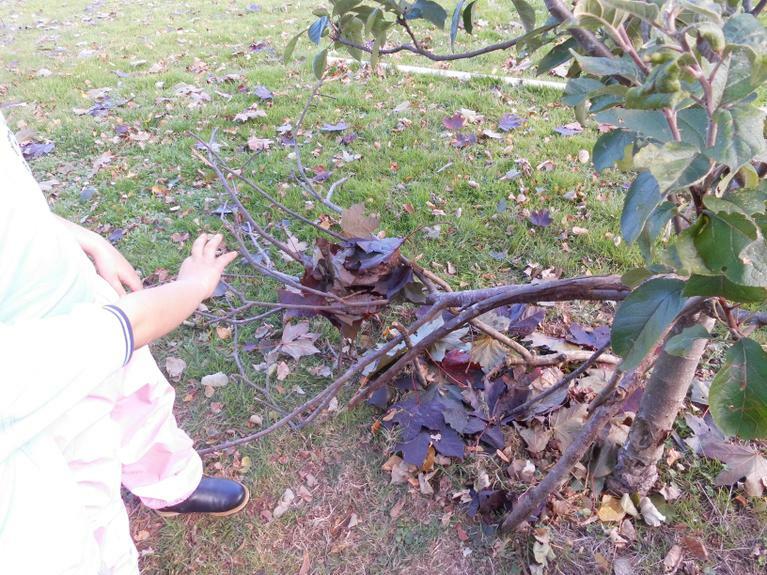 We made trees from twigs and went on a scavenger hunt. 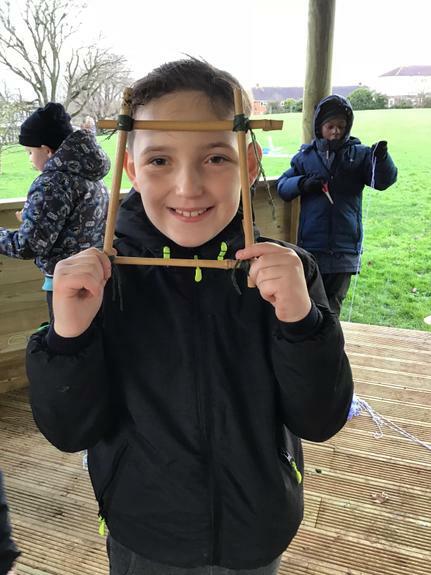 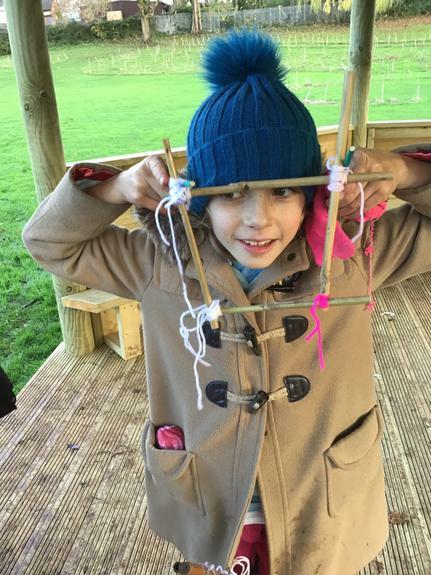 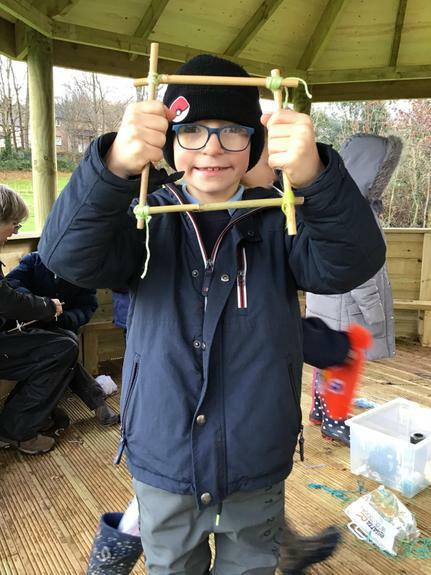 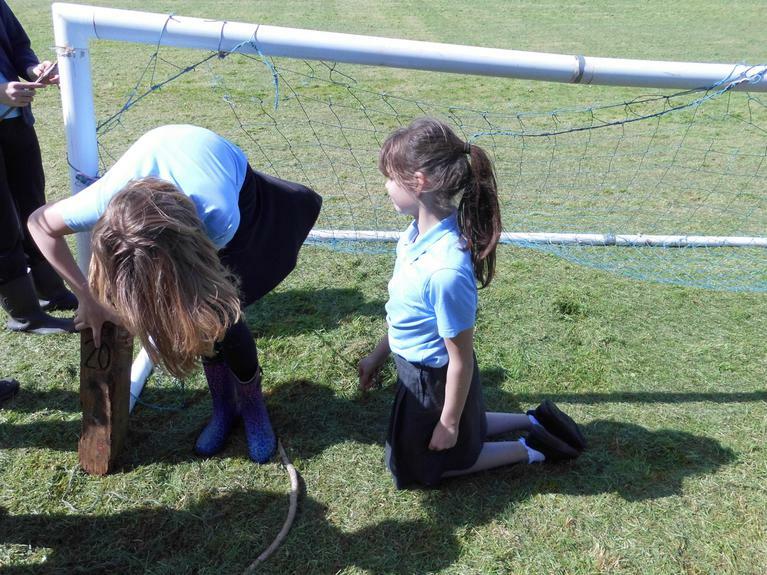 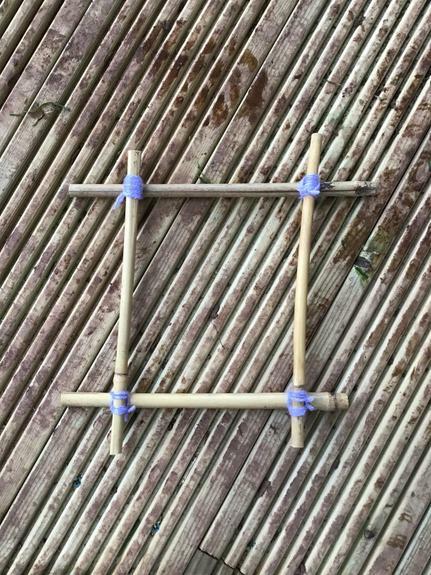 Y4 used lashing and knots to make a frame. 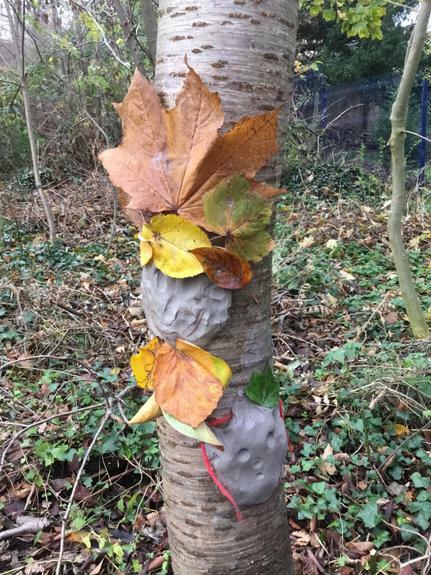 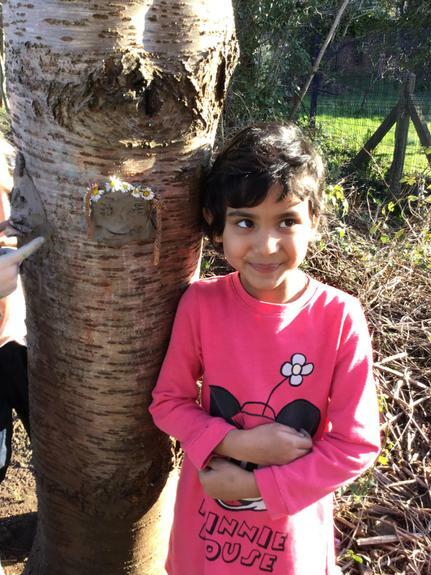 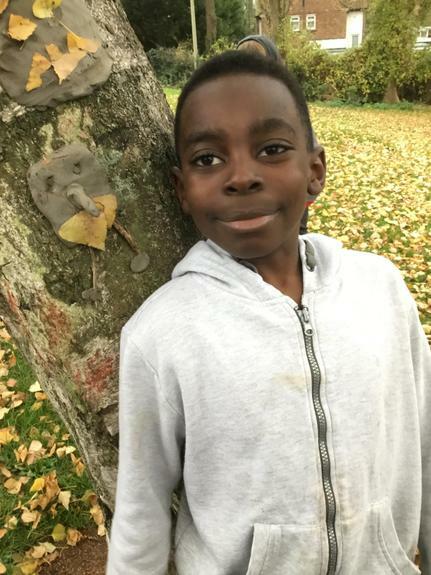 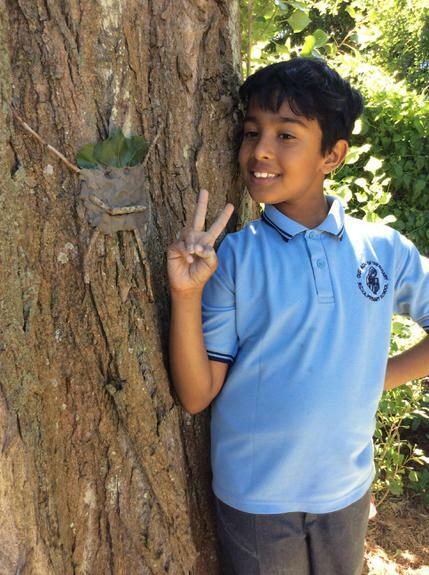 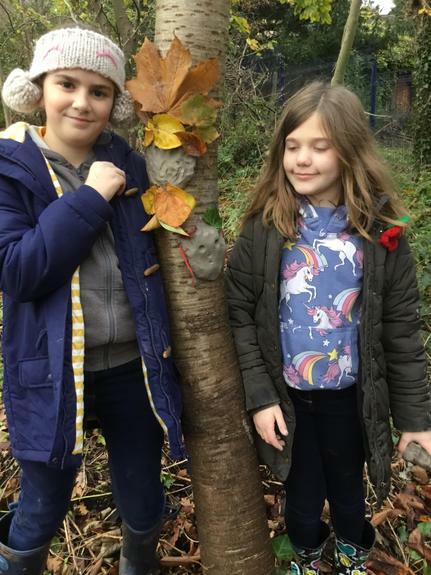 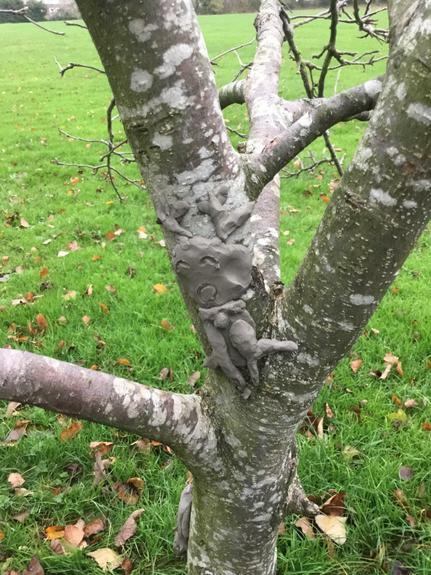 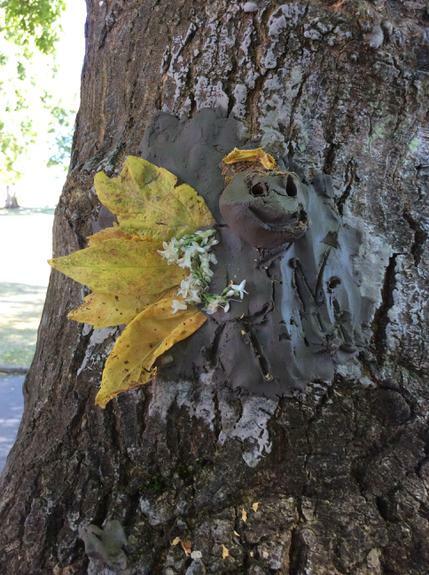 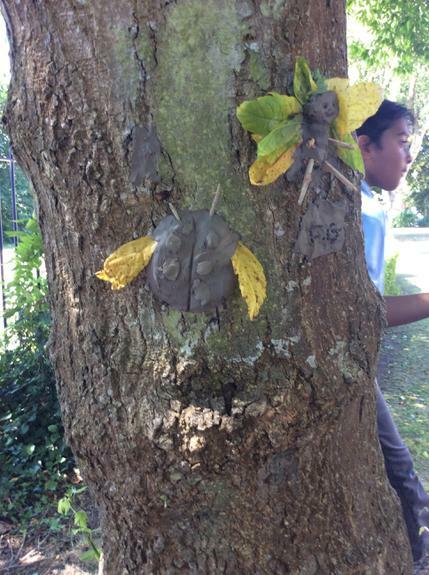 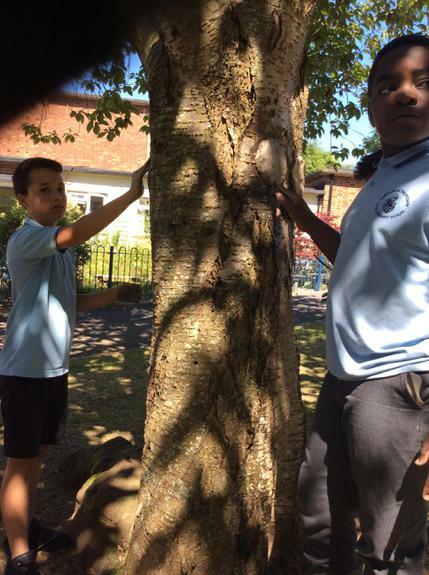 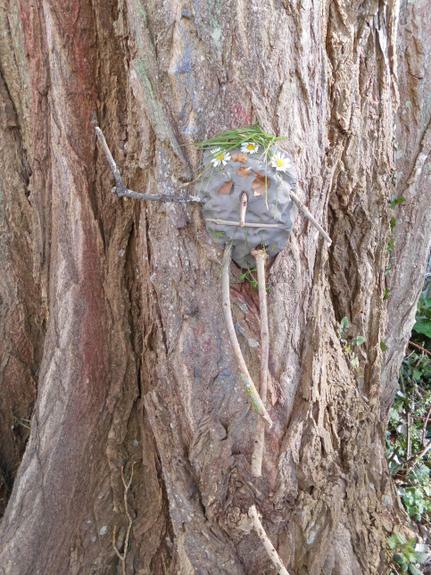 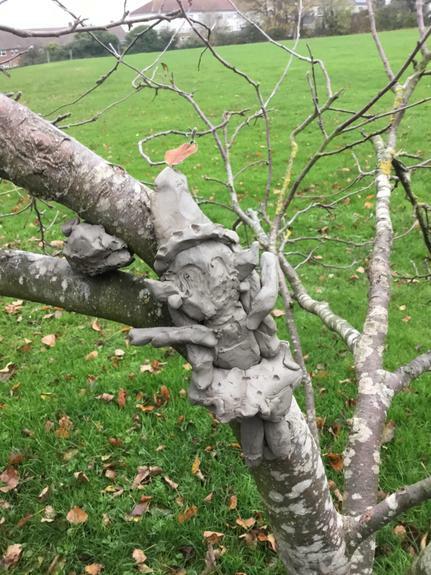 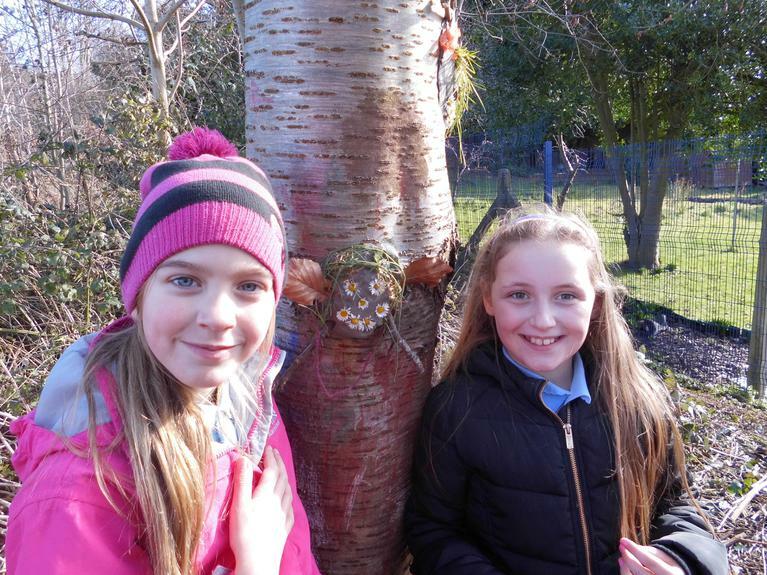 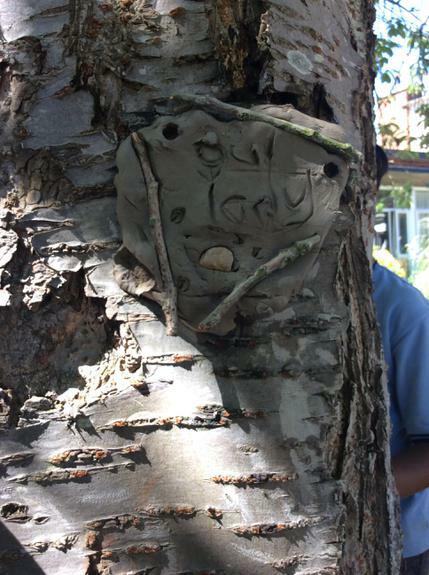 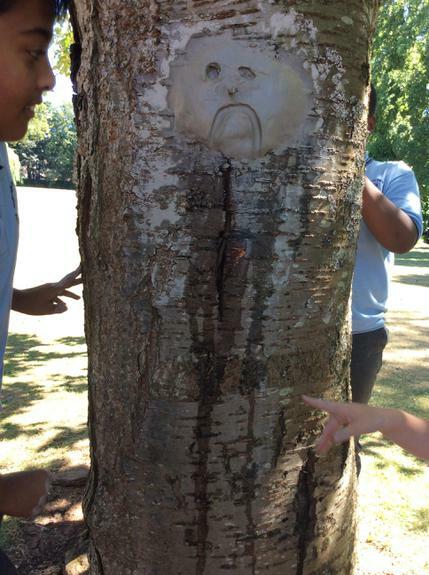 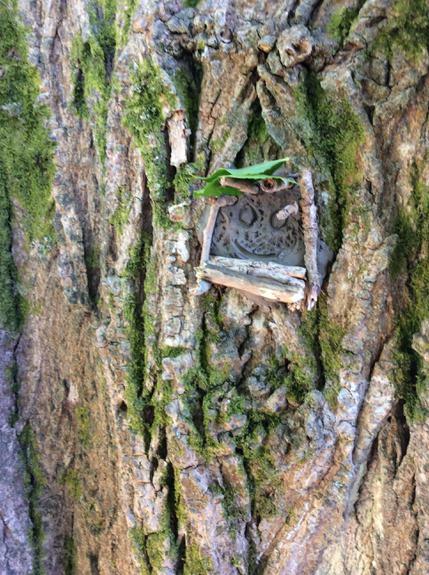 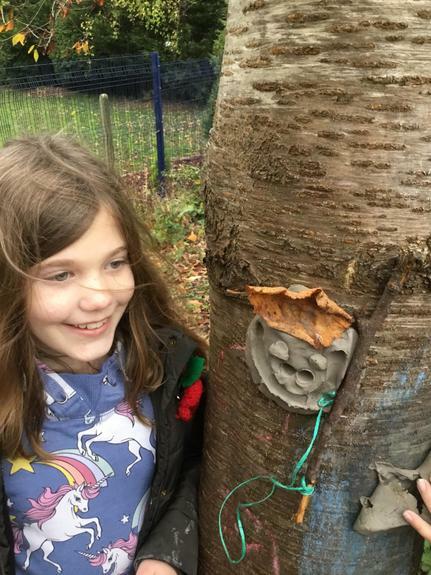 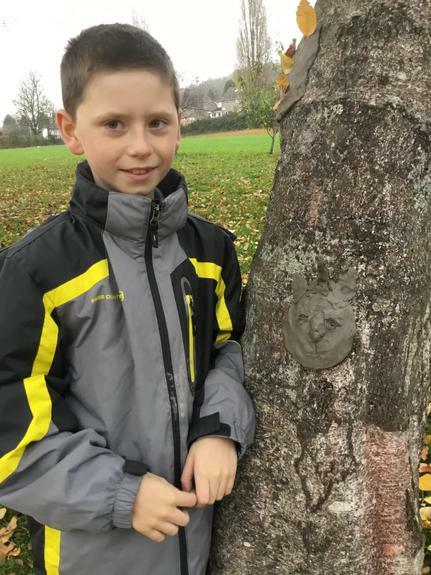 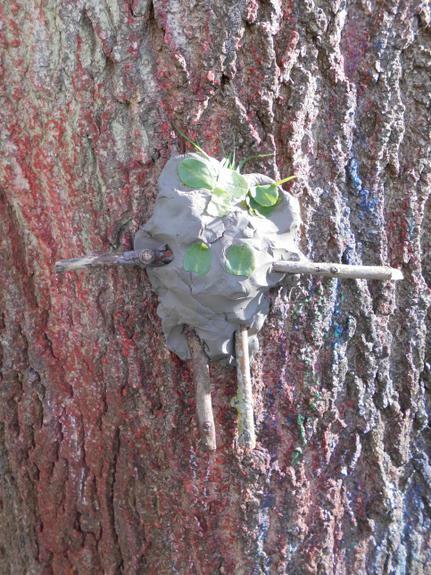 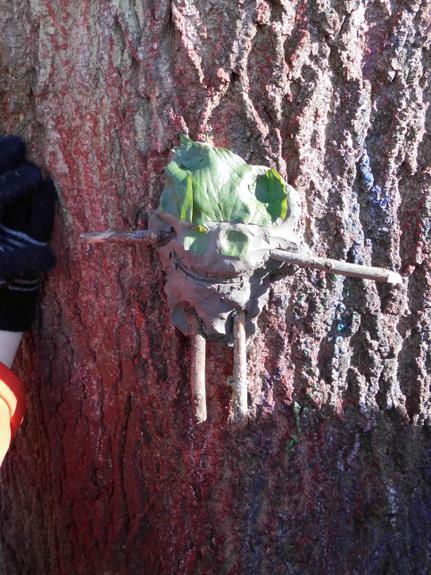 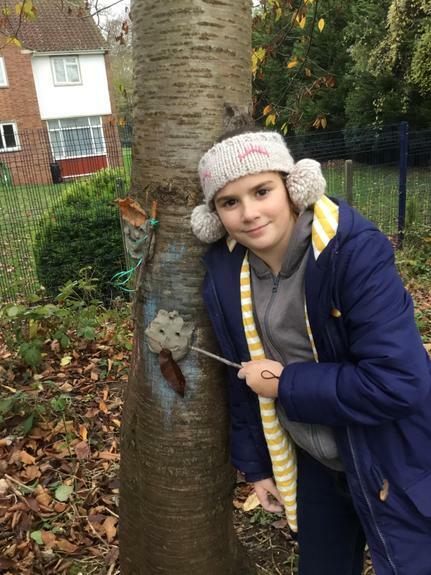 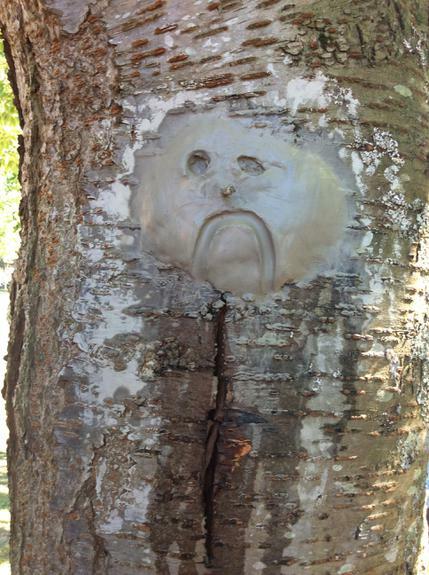 Y5 made fantastic clay people and creatures on the trunks of trees. 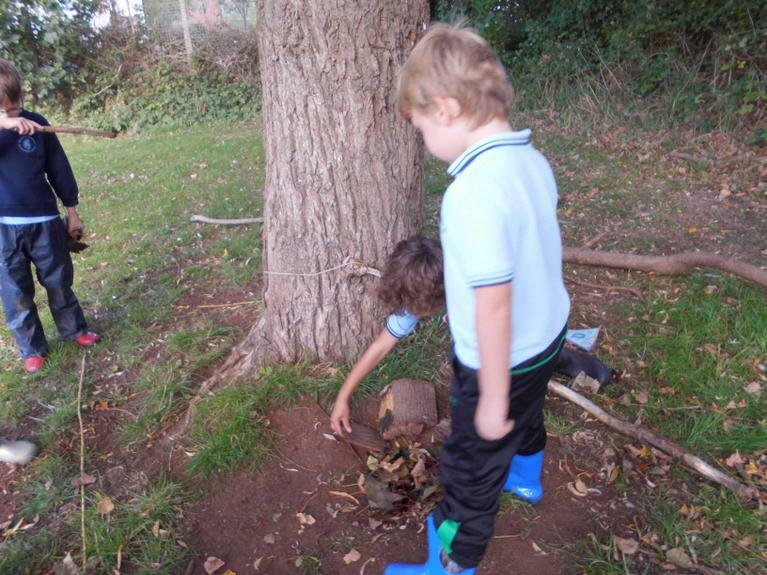 Making a home for a hedgehog. 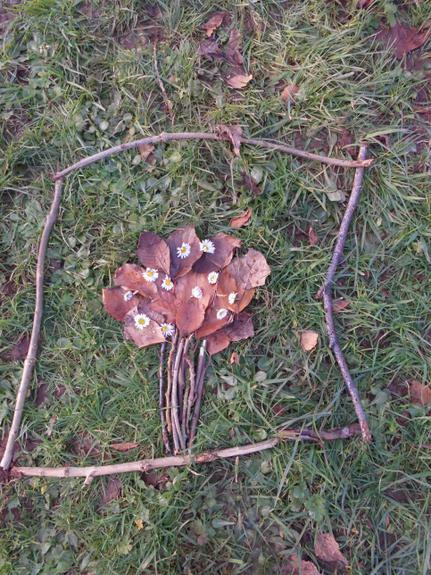 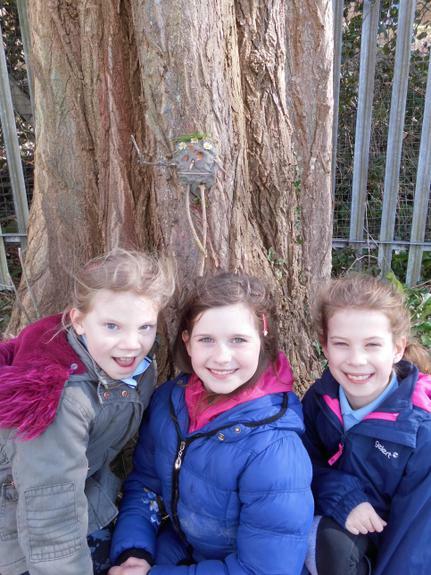 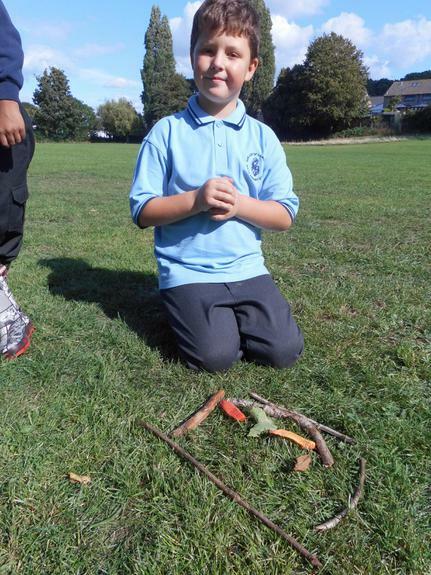 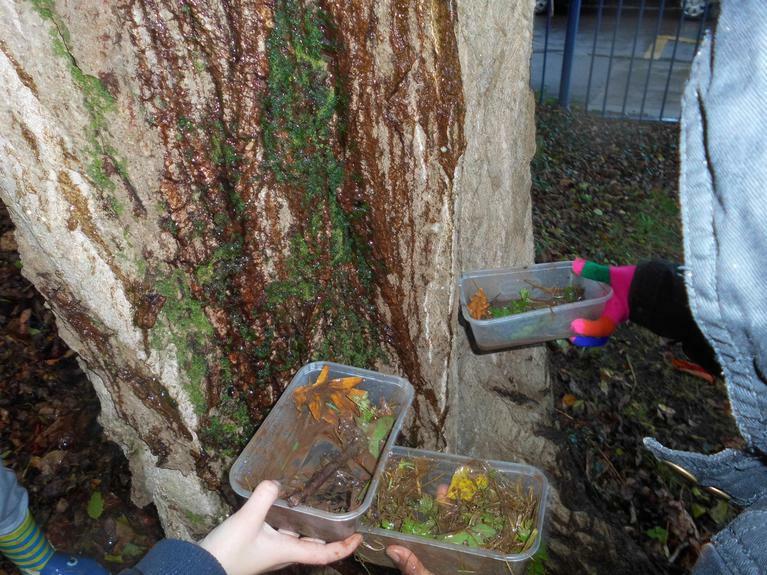 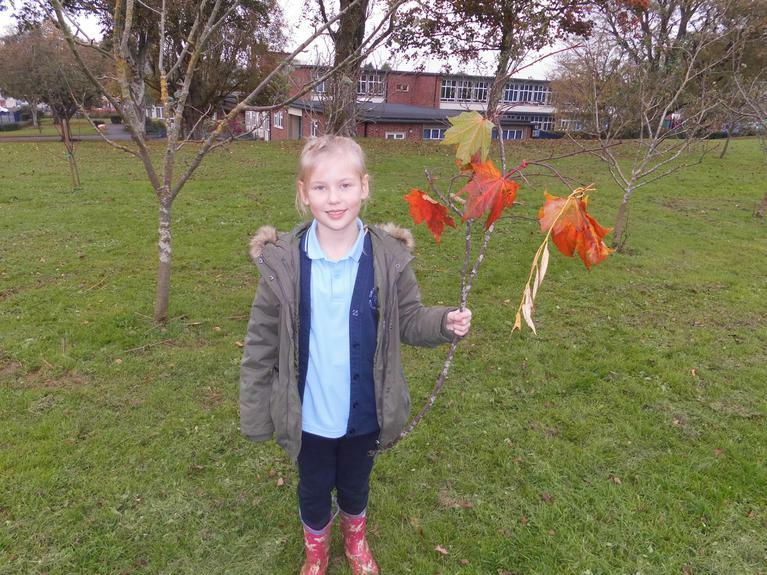 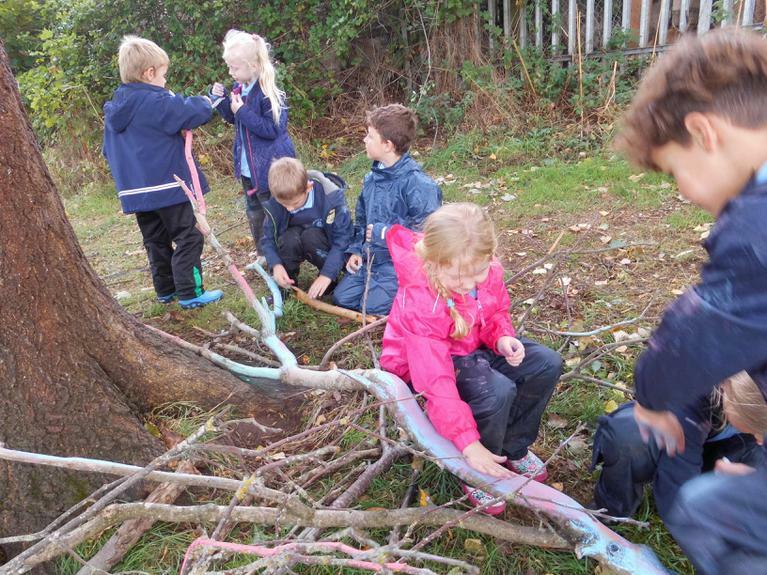 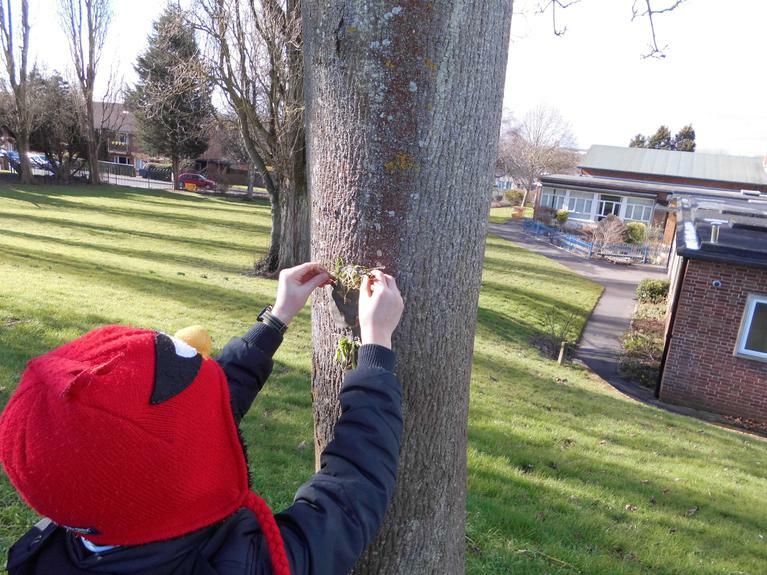 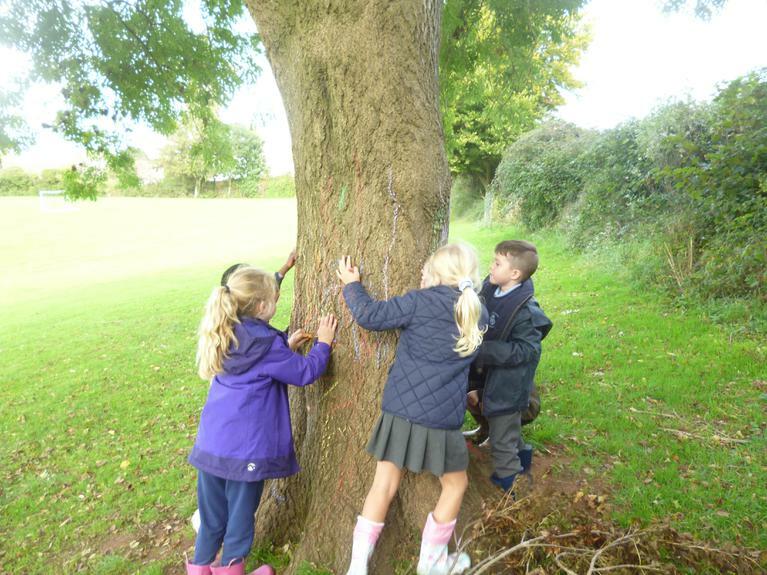 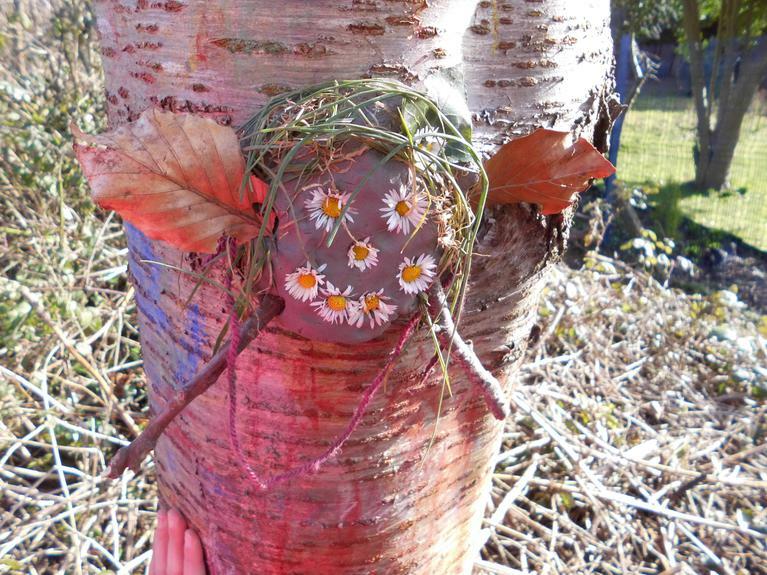 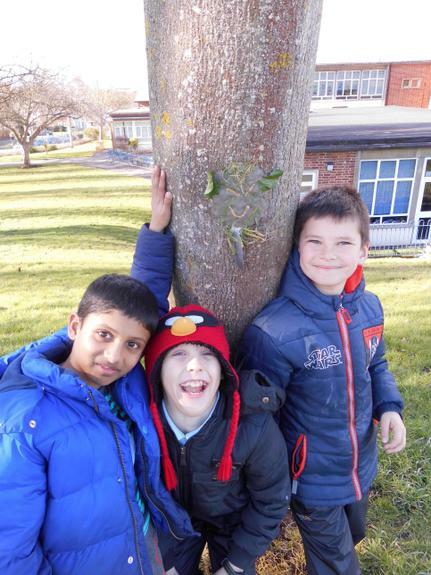 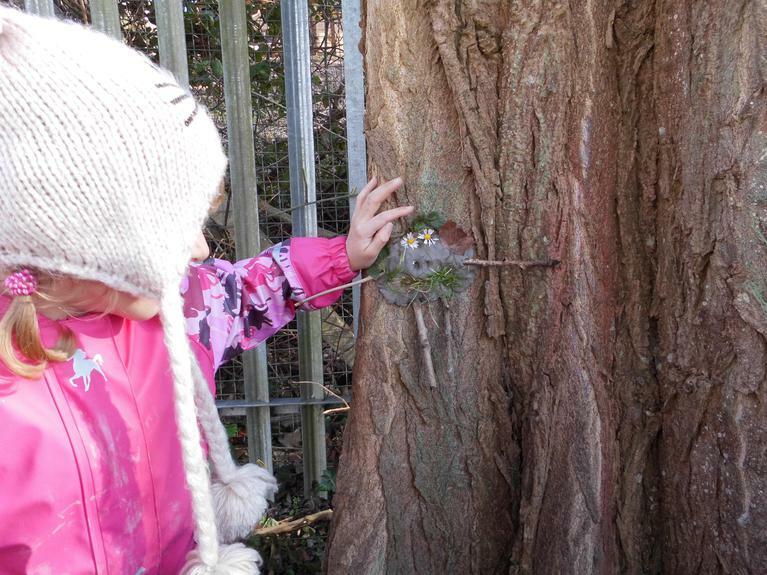 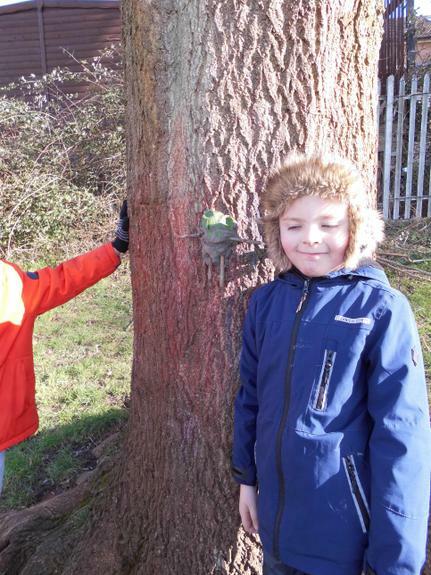 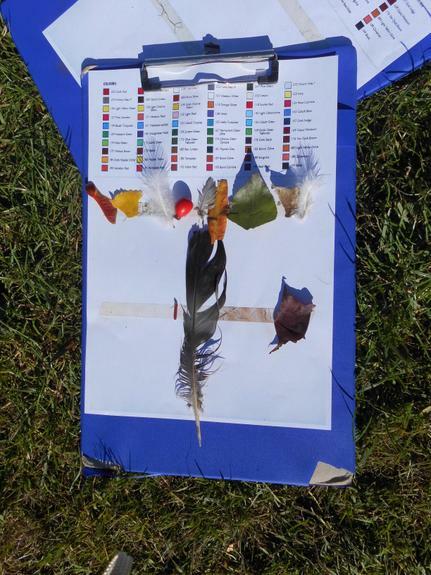 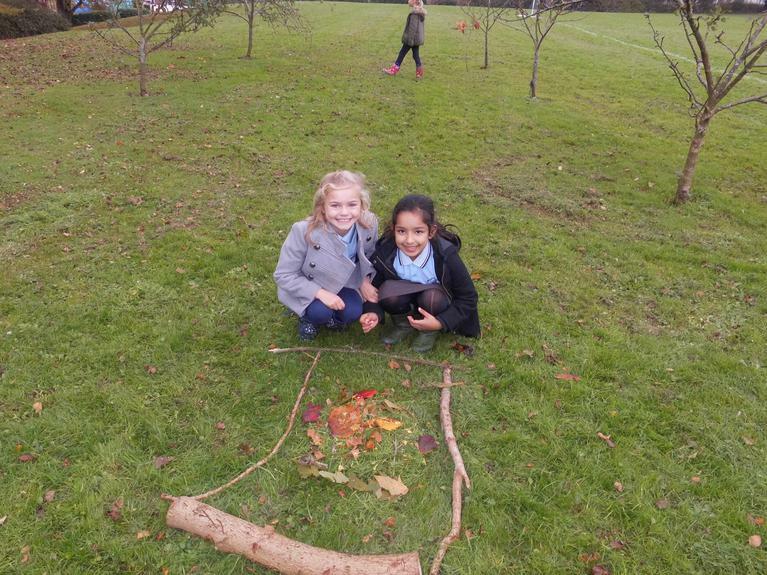 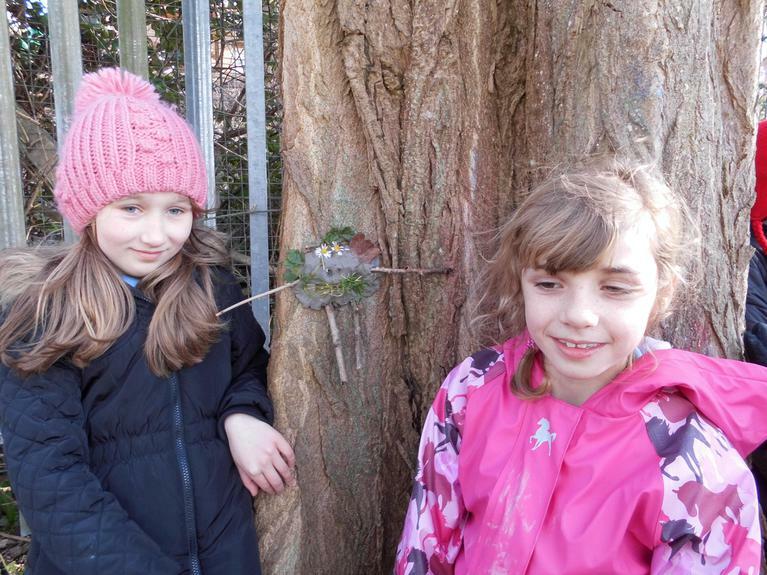 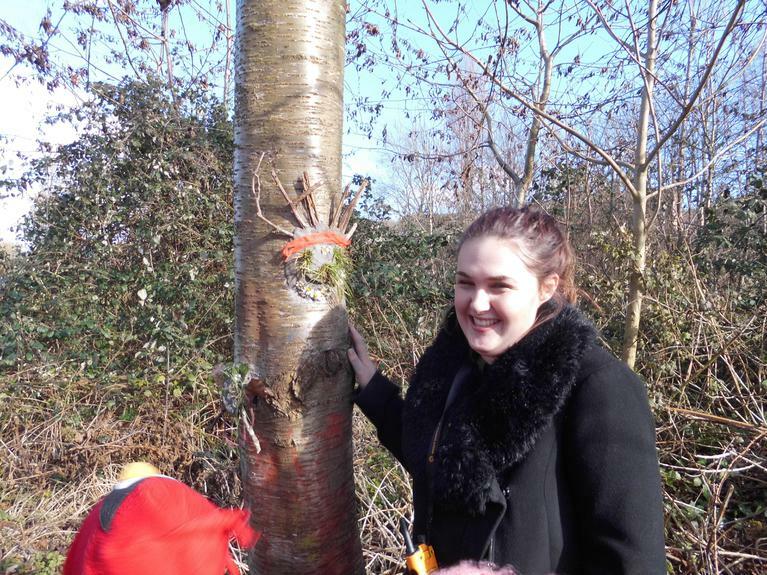 Y2 had great fun making a 'rainbow tree' together and discovered some of the local wildlife. 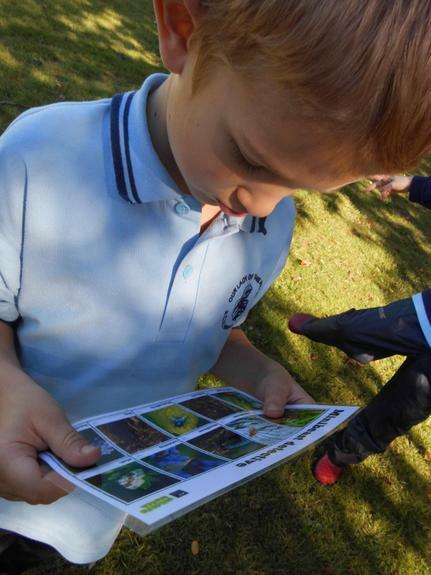 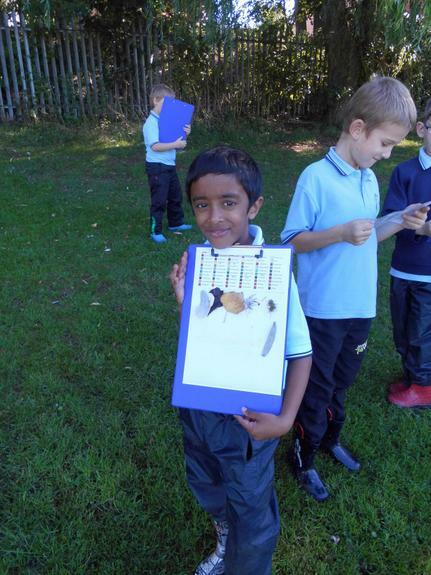 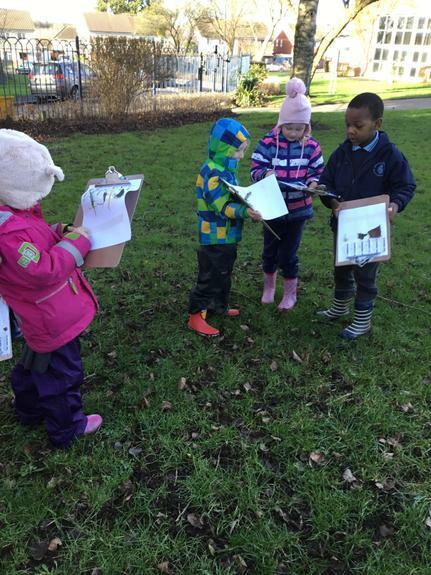 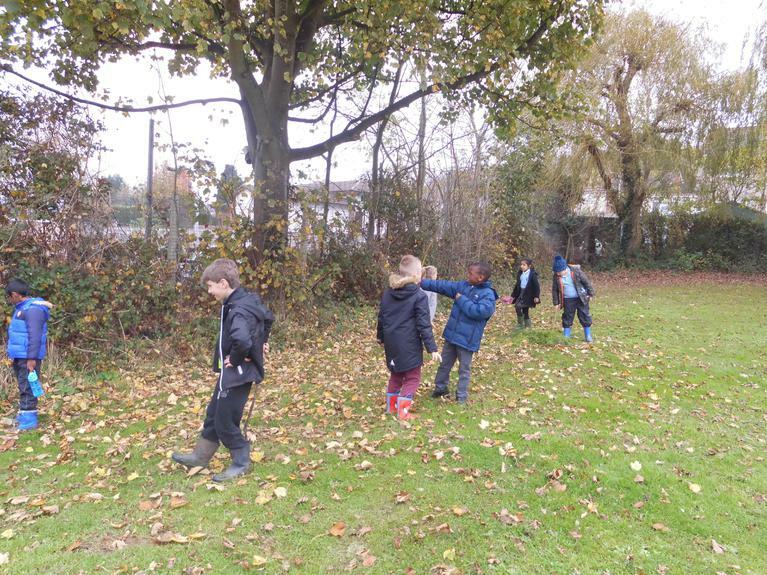 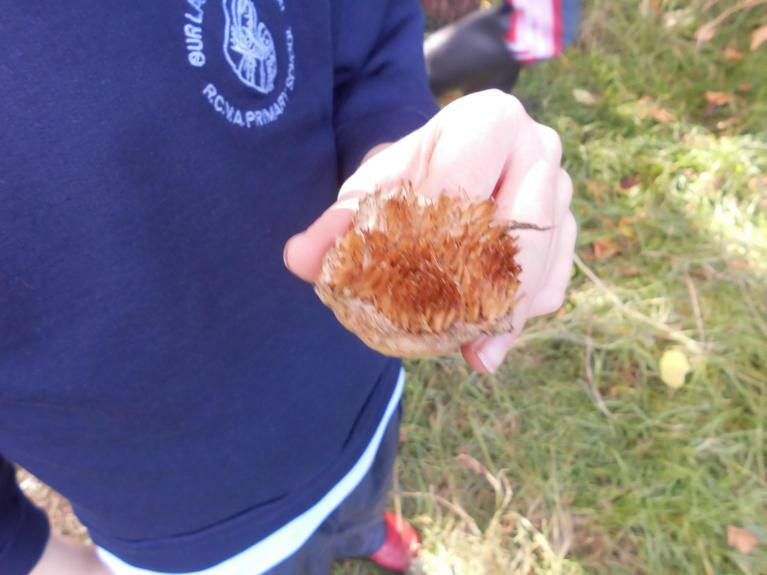 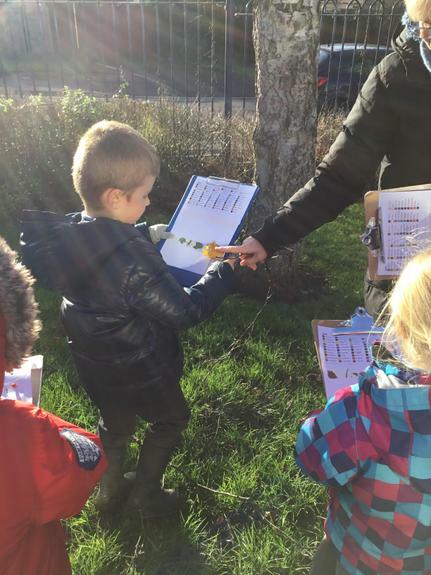 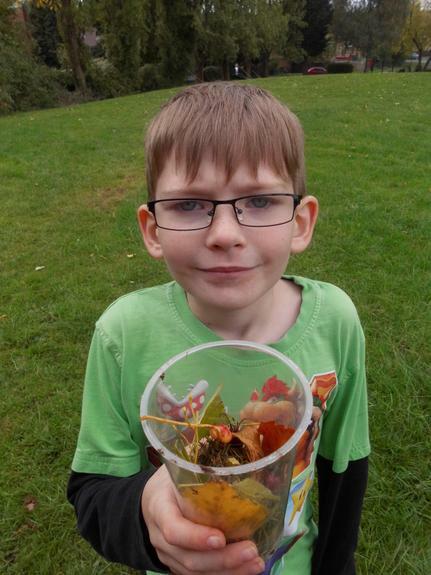 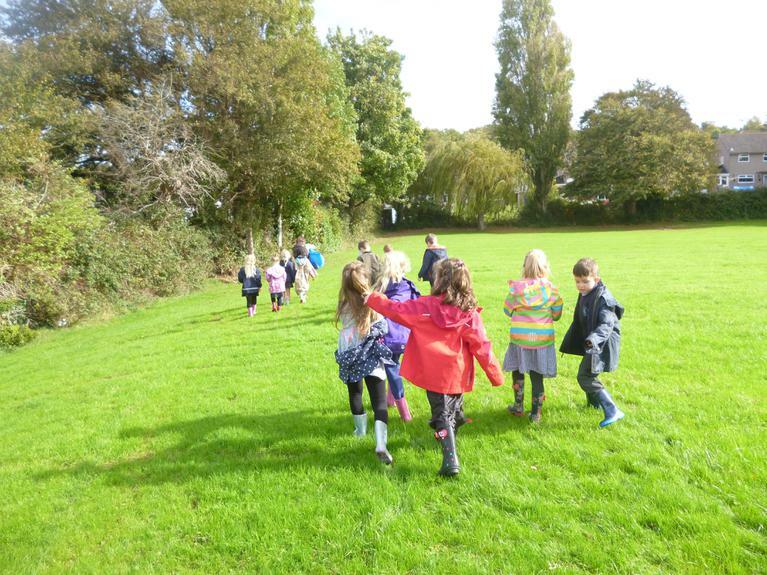 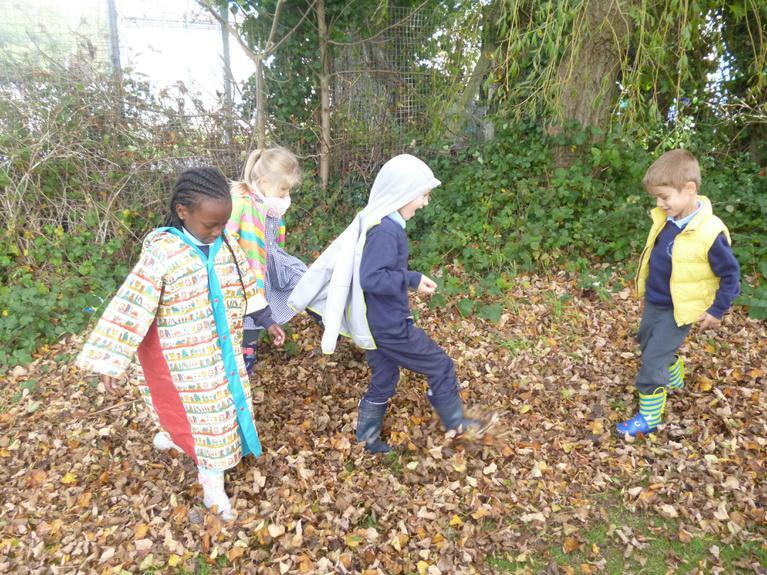 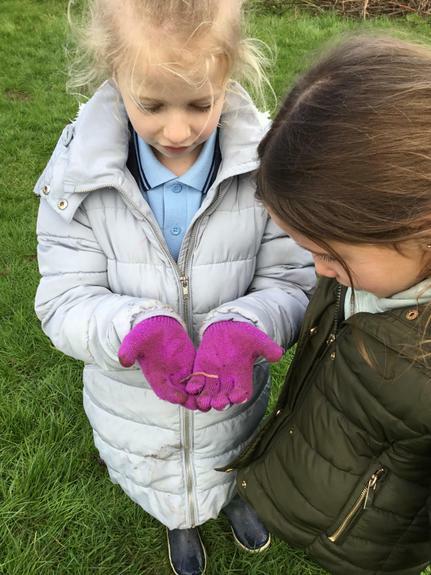 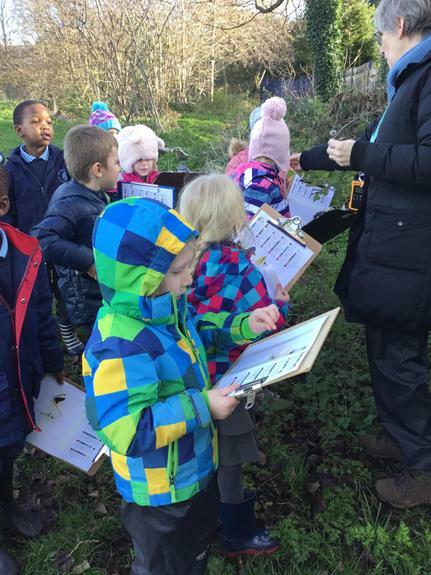 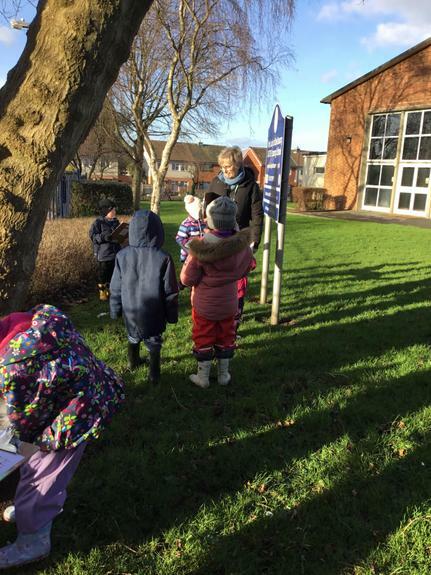 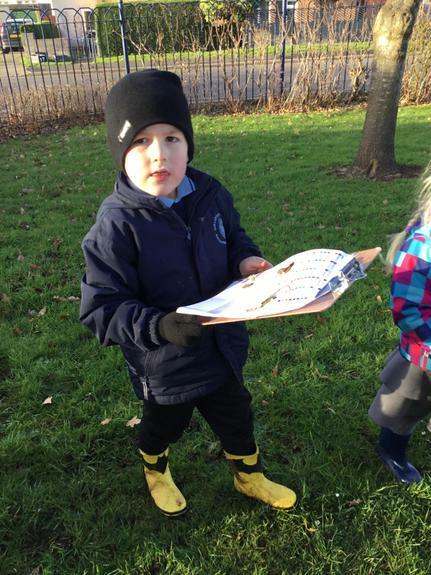 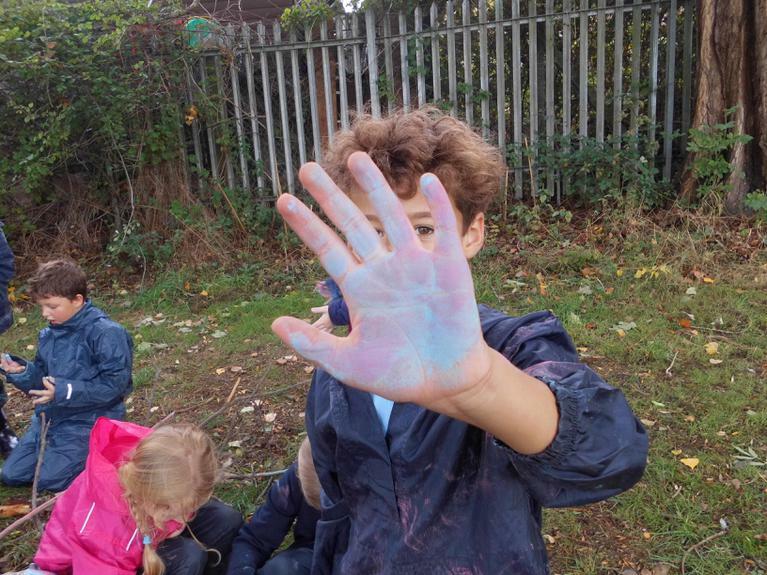 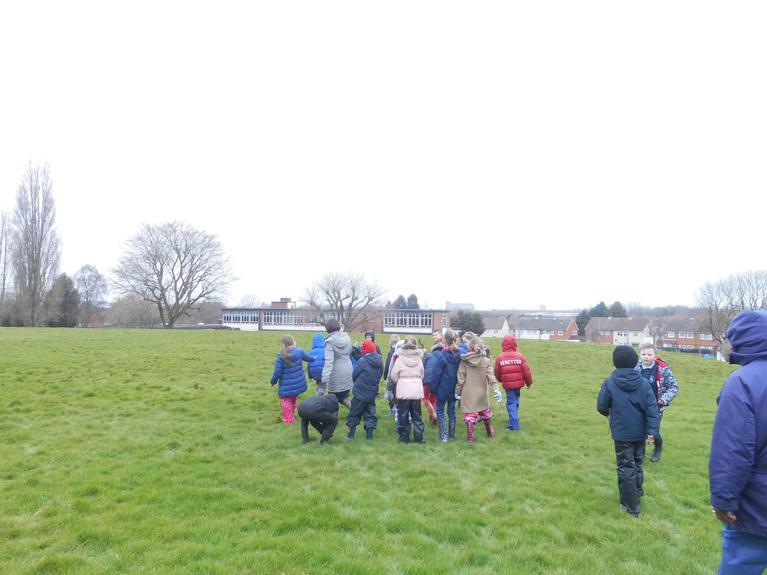 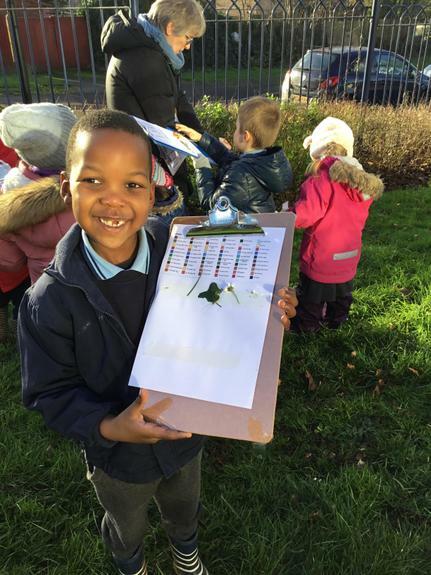 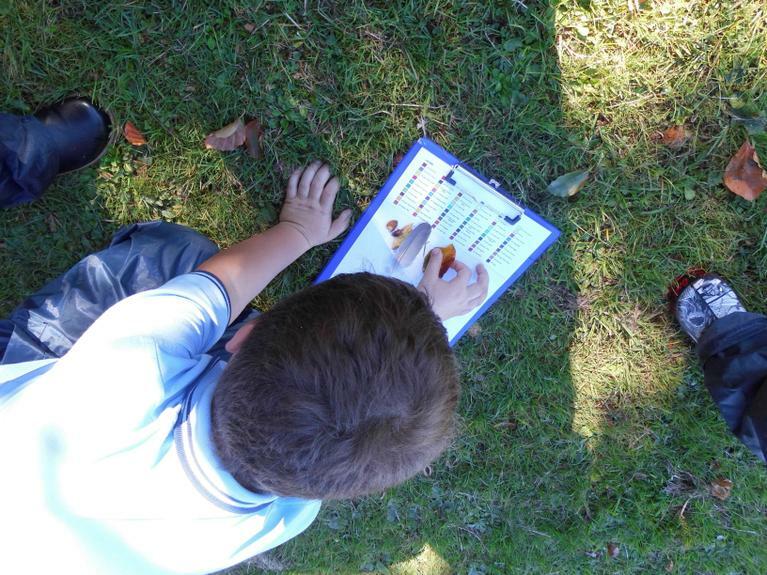 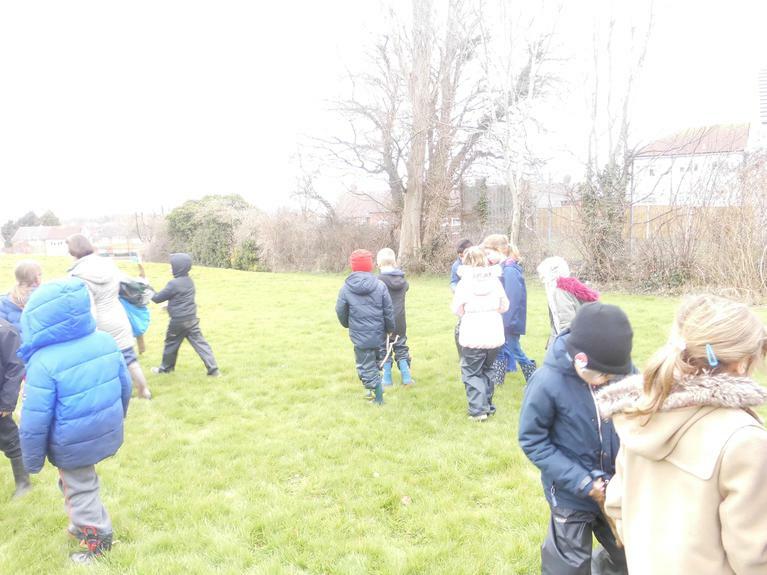 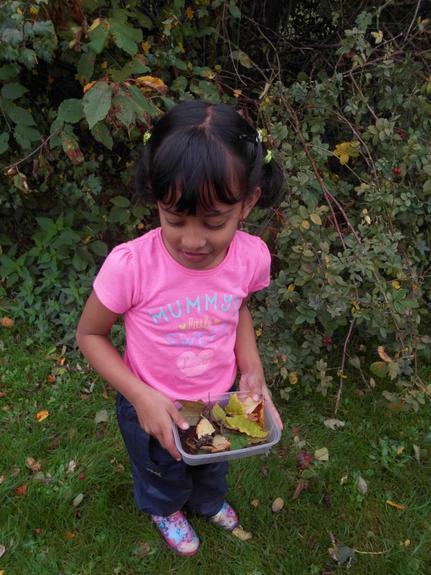 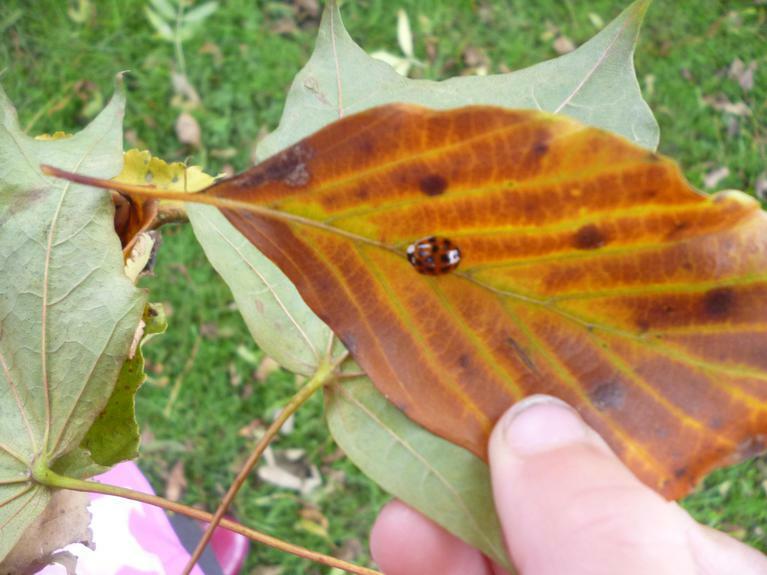 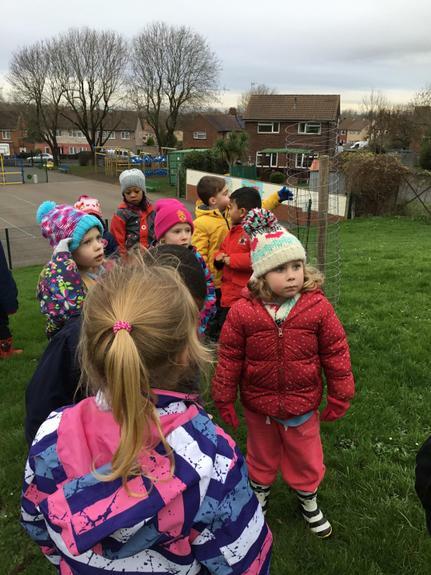 Y2 went on a walk to collect different colours in nature. 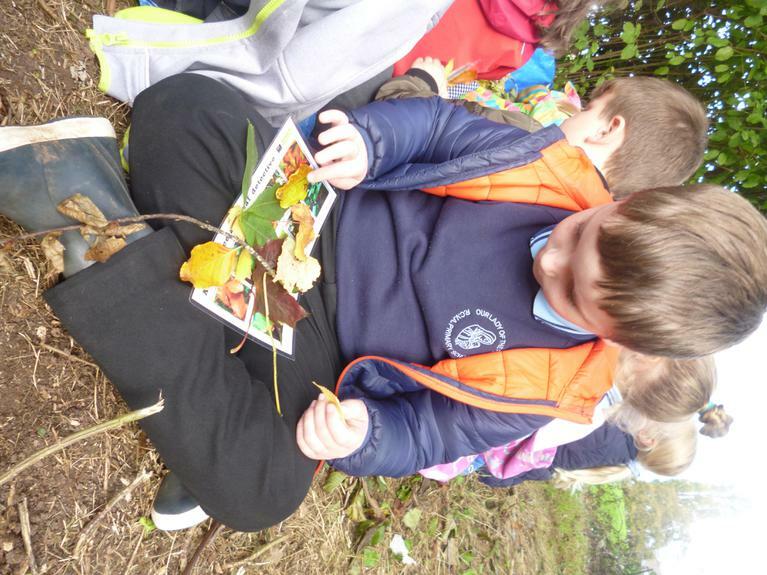 Then made pictures from what they had found. 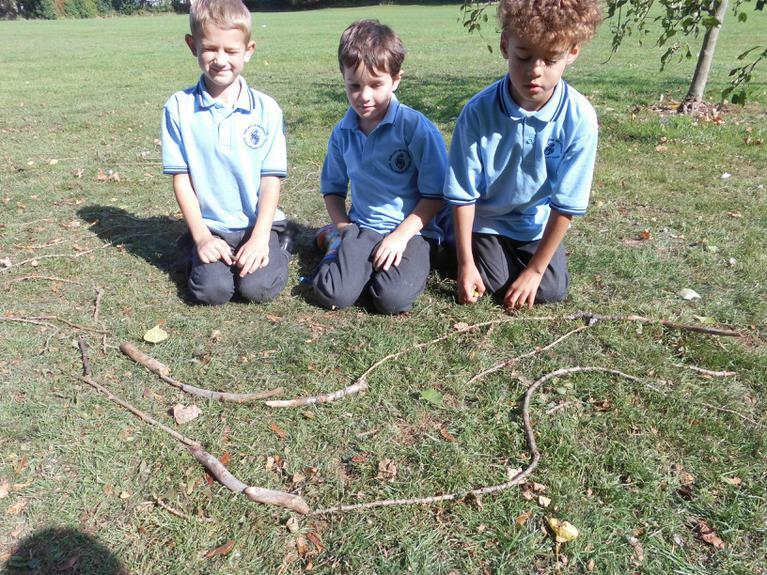 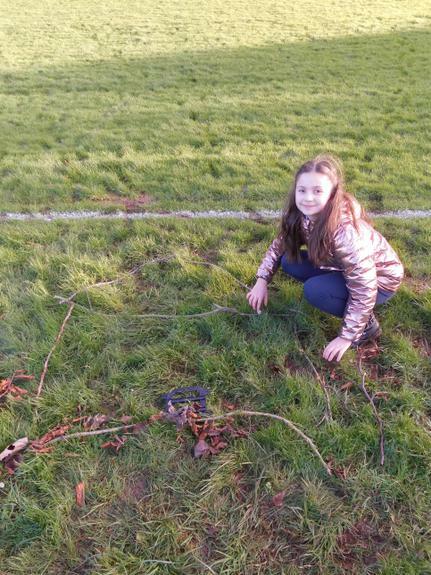 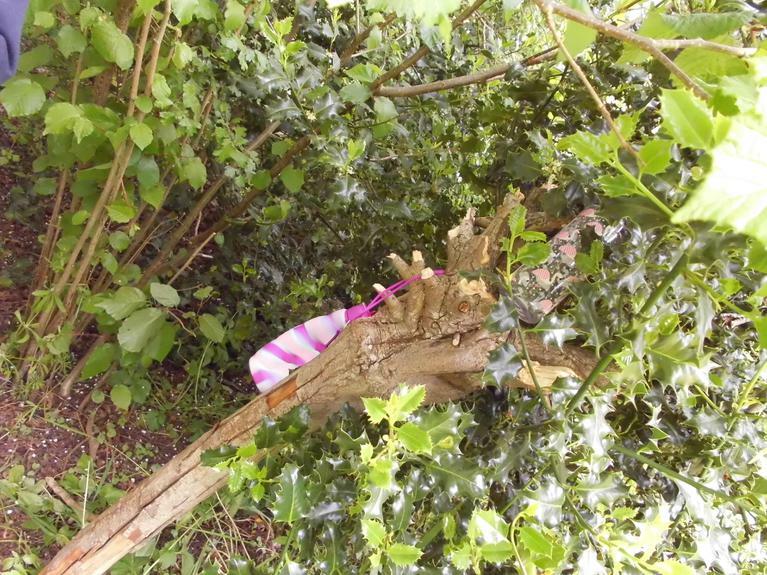 Look out for a snake and a Roald Dahl book! 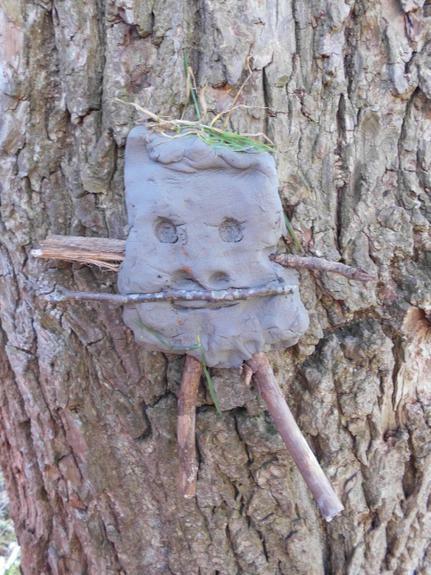 Y5 make clay tree characters. 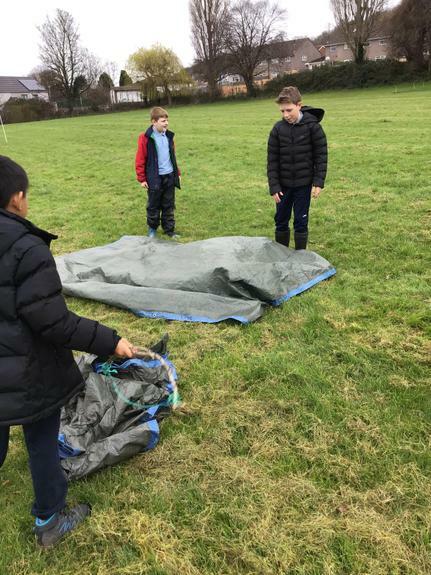 Y5 work on another problem! 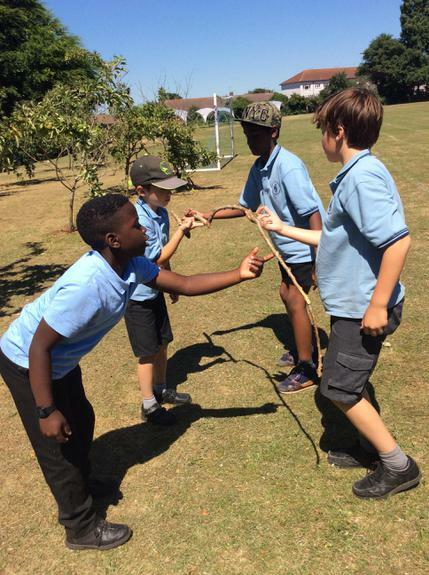 Y5 work together to solve problems. 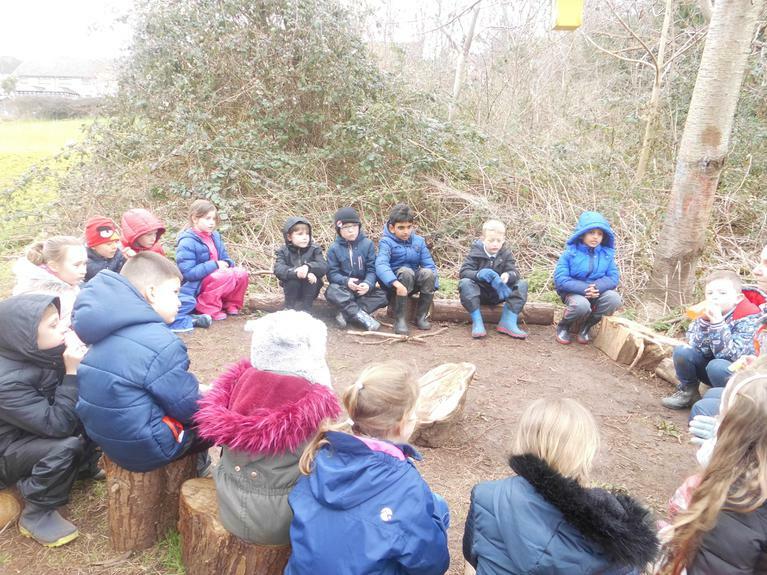 A powerpoint shown to our governors about Forest school at Our Lady of the Rosary. 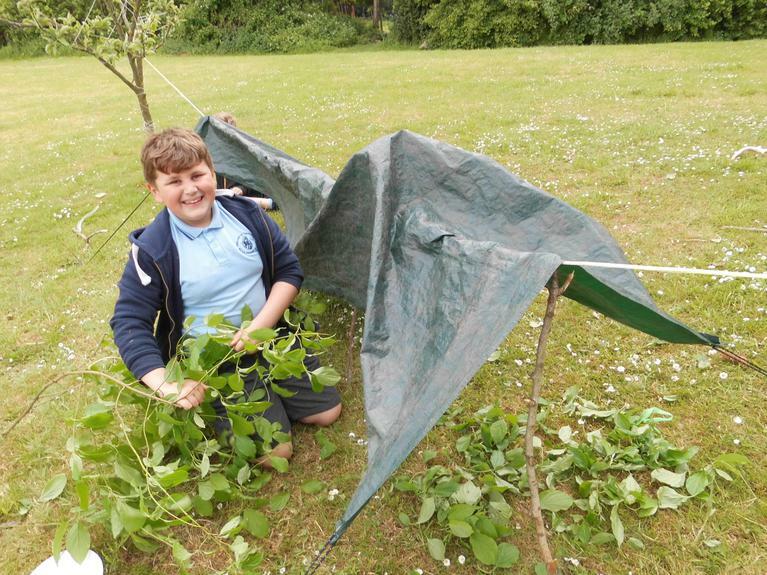 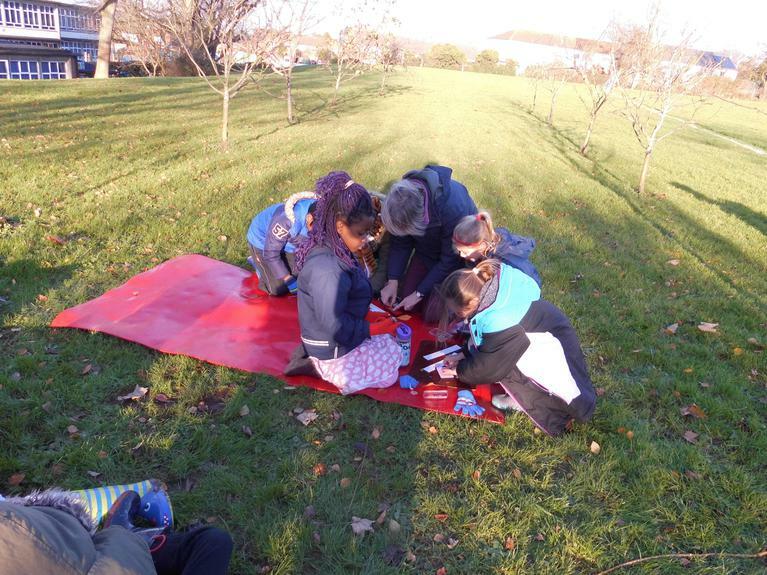 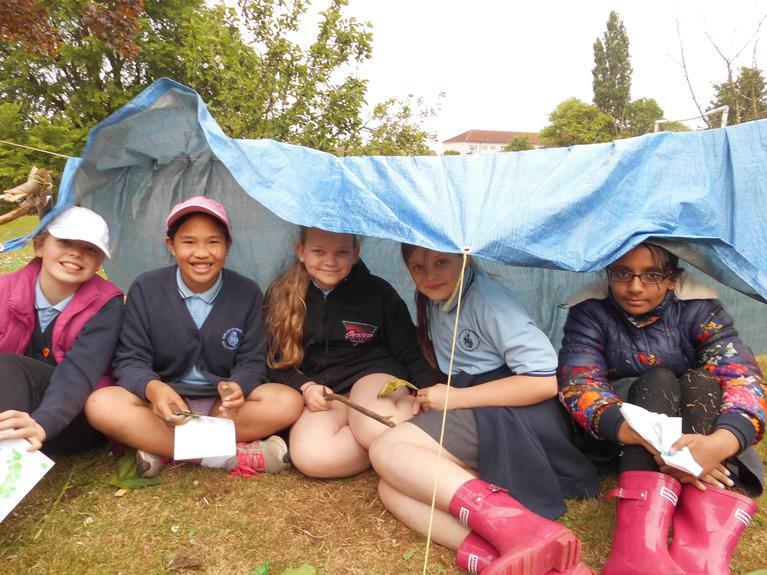 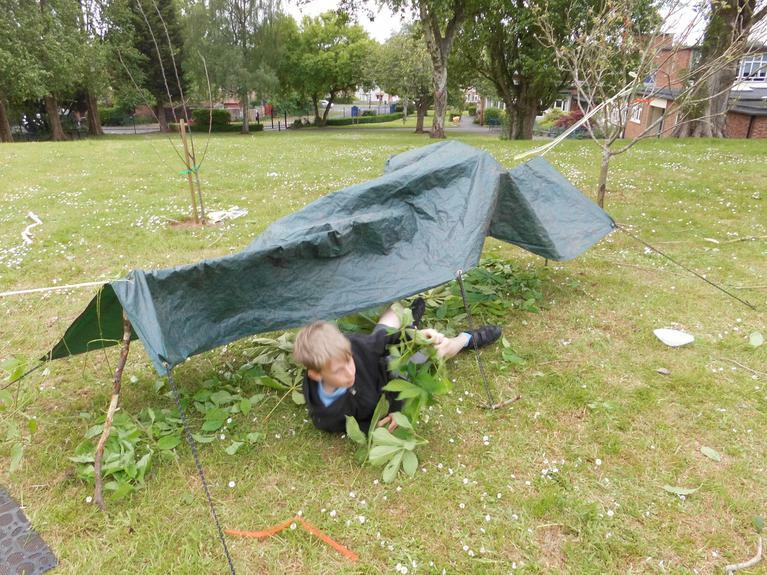 Y6 make dens and print leaves. 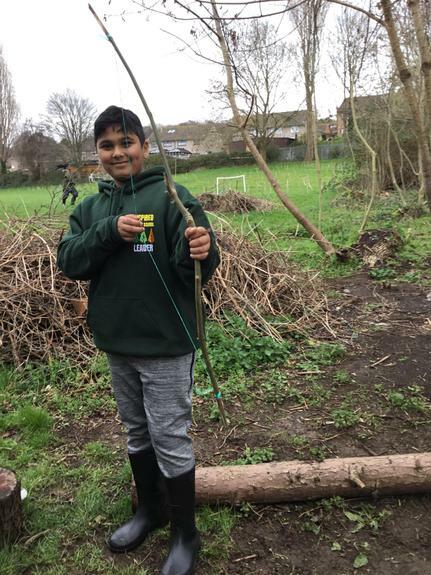 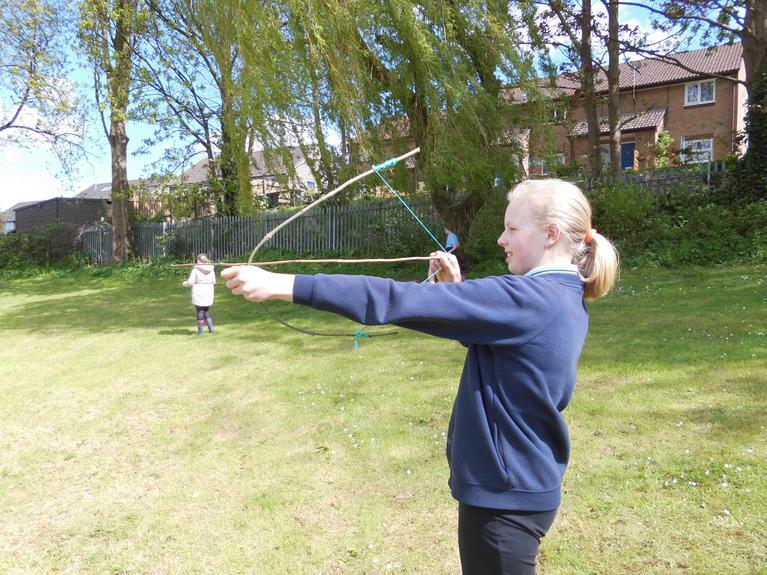 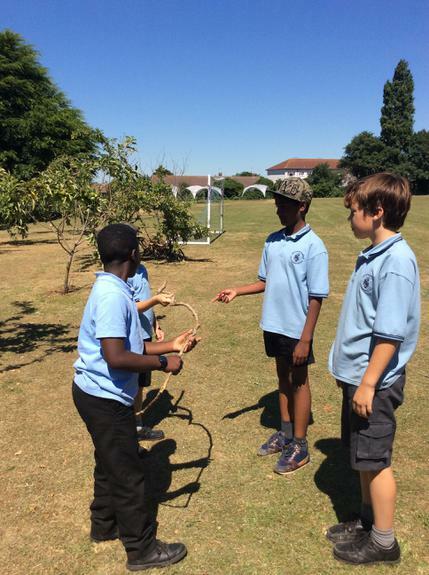 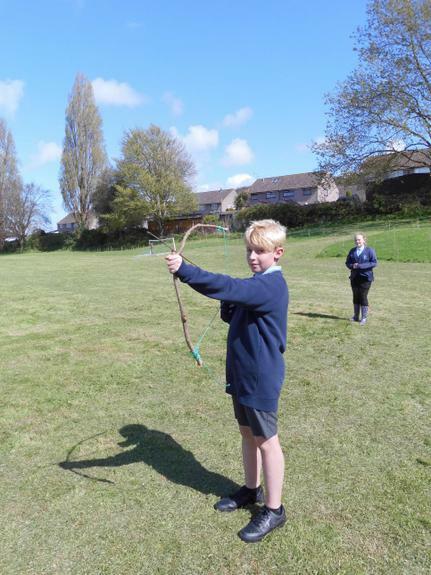 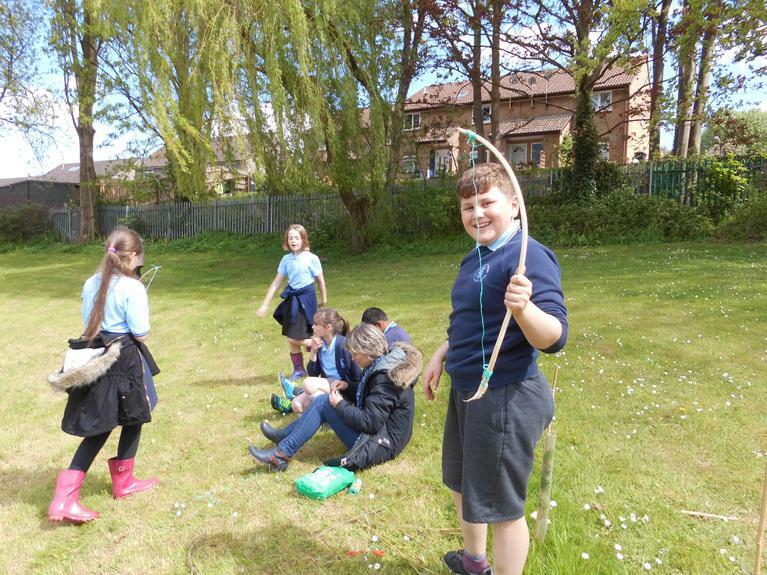 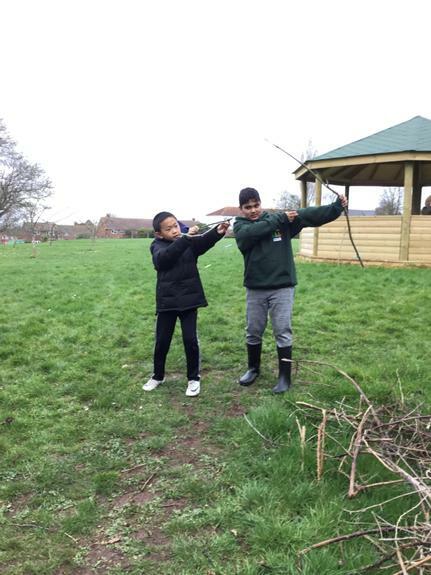 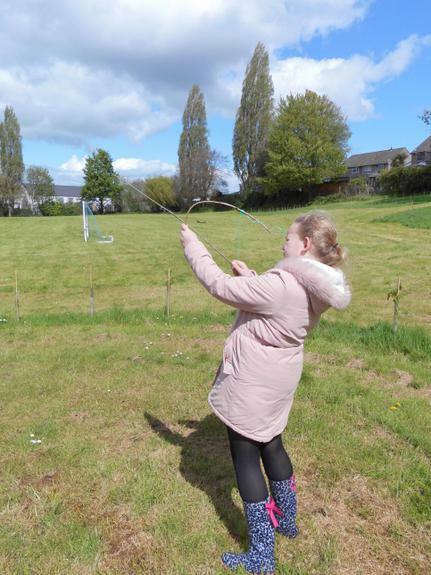 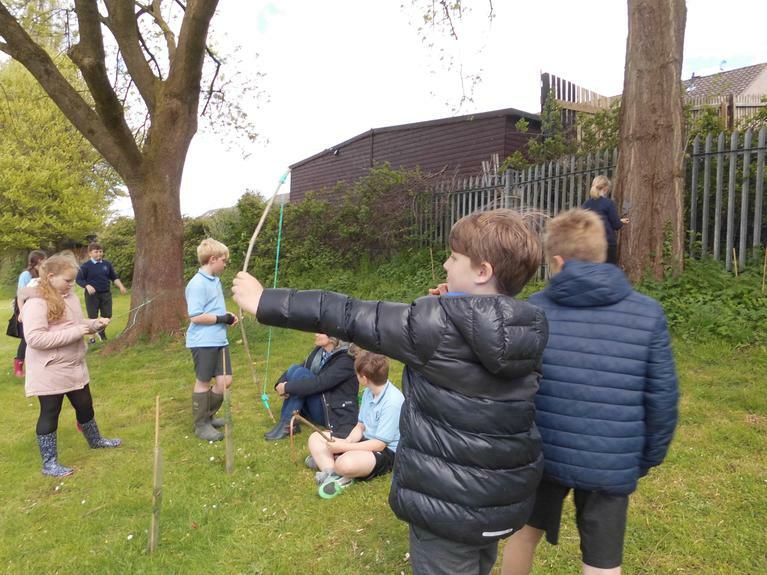 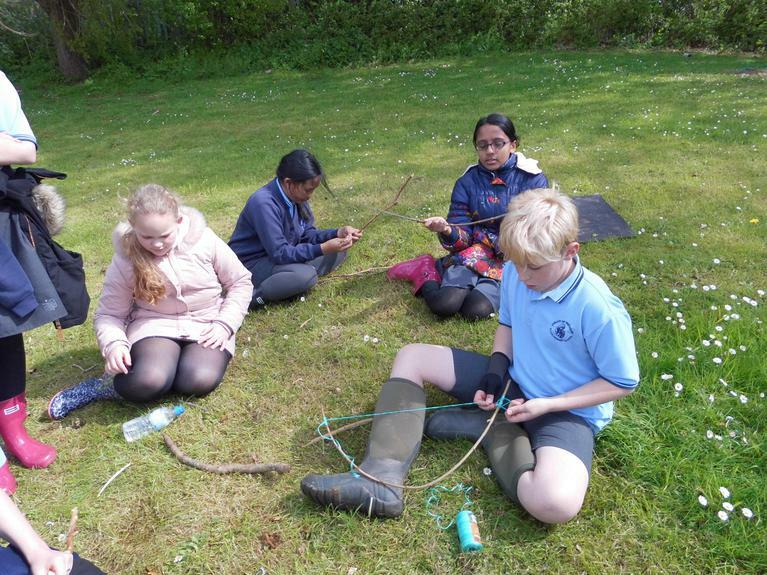 Y6 make bows and arrows. 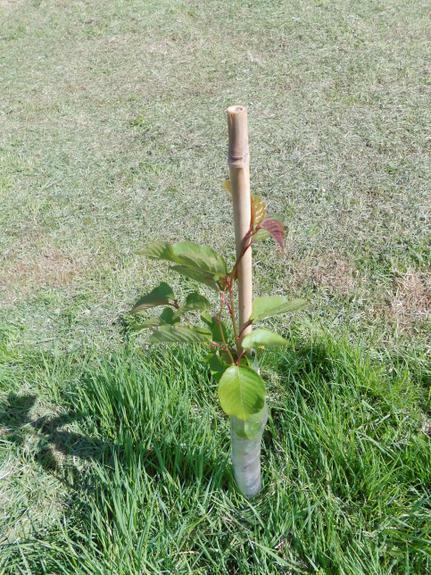 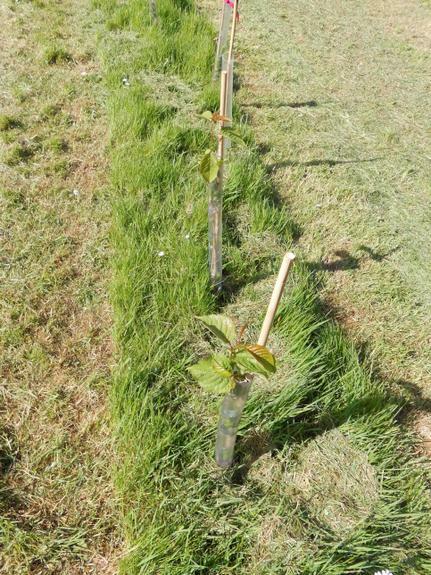 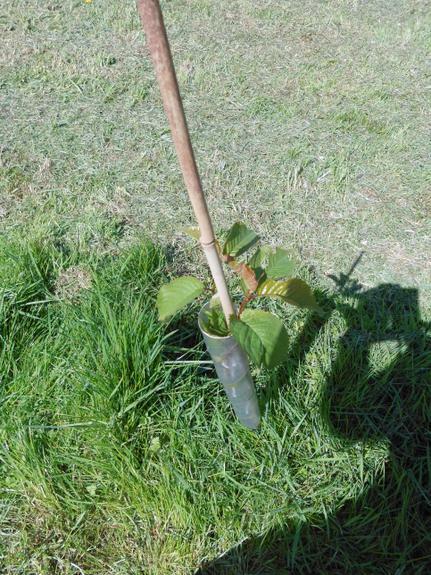 Our tree saplings are growing! 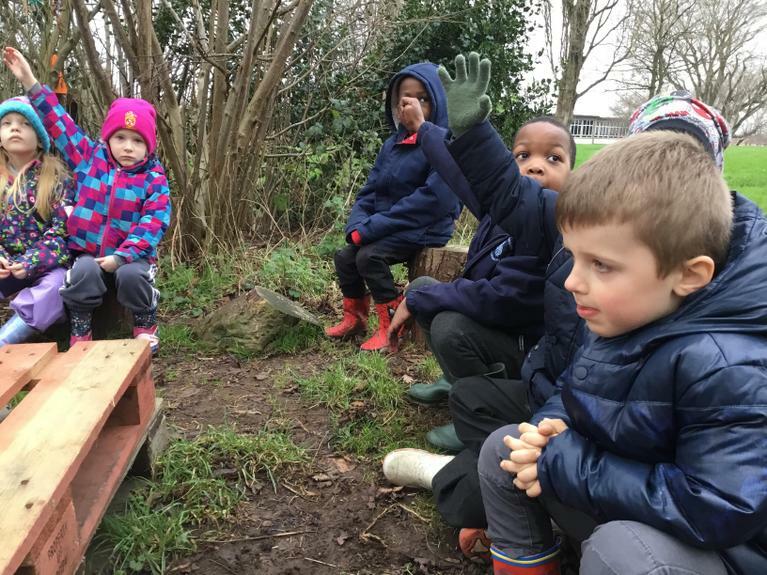 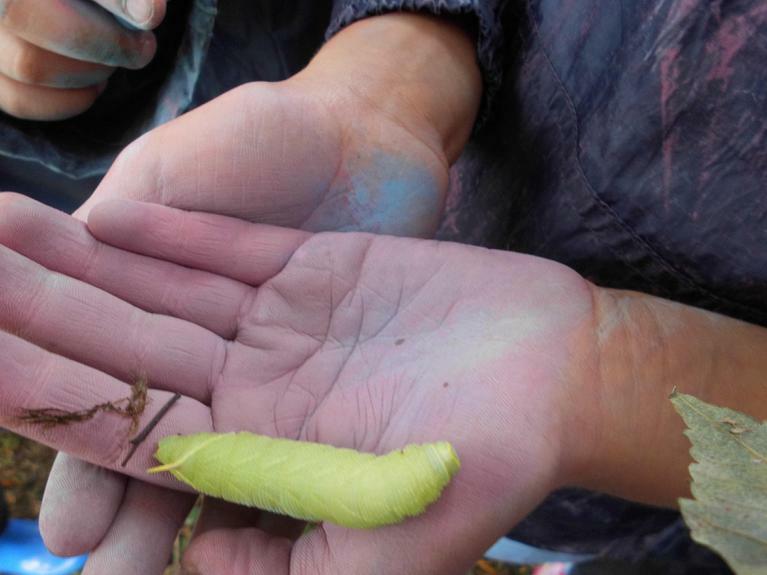 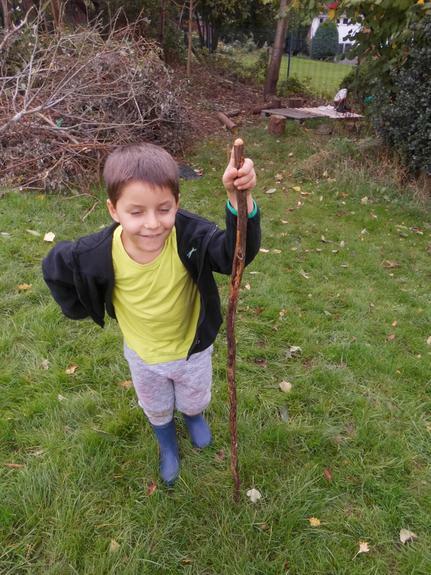 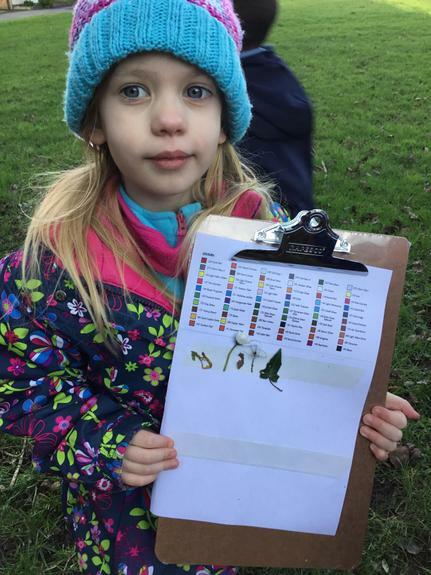 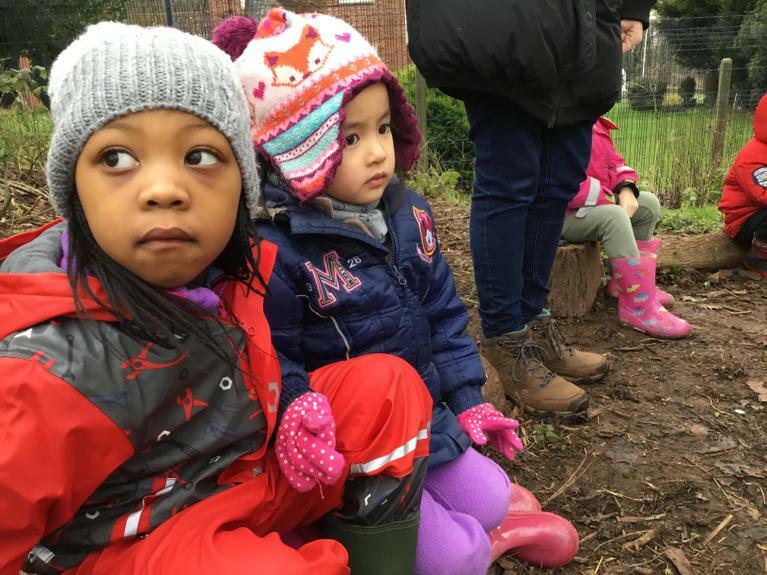 When will my child take part in Forest Schools? 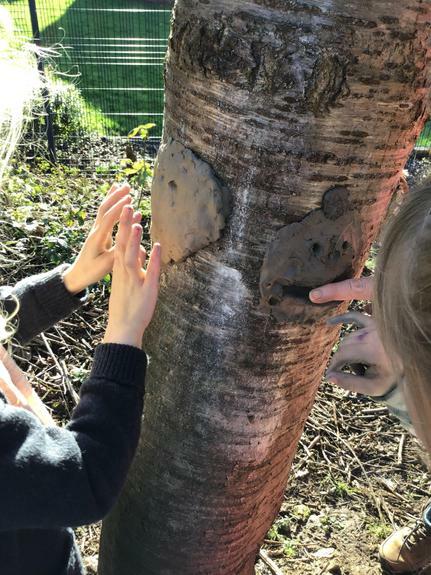 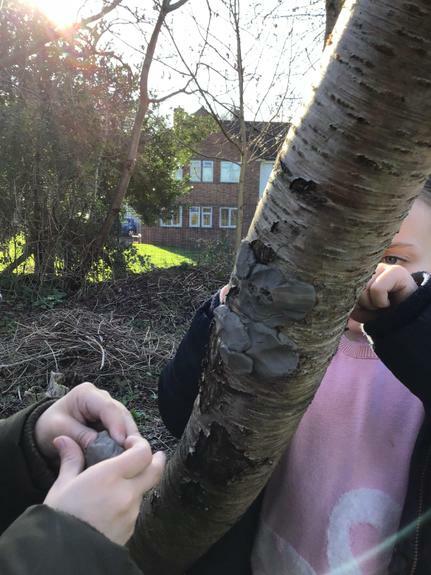 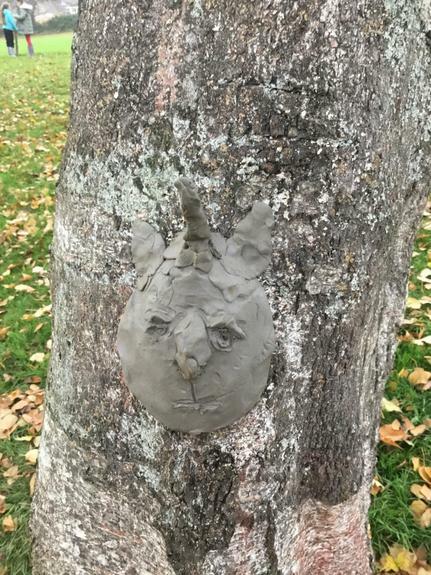 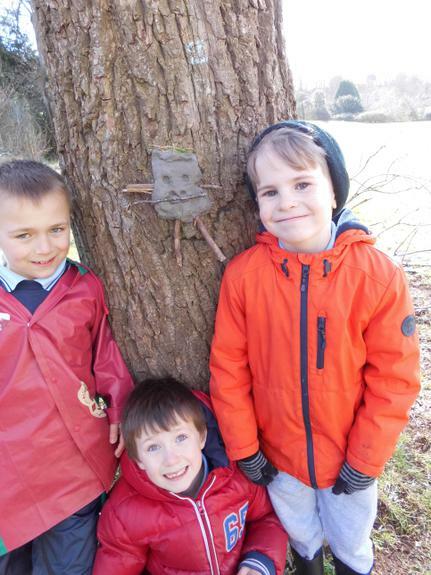 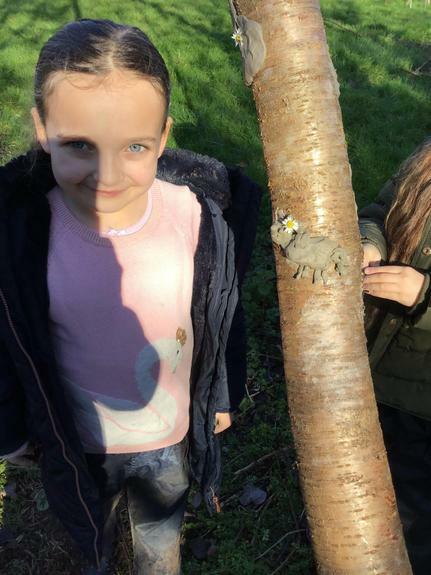 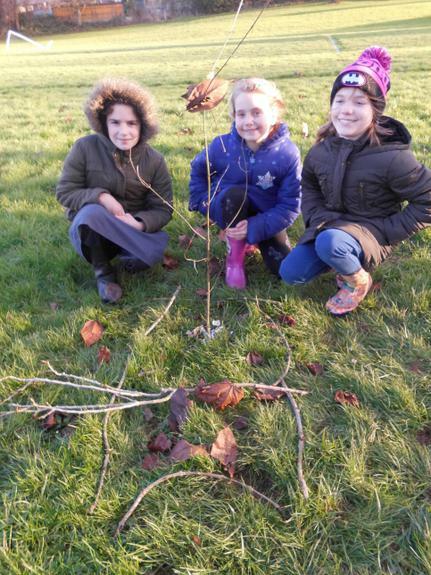 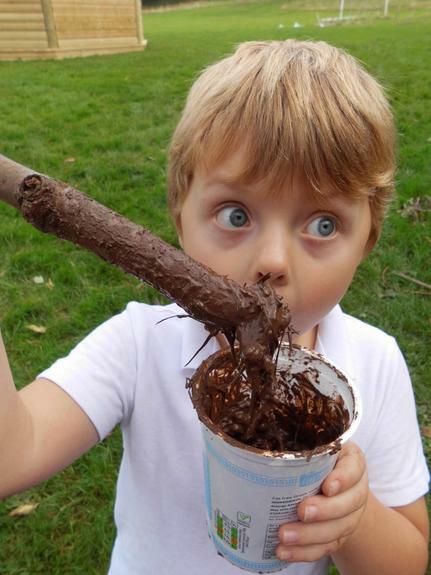 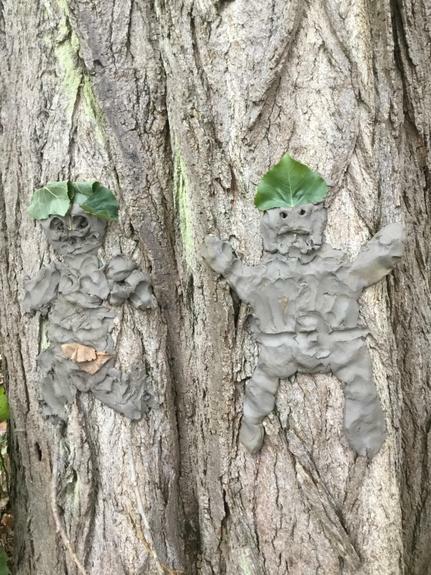 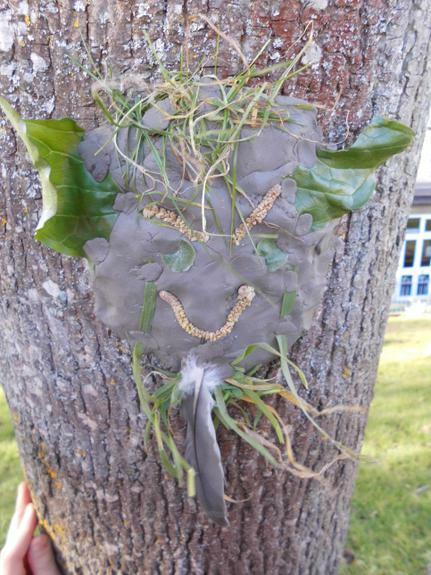 Year 3 made Mud Tree People. 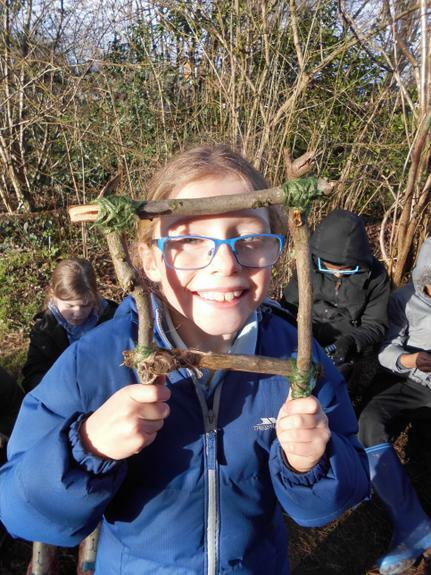 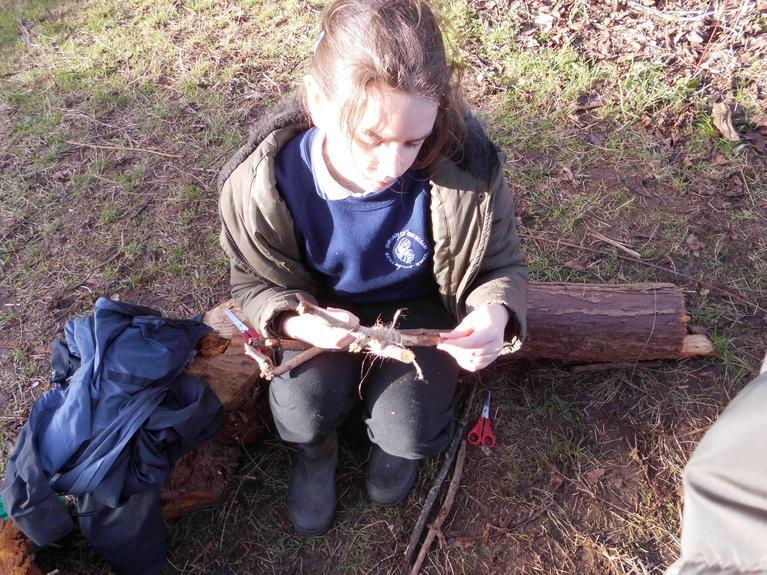 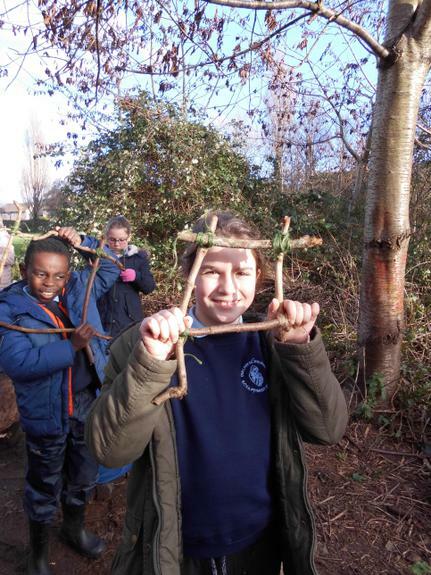 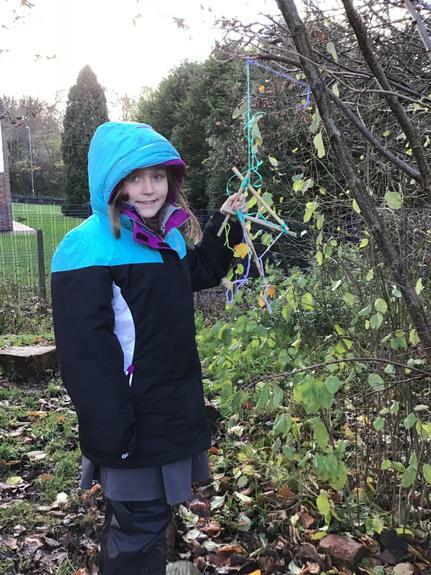 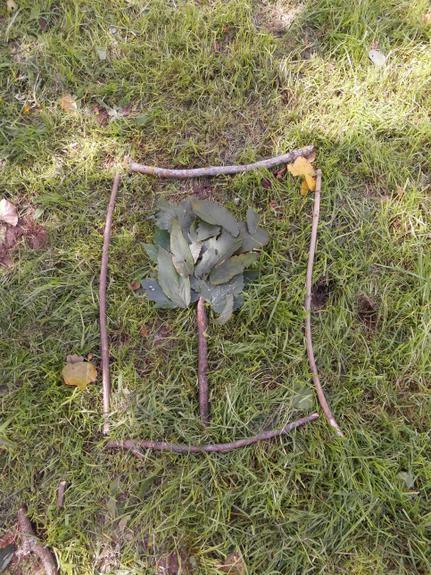 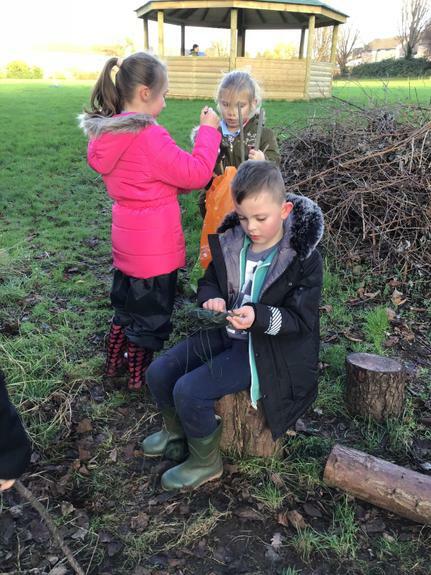 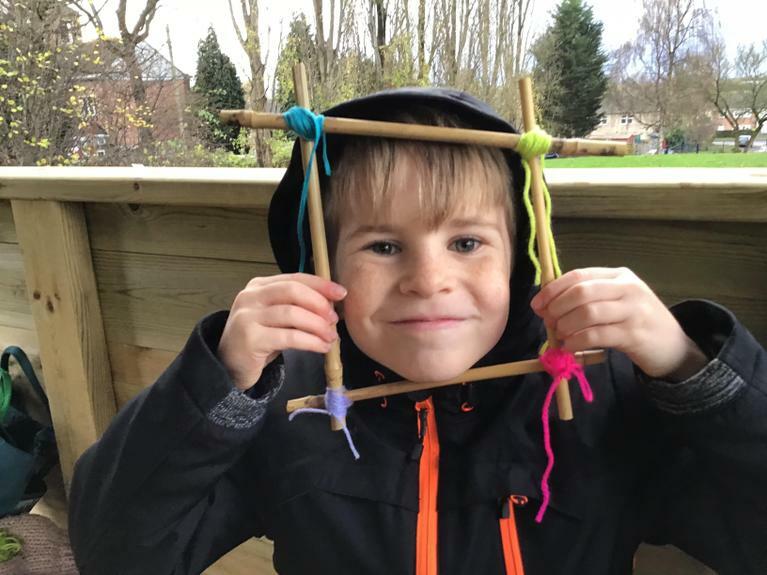 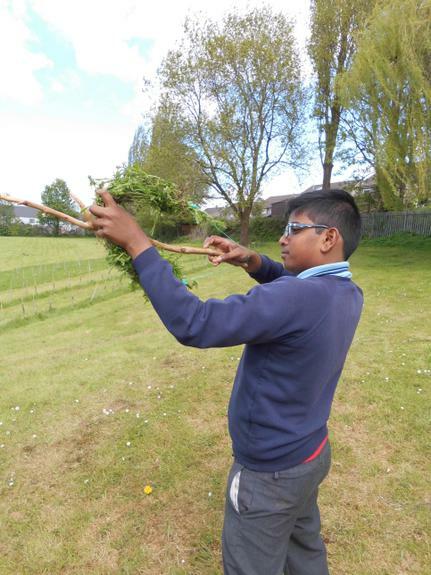 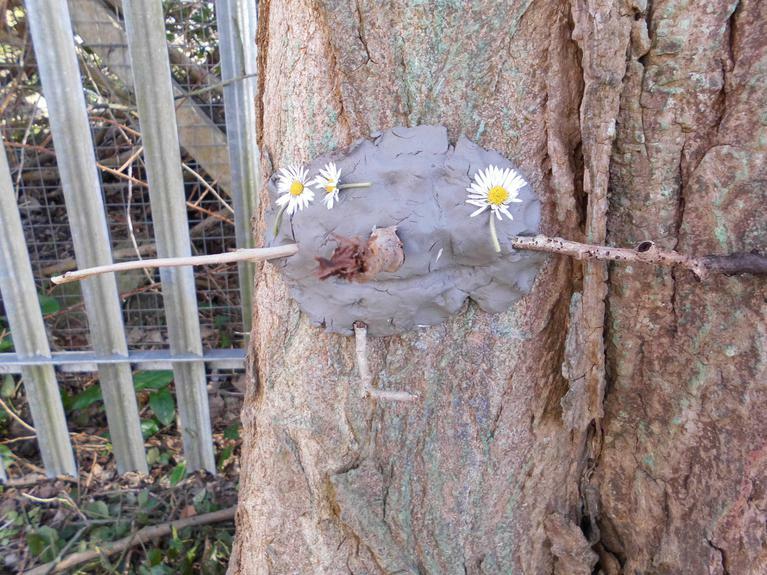 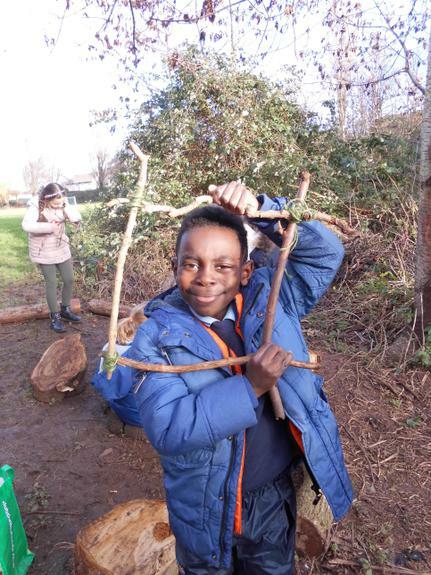 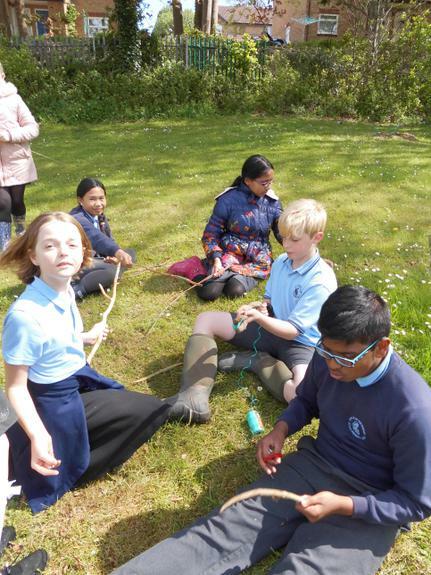 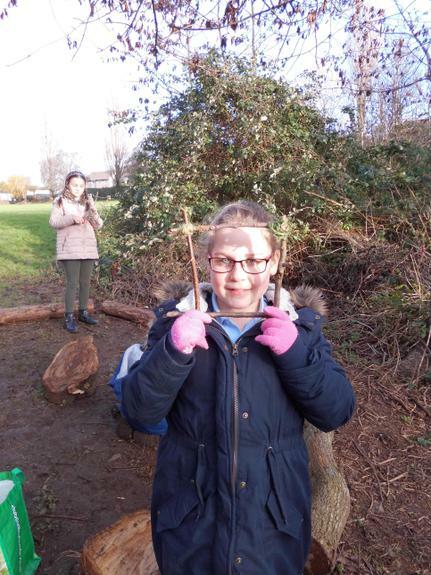 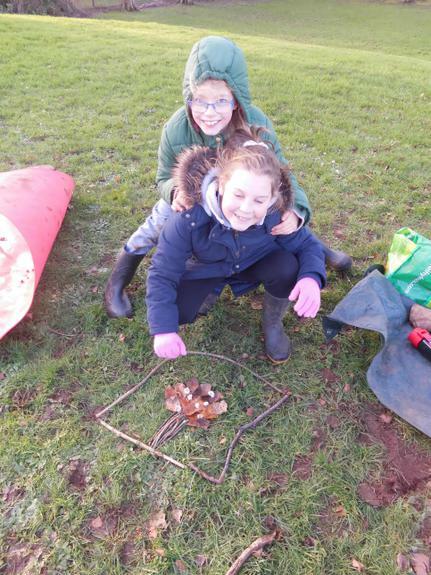 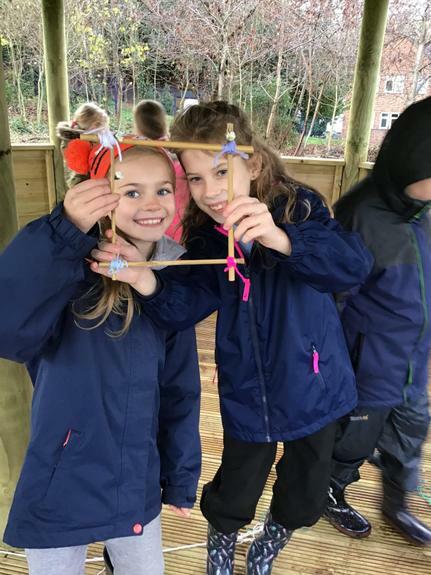 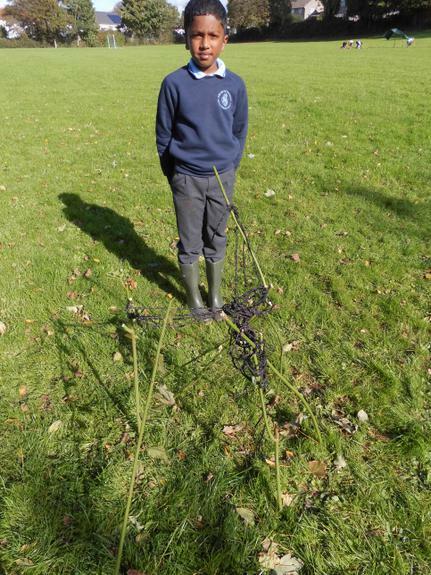 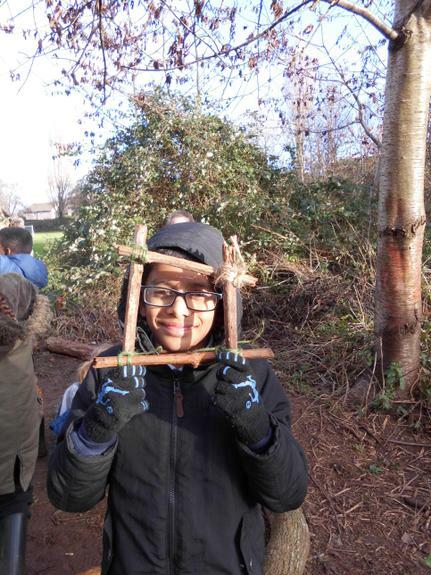 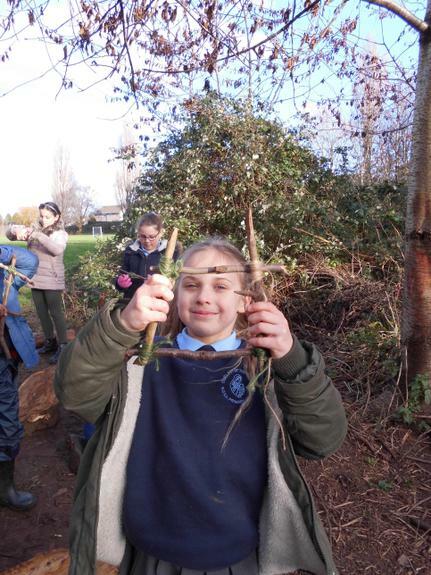 Year 4 found out how to use string and twigs to make a picture frame. 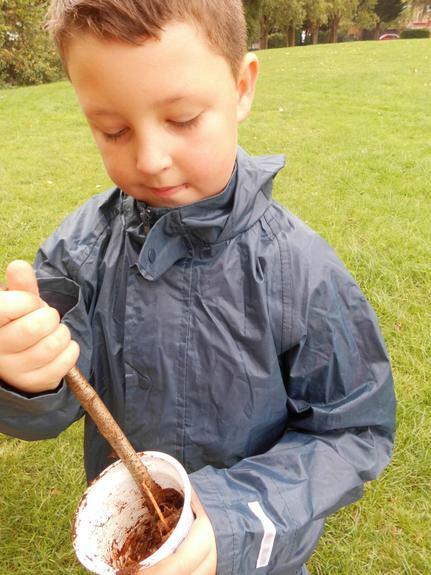 The upside down world of trees and smell pots. 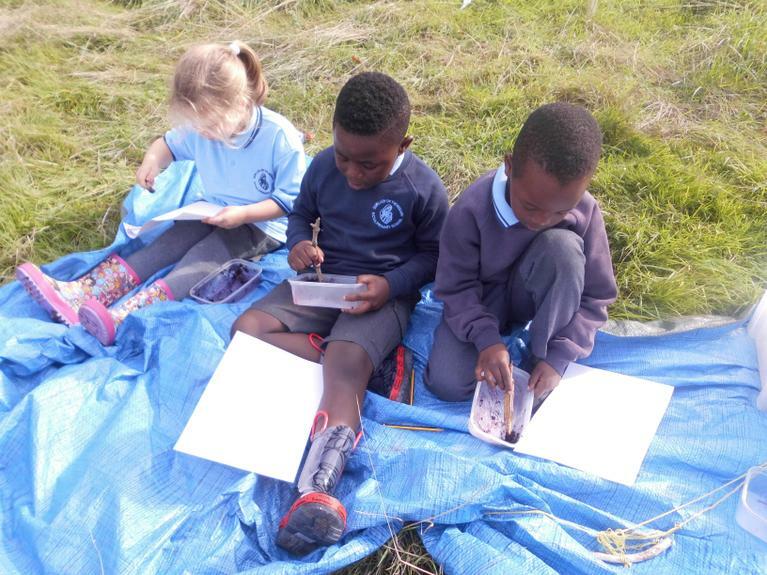 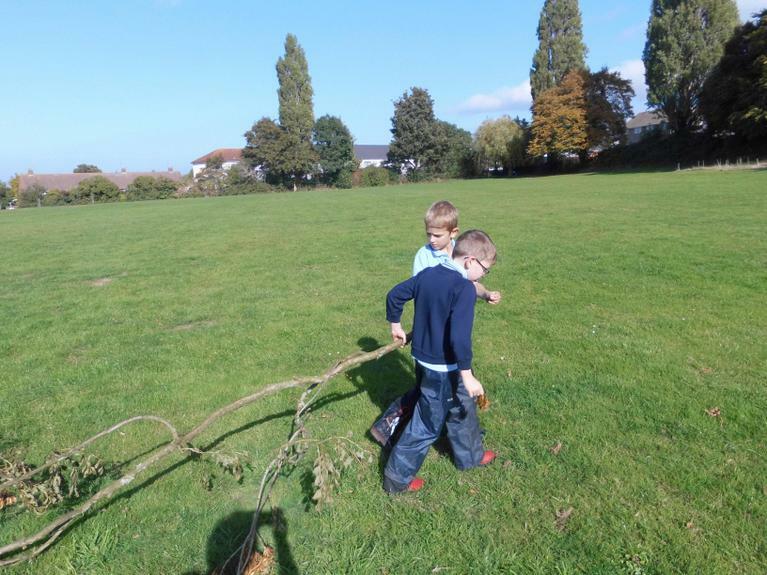 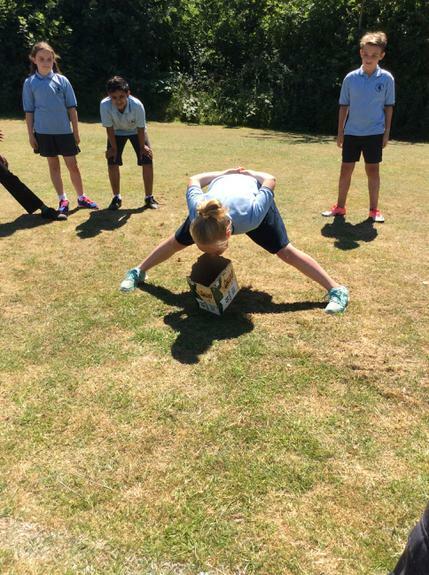 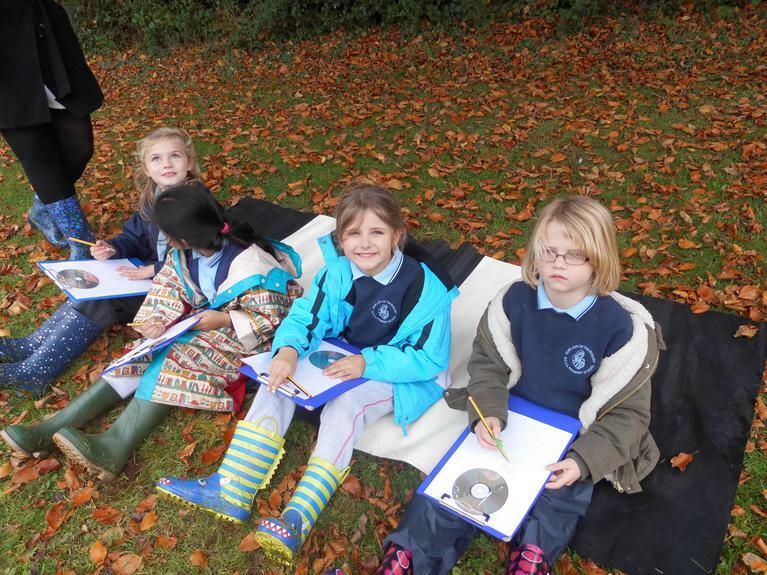 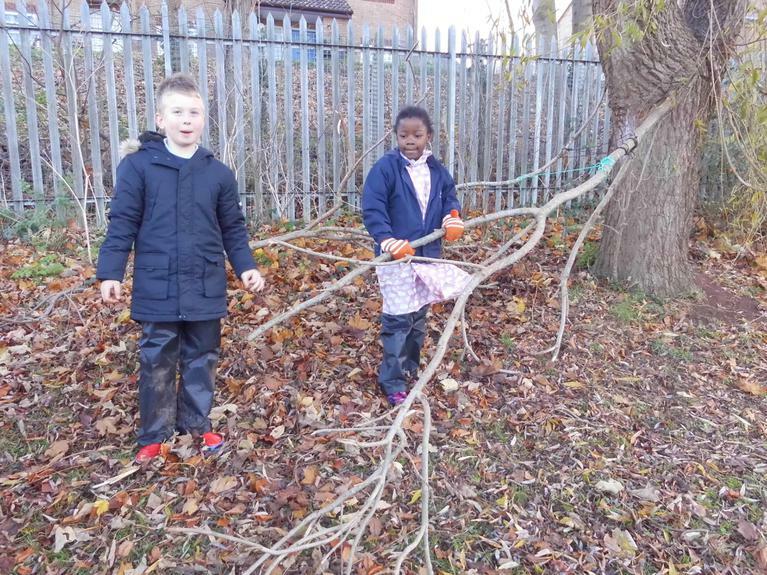 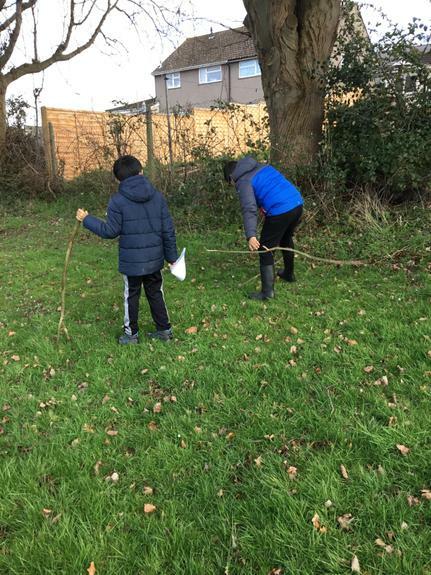 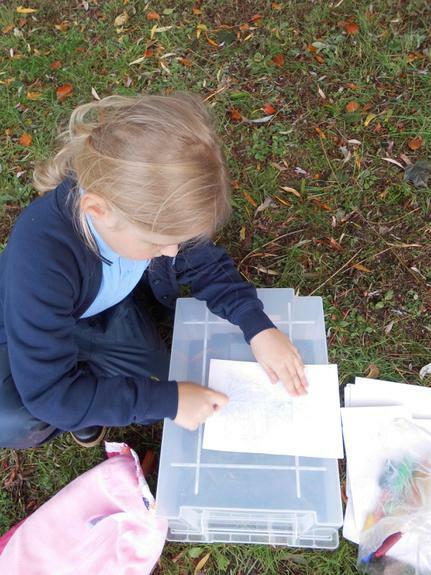 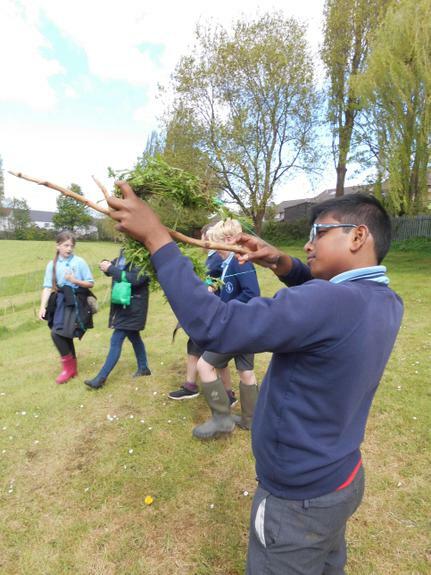 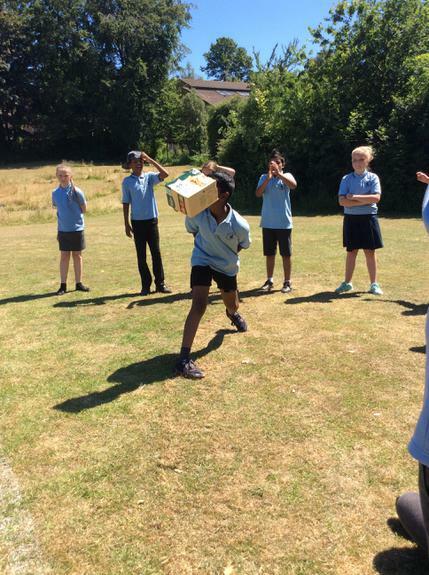 Year 4 collect materials to make outdoor pictures. 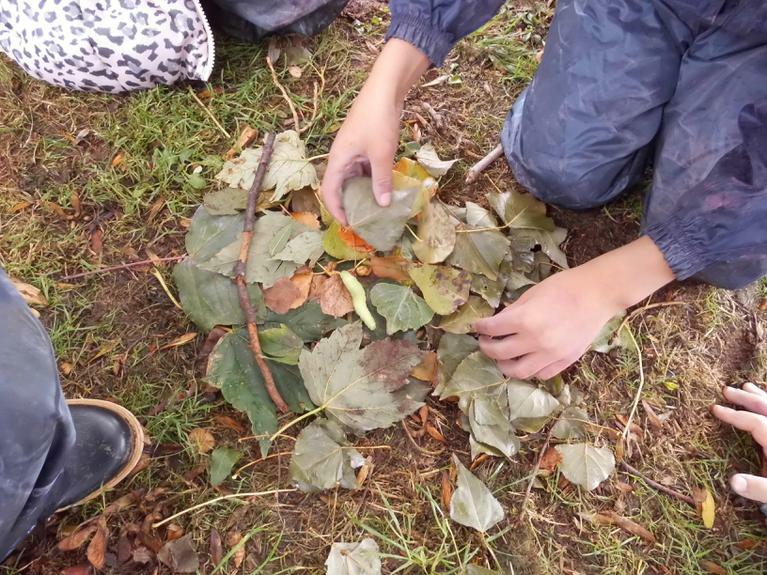 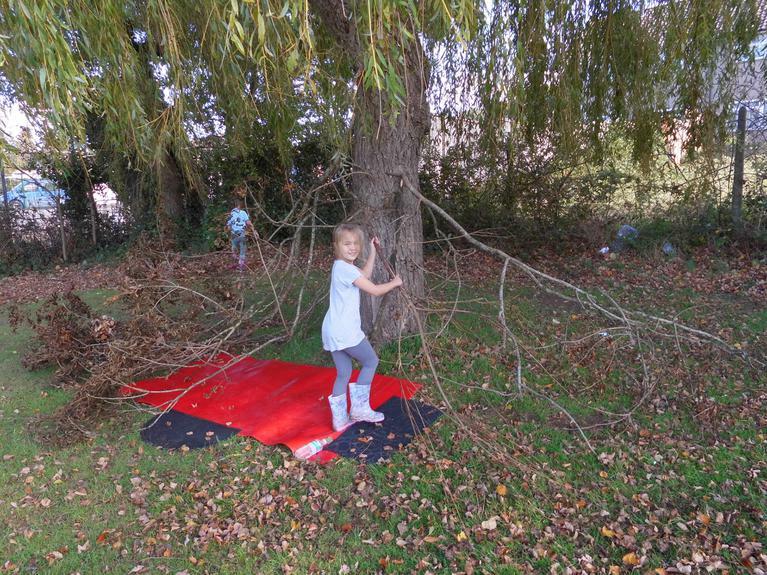 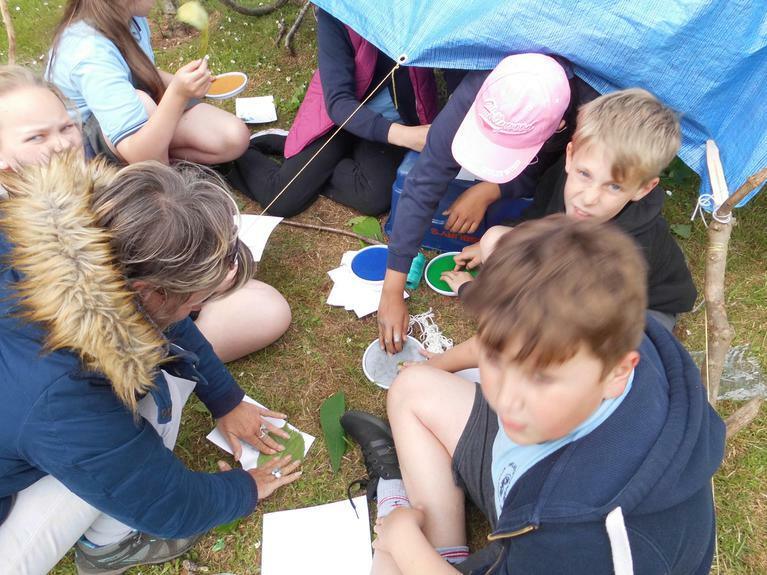 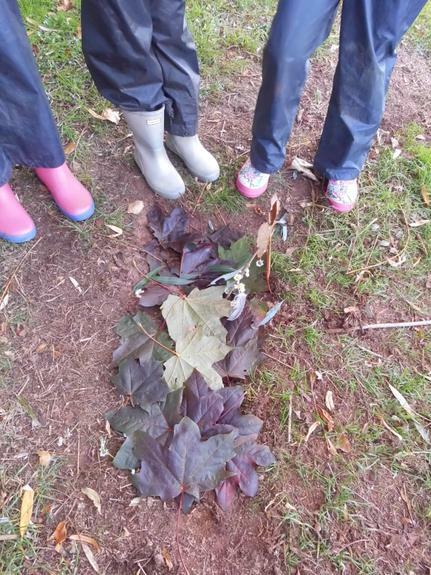 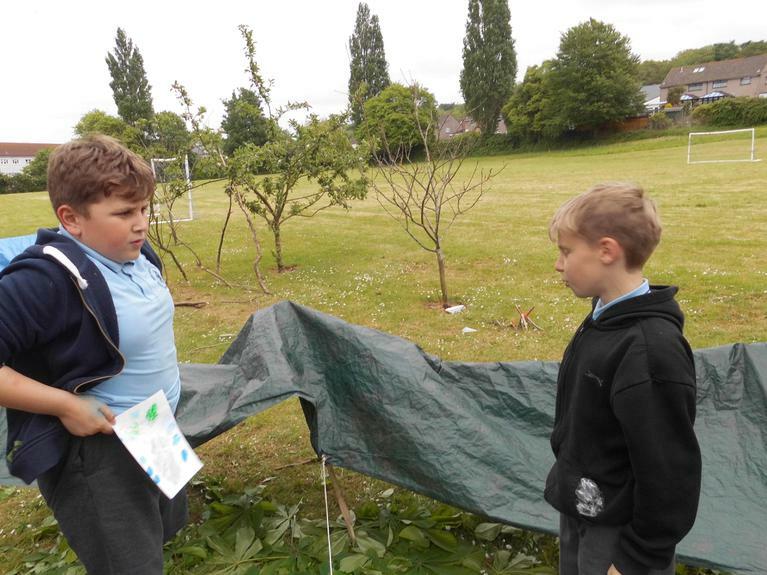 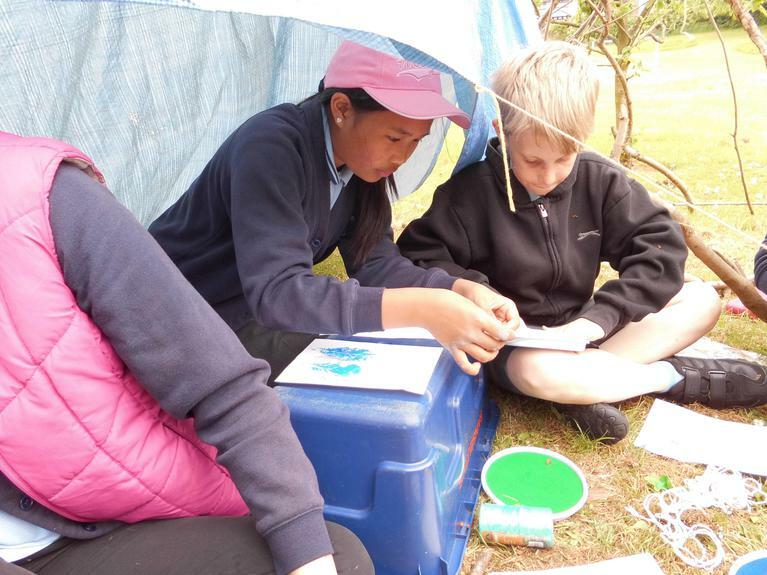 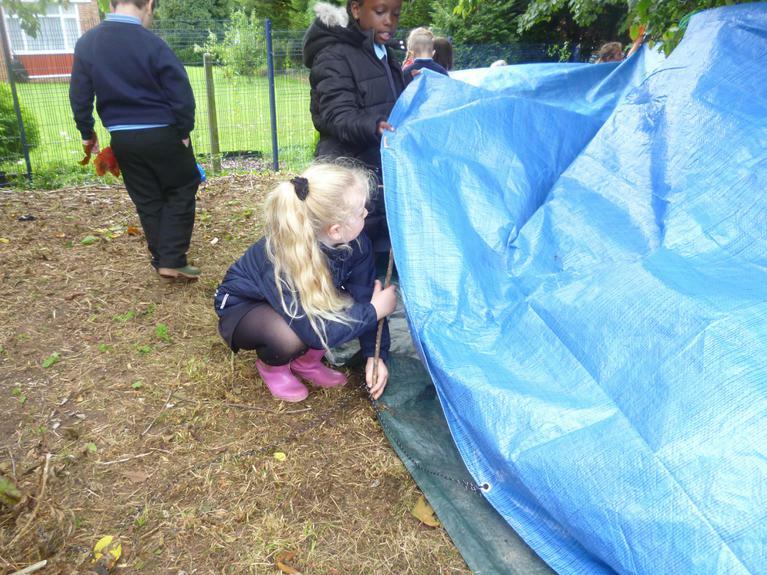 Y3 Make shelters and print leaves. 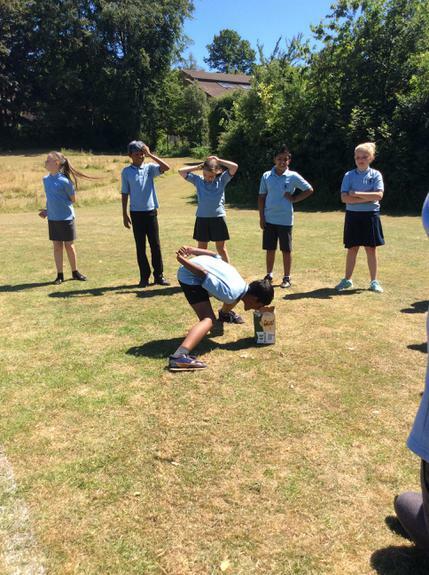 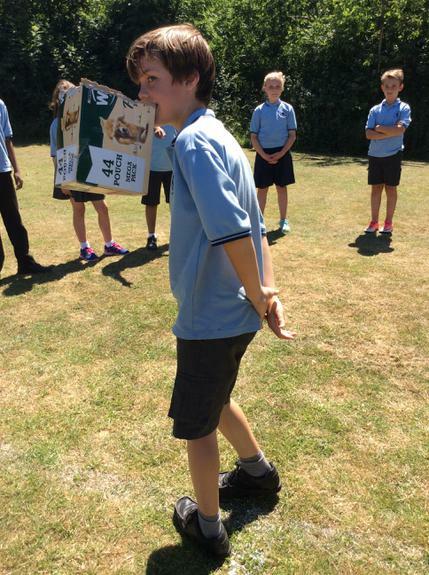 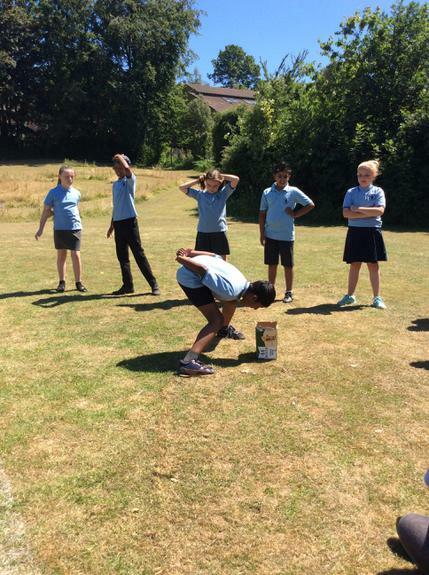 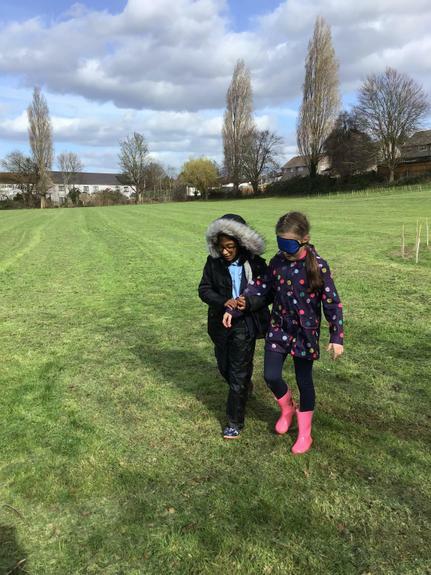 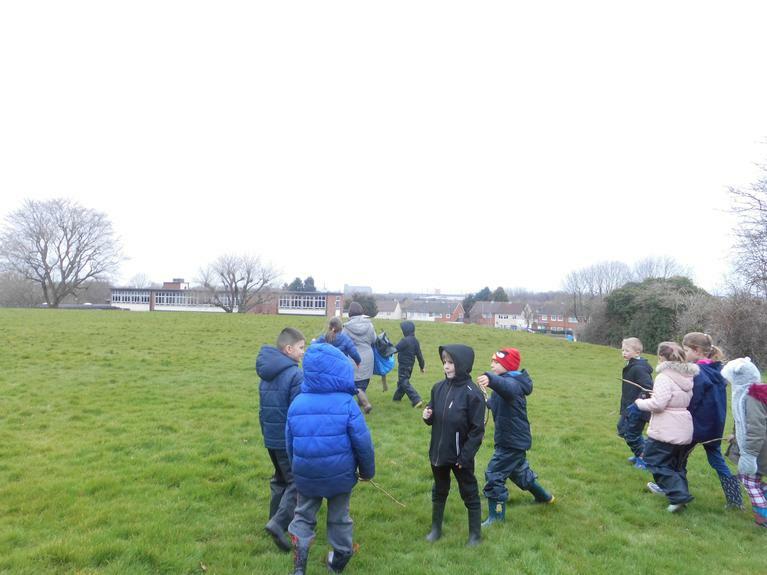 Y3 go on a Smell Trail! 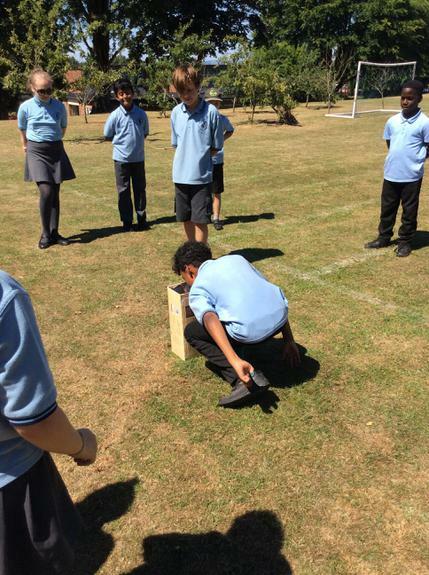 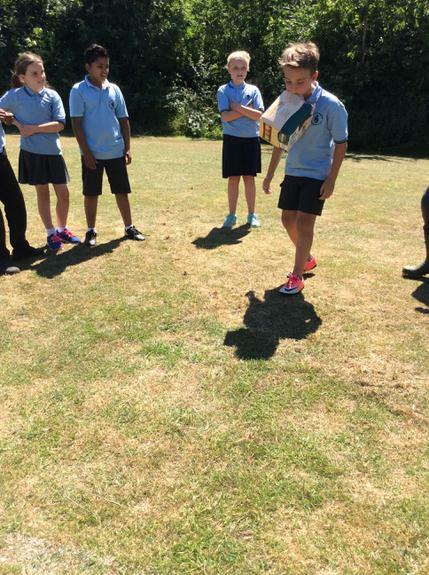 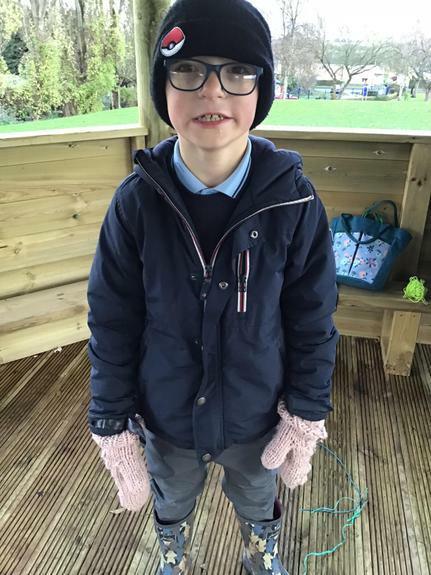 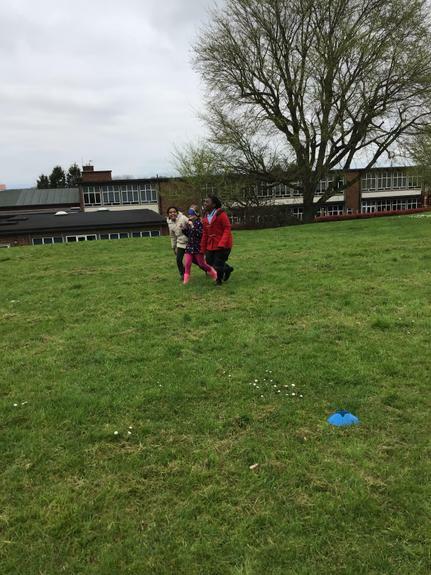 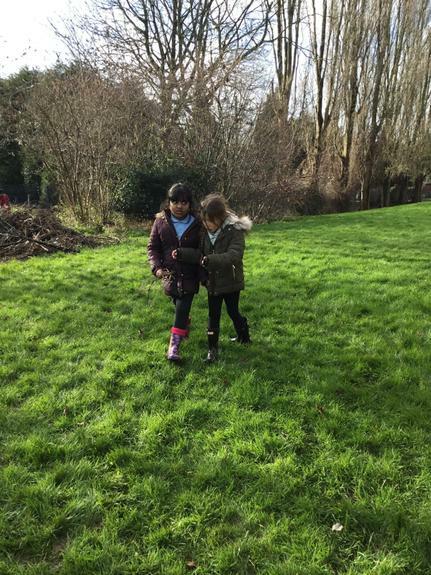 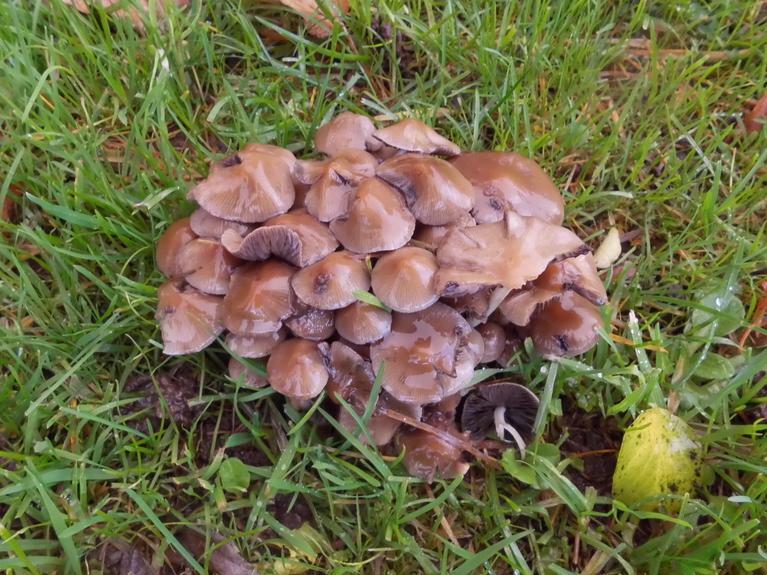 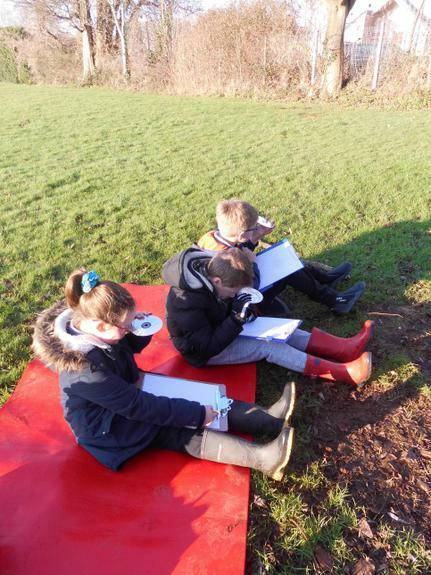 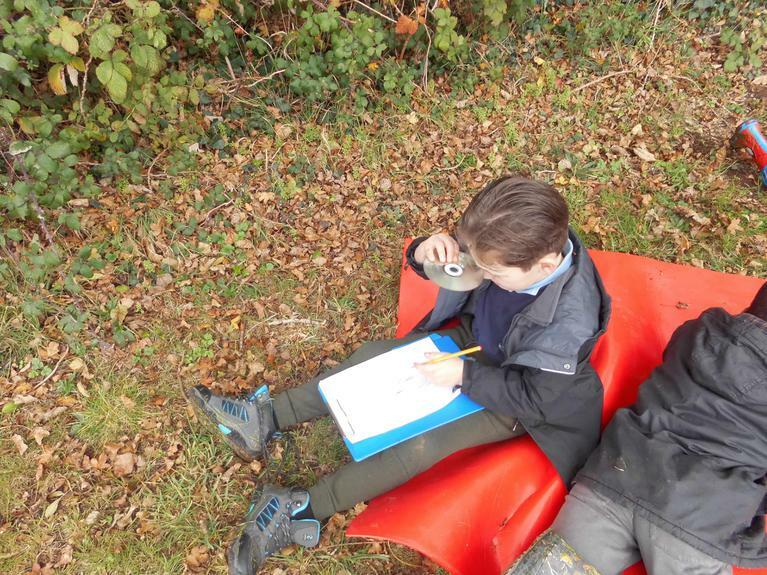 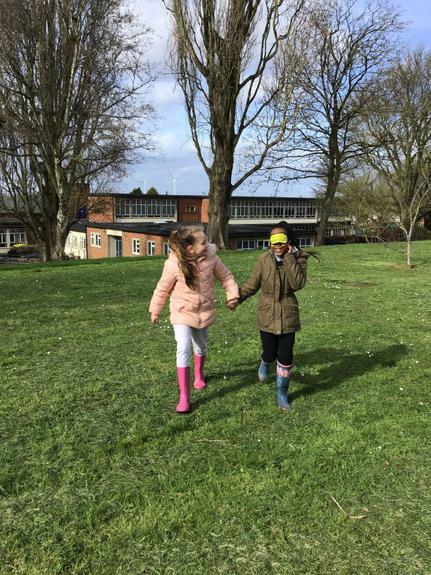 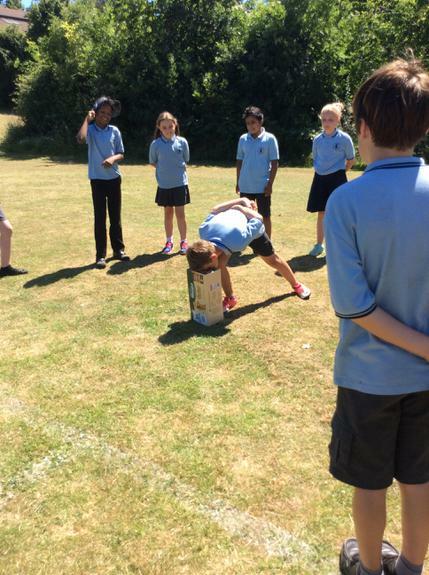 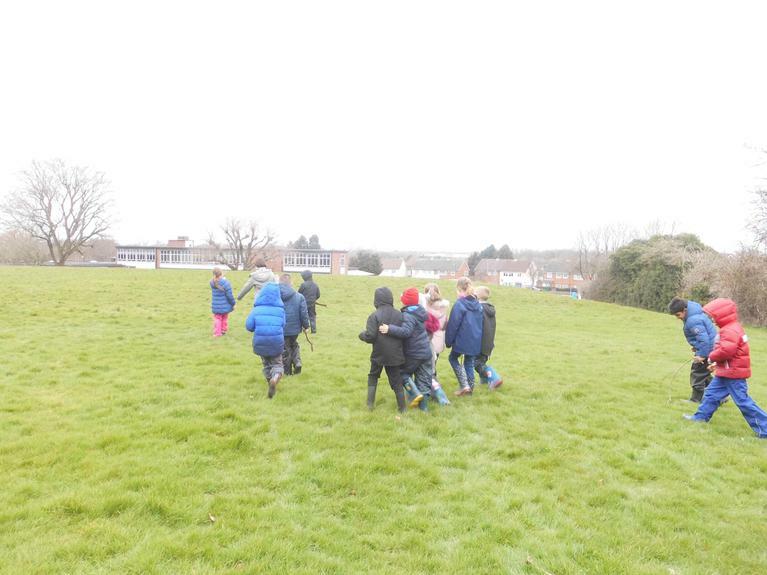 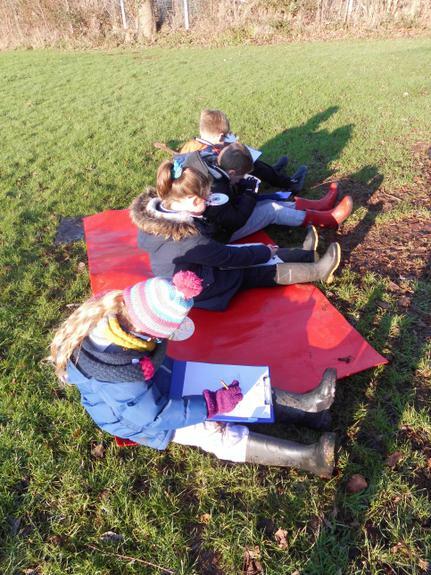 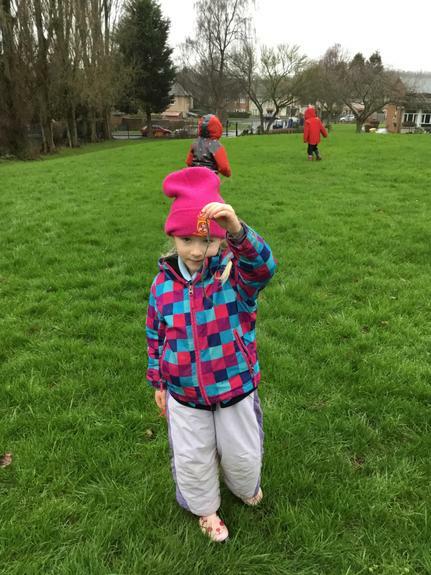 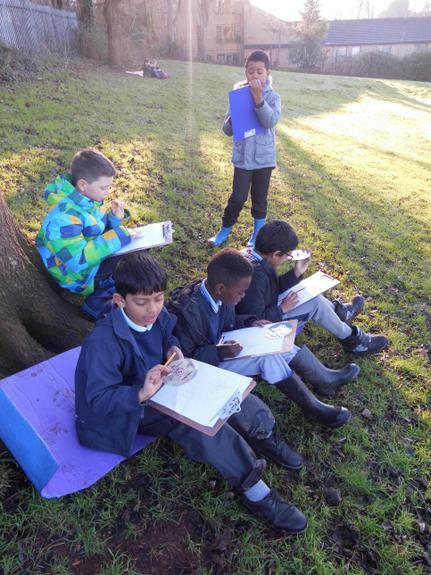 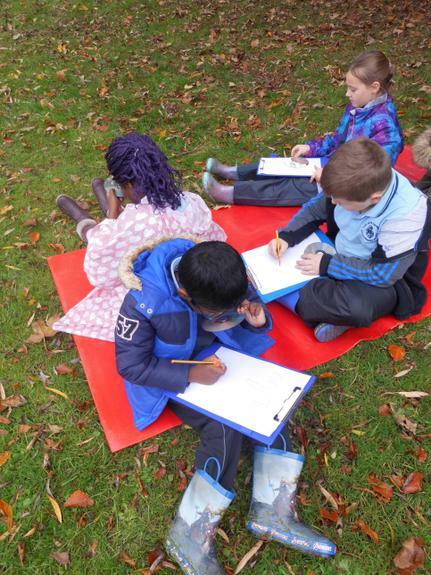 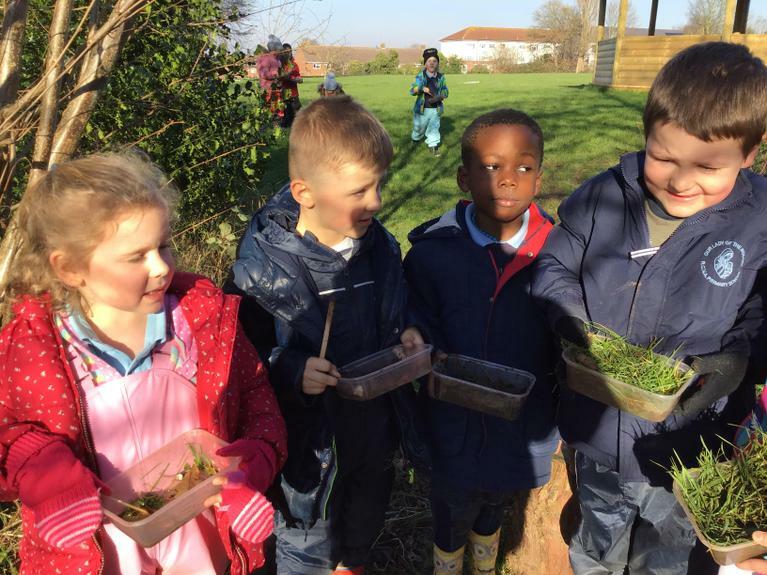 Year 3 have been exploring the school grounds. 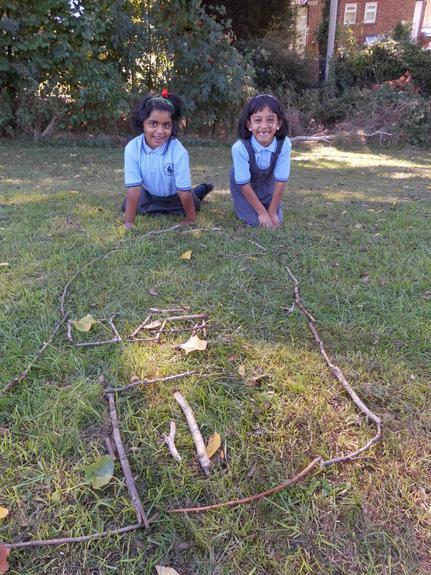 They used natural materials to create peces of art. 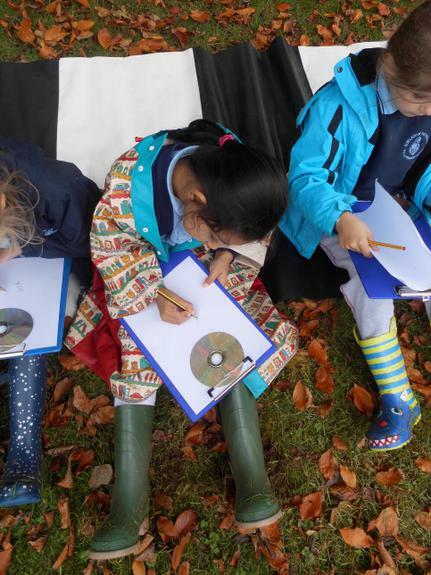 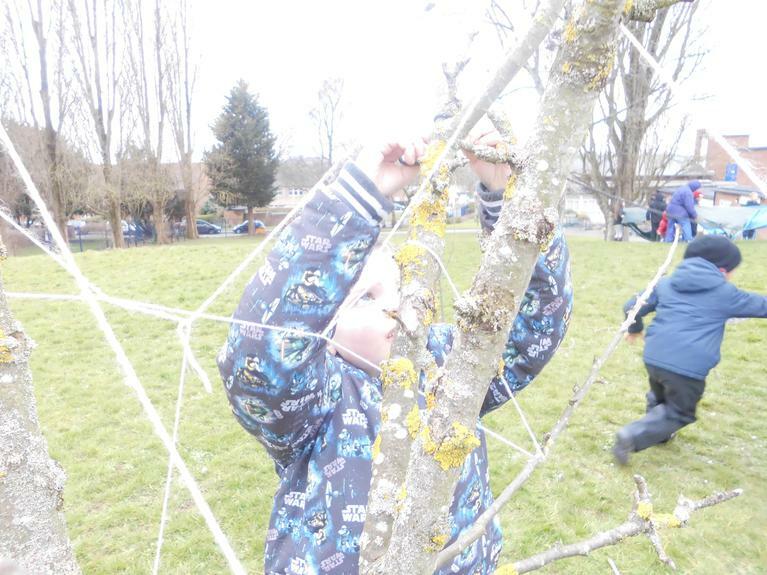 The children explored the world above their heads using 'CD mirrors' and created upside down drawings. 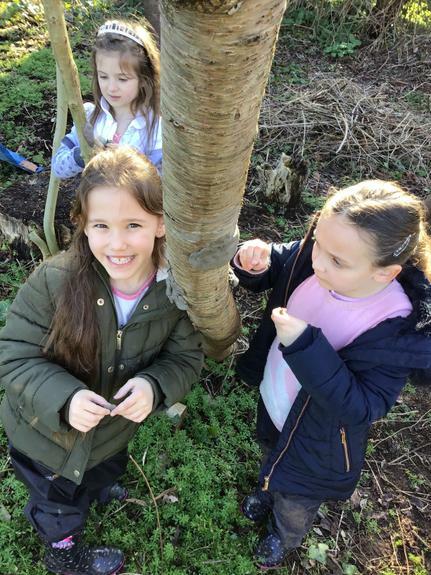 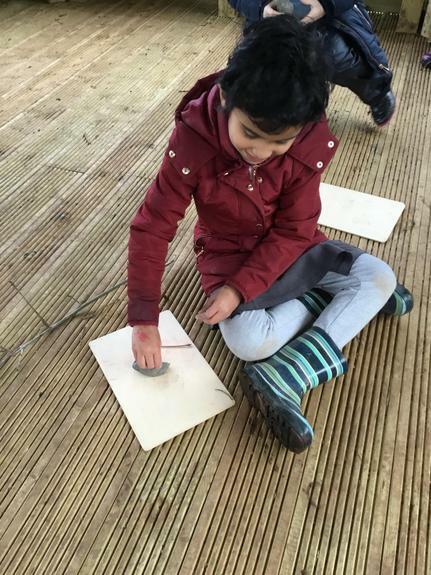 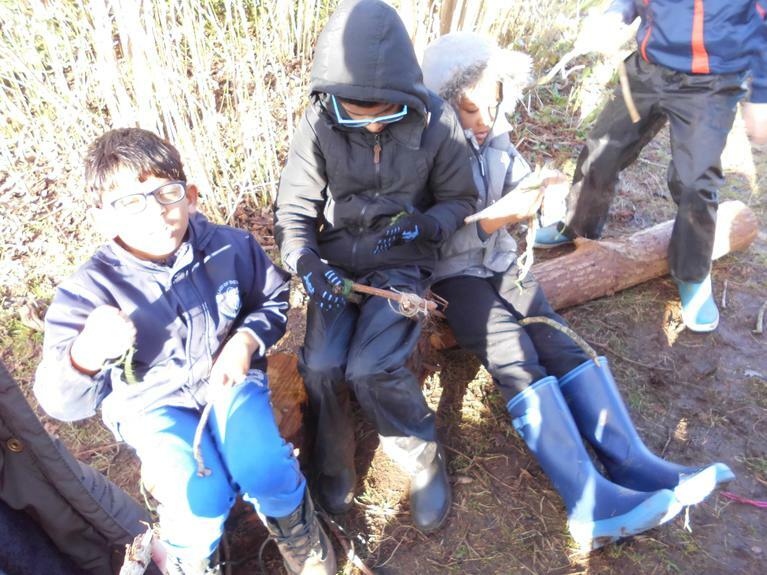 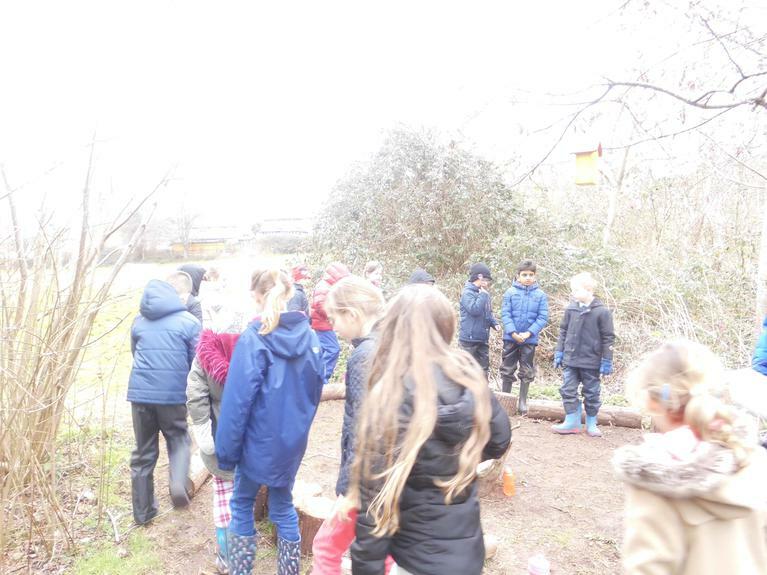 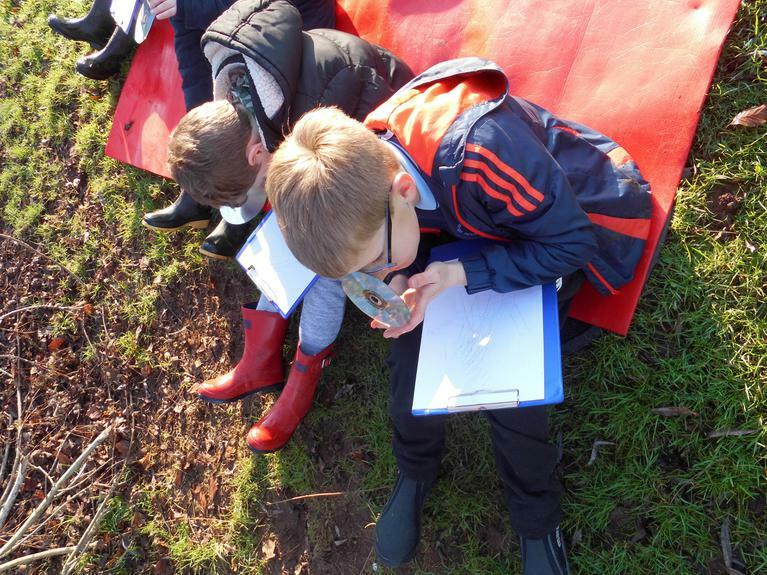 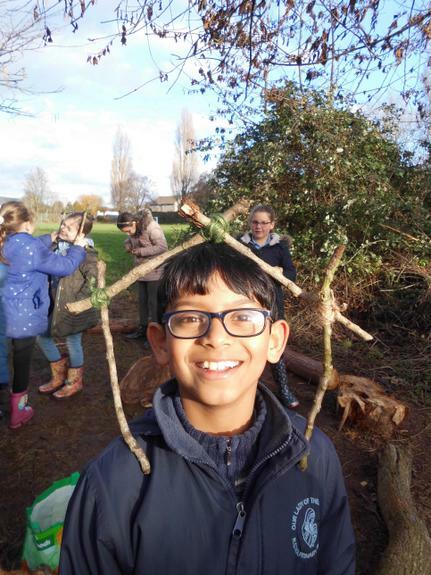 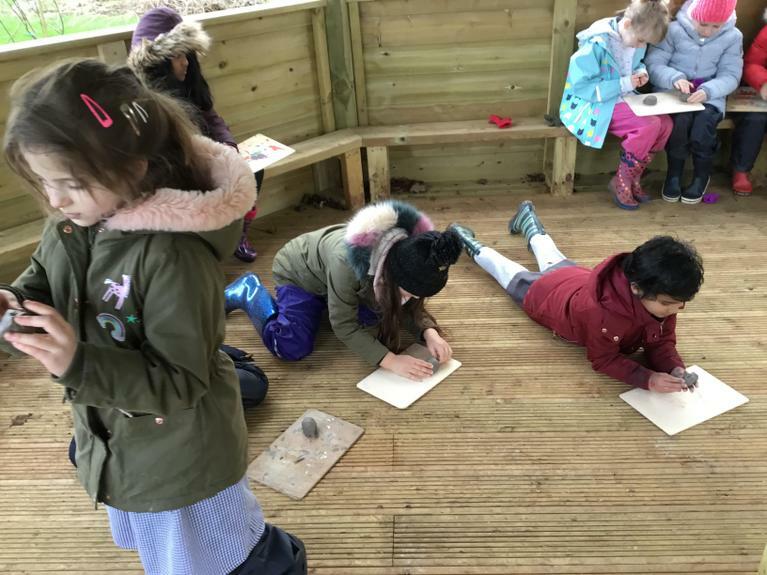 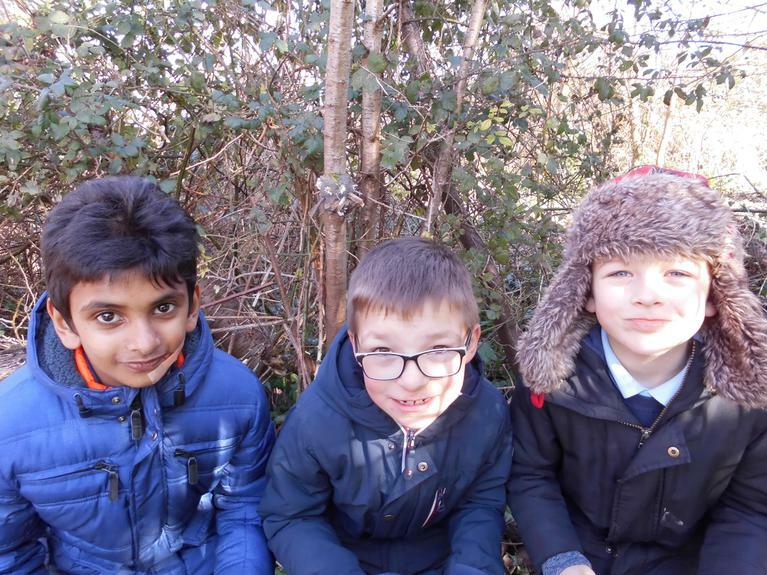 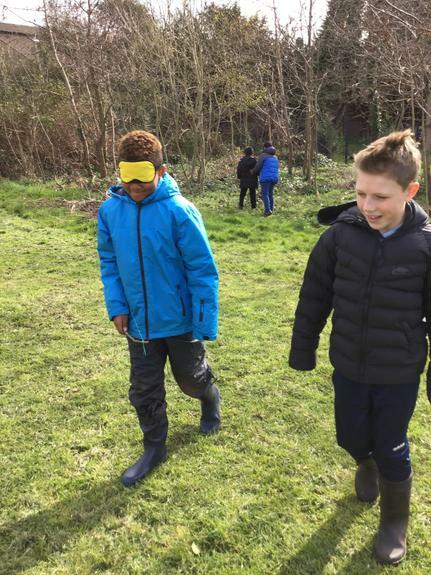 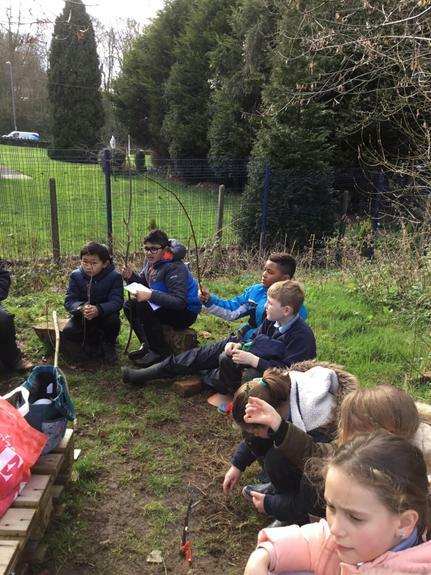 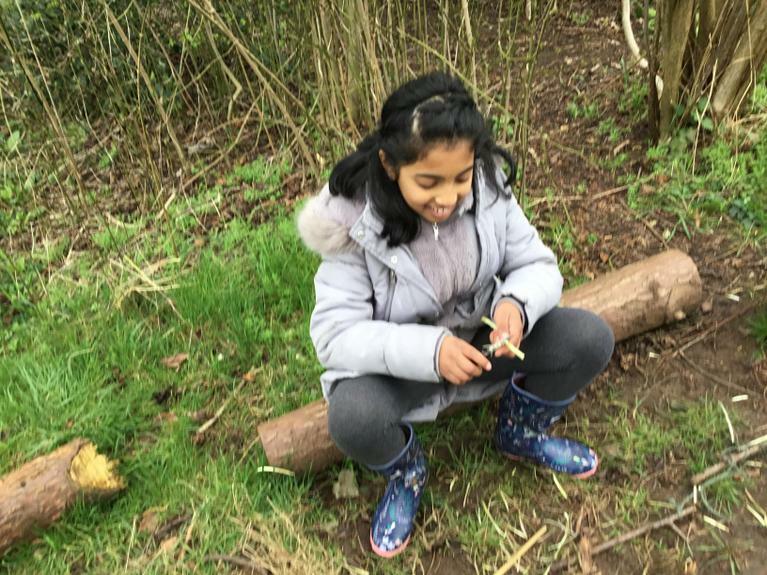 Year 4 Forest school . 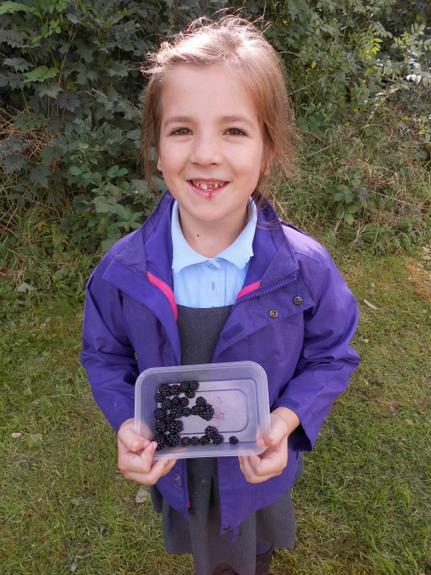 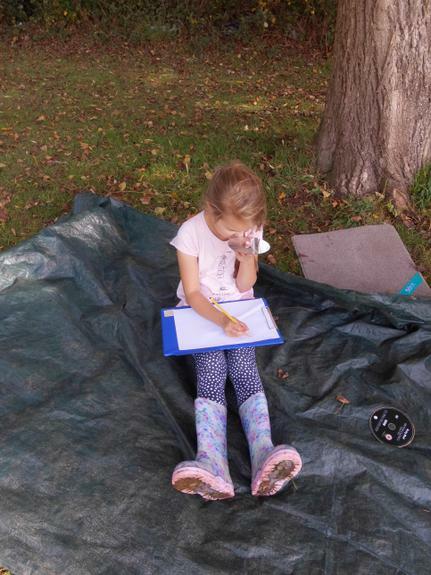 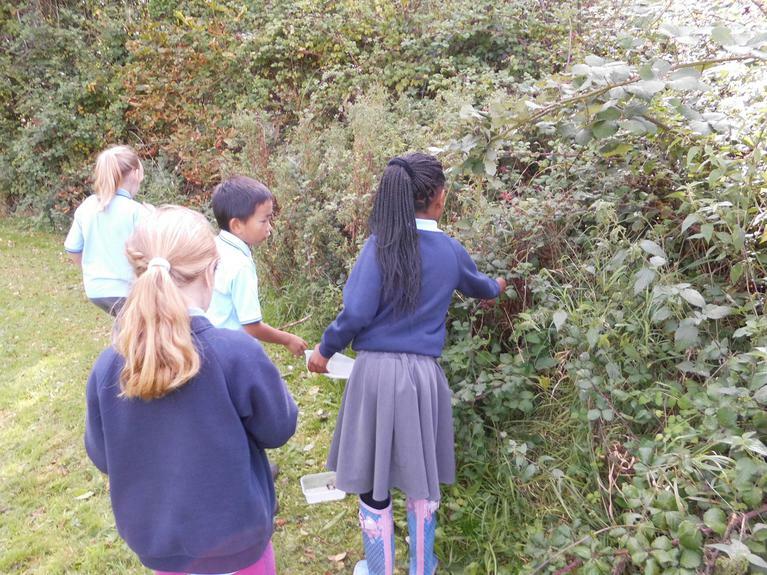 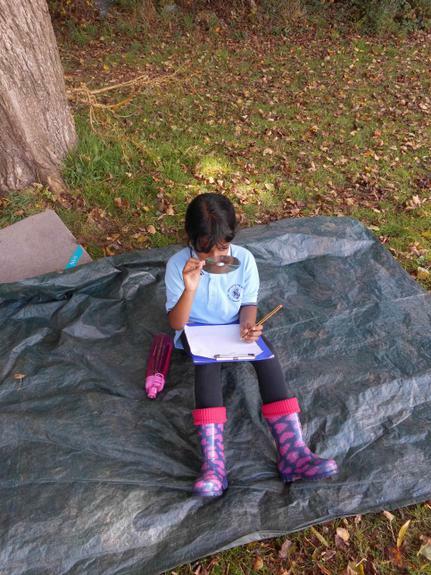 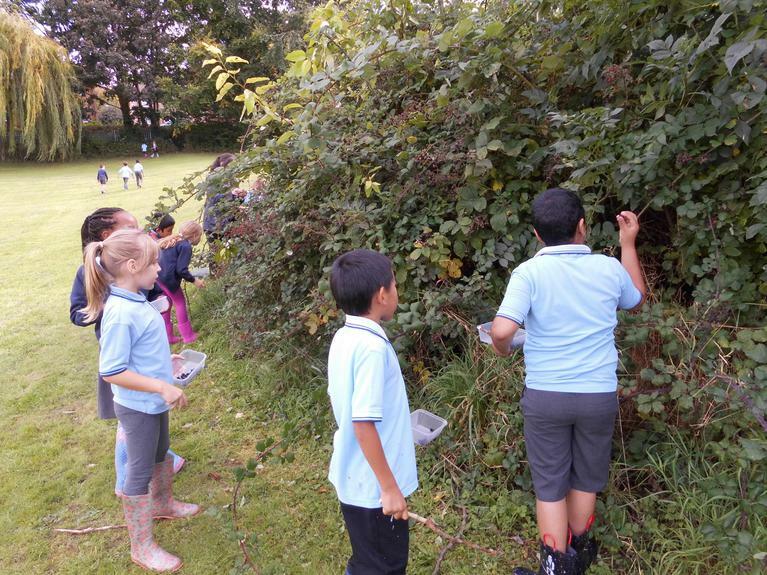 So far in Forest school Year 4 have been foraging for blackberries, made pictures from natural objects, been on a tree canopy walk and made some tree canopy sketches. 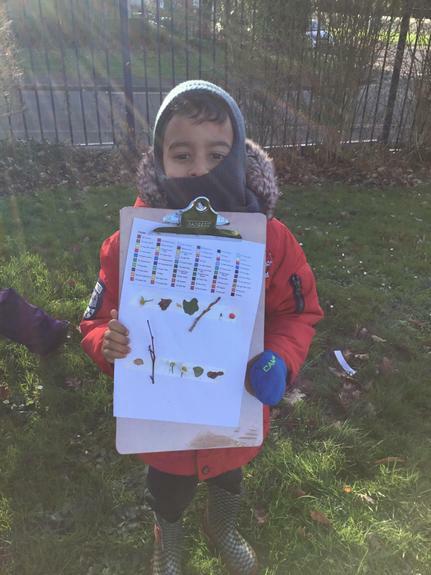 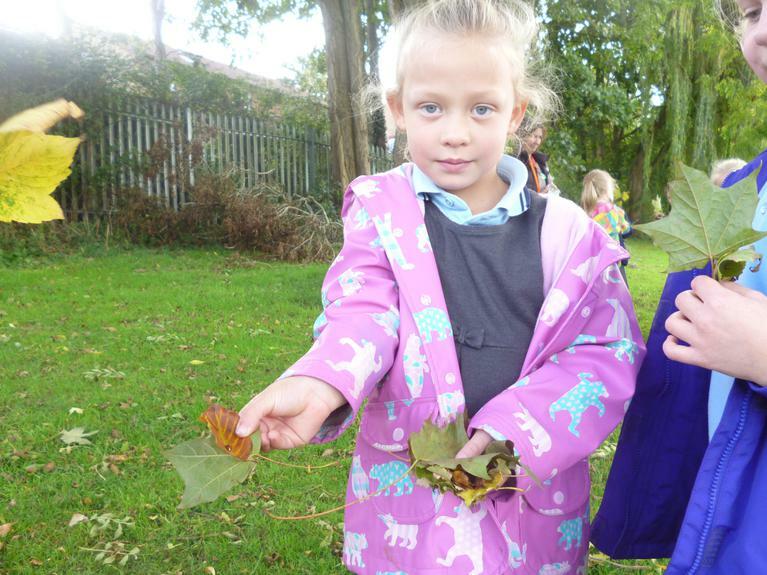 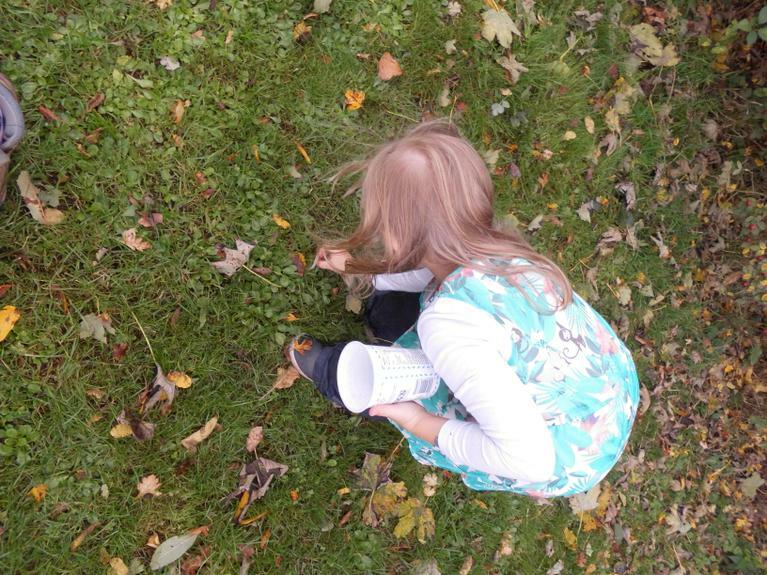 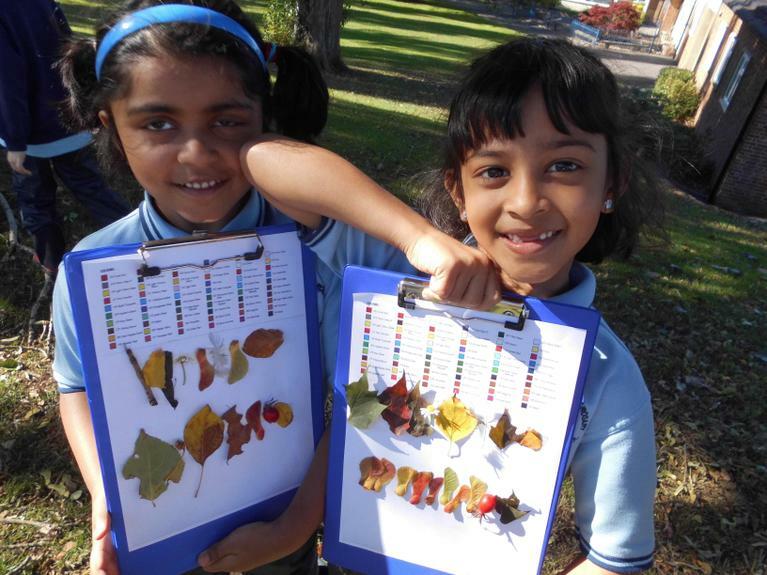 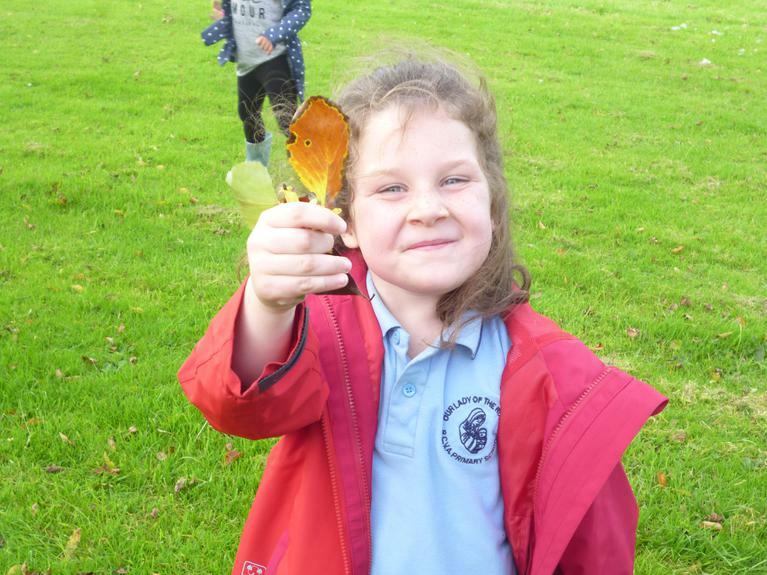 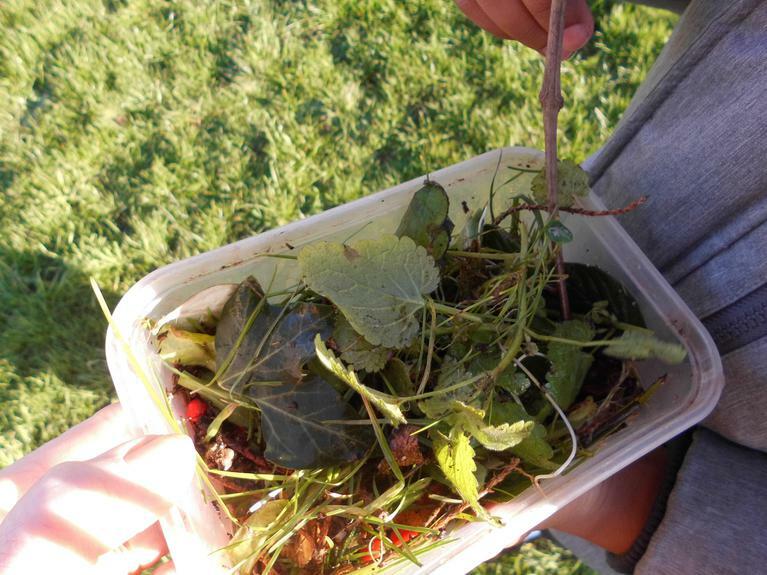 Year 2 collected and identified leaves. 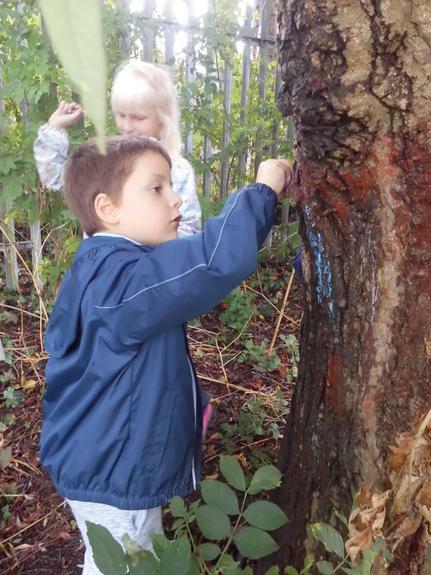 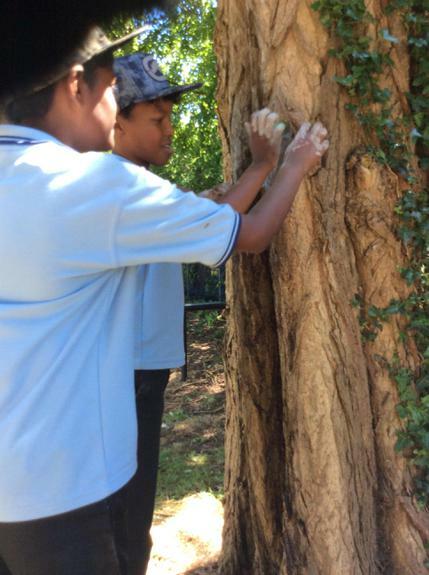 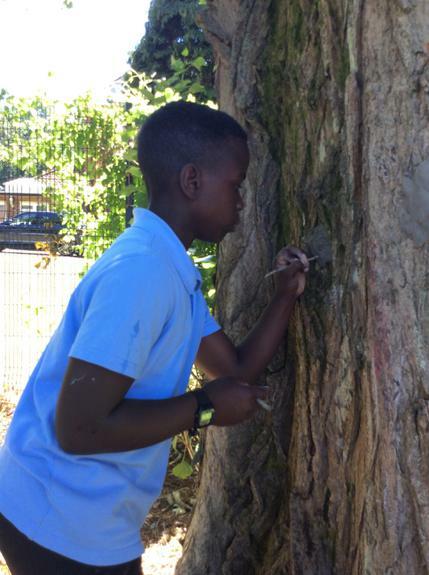 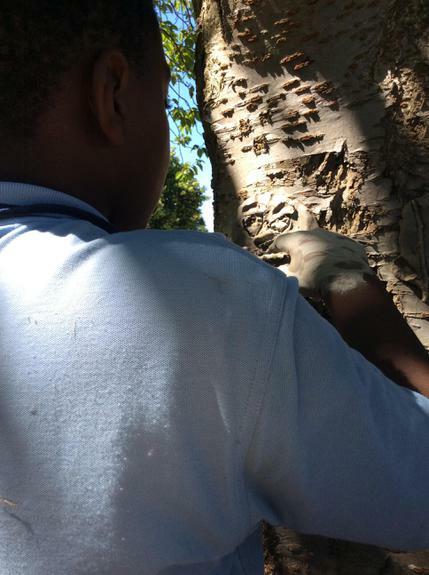 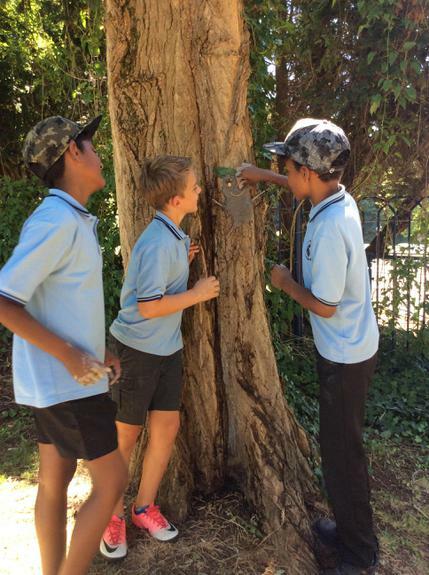 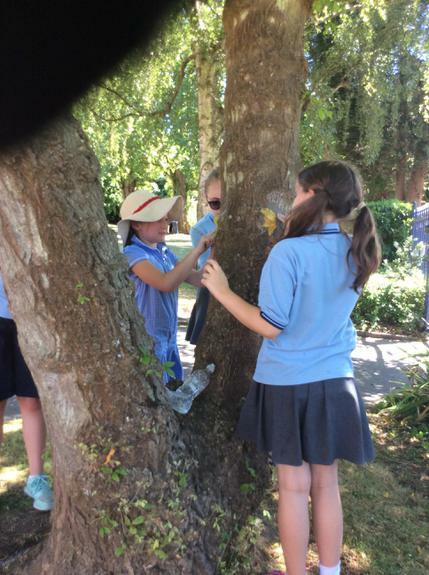 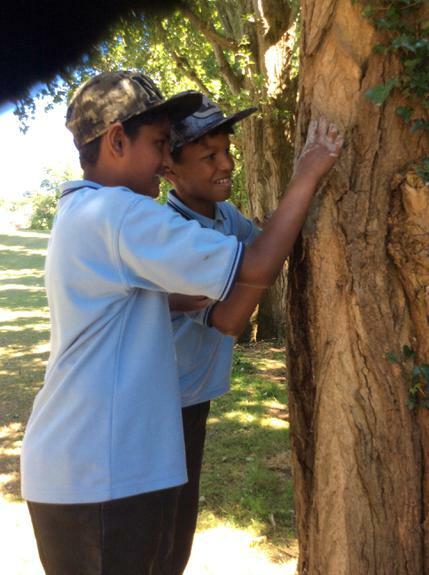 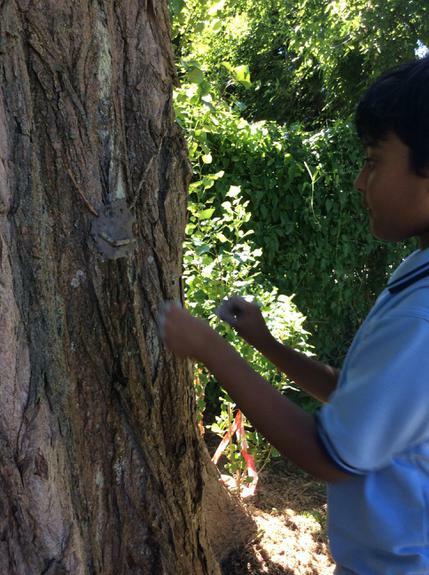 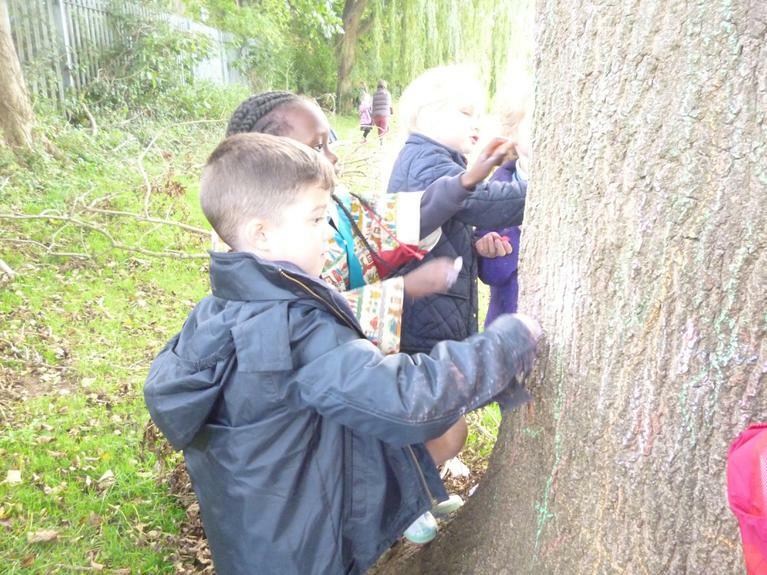 They examined tree bark and decorated different tree trunks with coloured chalks. 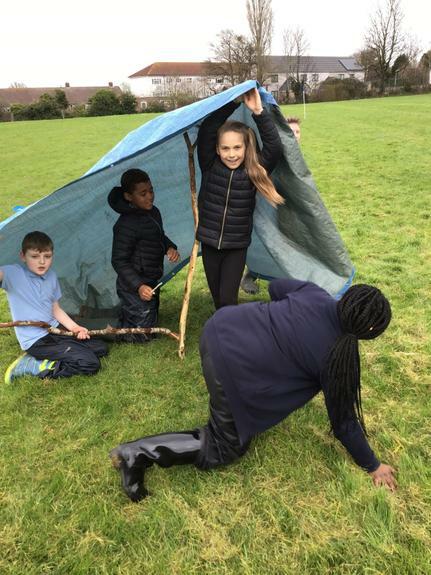 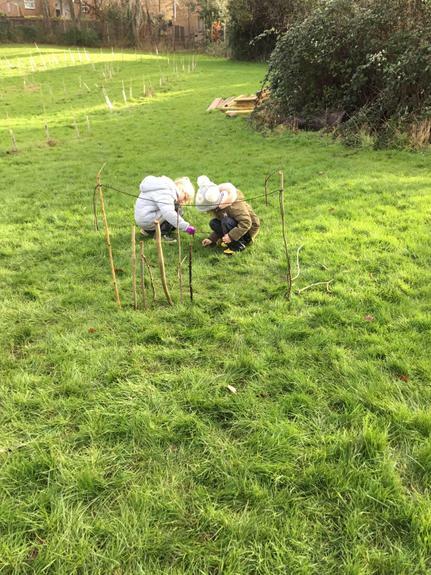 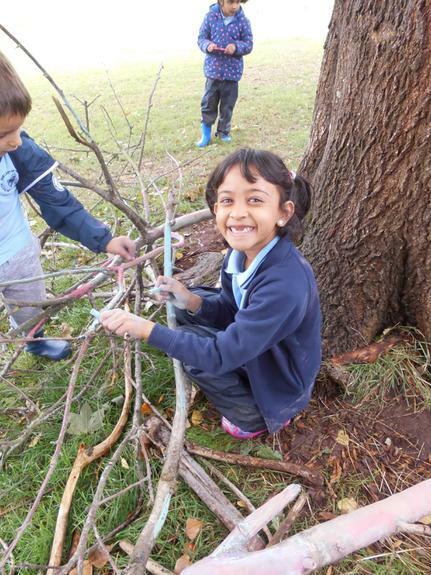 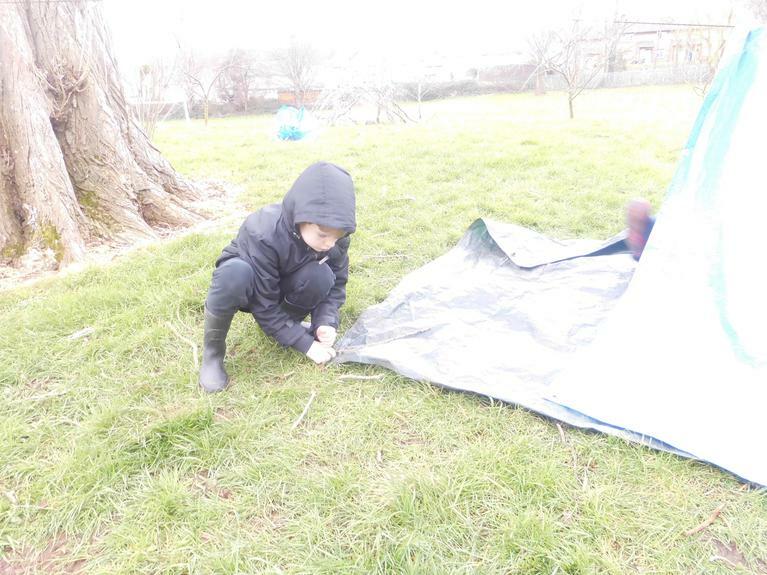 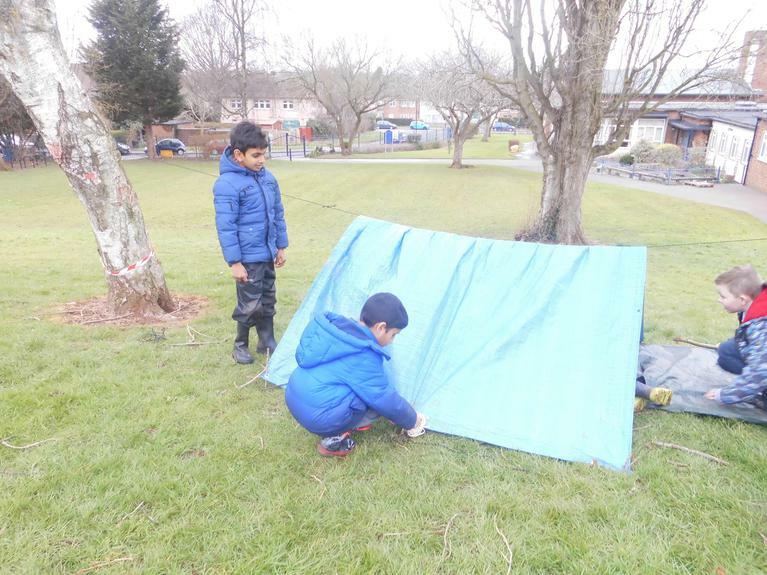 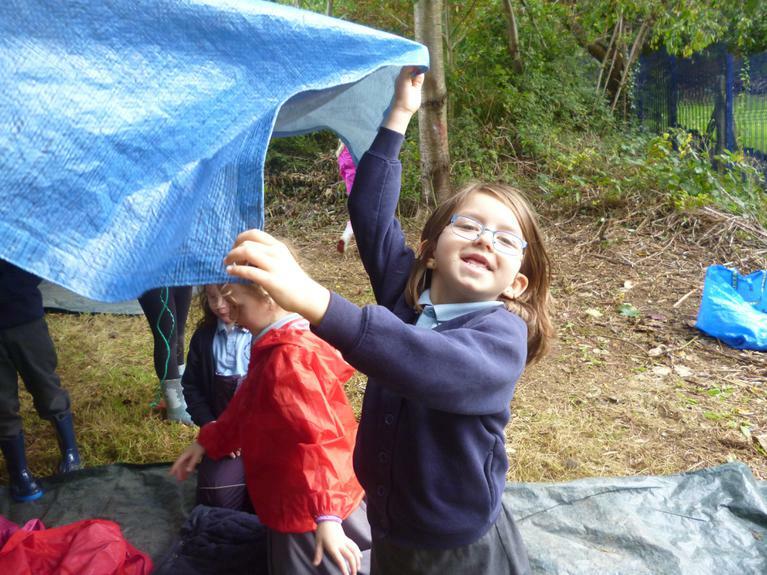 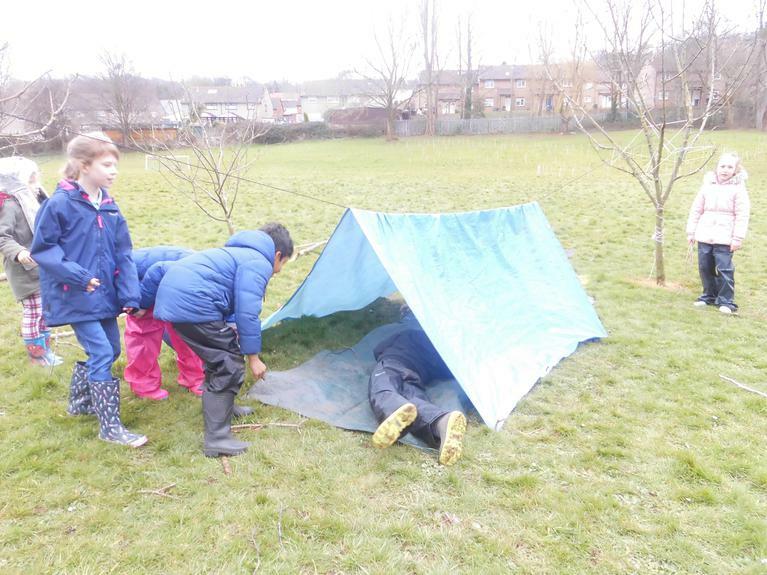 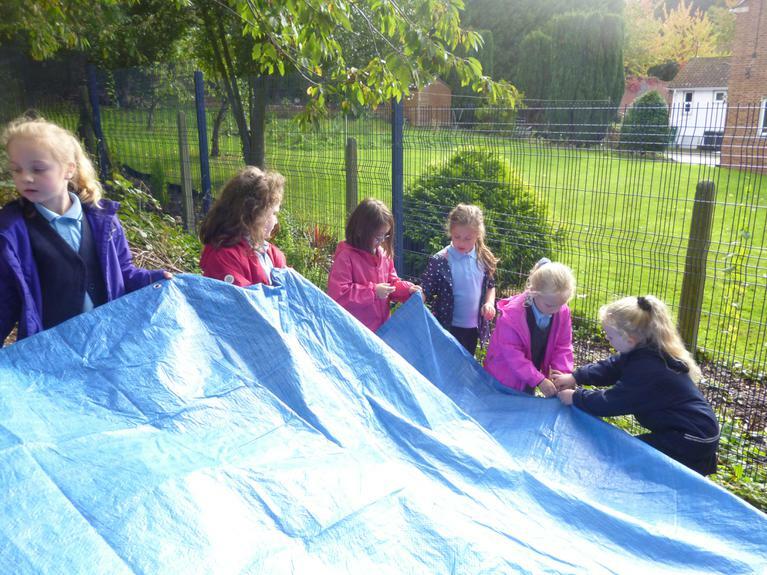 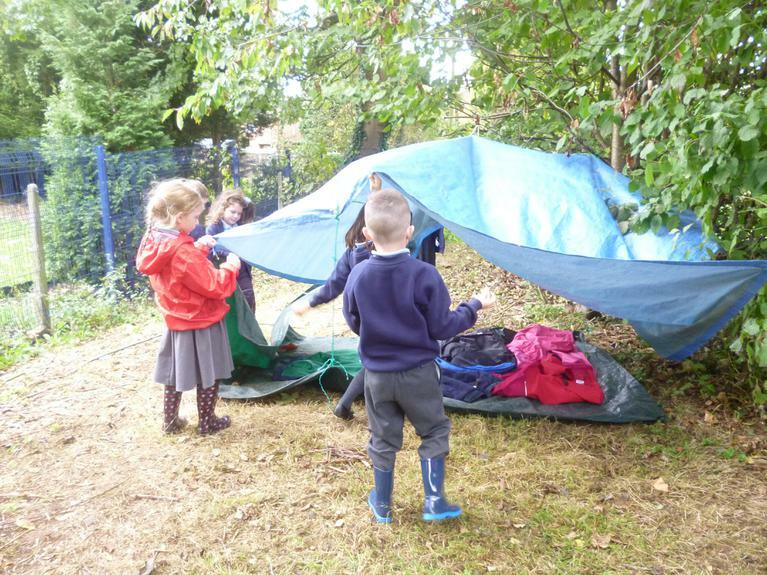 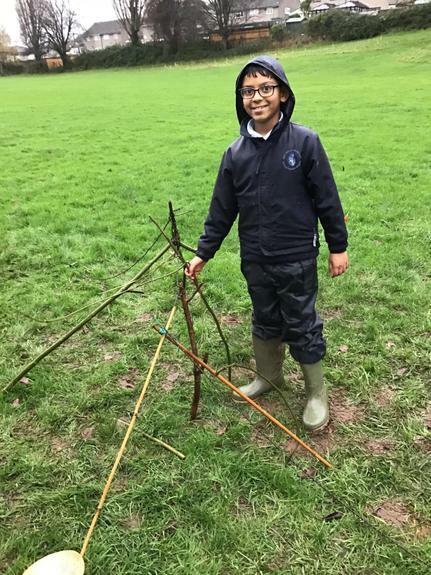 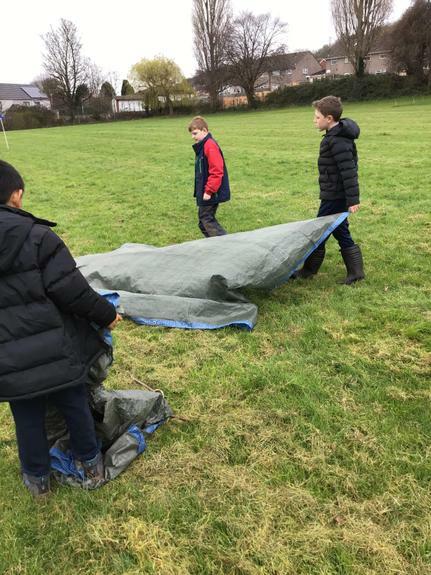 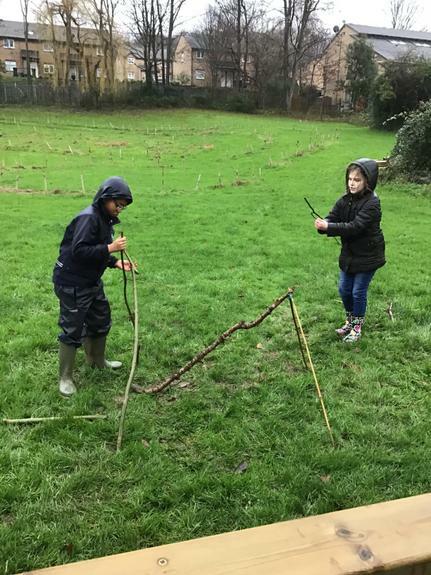 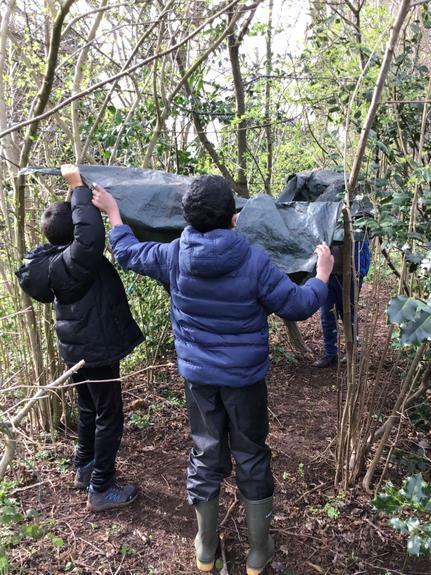 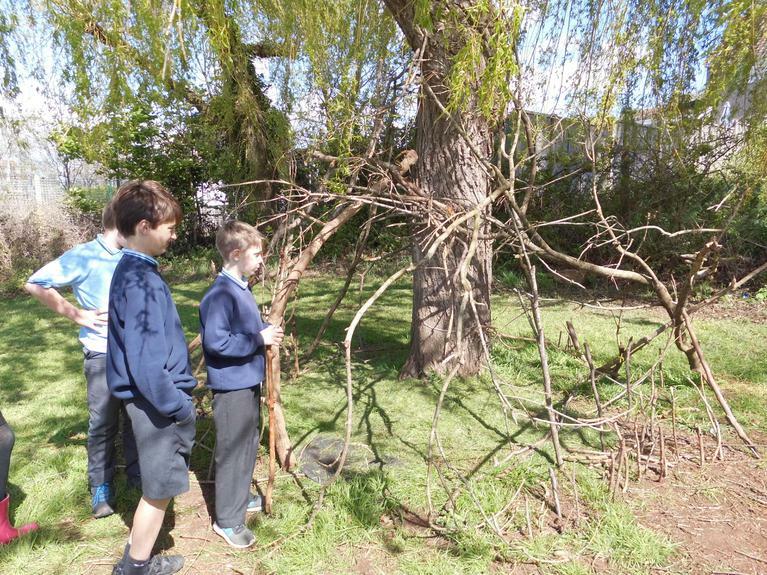 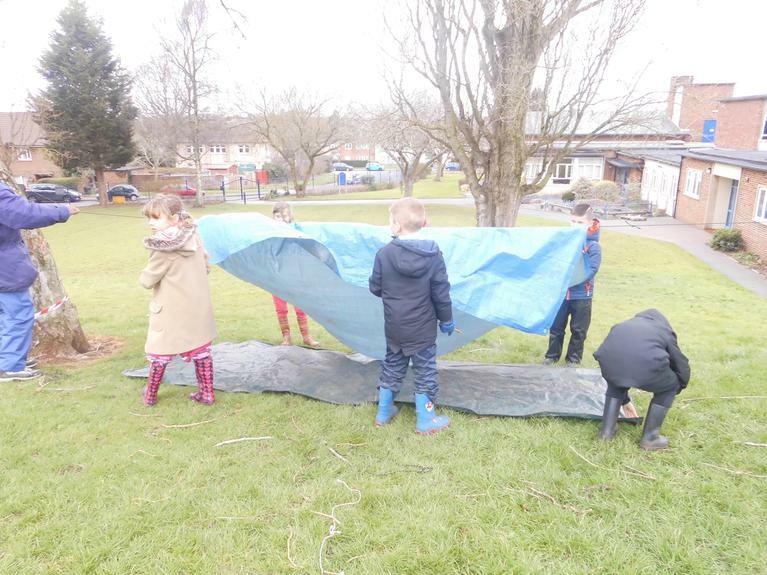 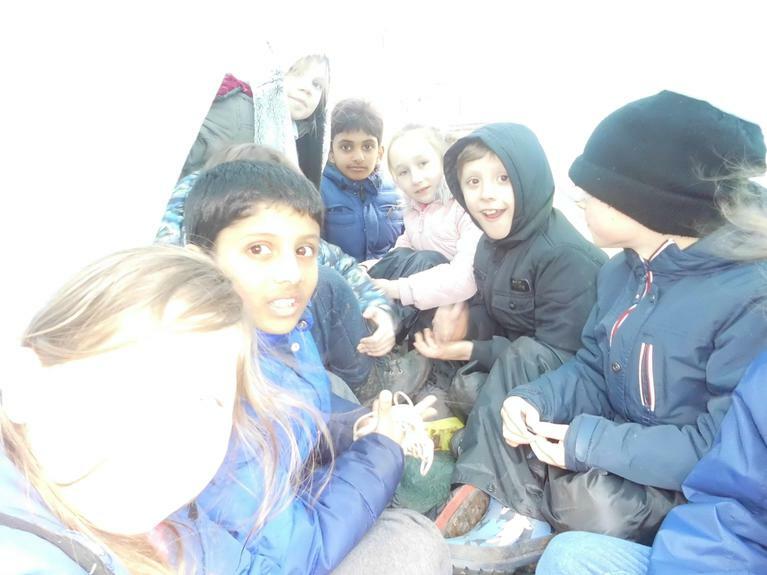 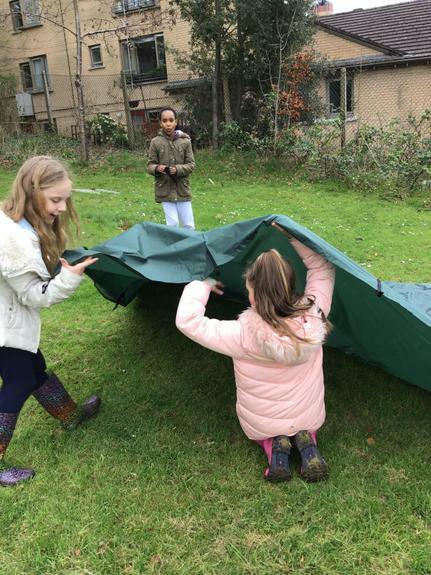 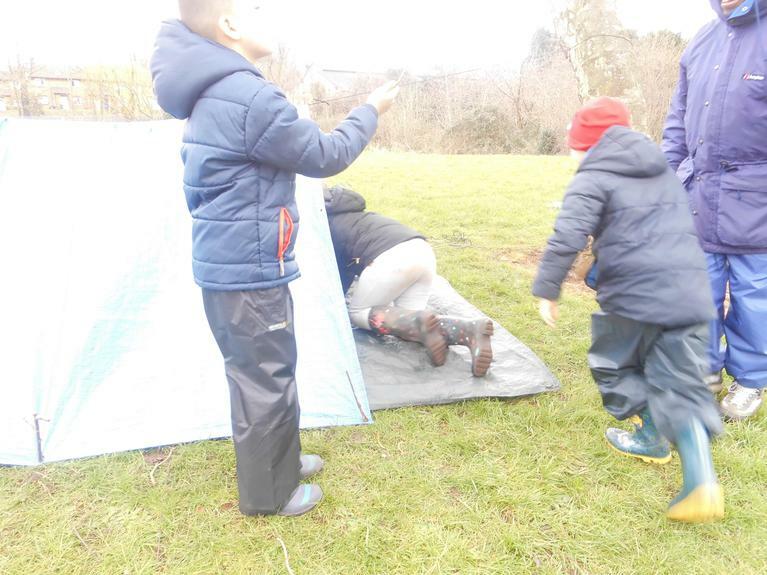 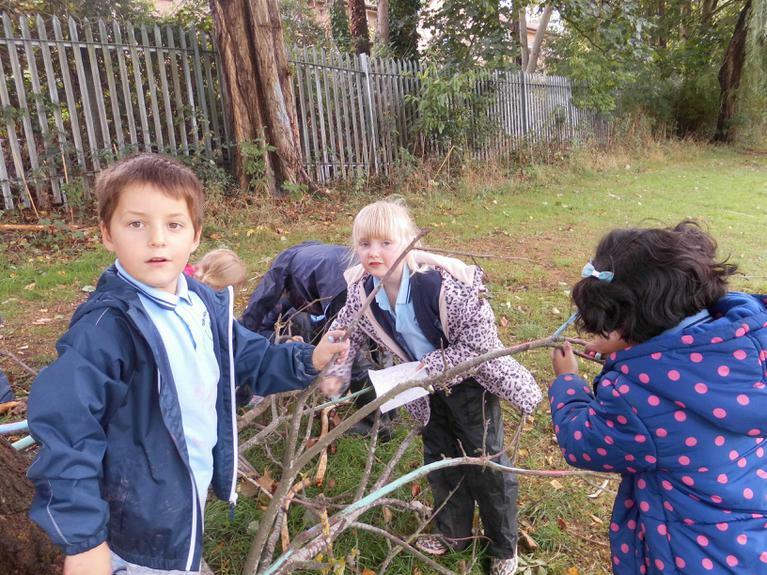 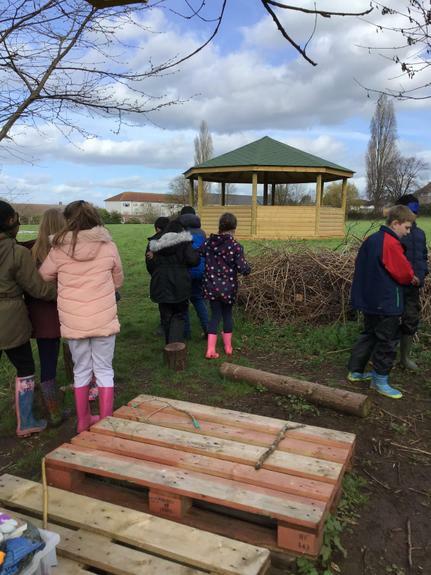 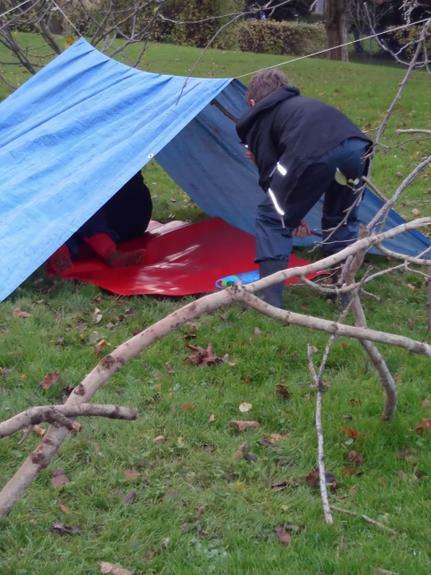 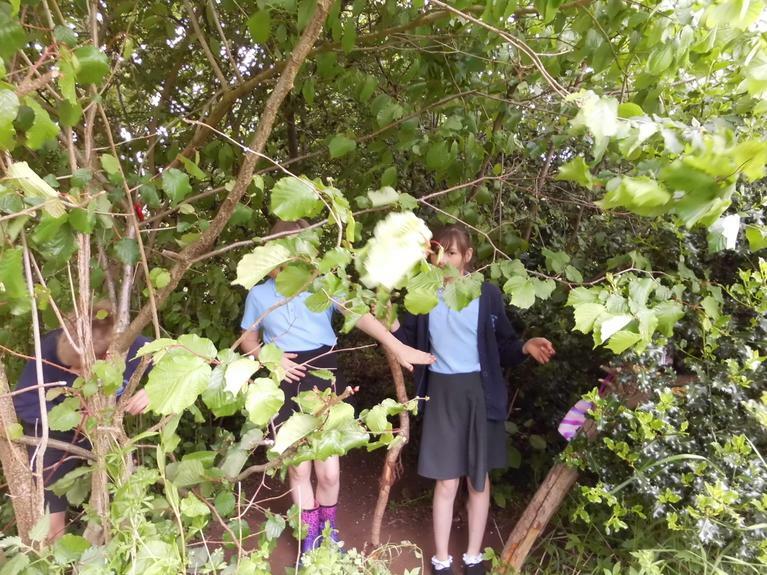 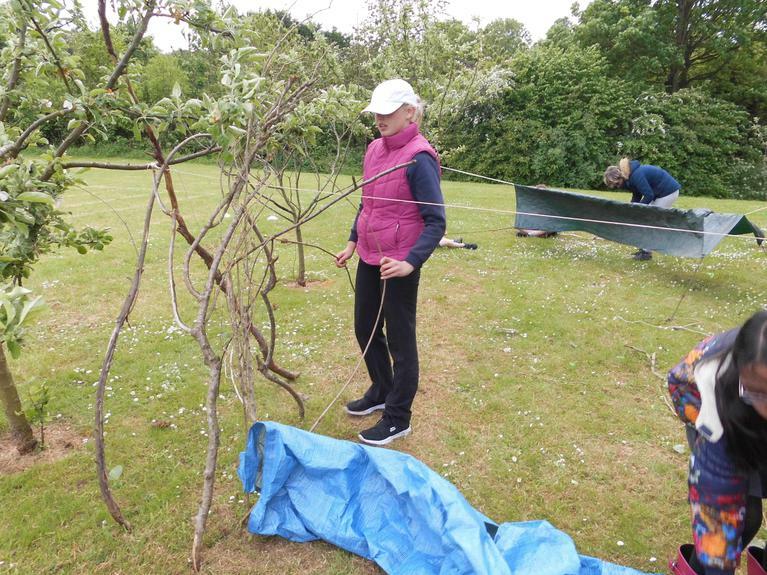 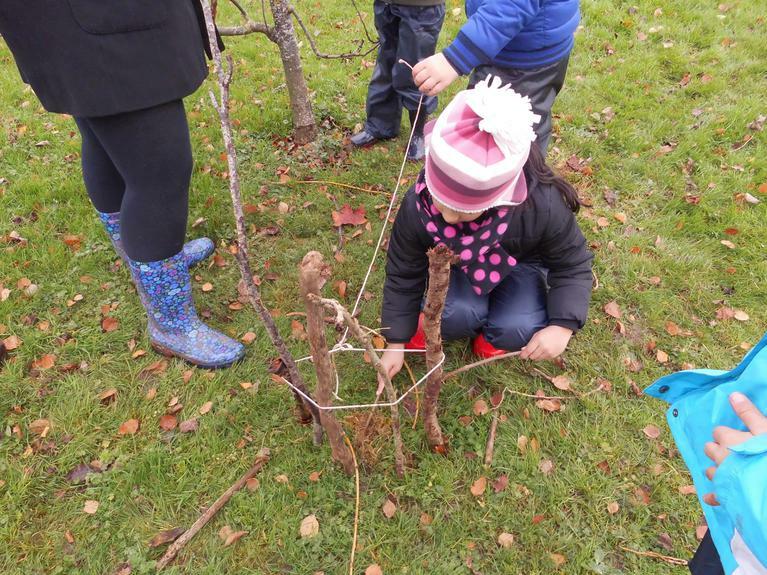 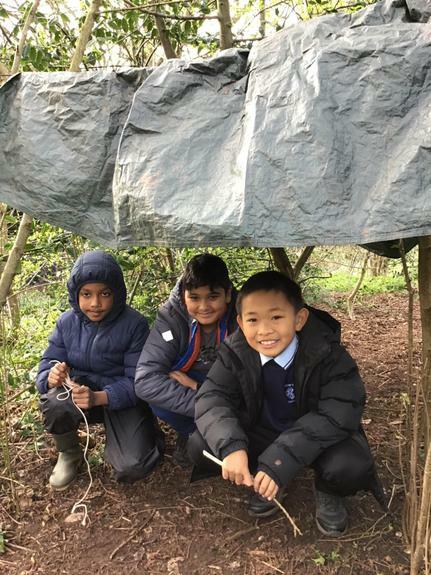 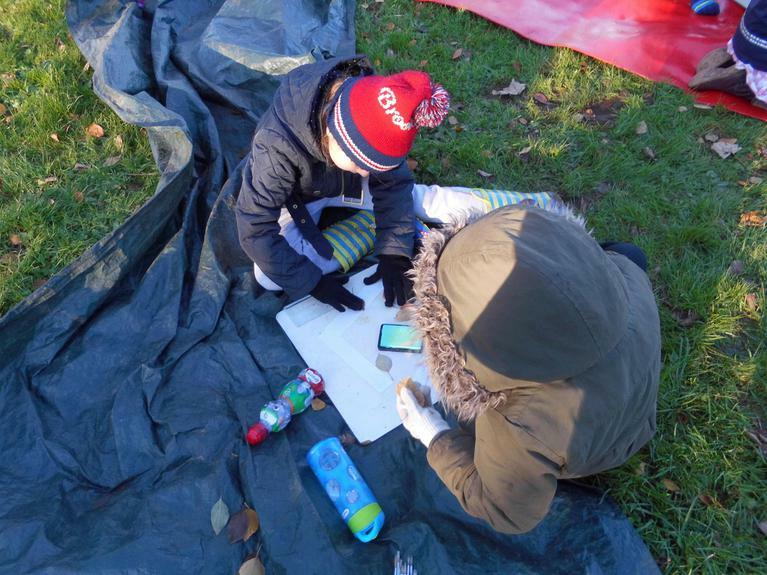 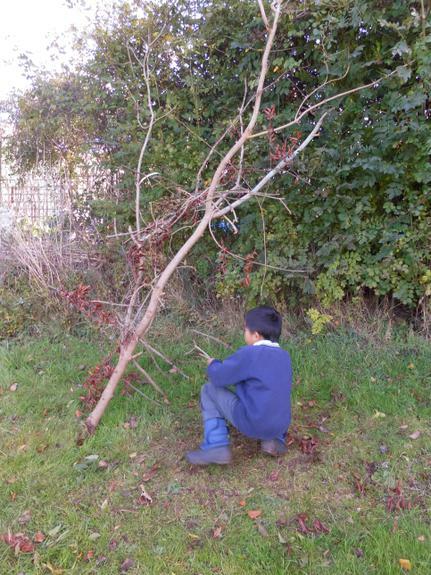 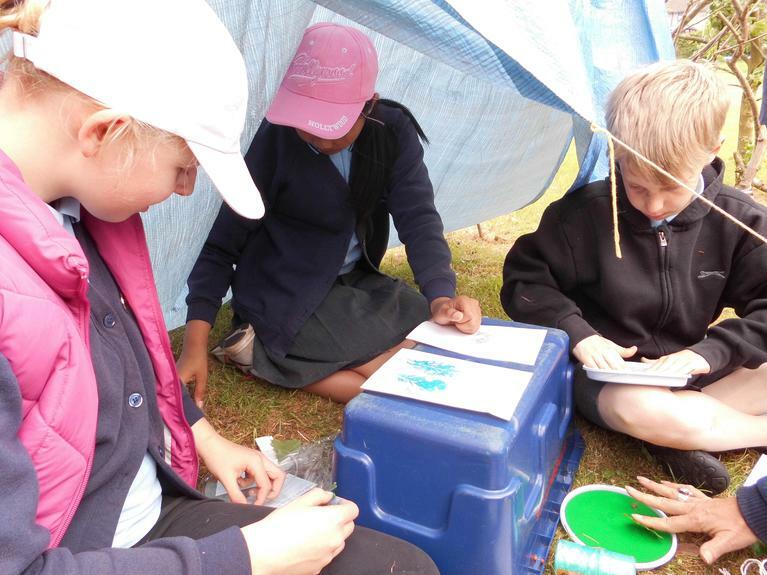 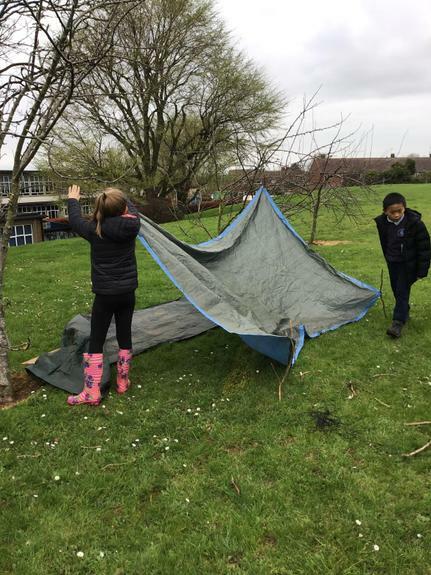 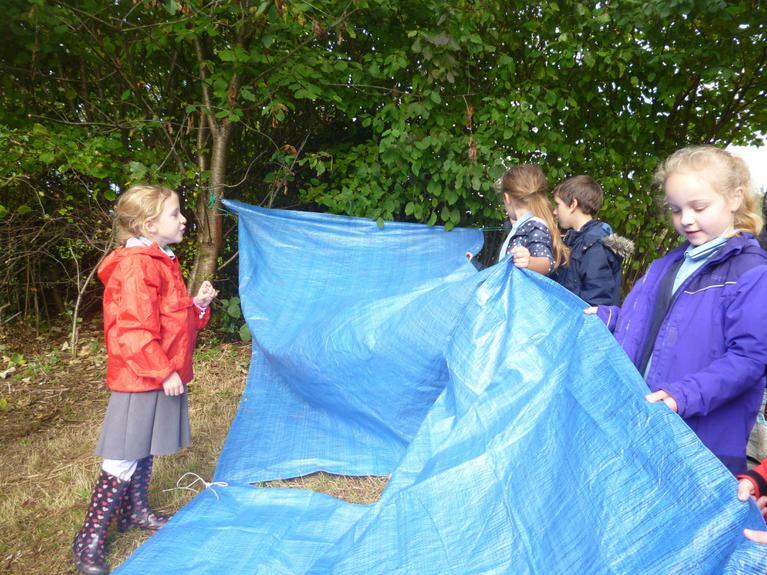 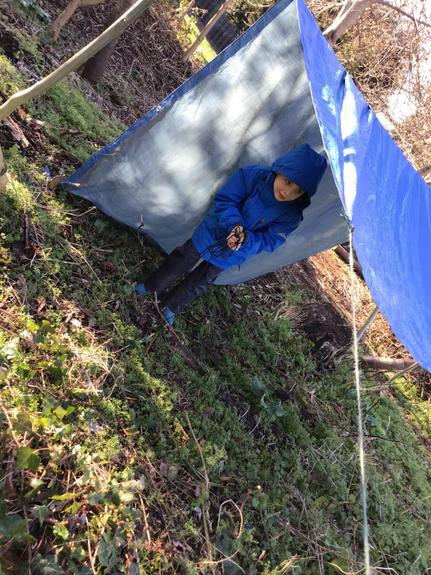 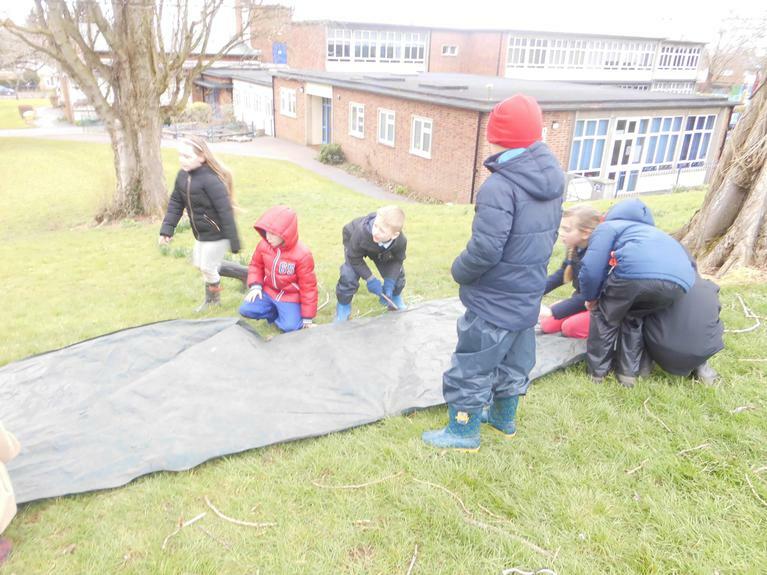 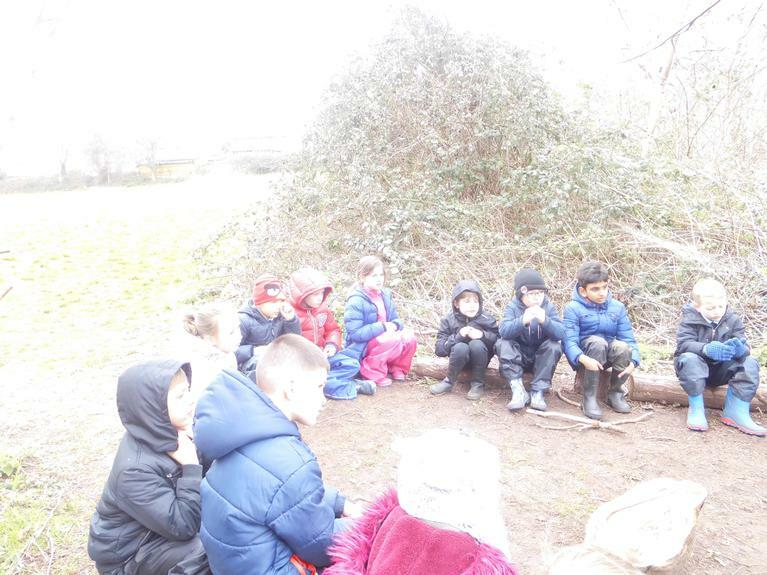 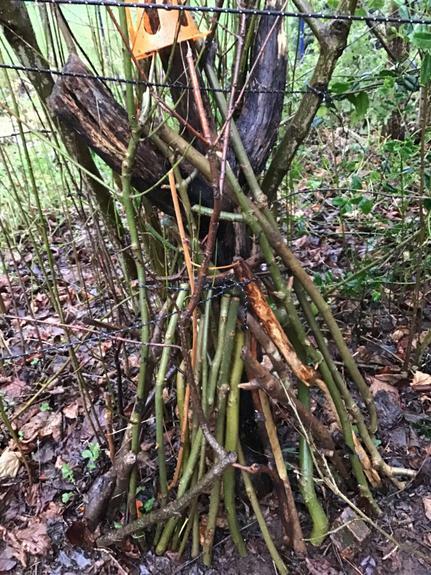 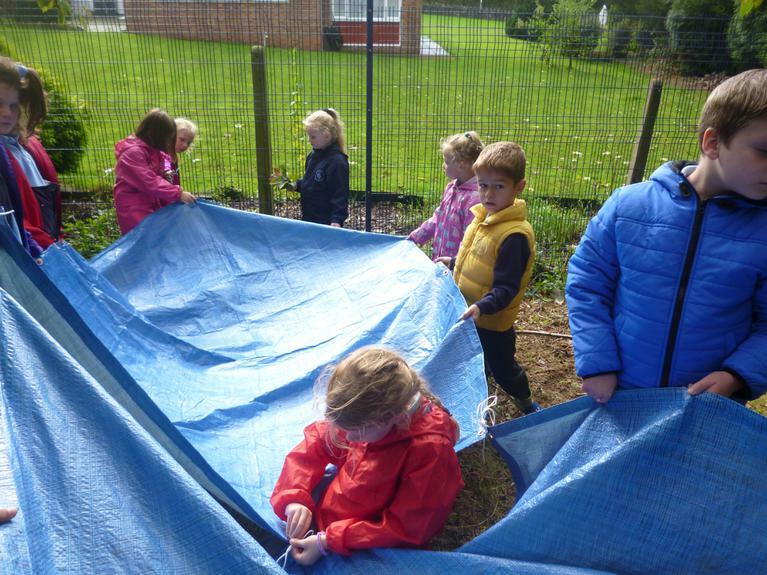 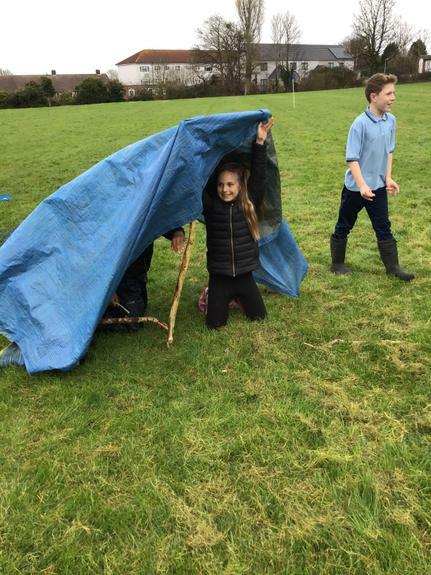 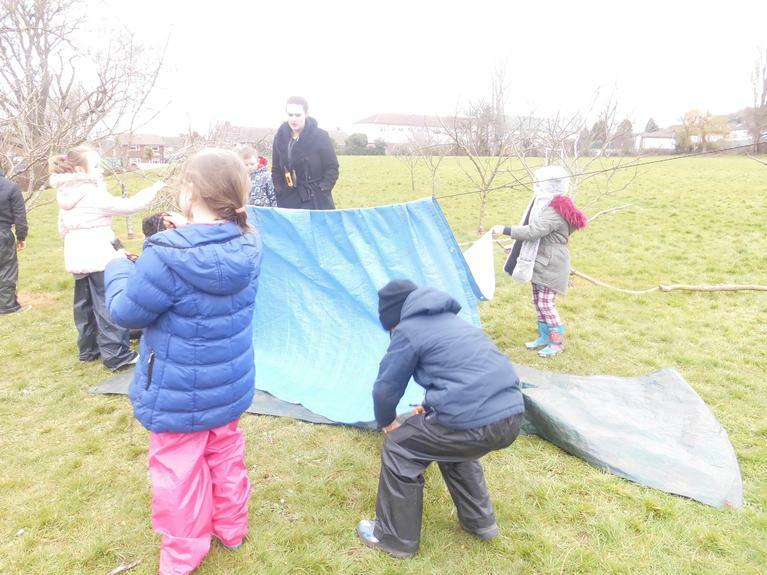 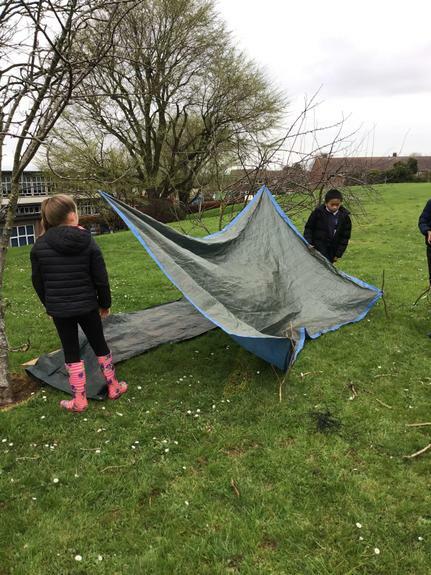 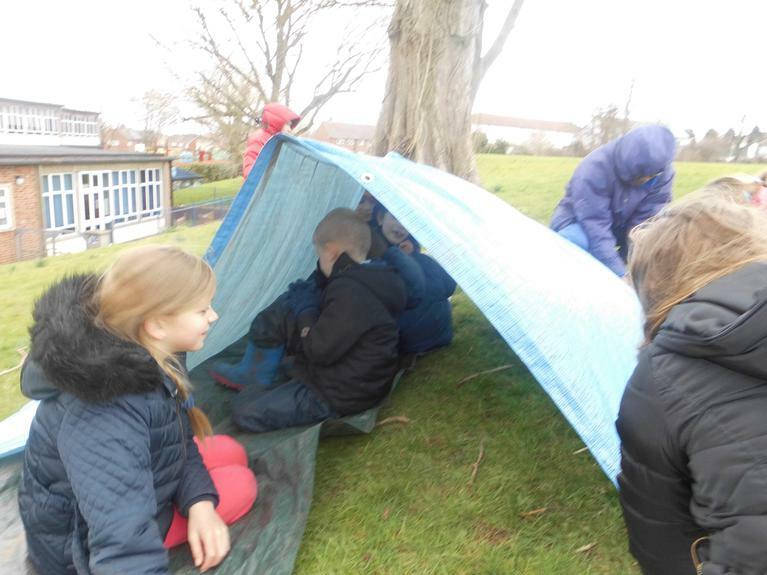 Year 2 building a shelter. 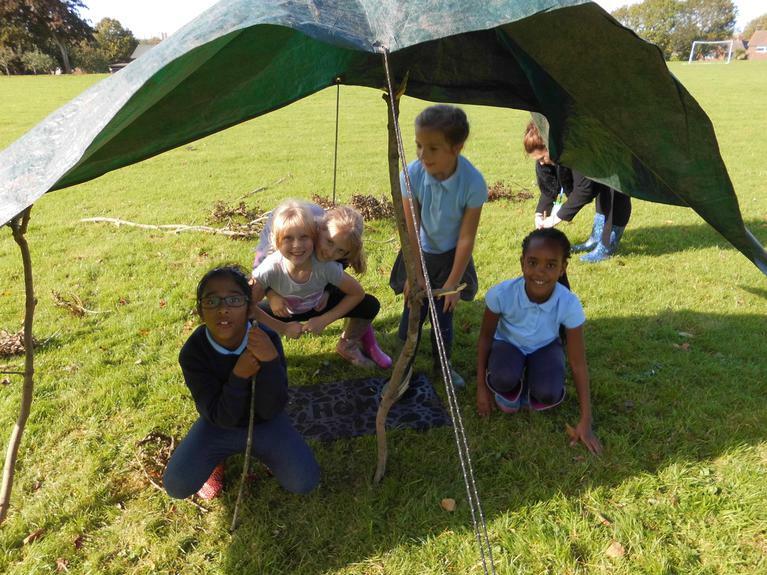 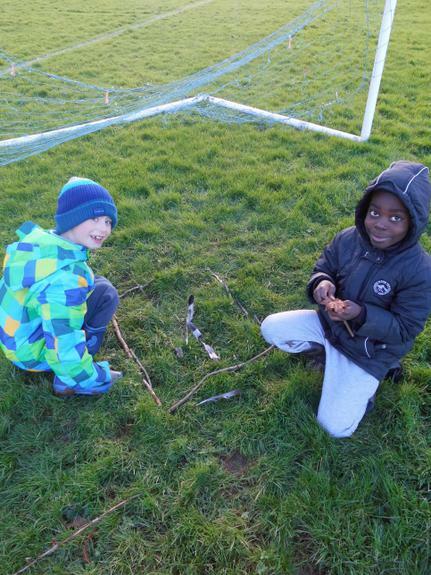 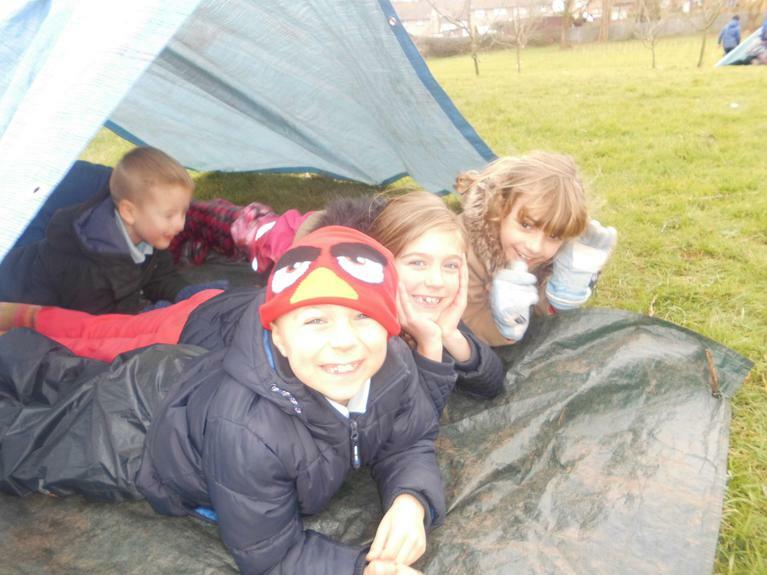 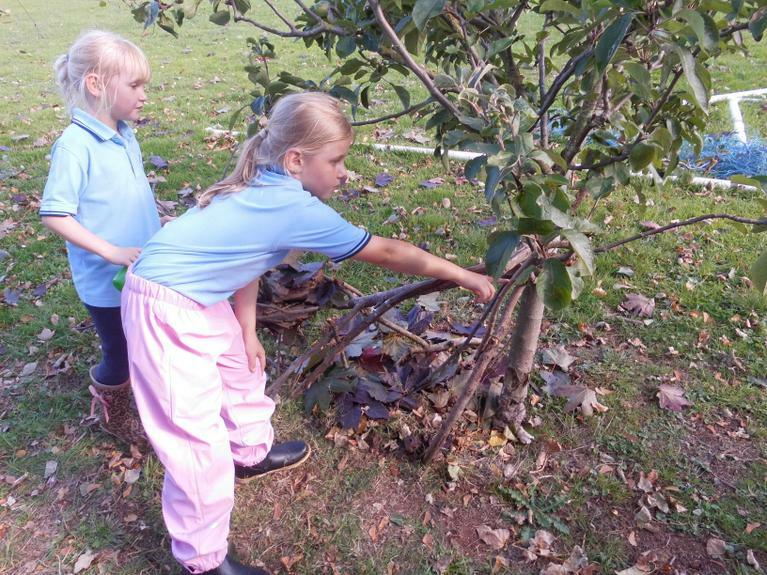 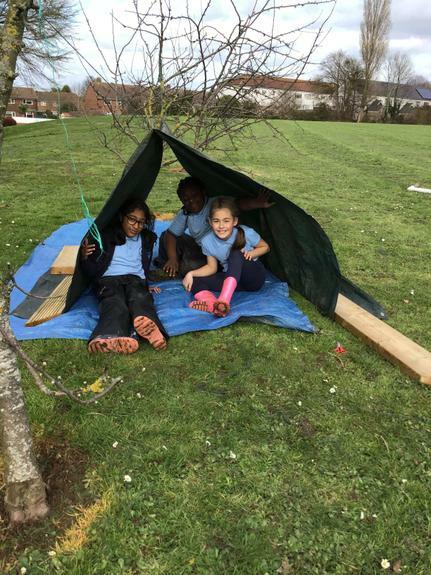 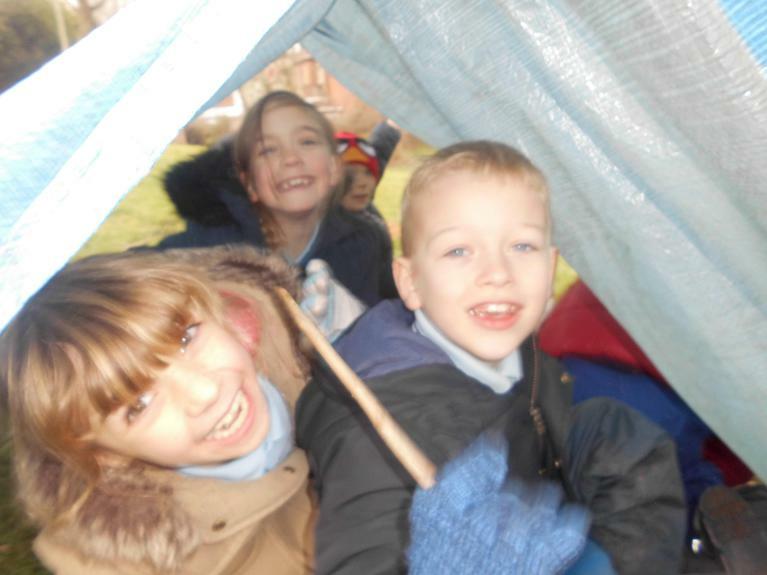 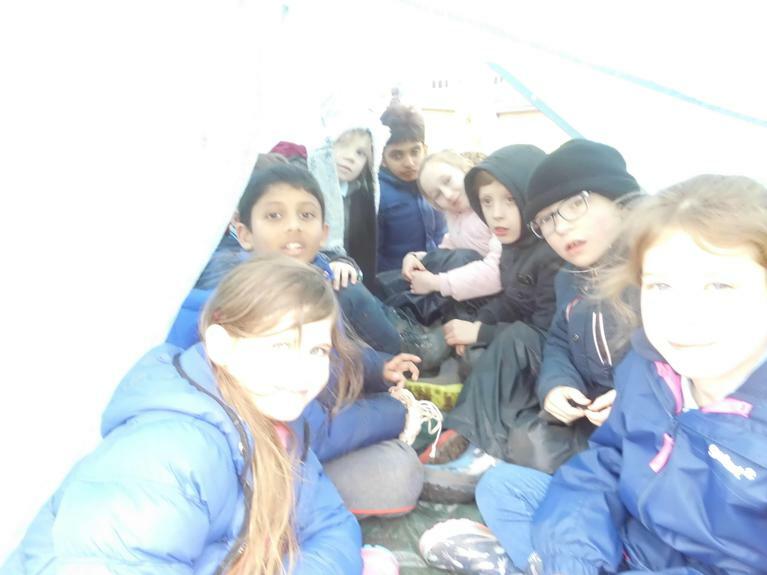 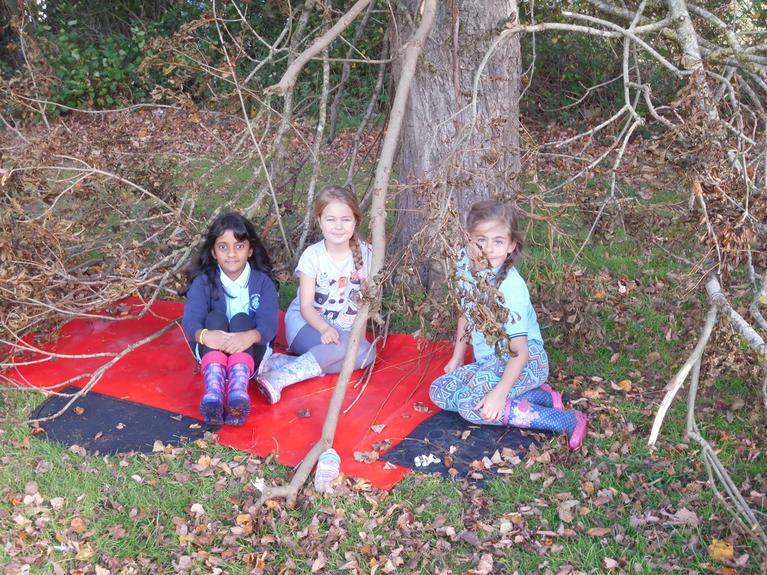 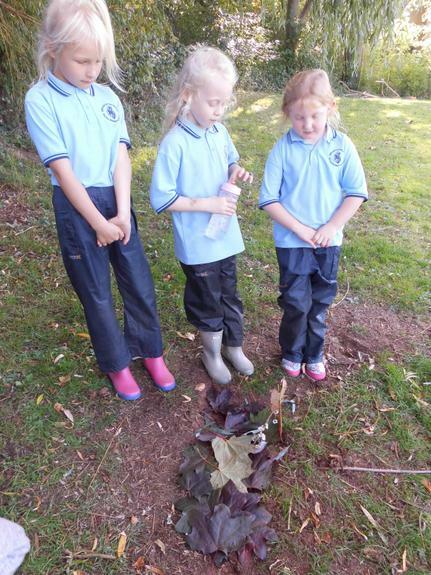 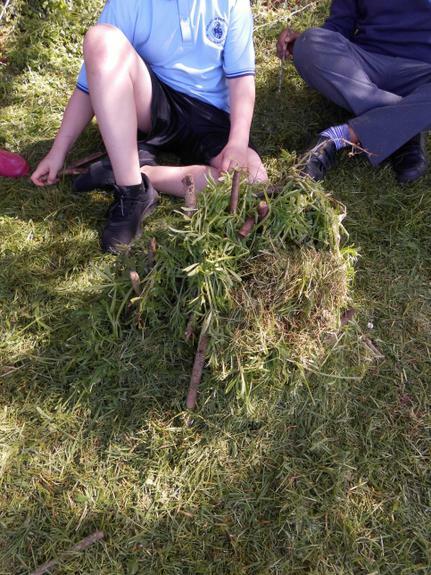 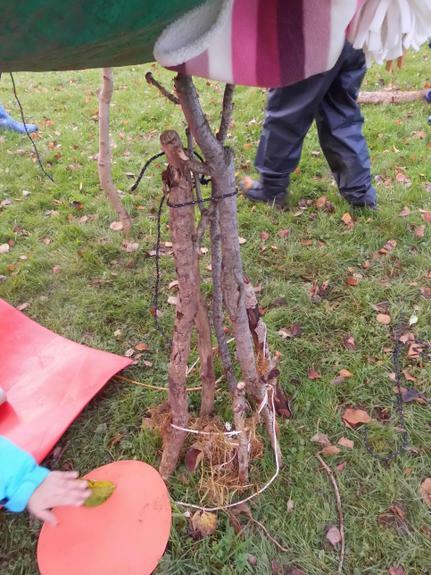 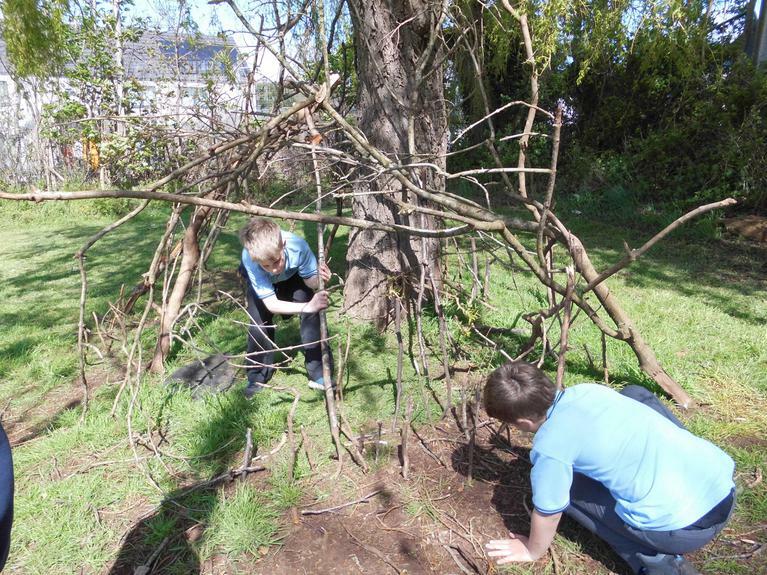 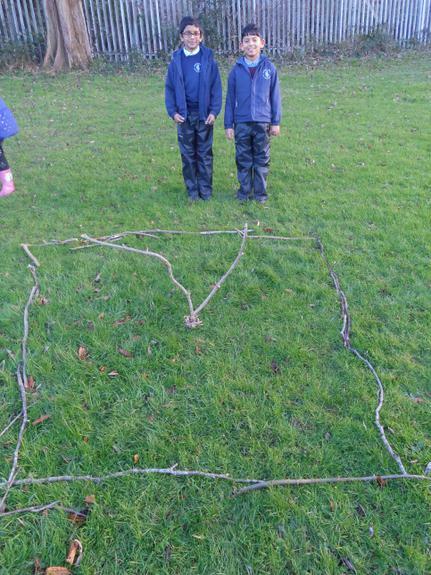 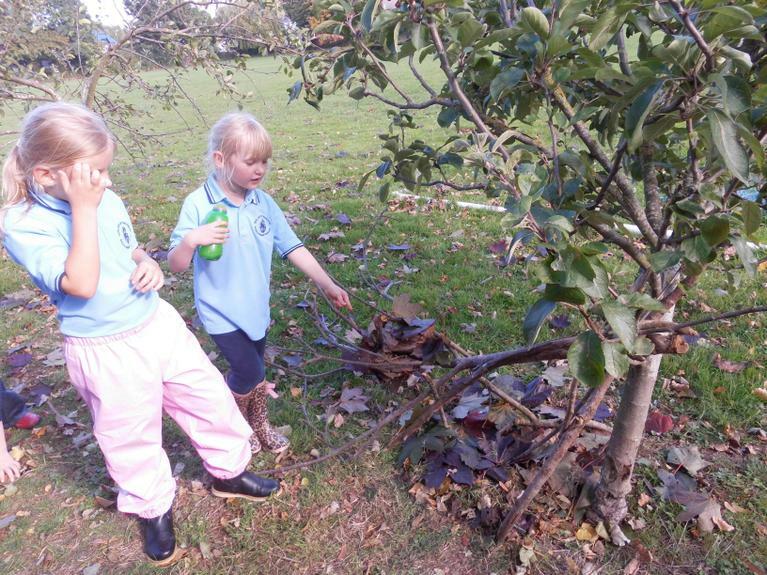 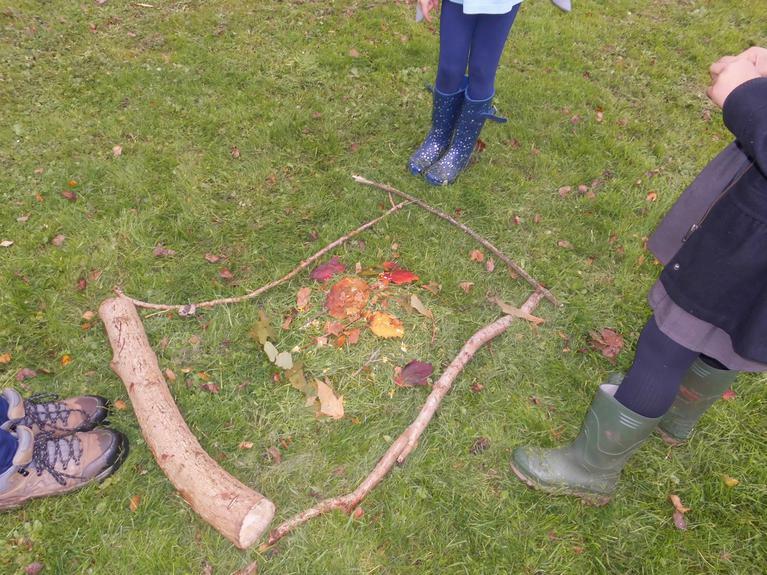 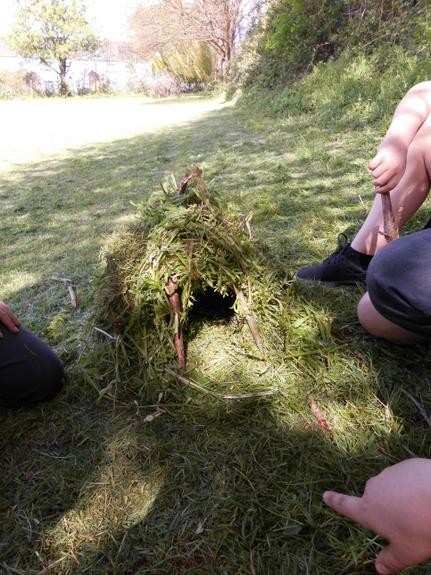 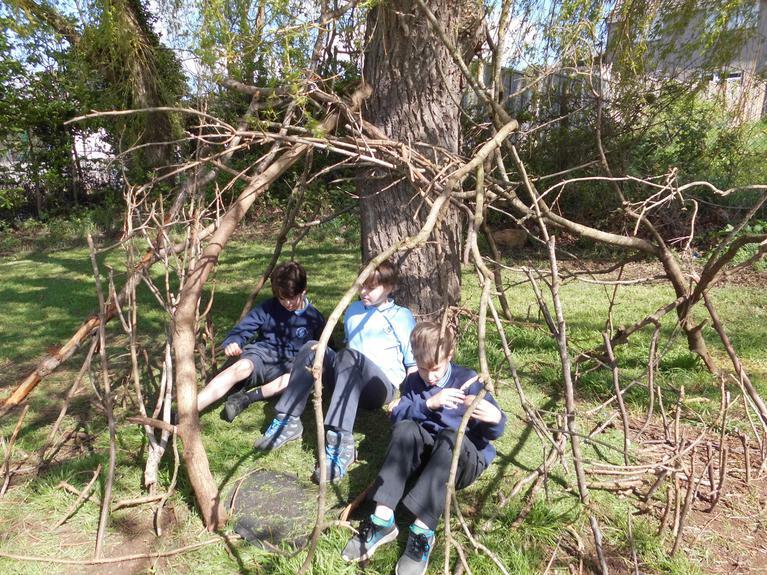 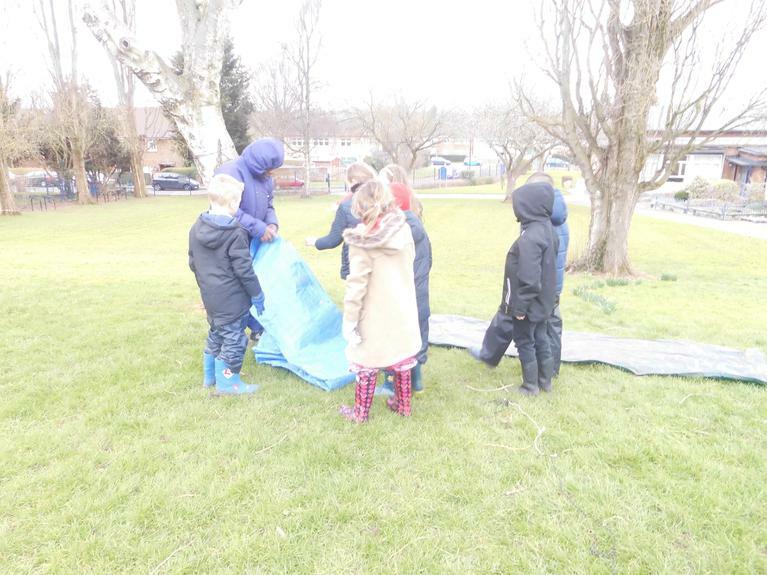 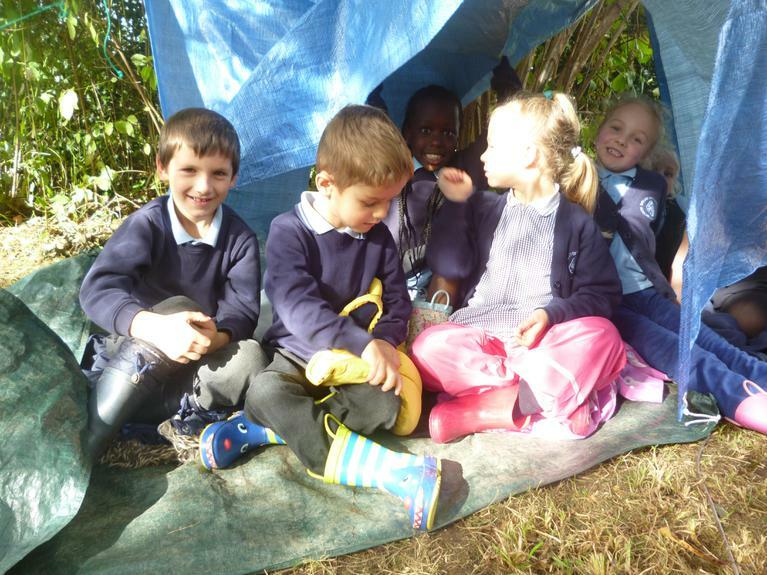 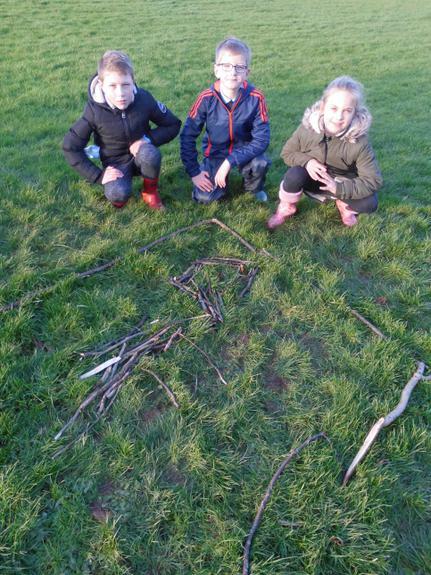 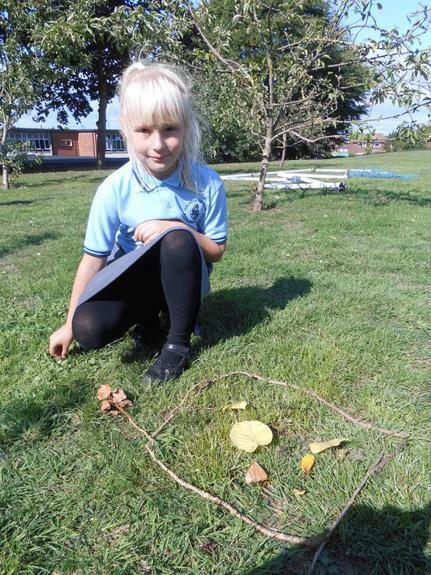 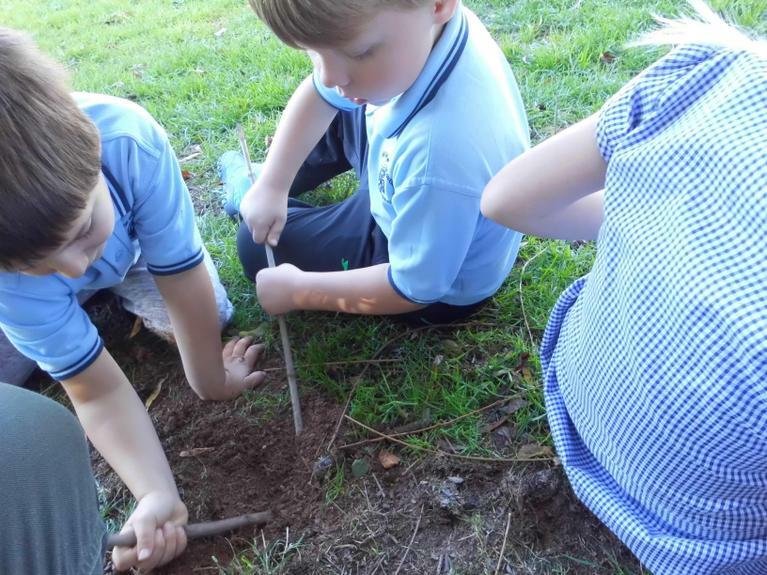 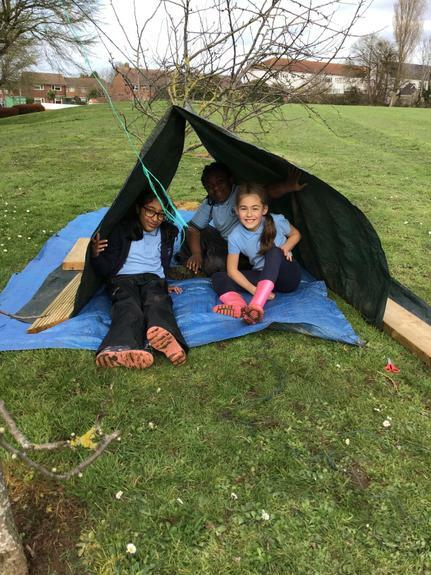 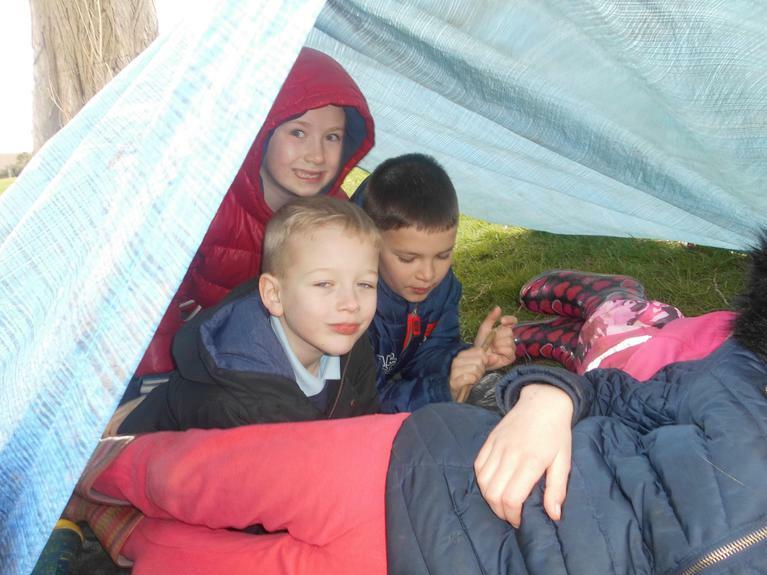 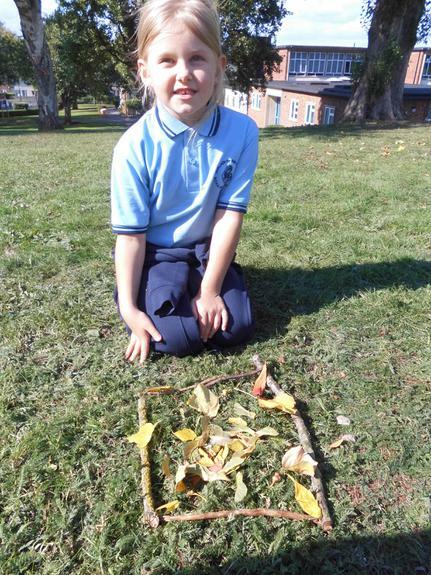 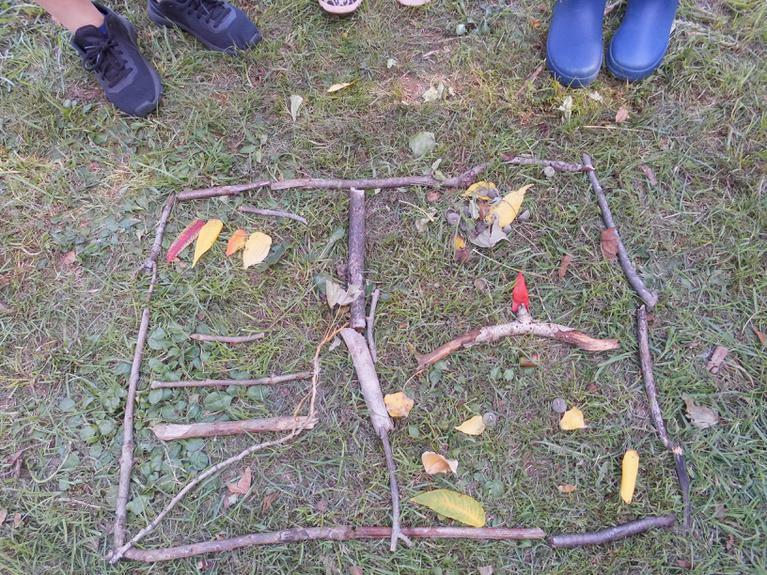 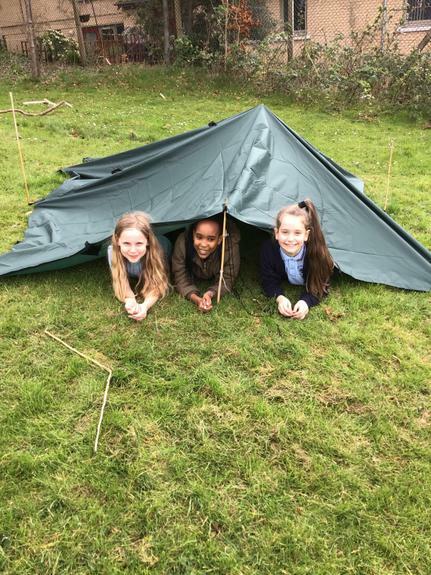 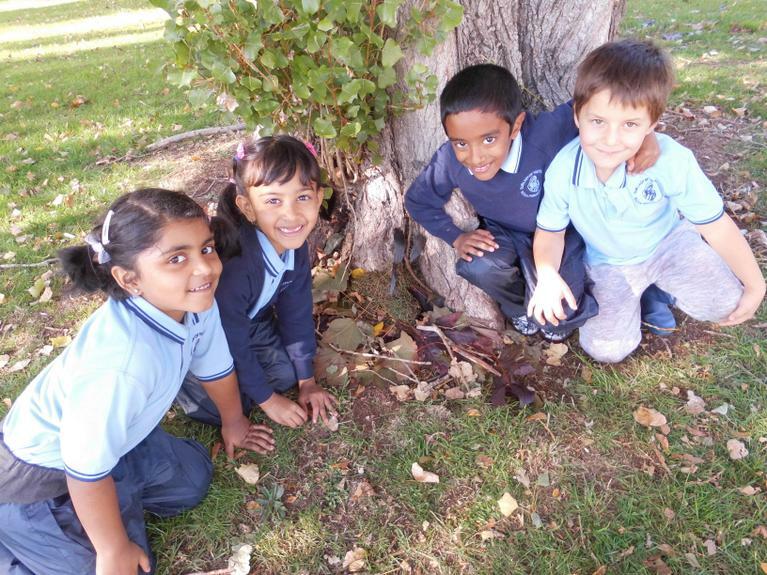 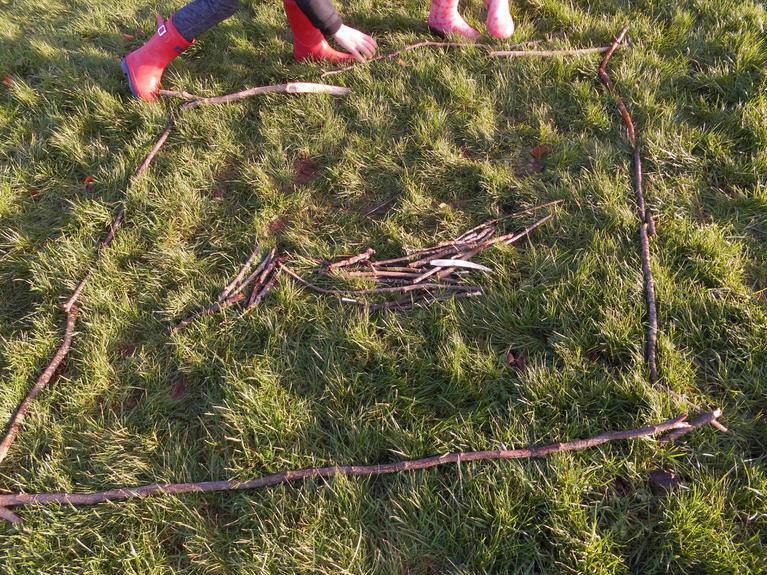 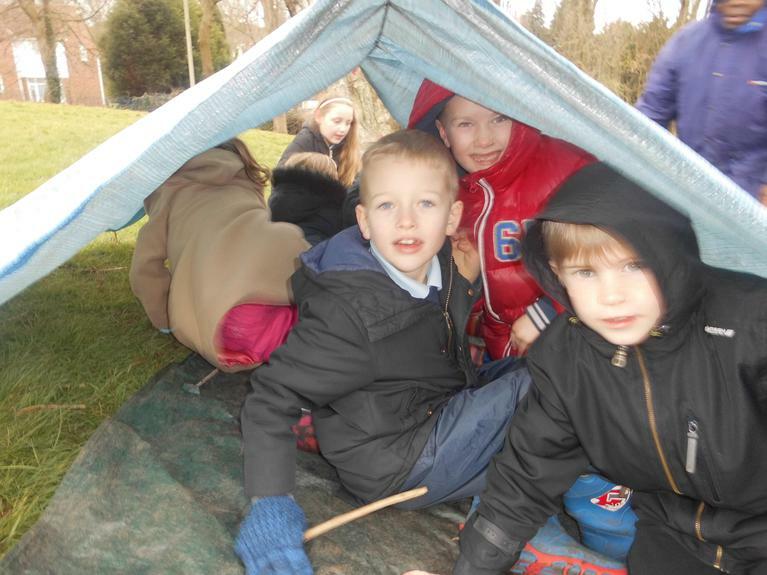 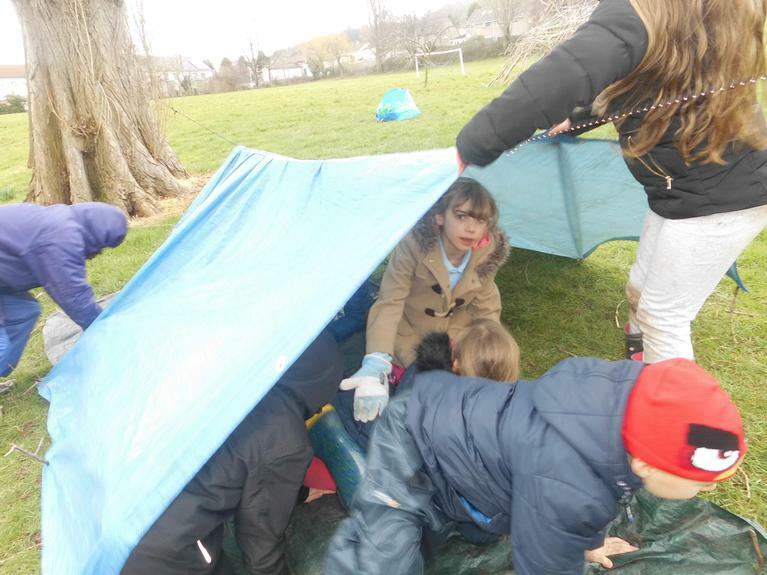 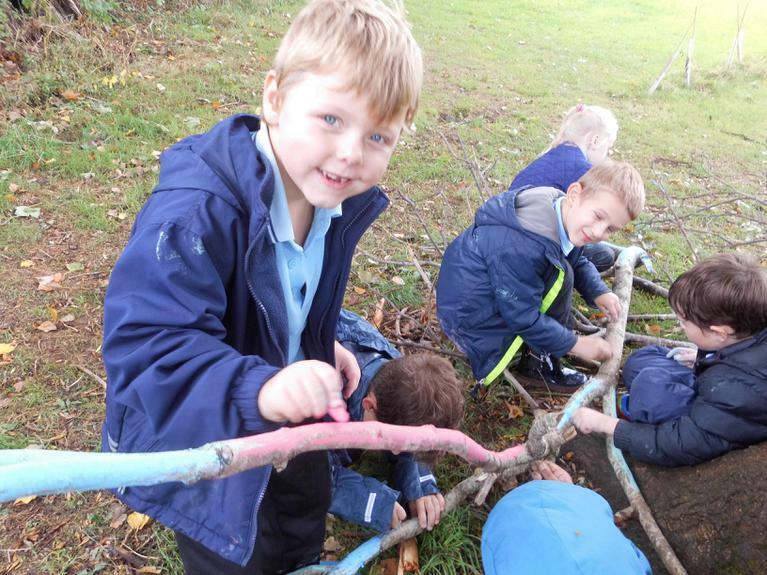 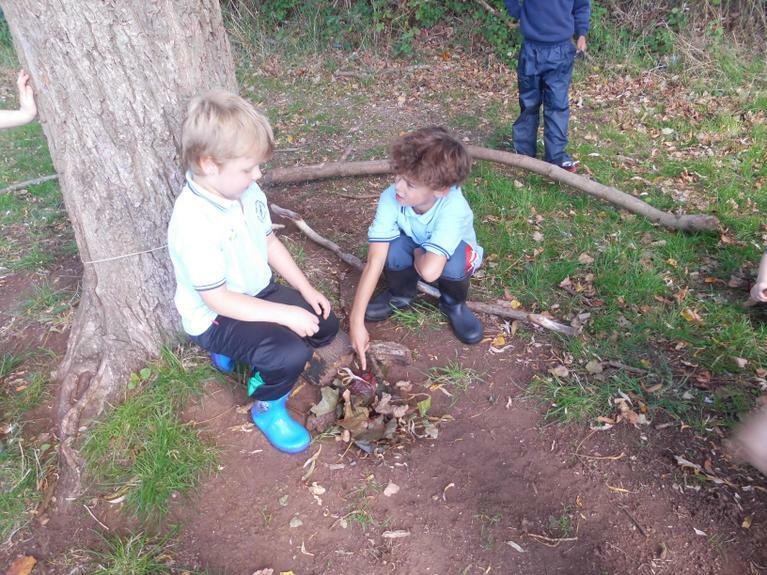 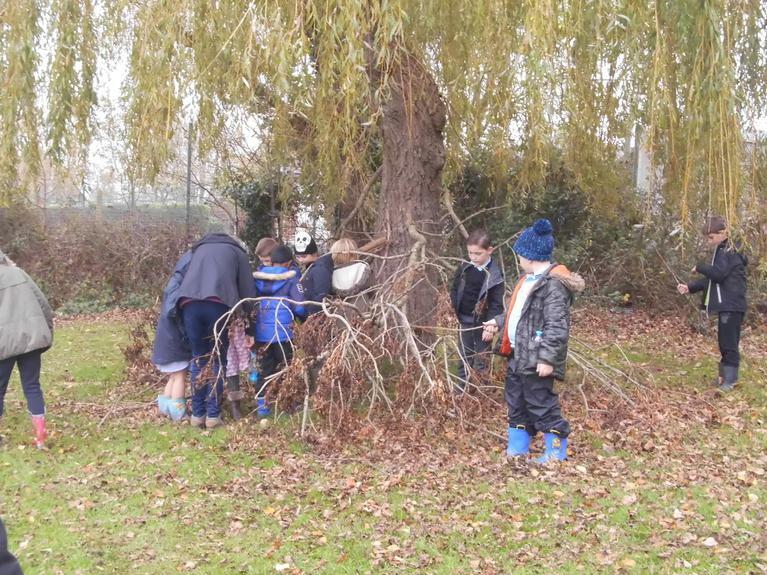 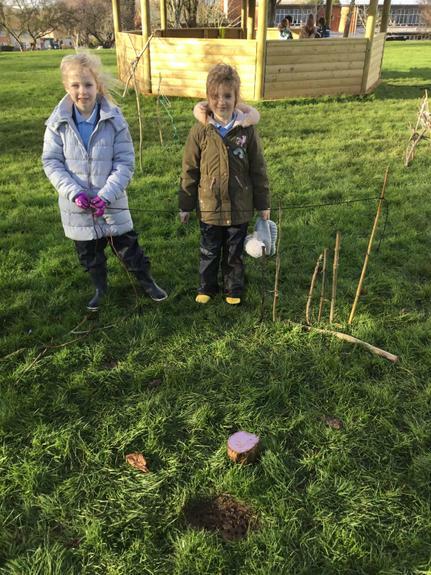 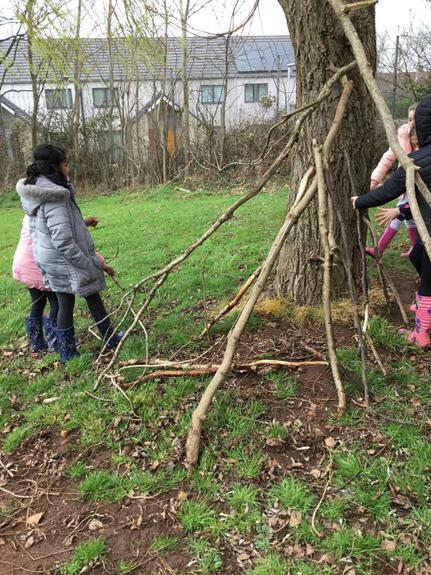 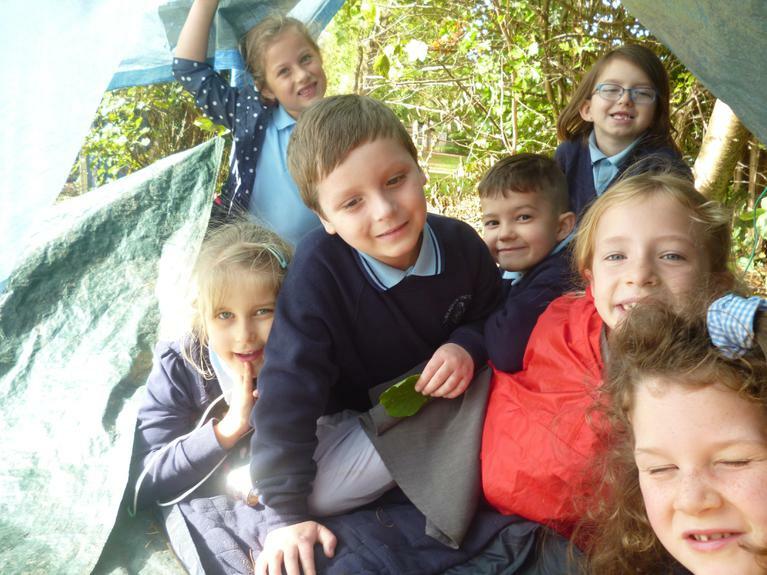 Year 2 worked together to make a shelter. 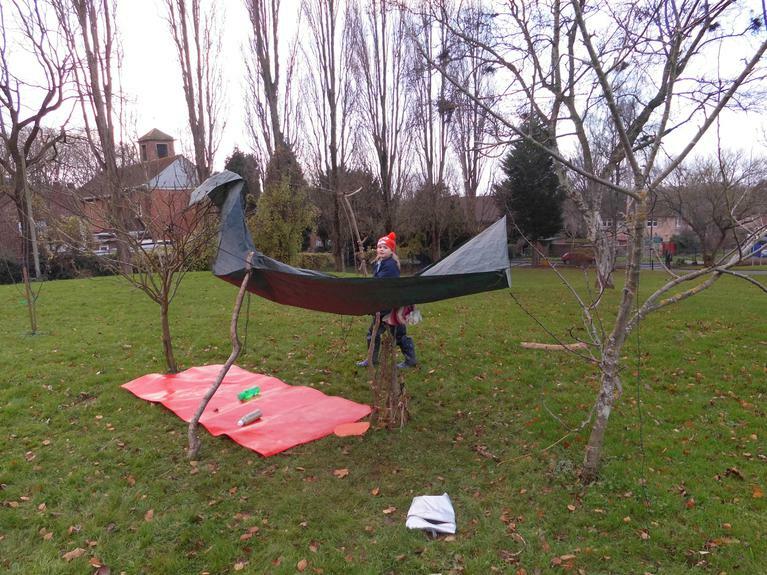 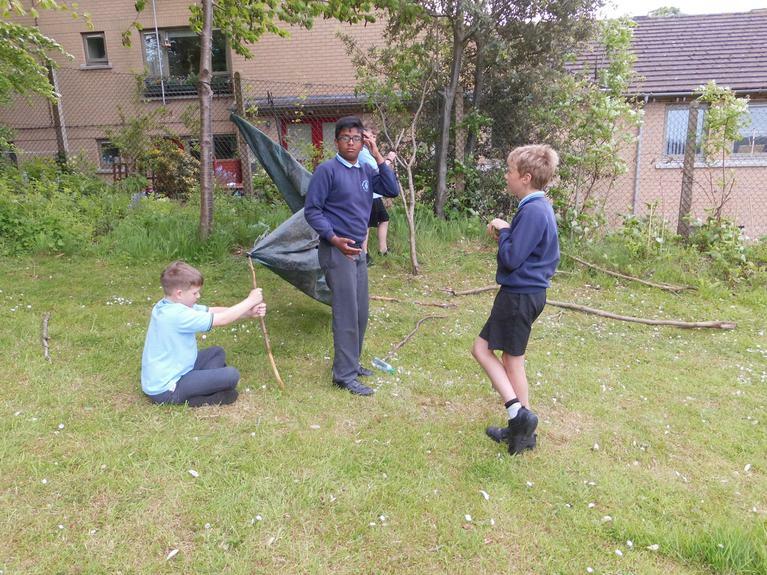 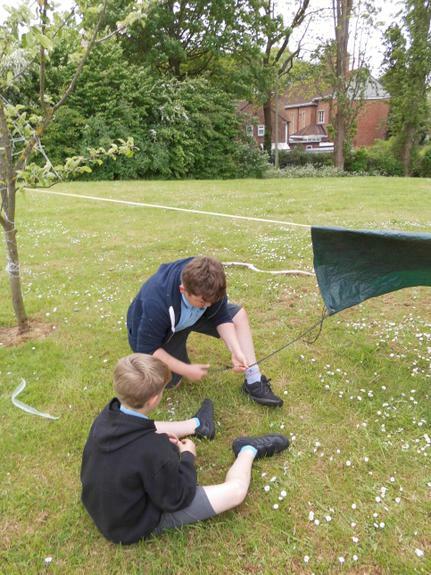 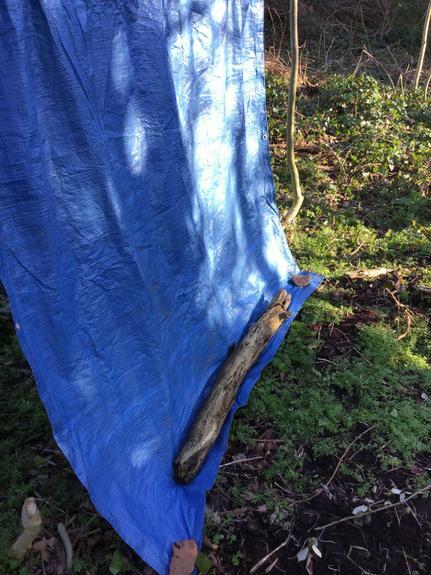 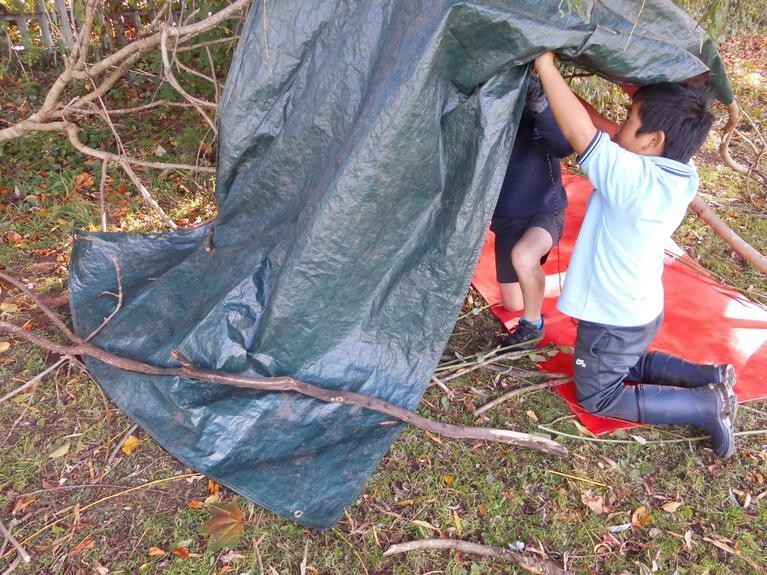 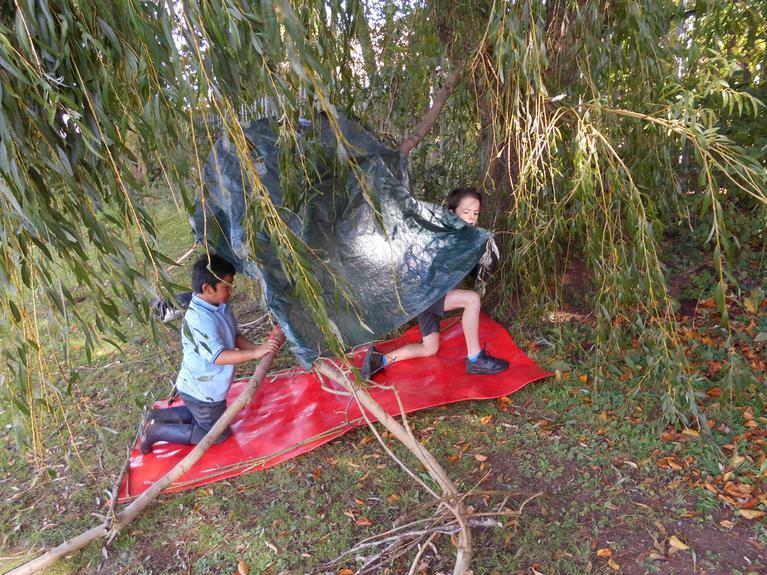 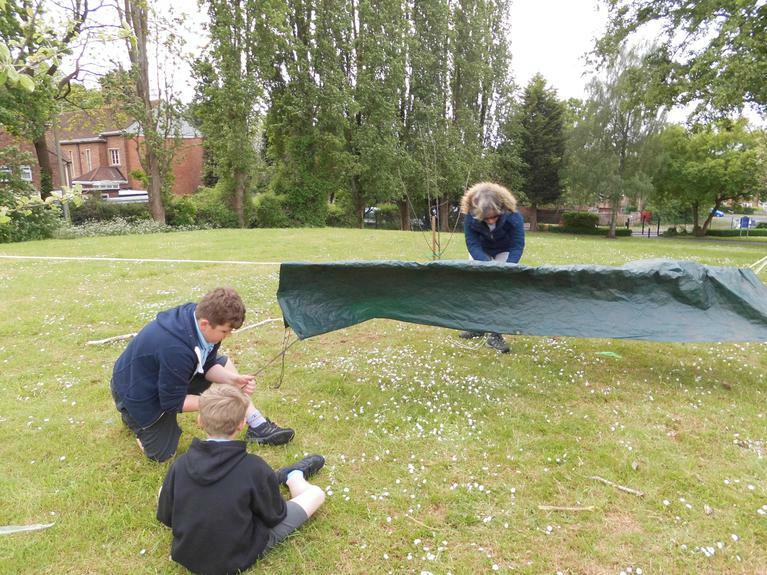 They used tarpaulin, string and sticks to make a shelter that everyone could share.